Index and details are here. 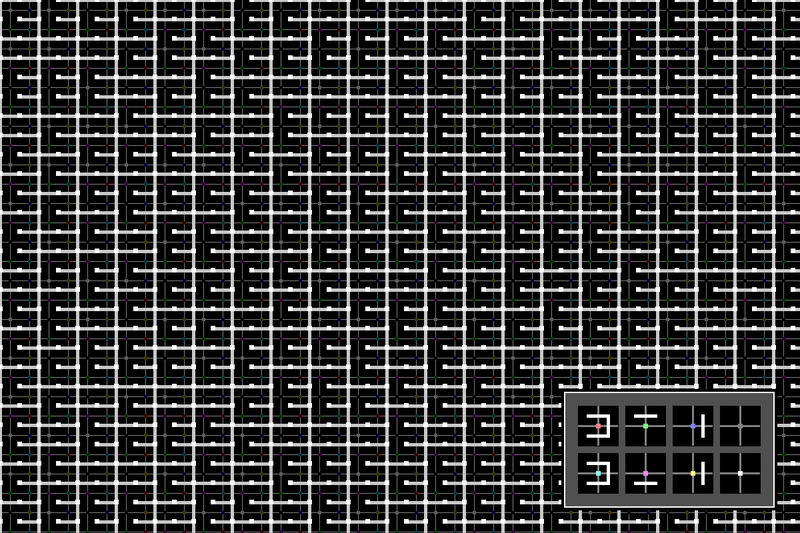 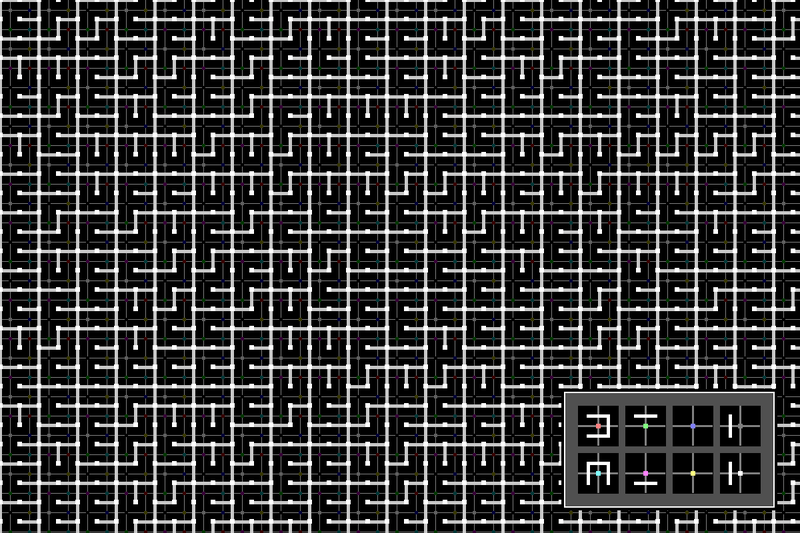 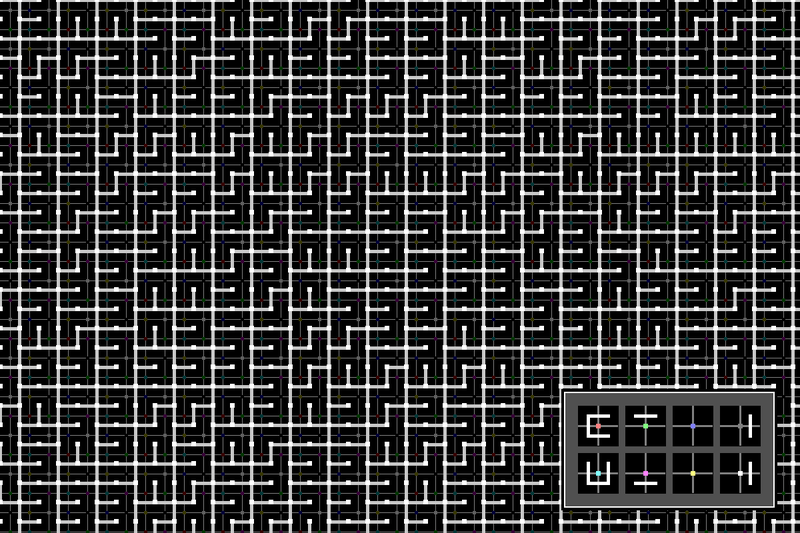 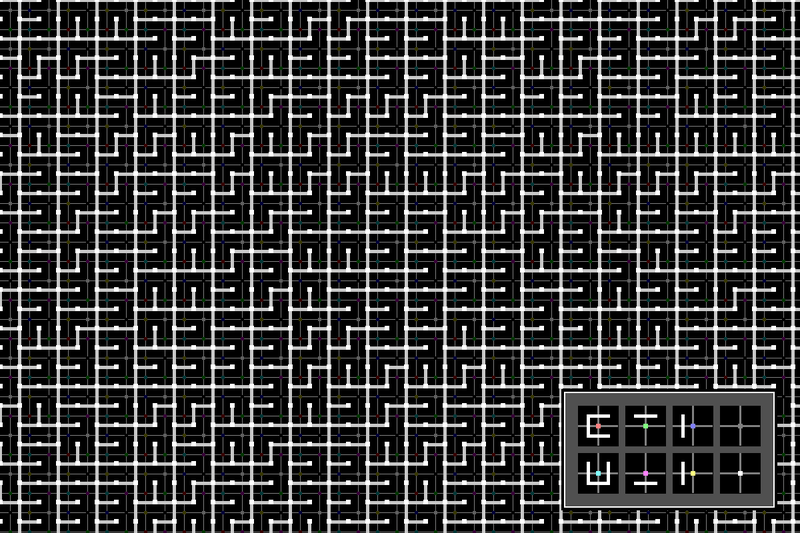 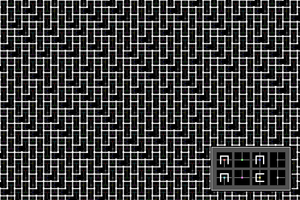 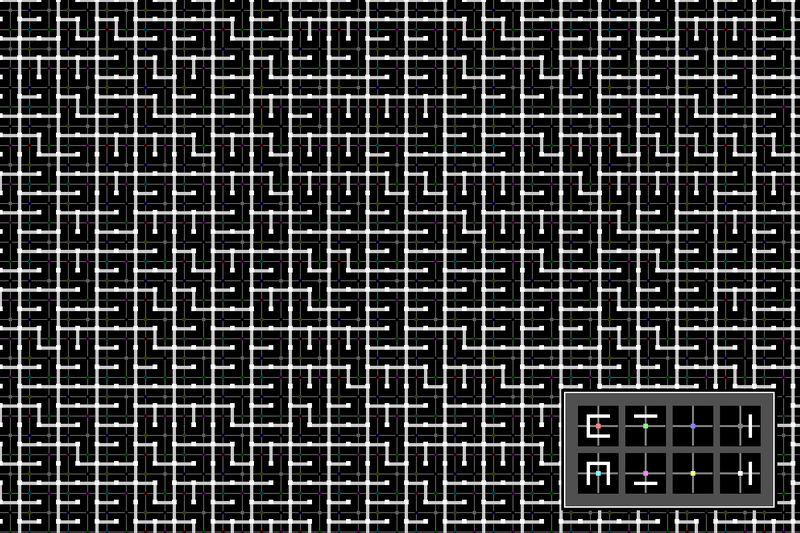 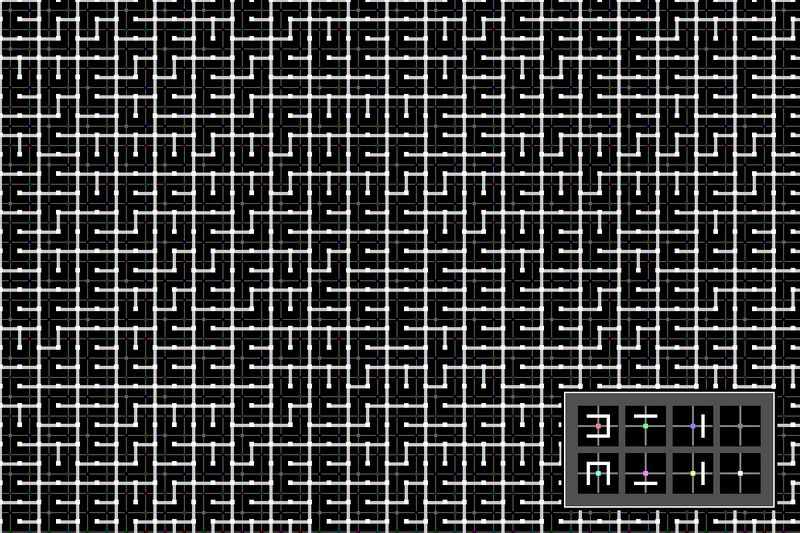 There are many duplicates because the software that generated the data only eliminated duplicates and symmetries from the constraint rules, not from the final tile sets. 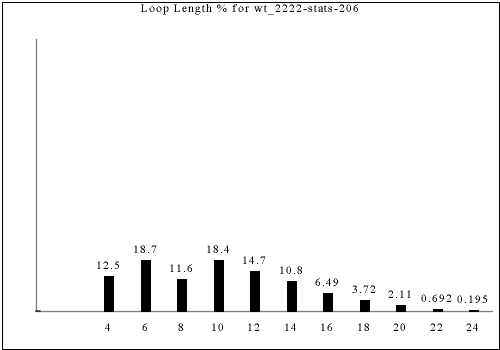 The duplicates are included in the catalog in case I made any mistakes while hand-classifying them. 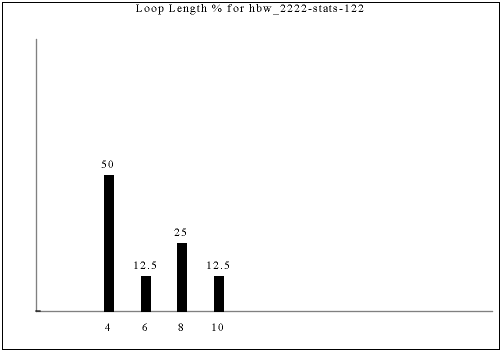 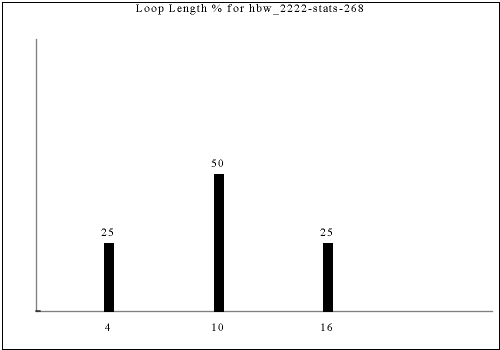 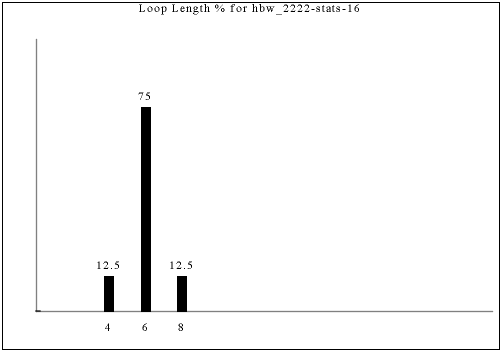 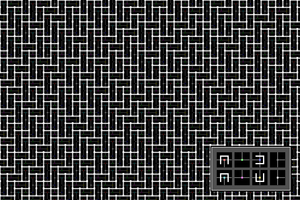 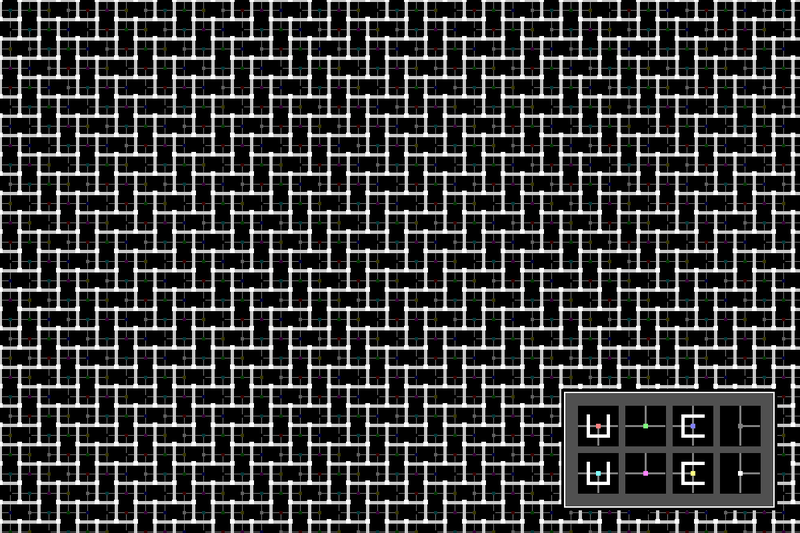 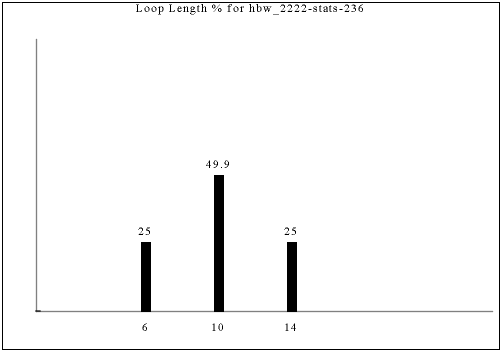 A brick pattern in the connectivity loops can be achieved with both Wang tiles (wt-2222) and with herringbone Wang tiles (hbw-2222). 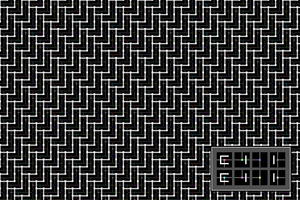 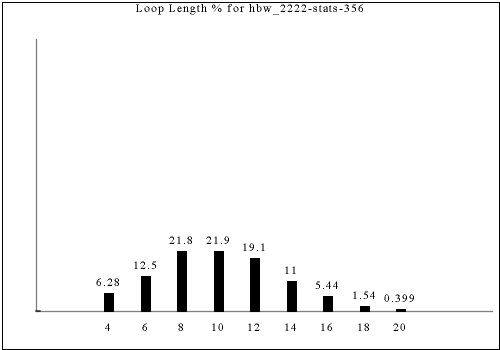 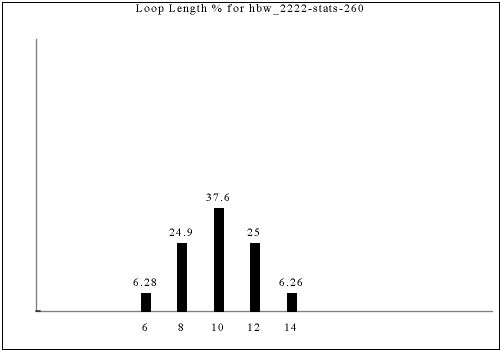 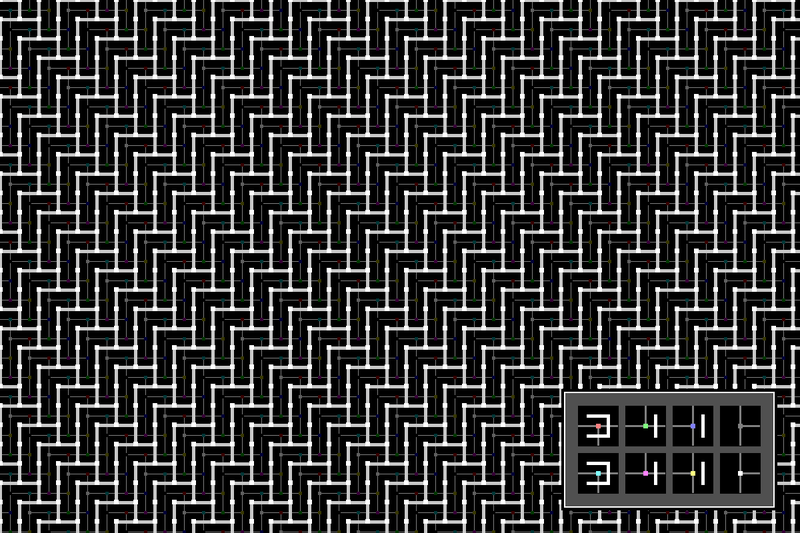 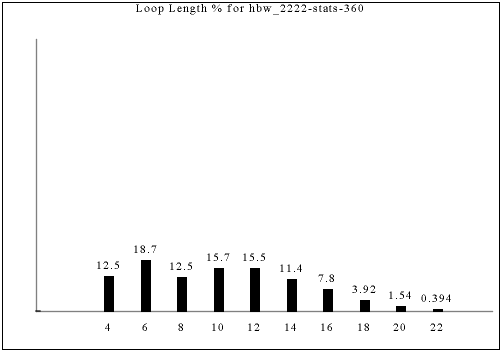 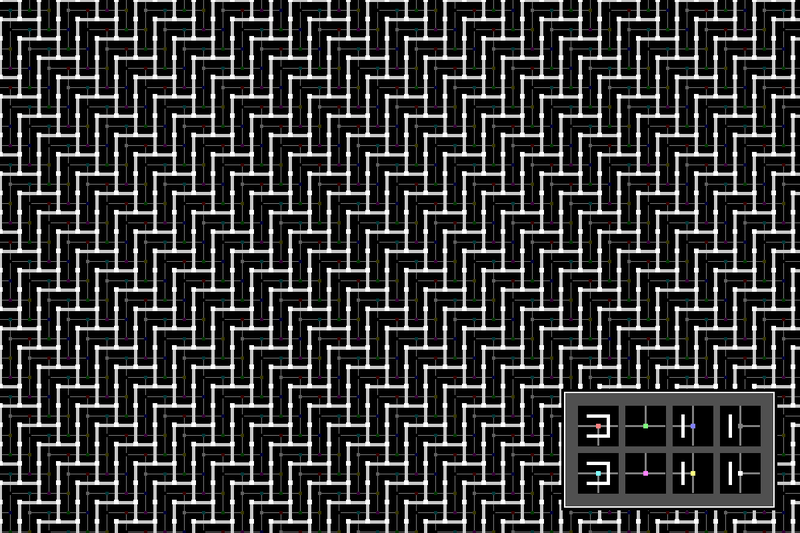 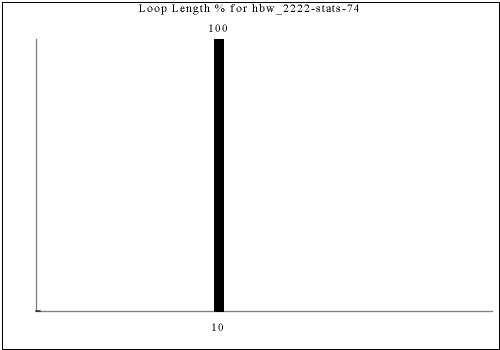 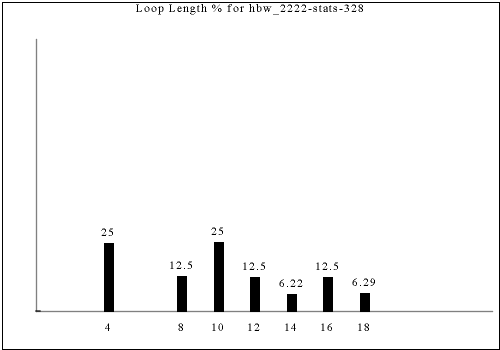 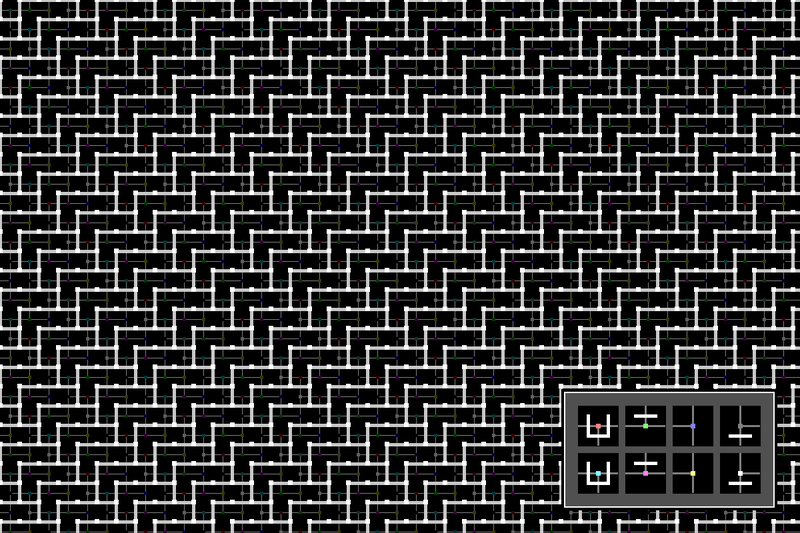 A herringbone pattern in the connectivity loops can only be achieved using herringbone Wang tiles (hbw-2222). 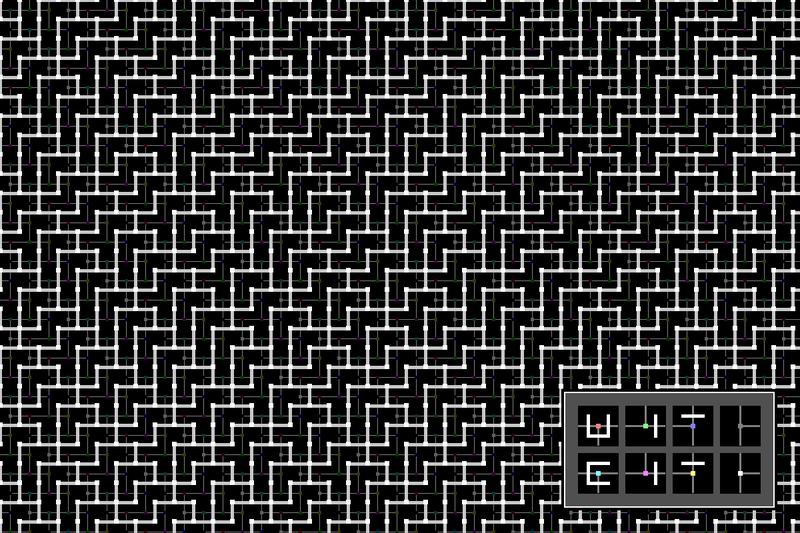 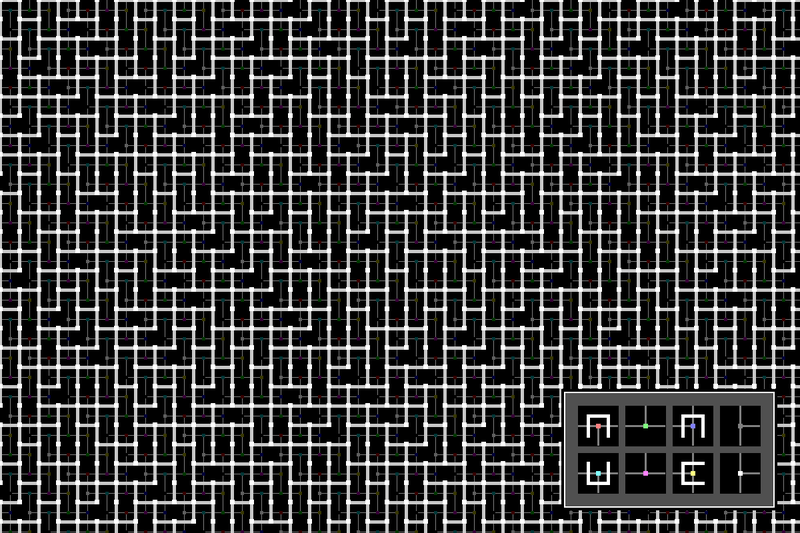 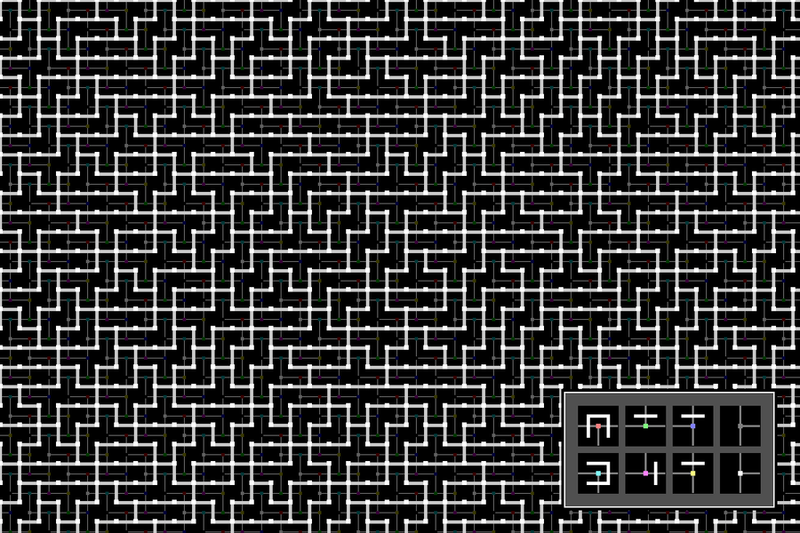 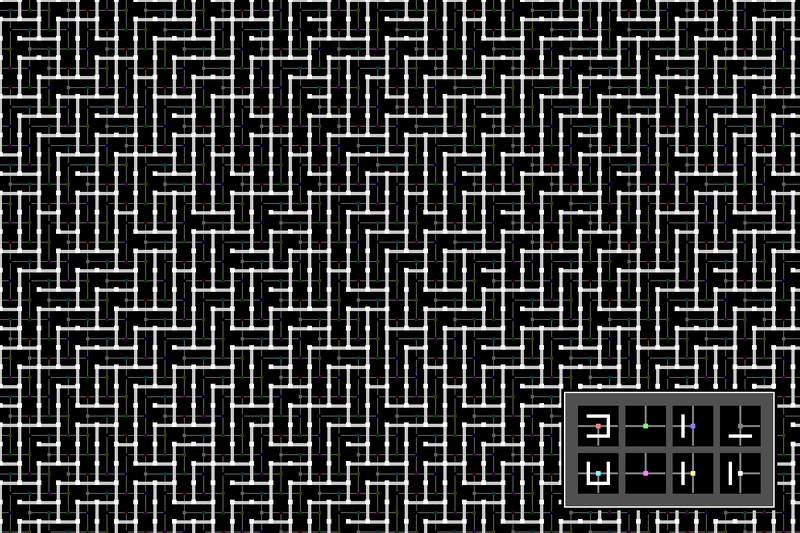 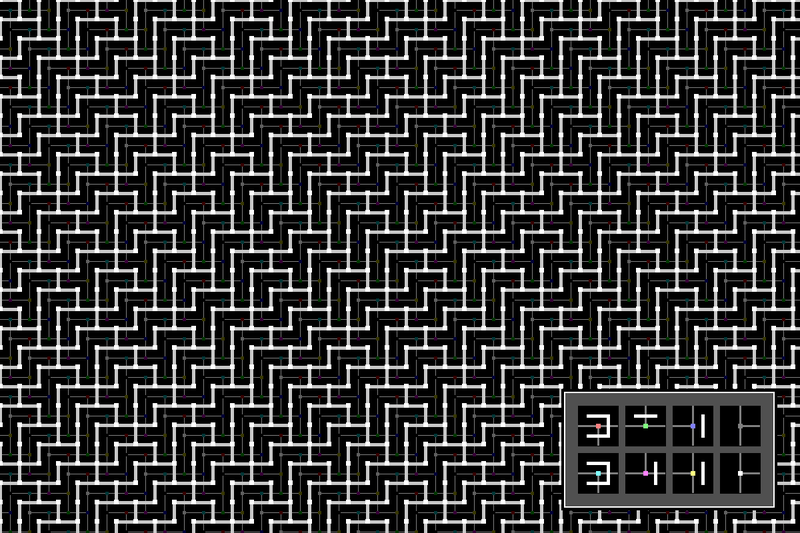 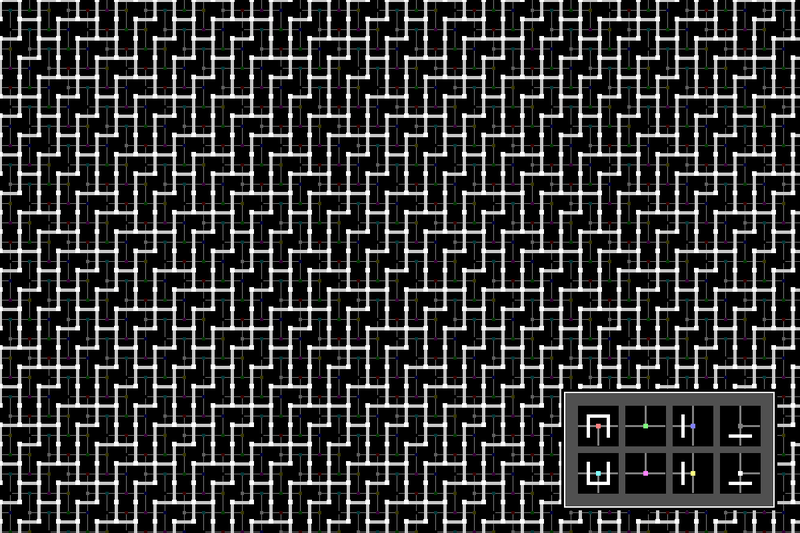 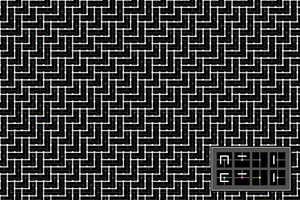 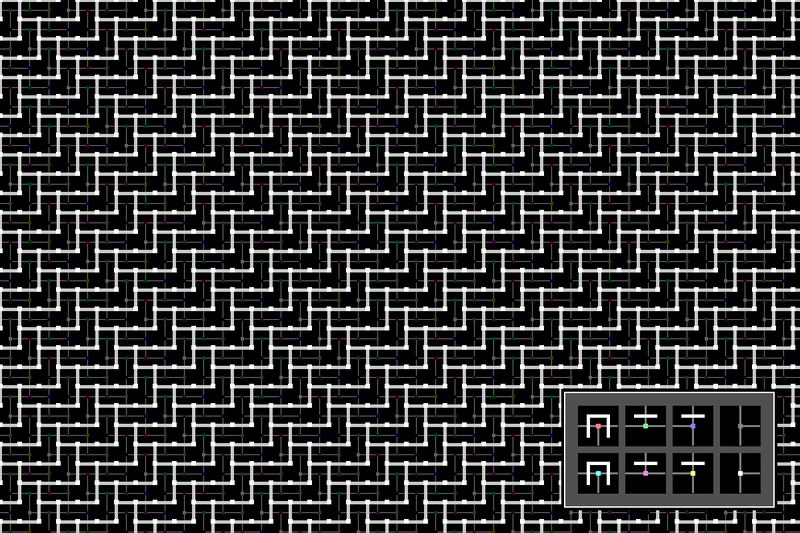 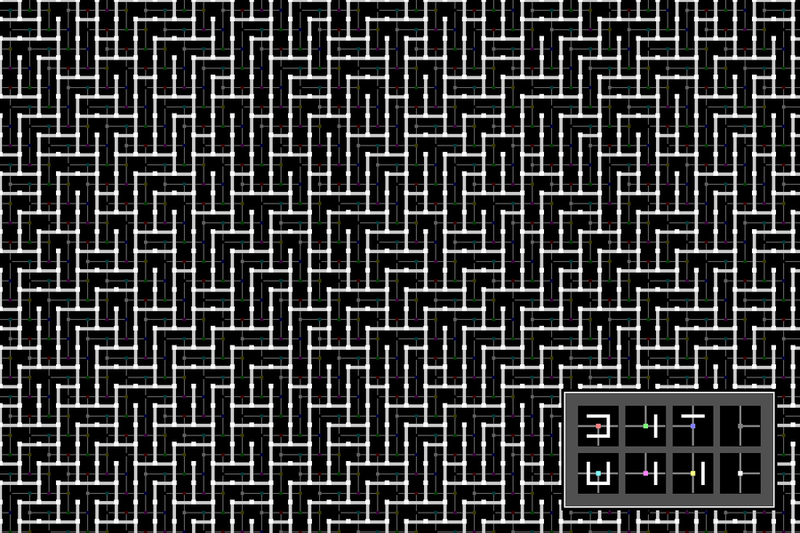 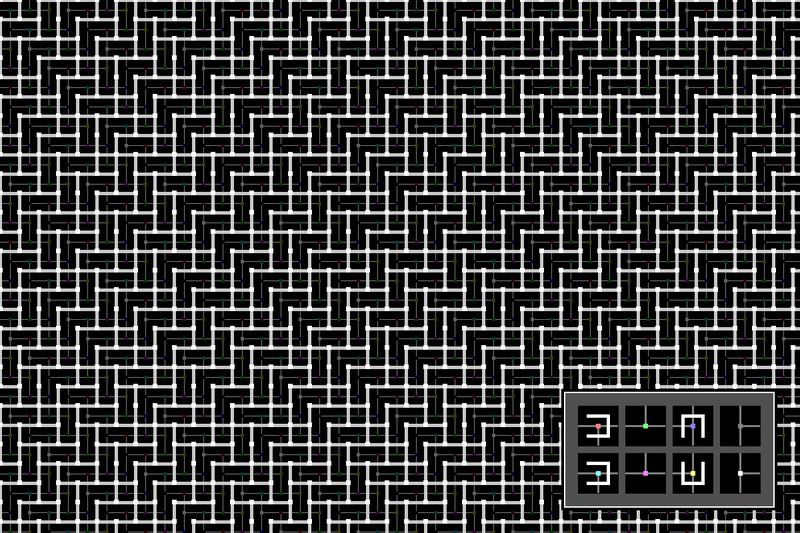 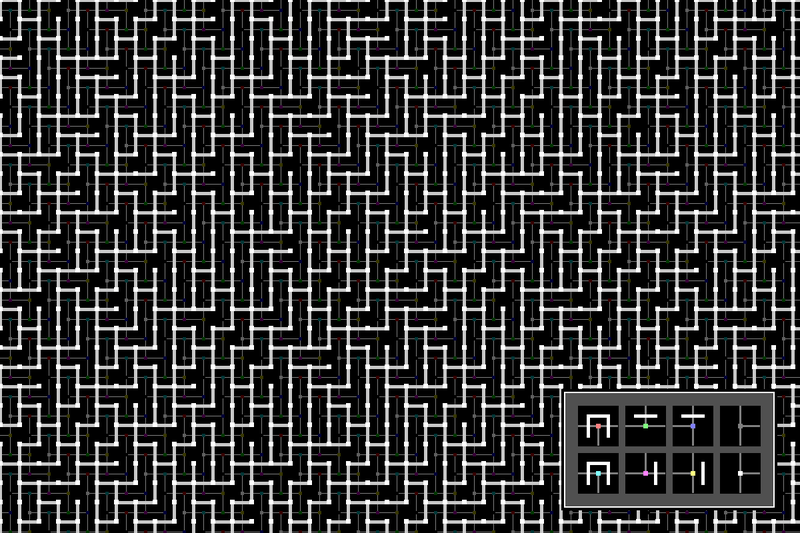 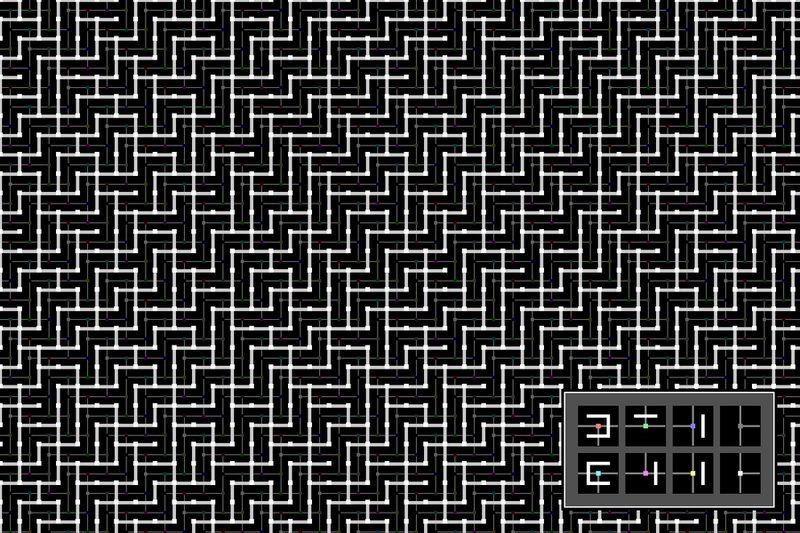 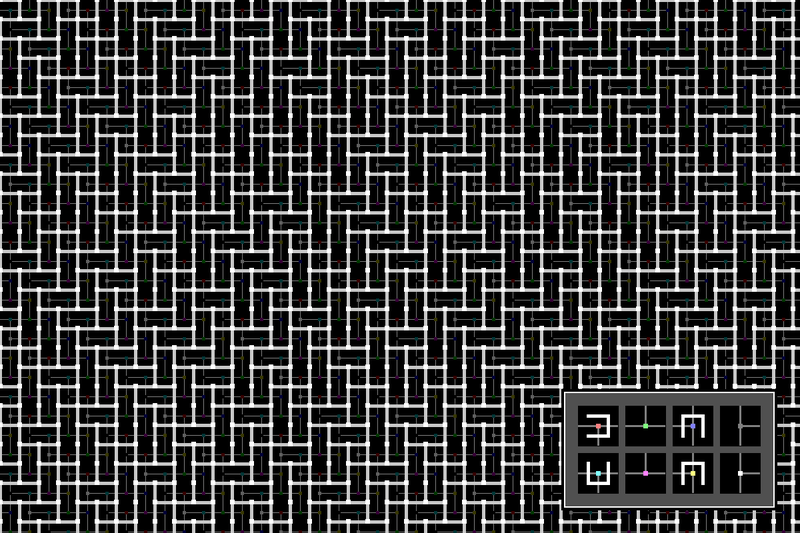 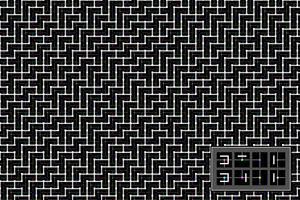 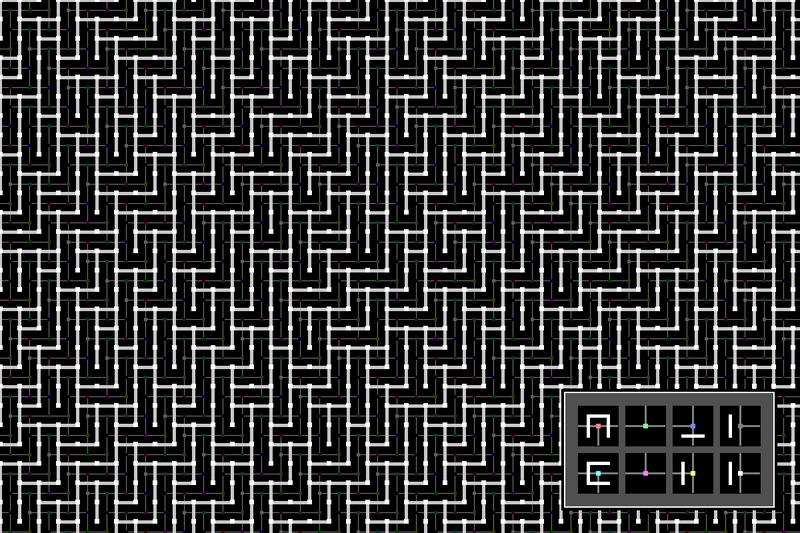 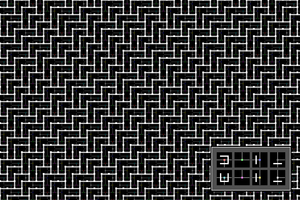 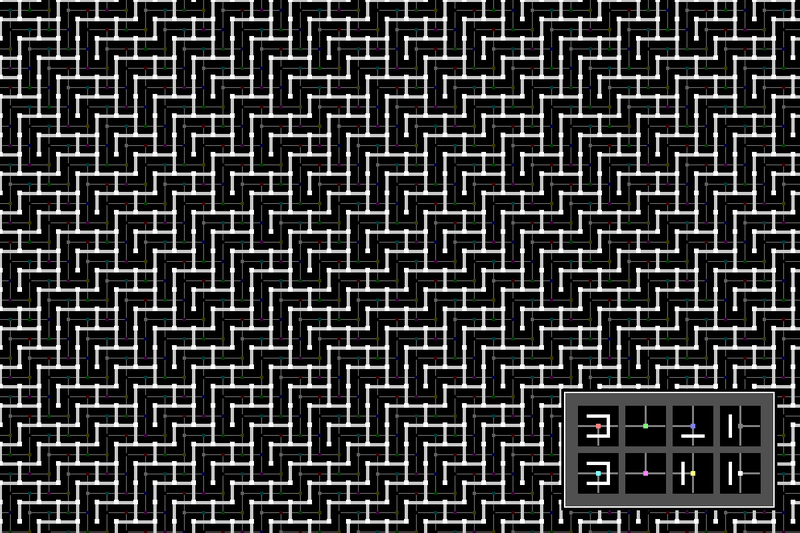 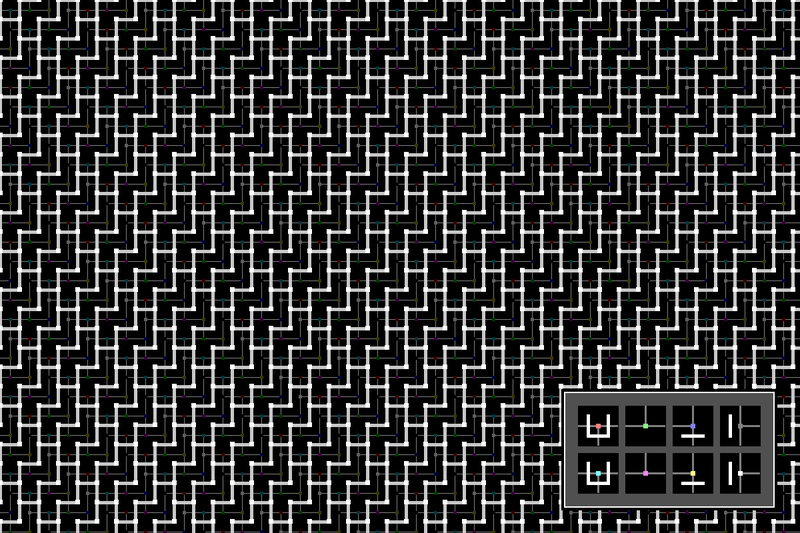 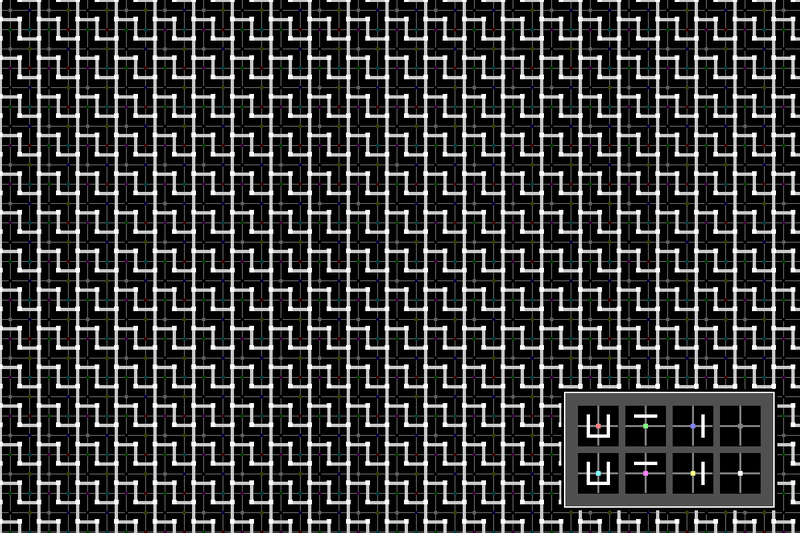 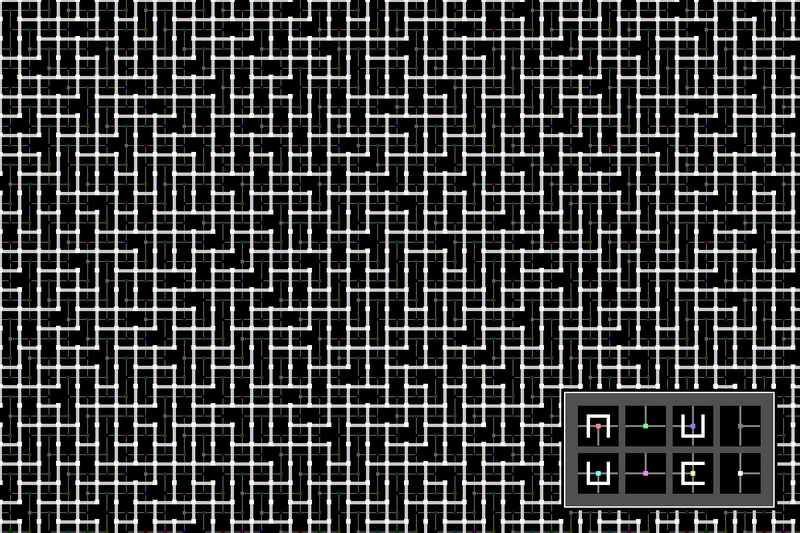 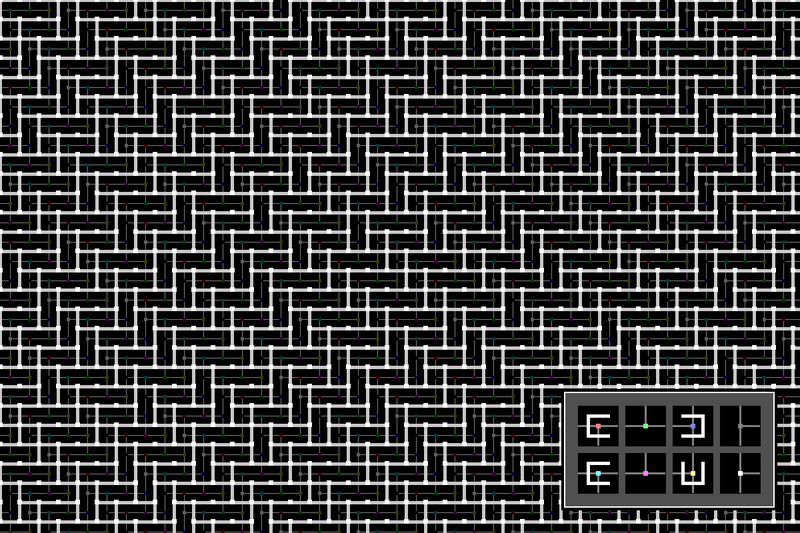 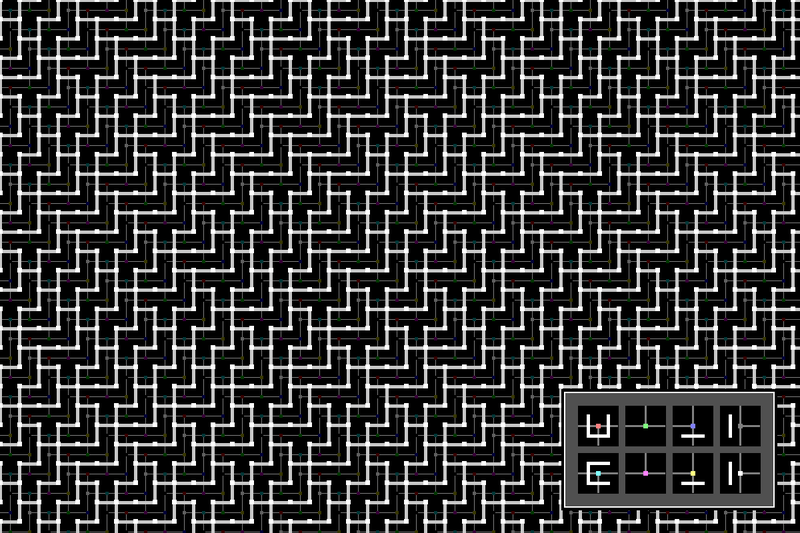 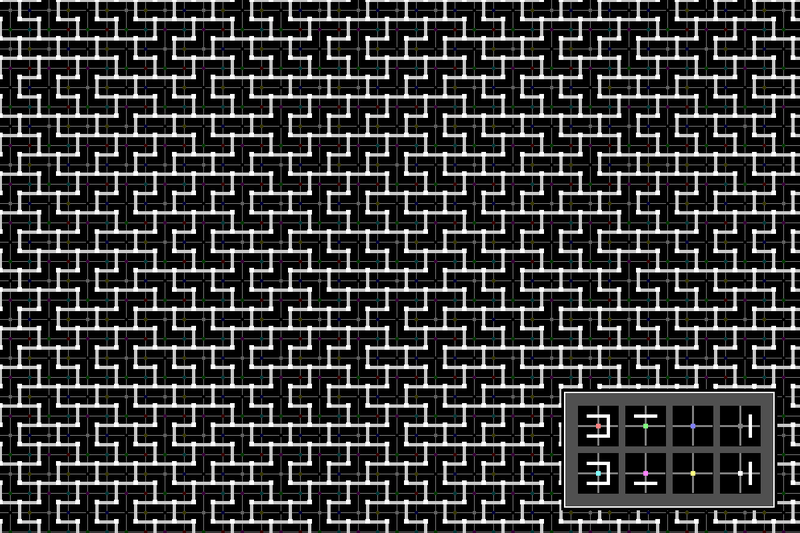 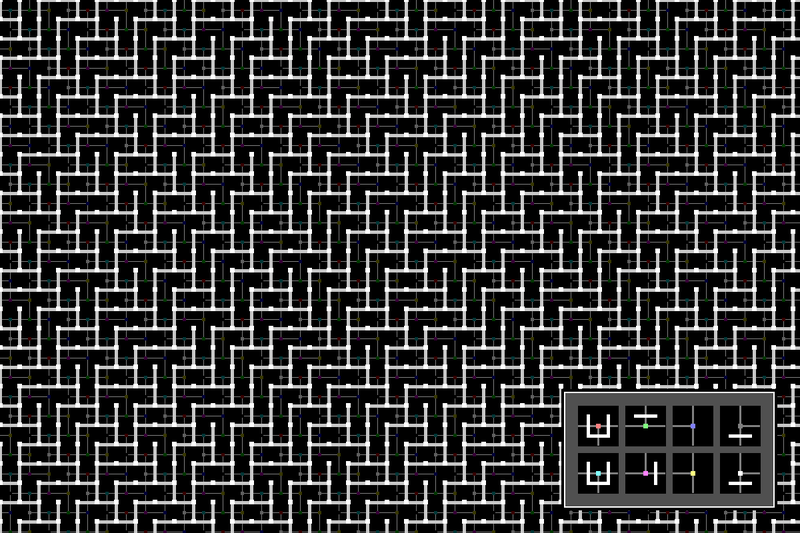 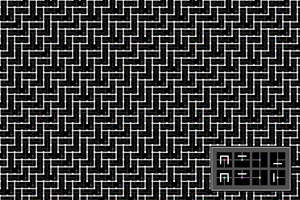 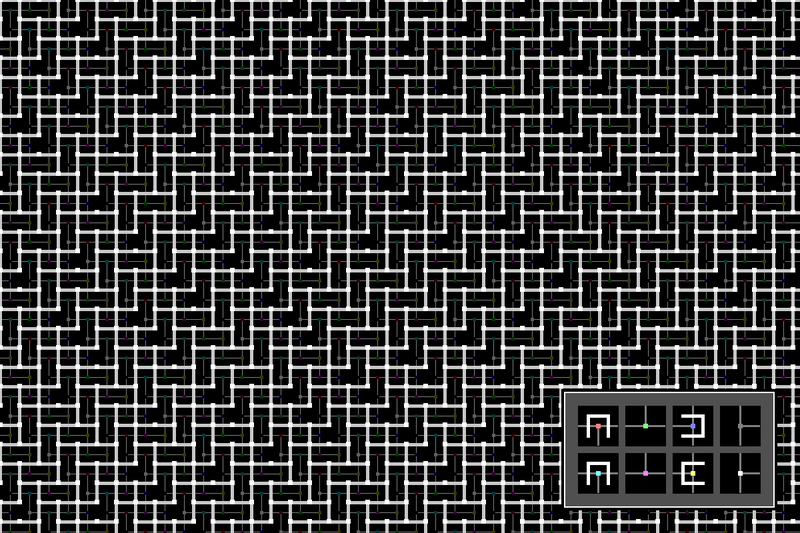 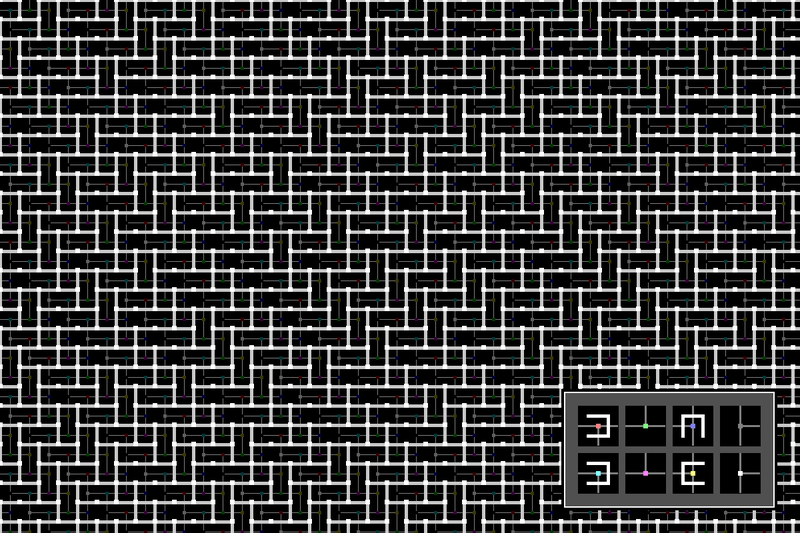 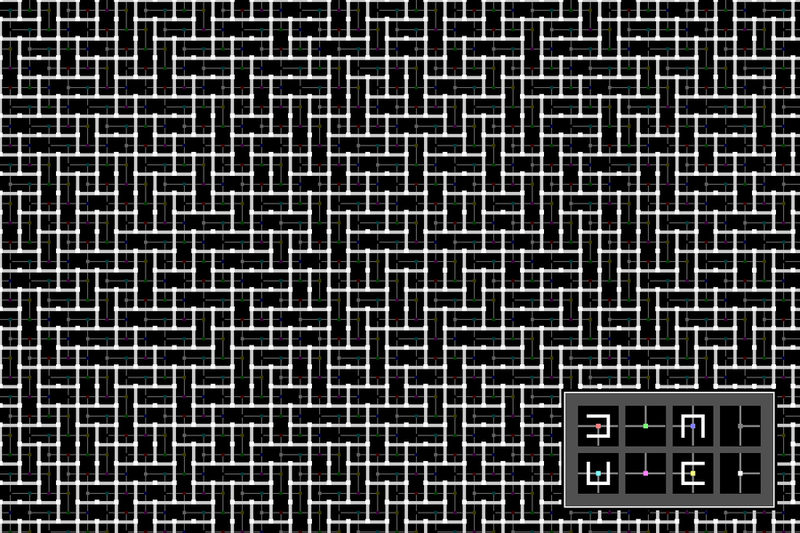 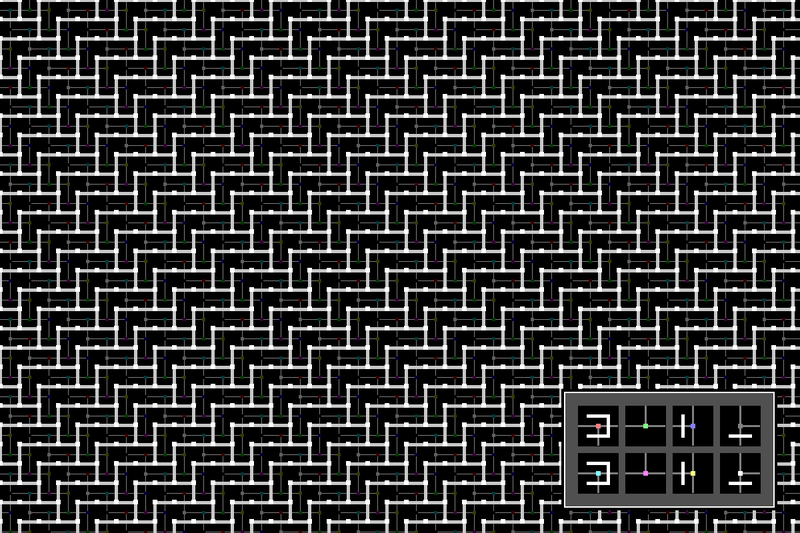 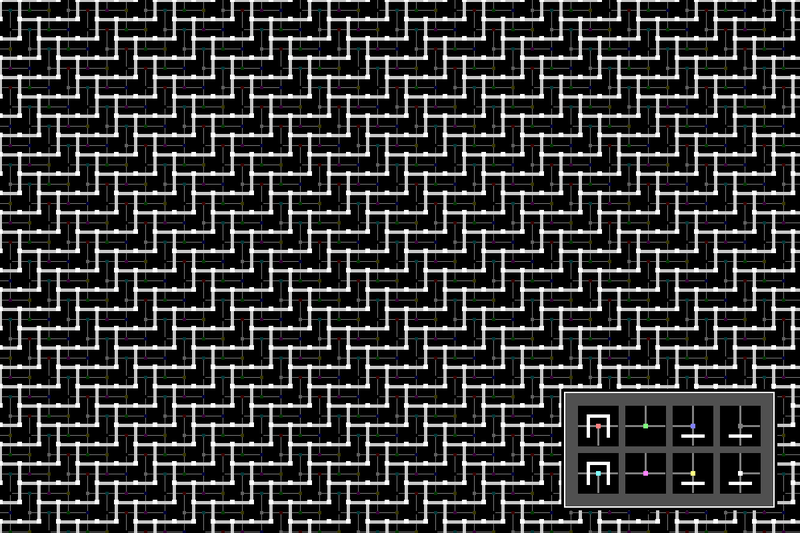 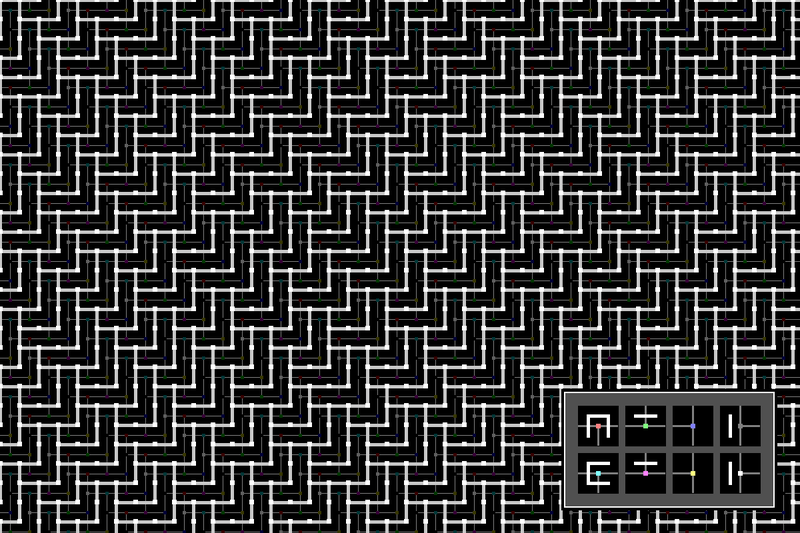 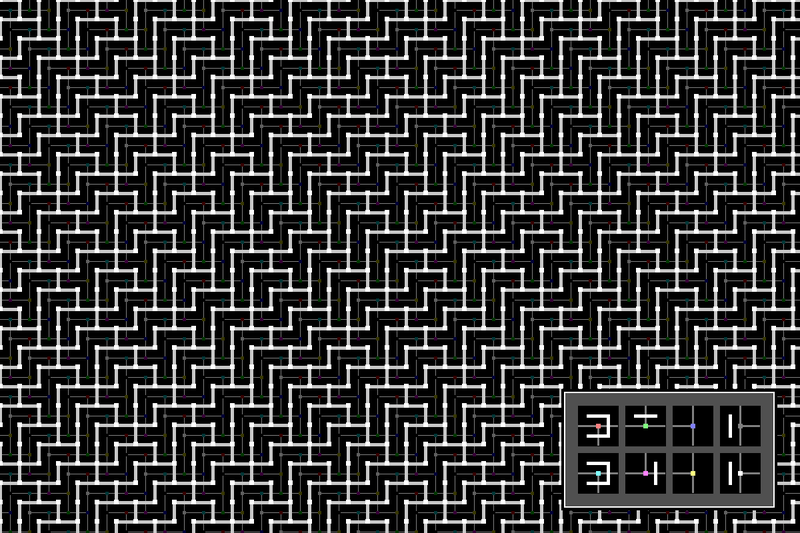 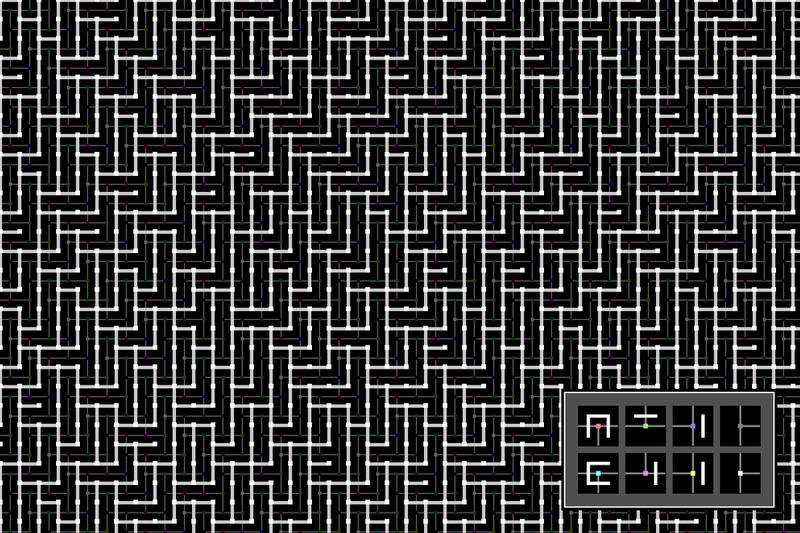 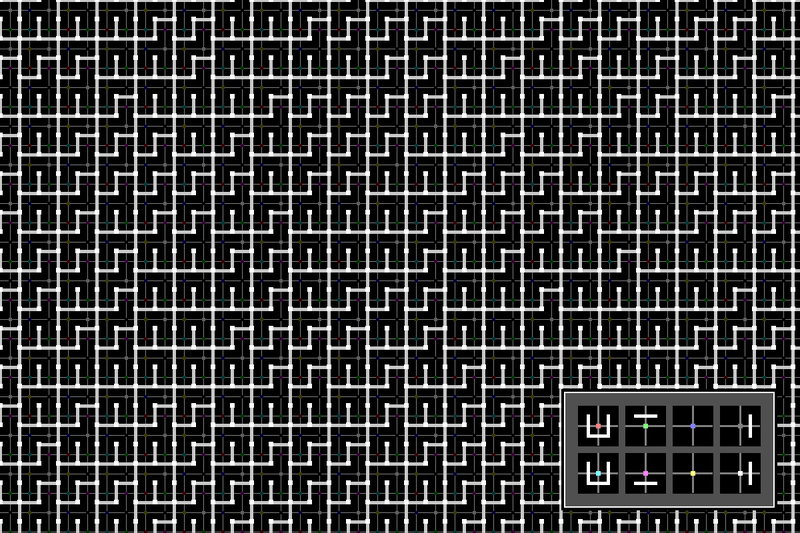 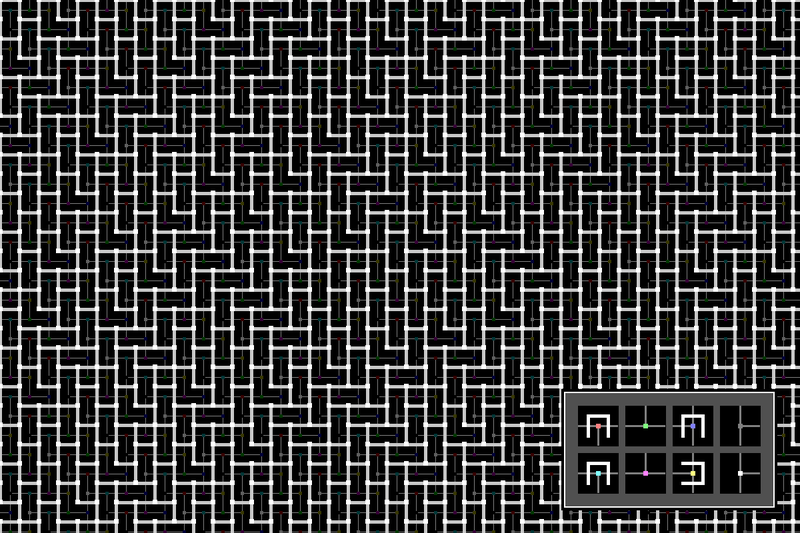 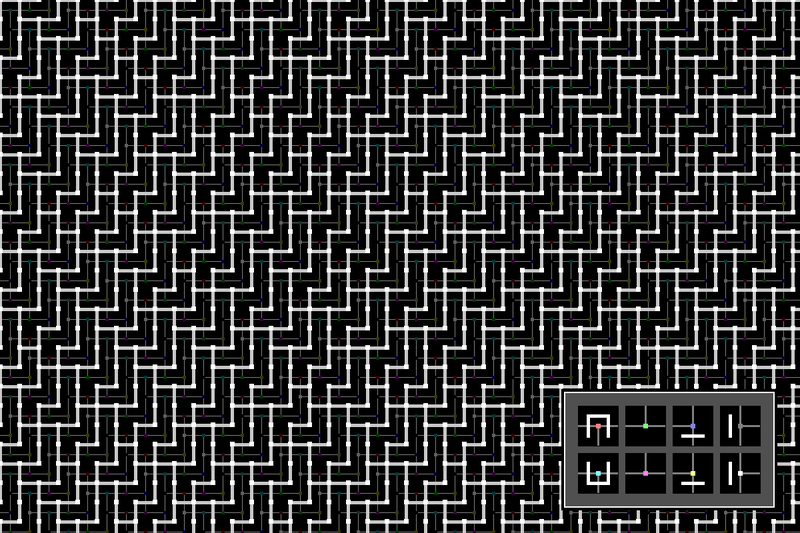 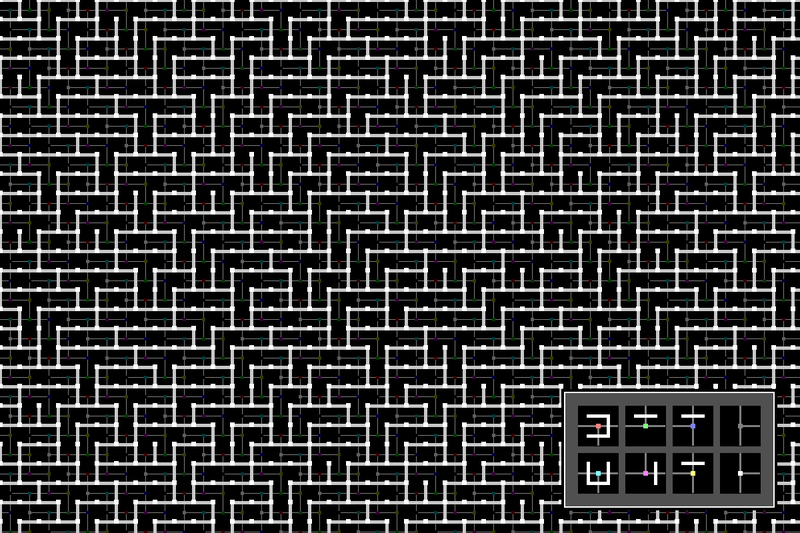 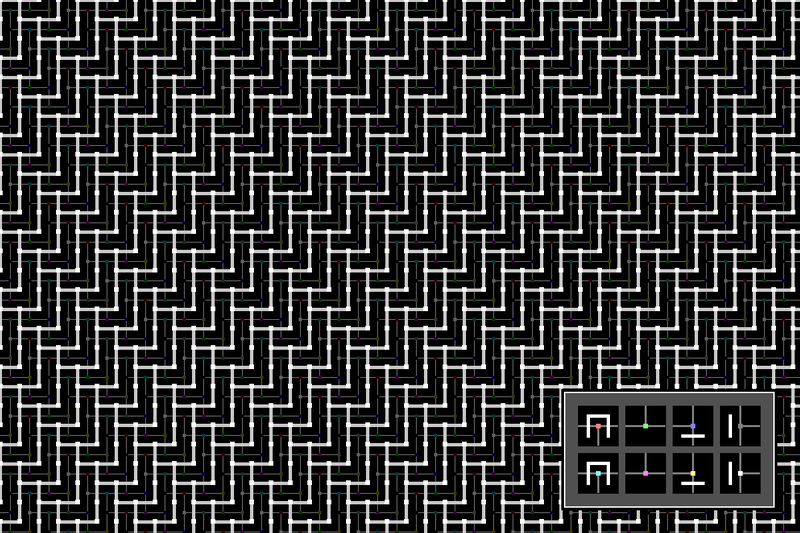 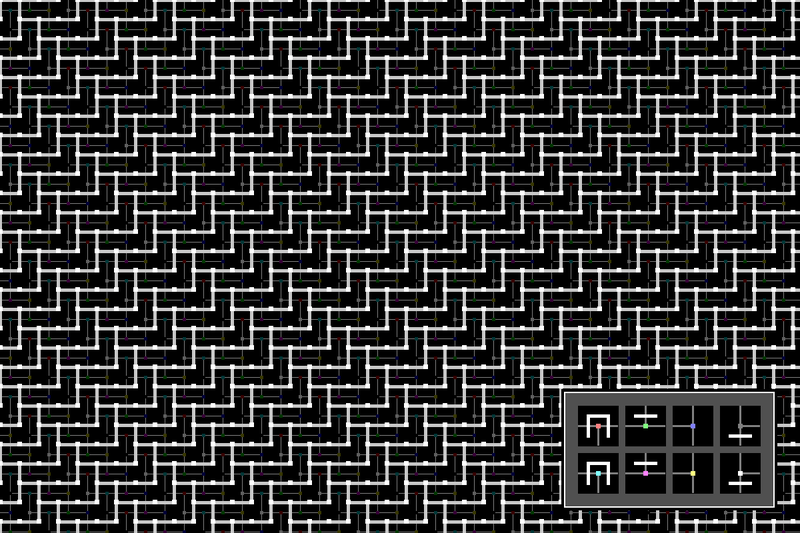 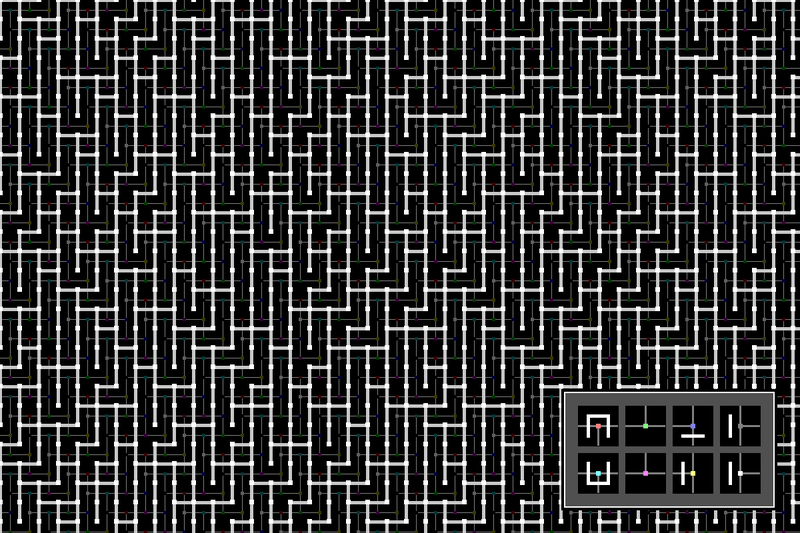 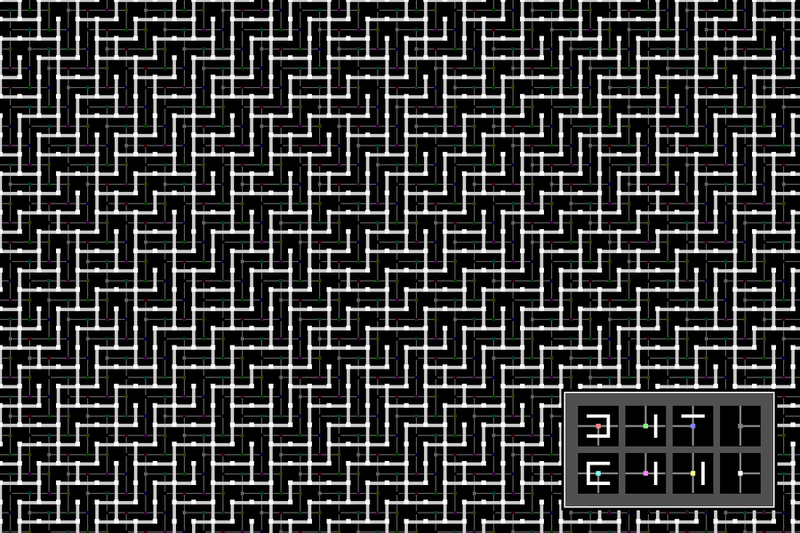 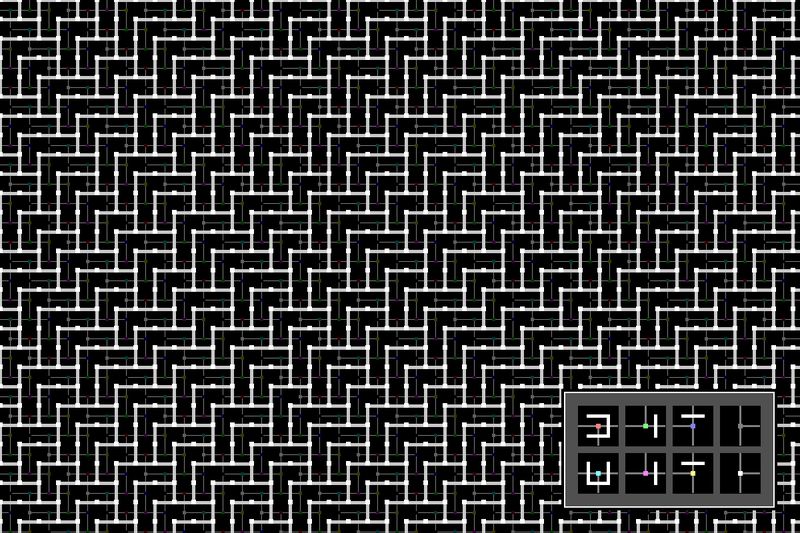 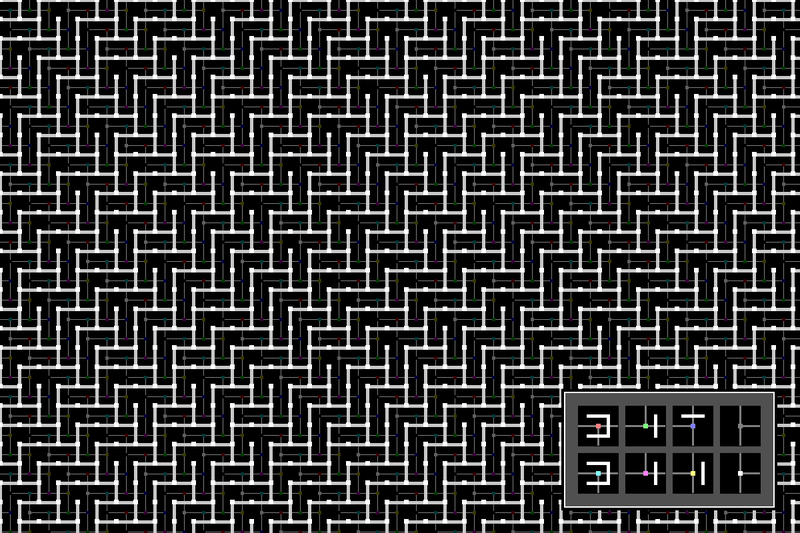 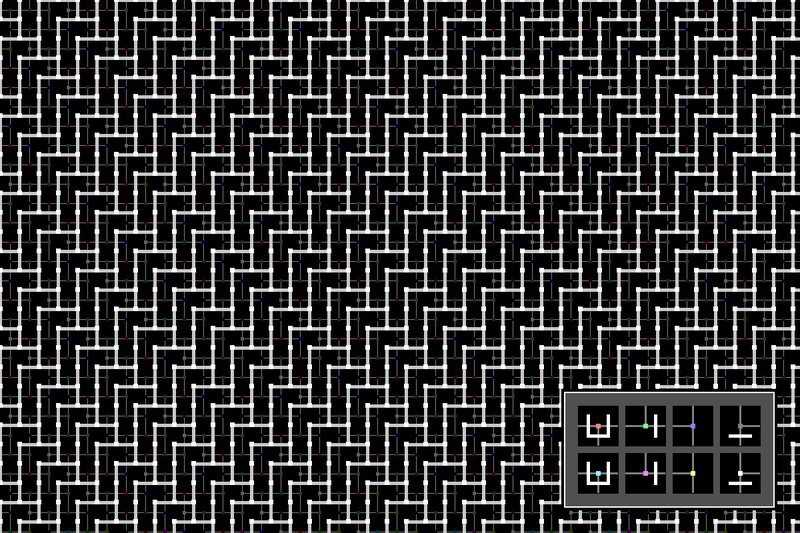 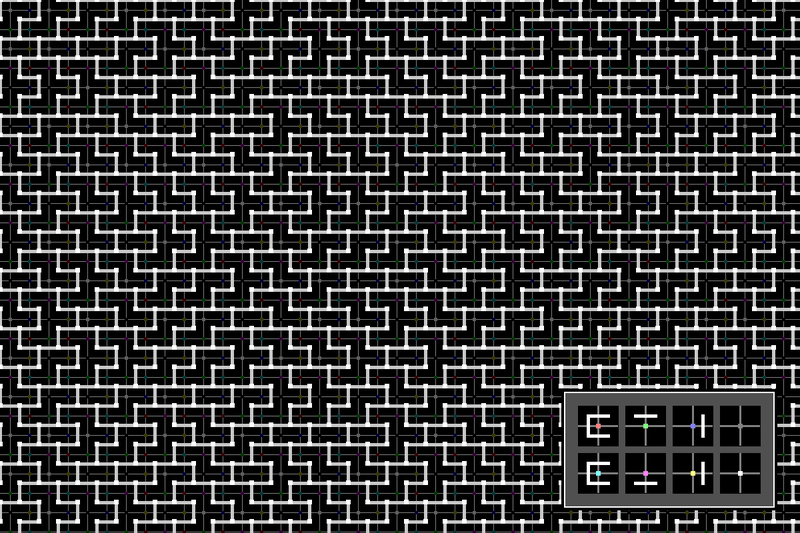 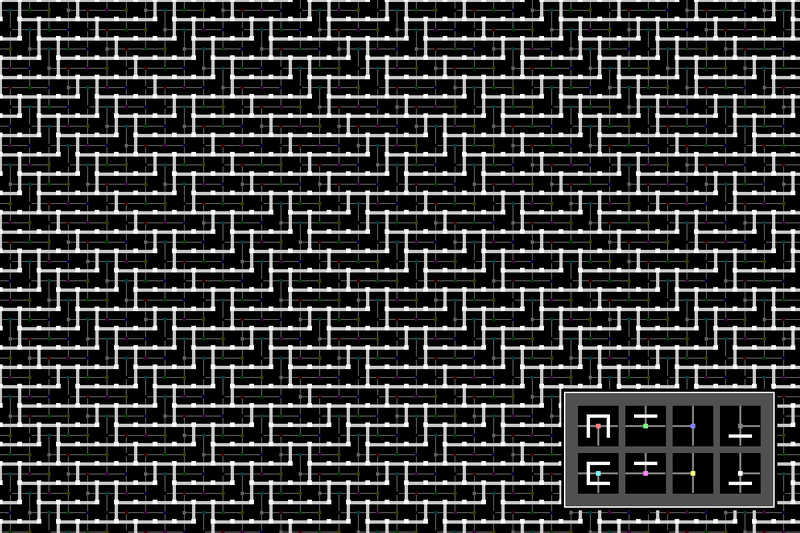 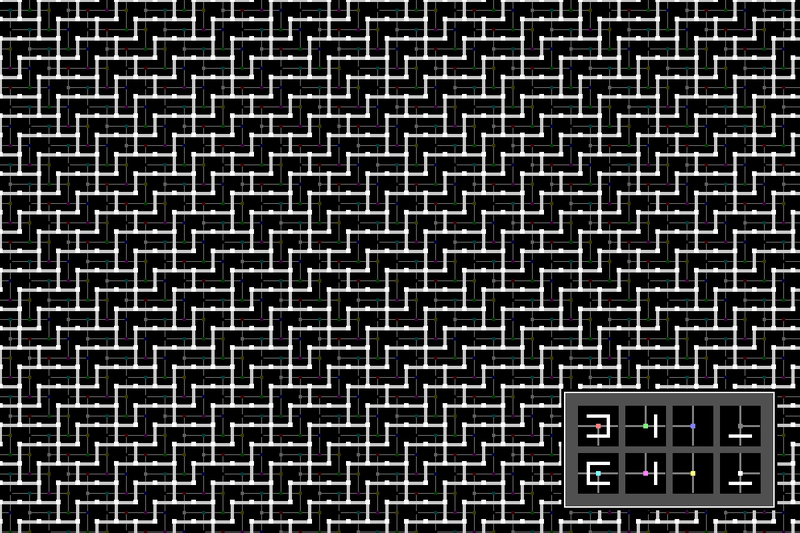 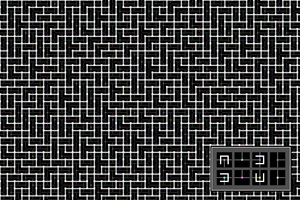 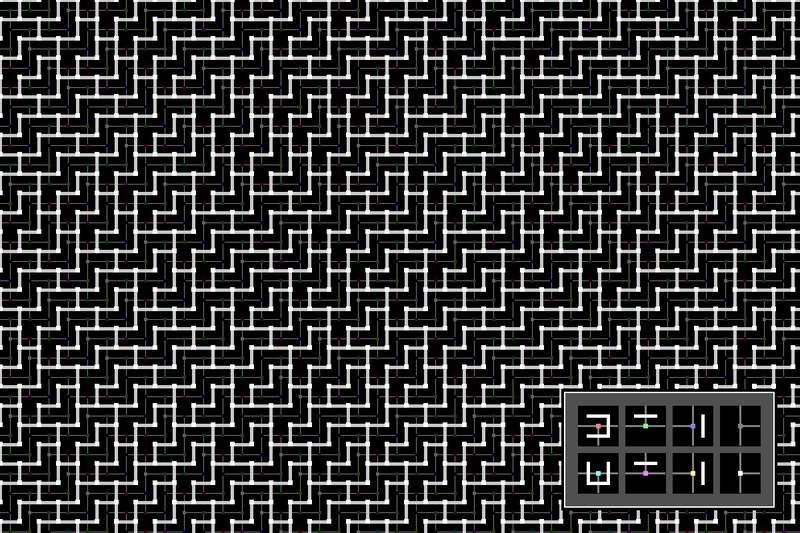 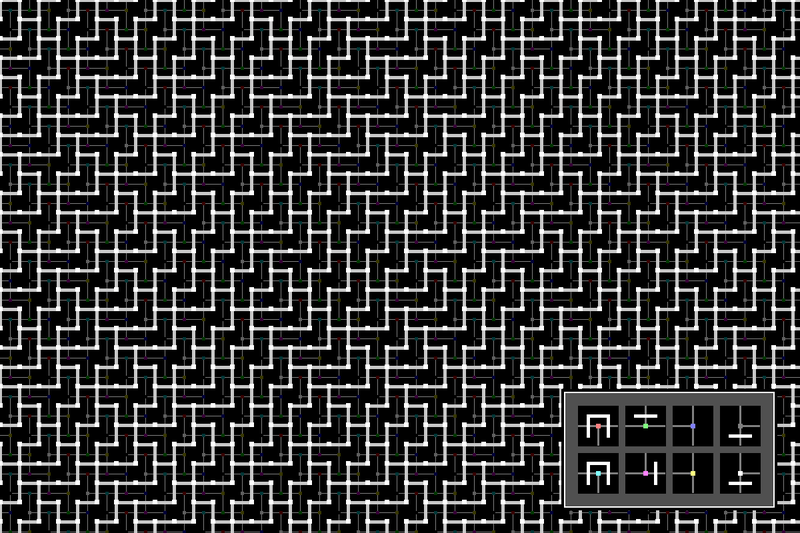 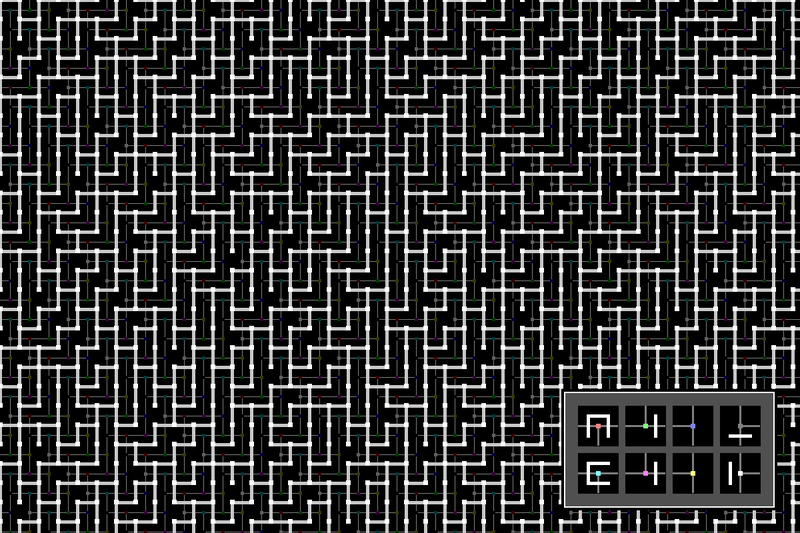 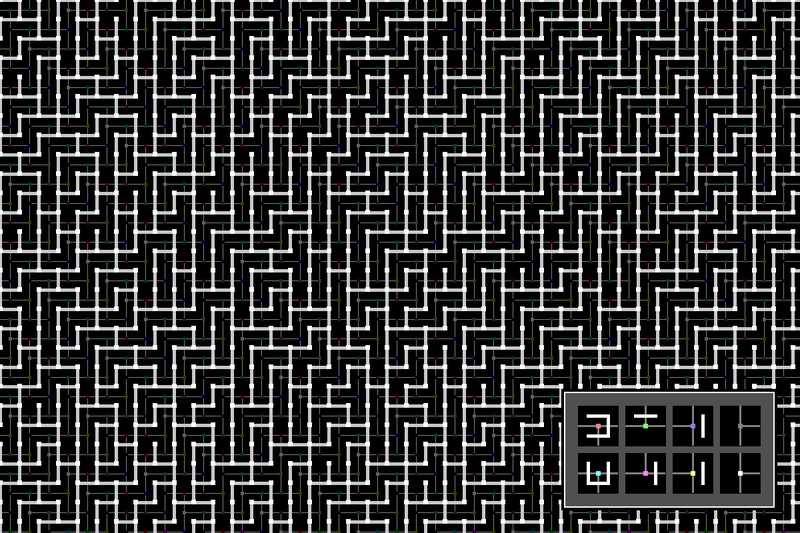 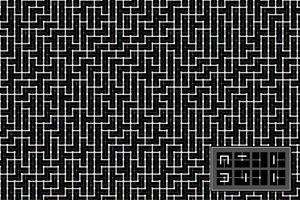 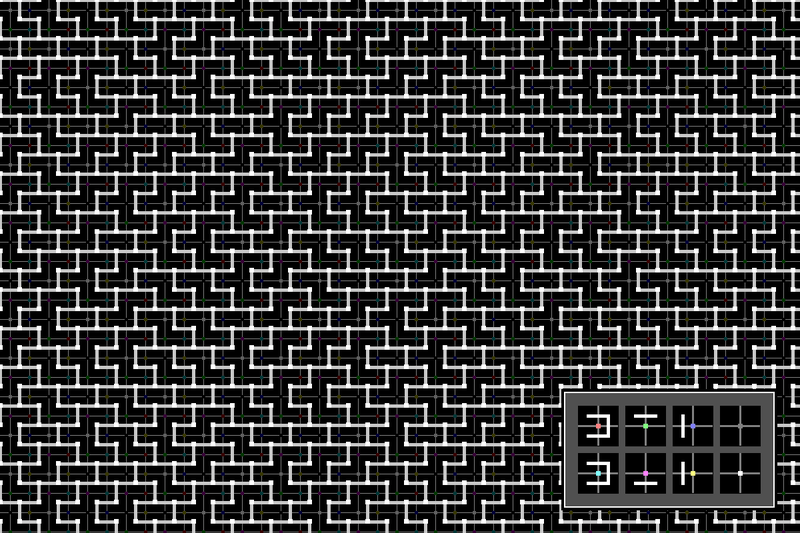 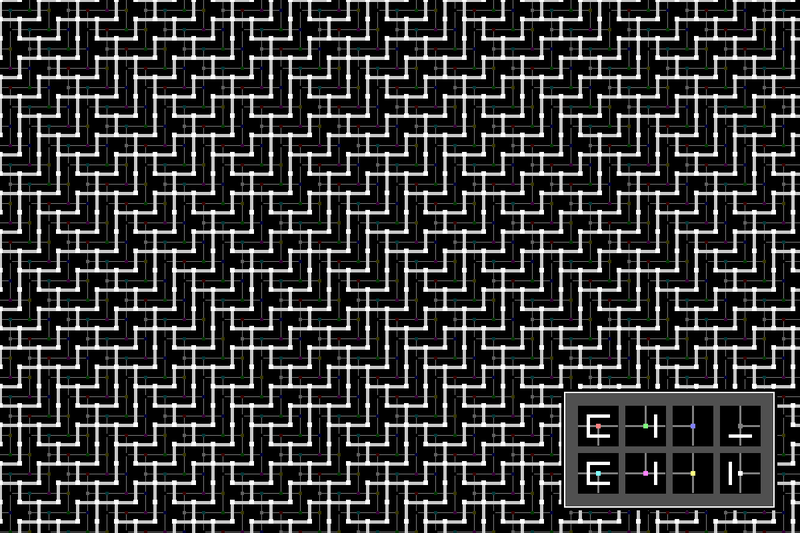 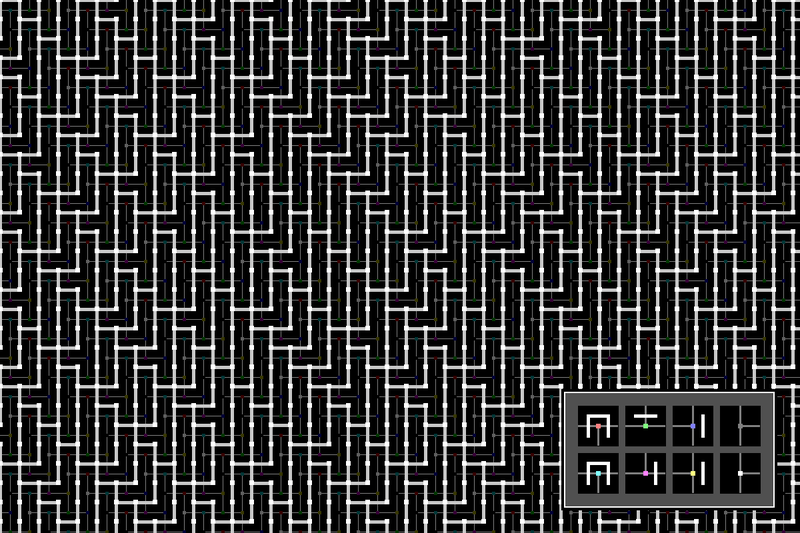 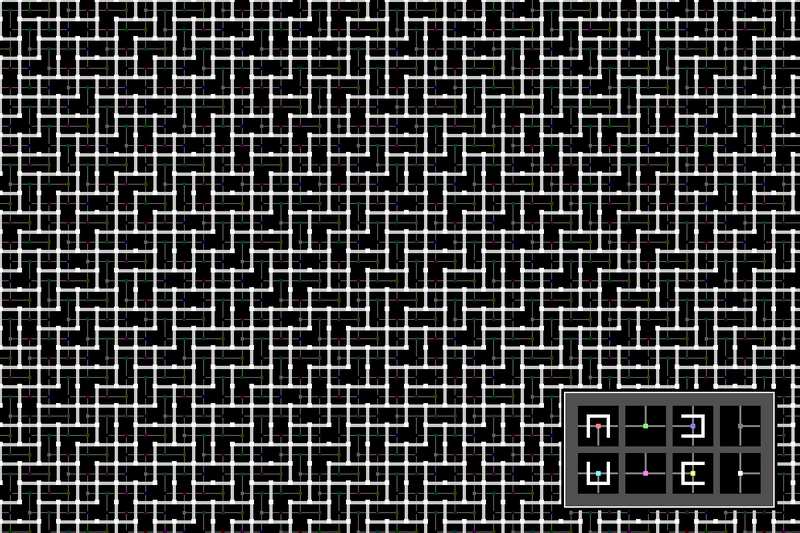 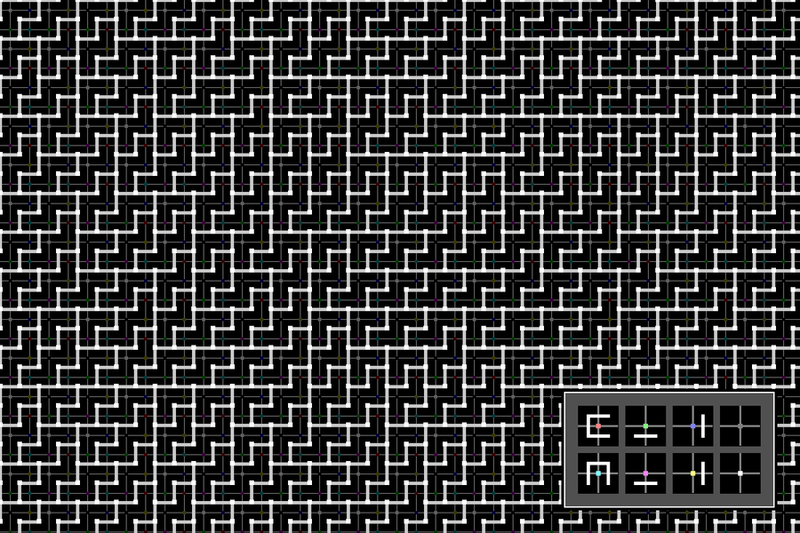 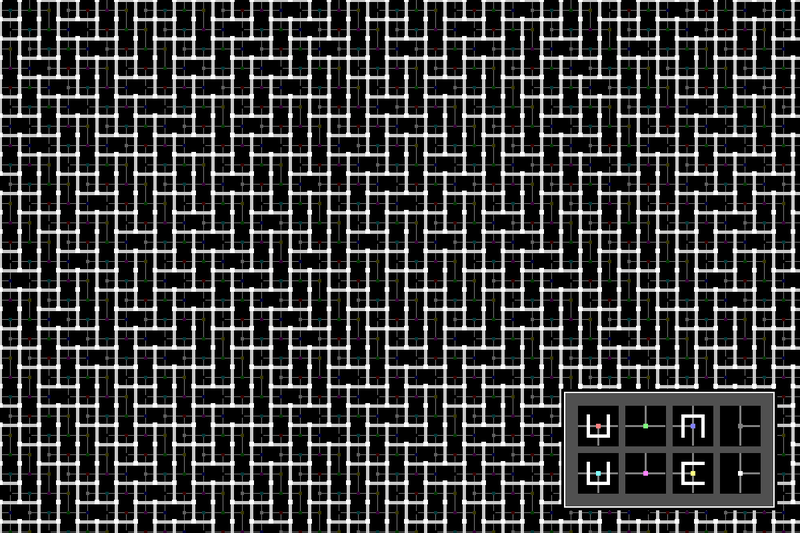 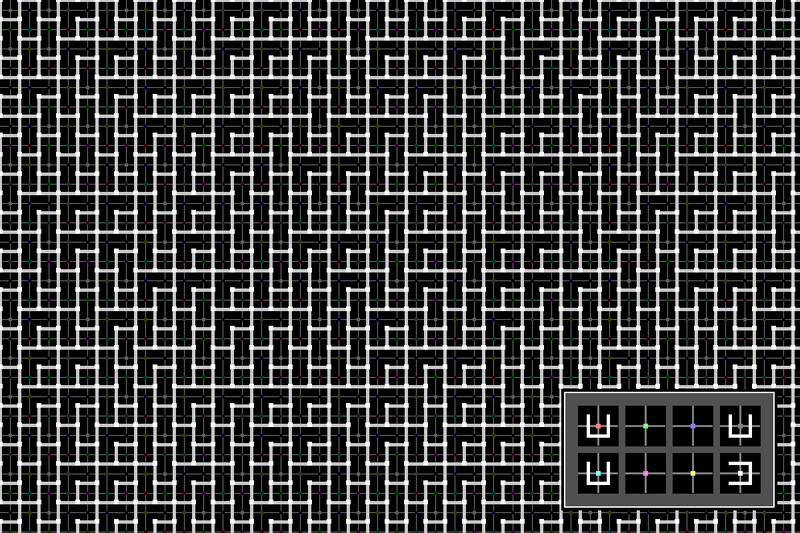 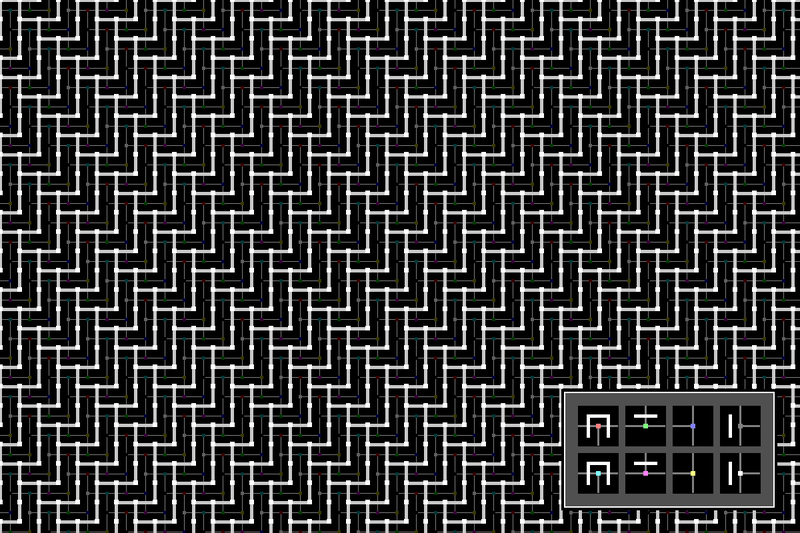 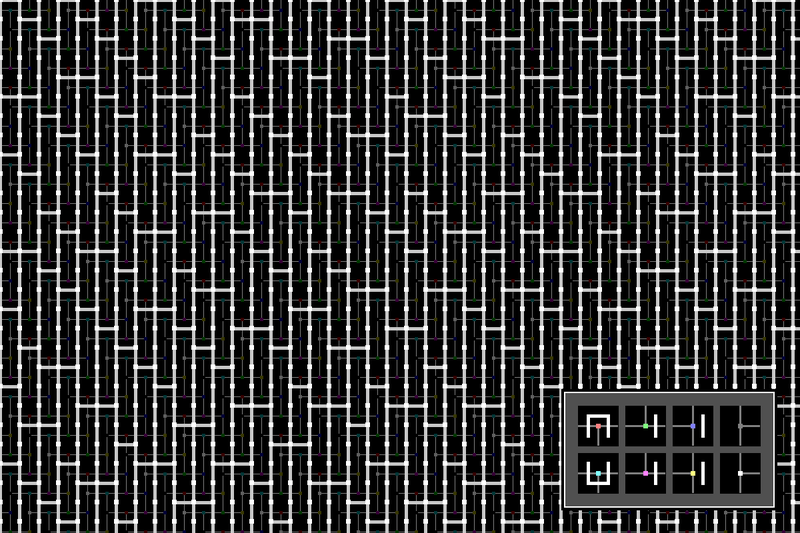 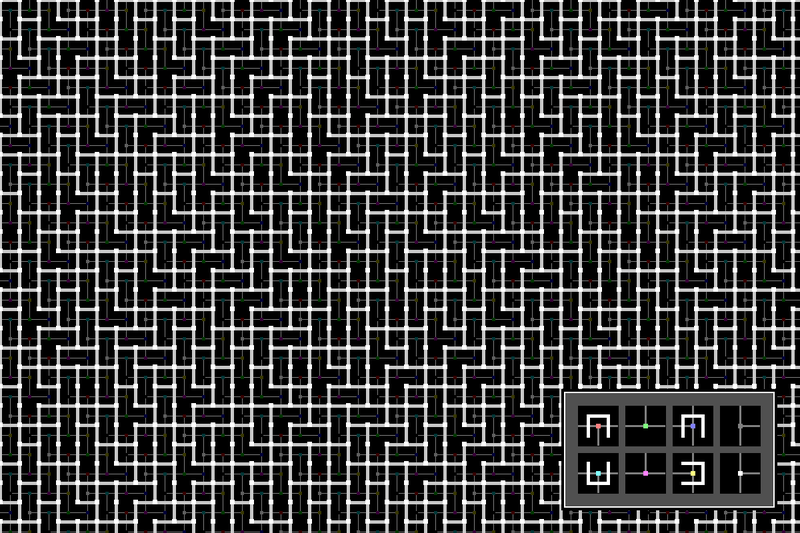 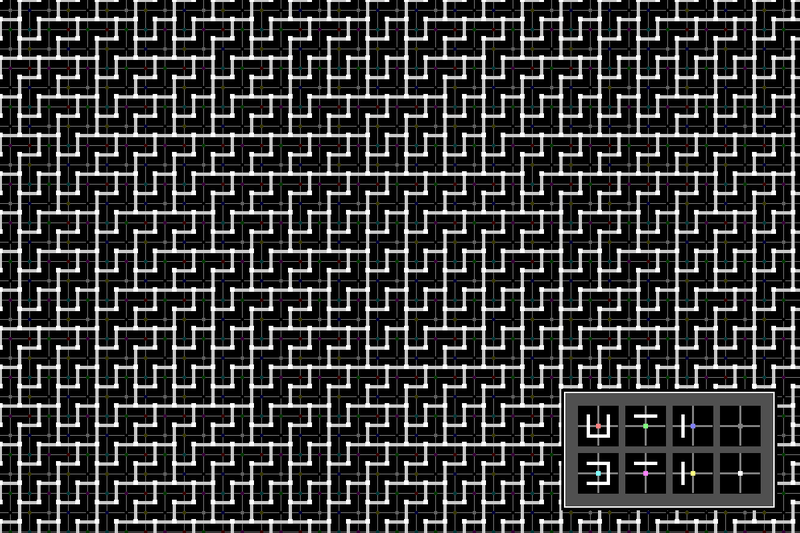 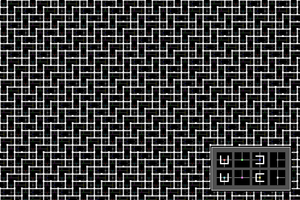 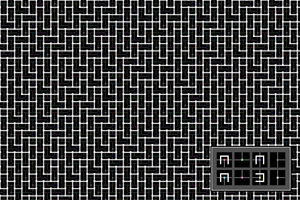 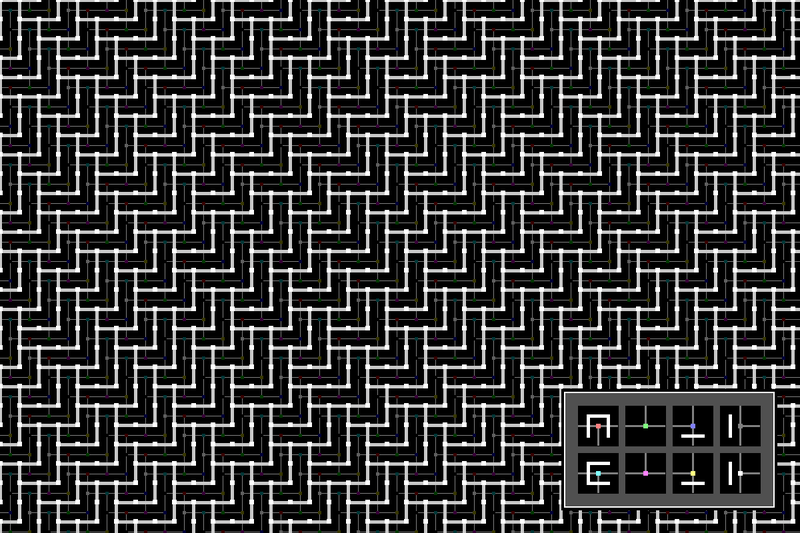 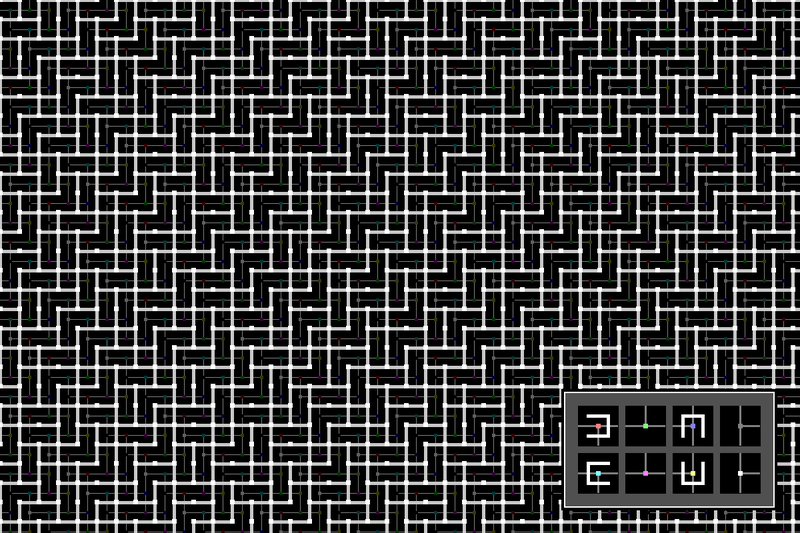 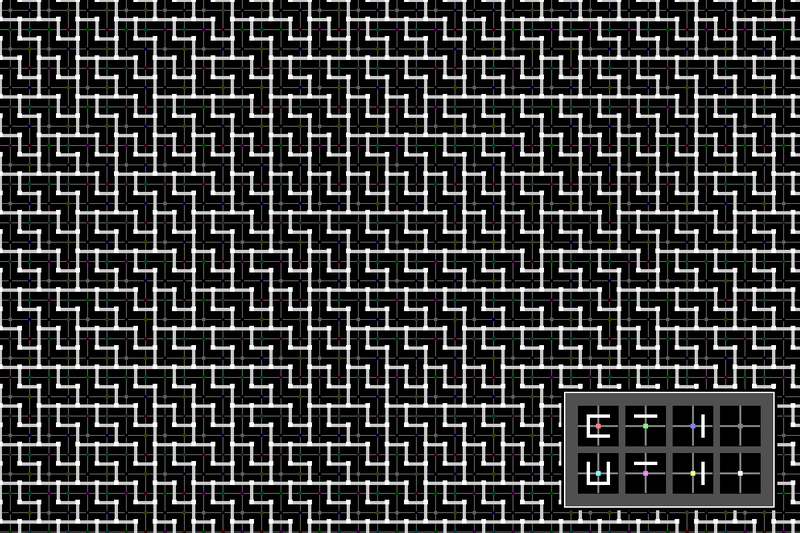 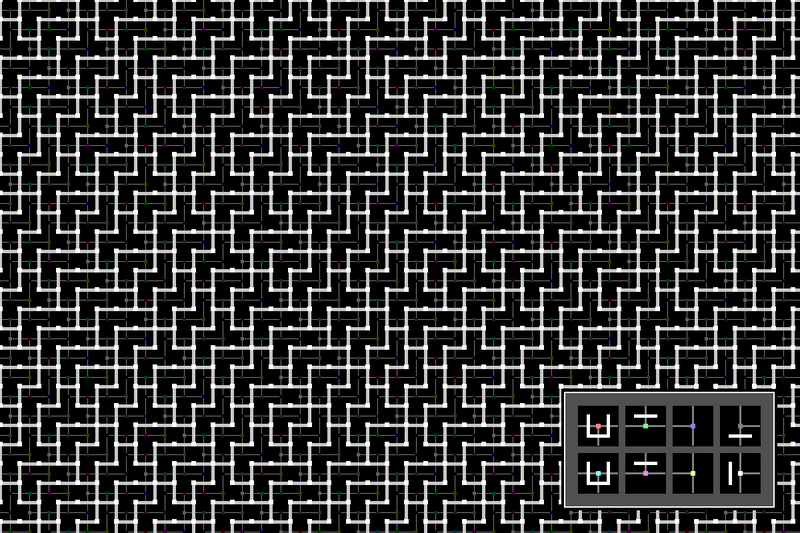 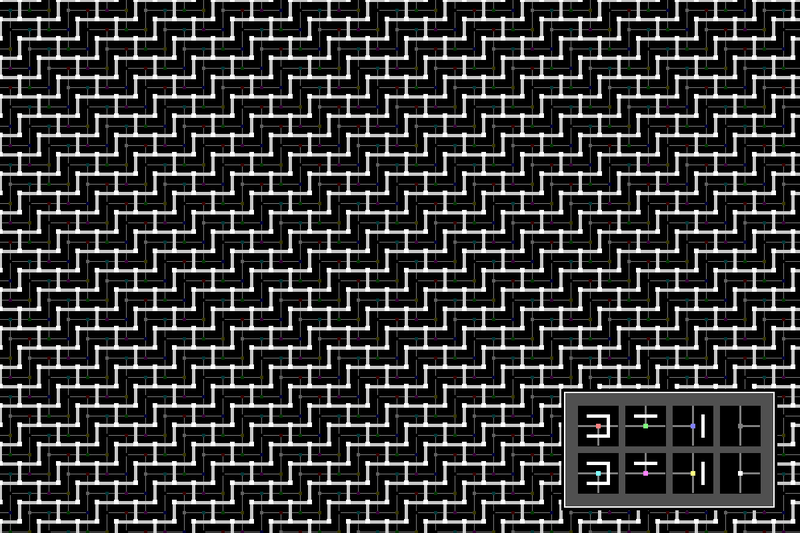 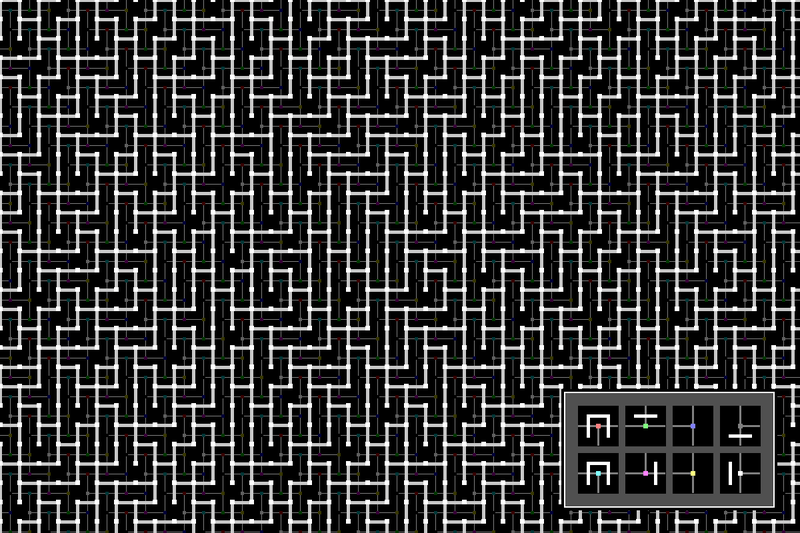 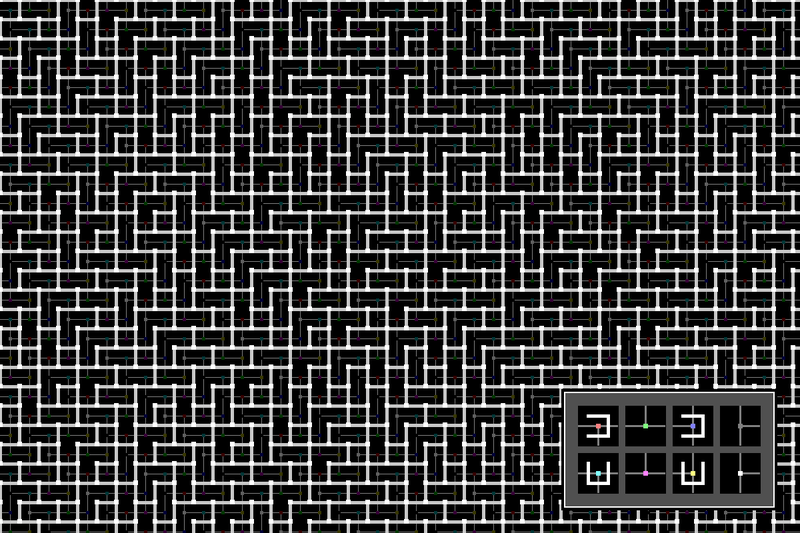 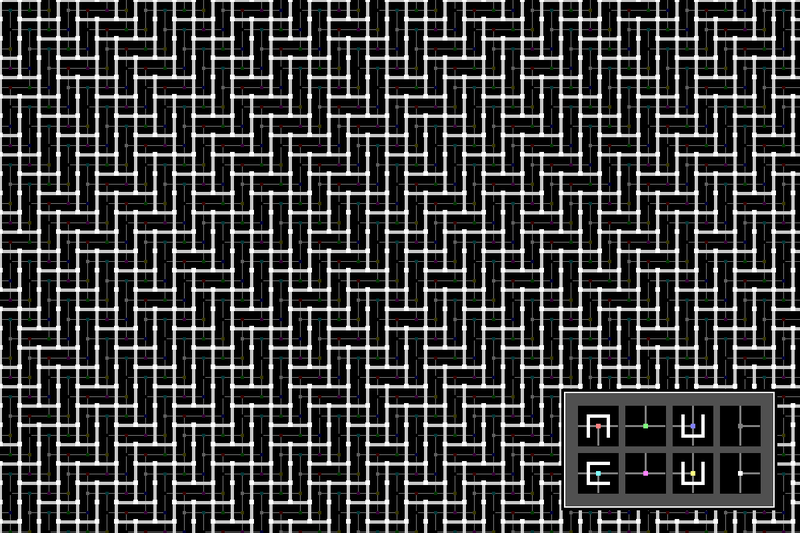 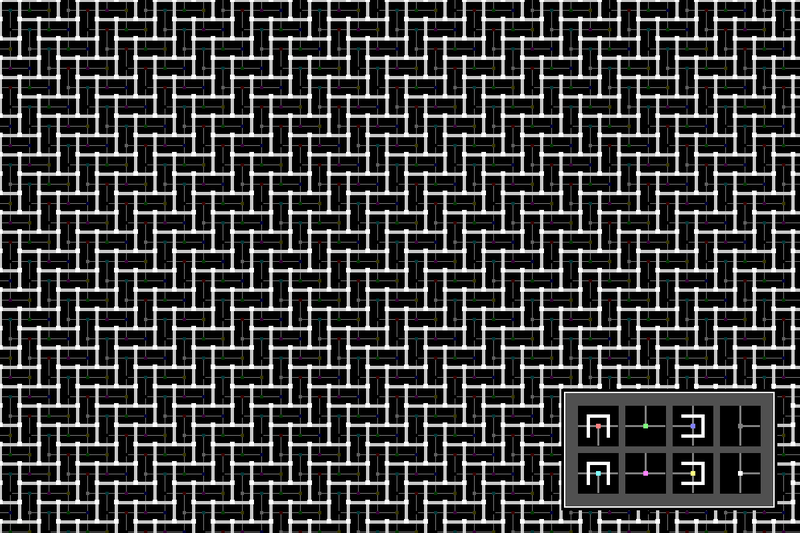 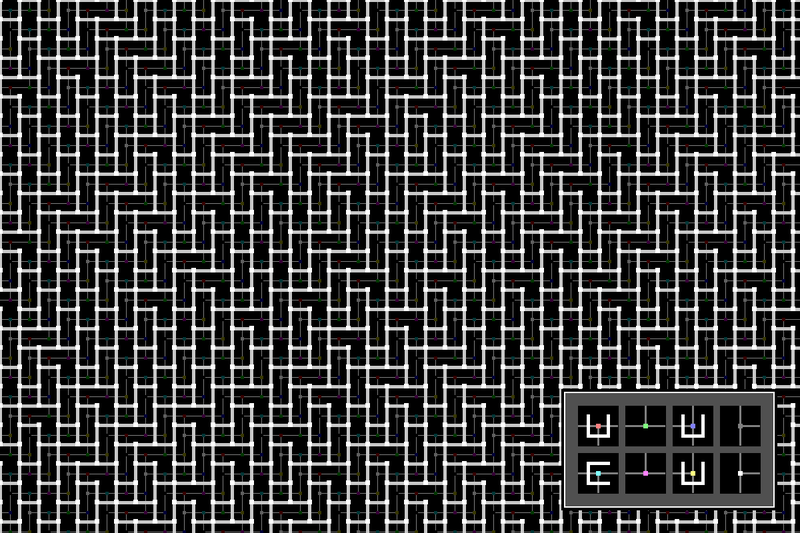 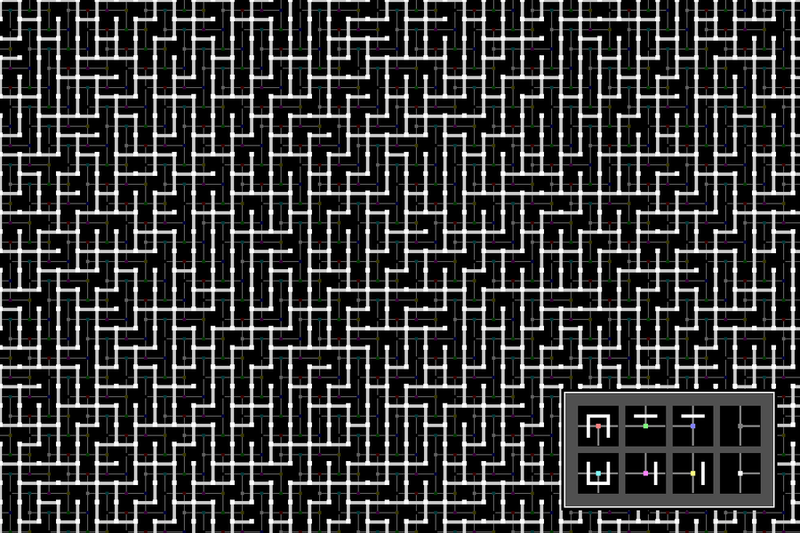 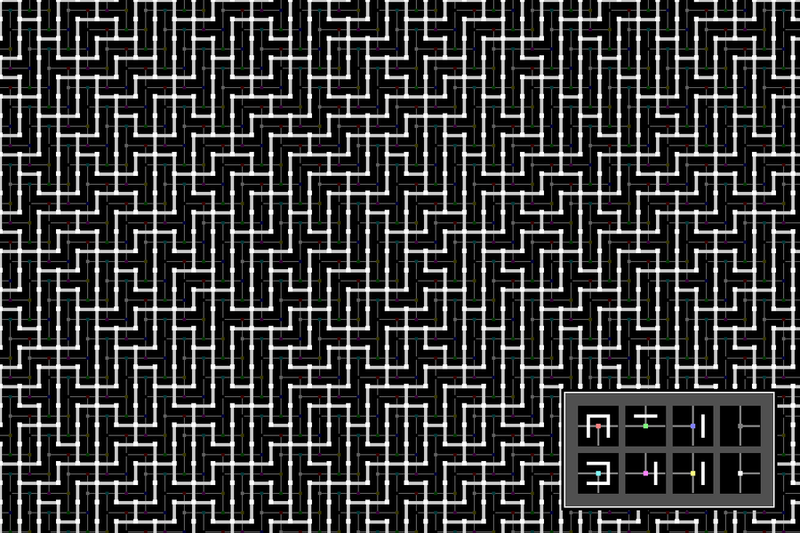 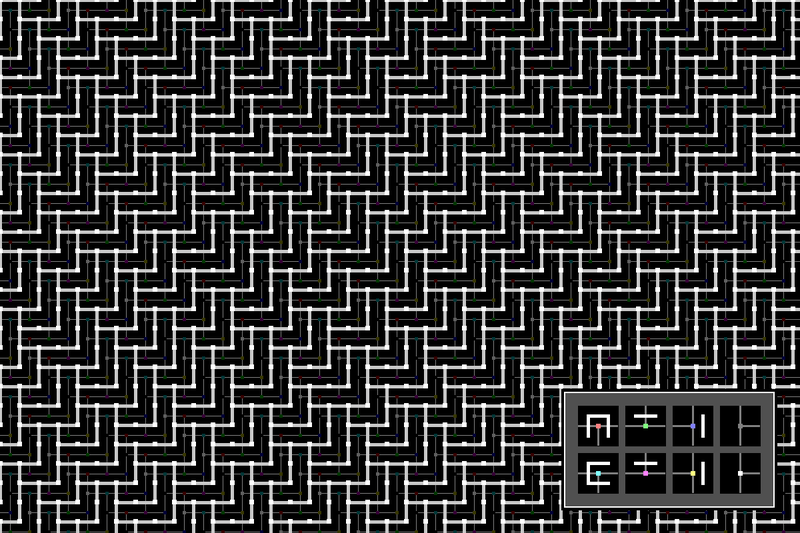 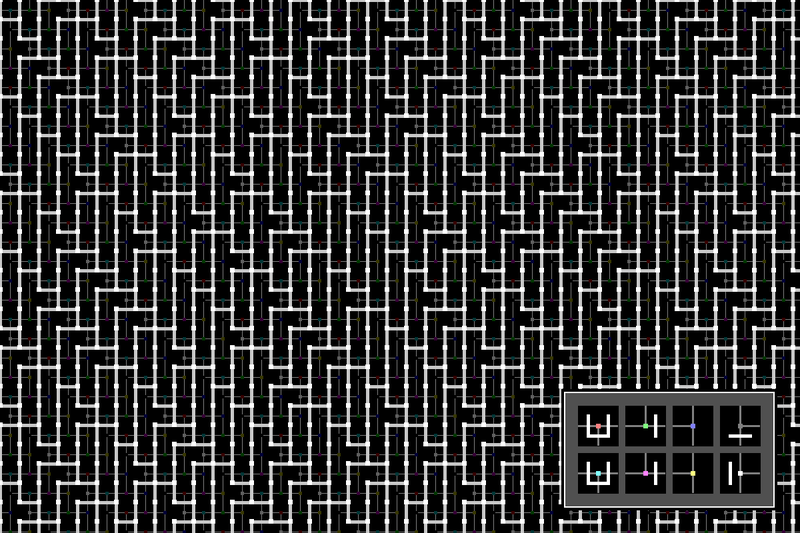 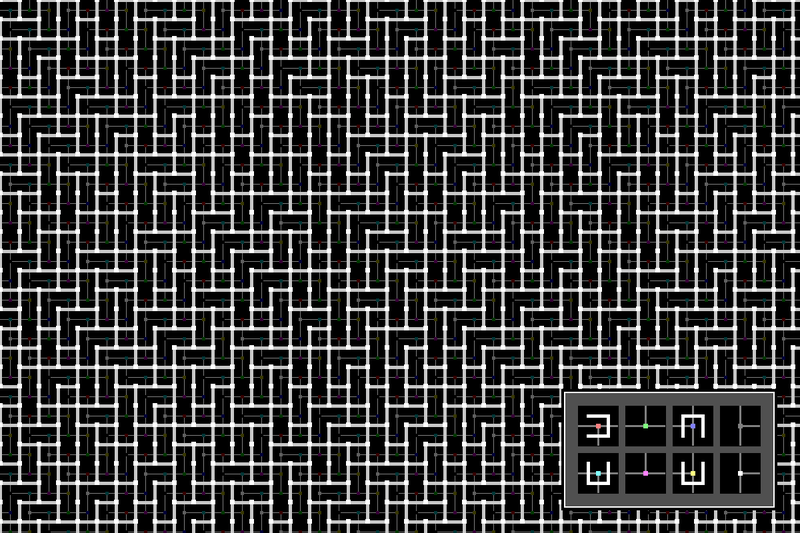 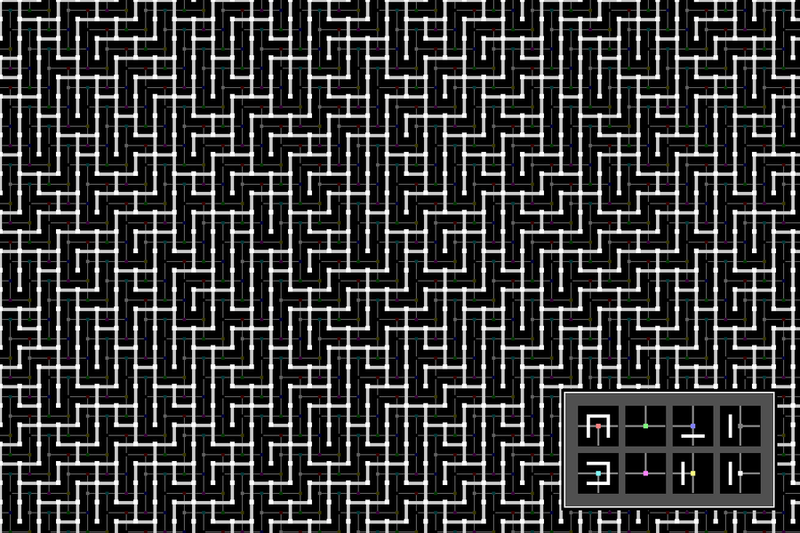 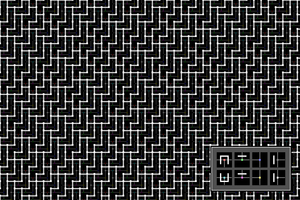 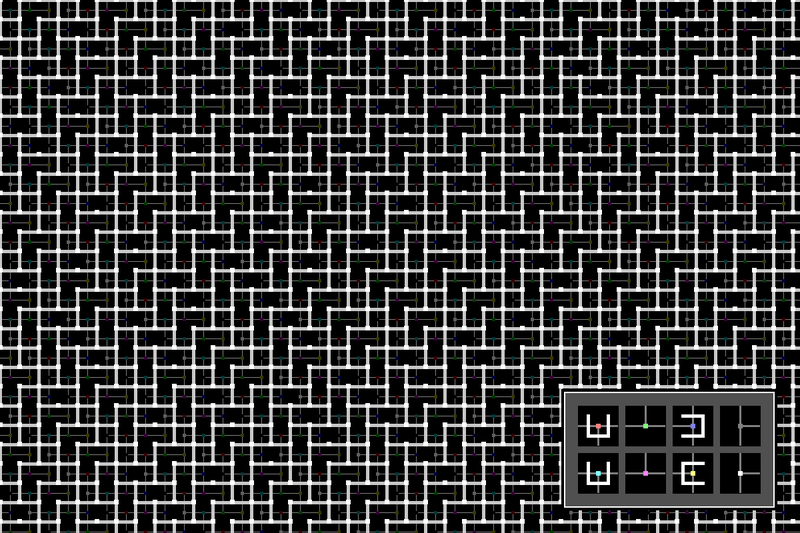 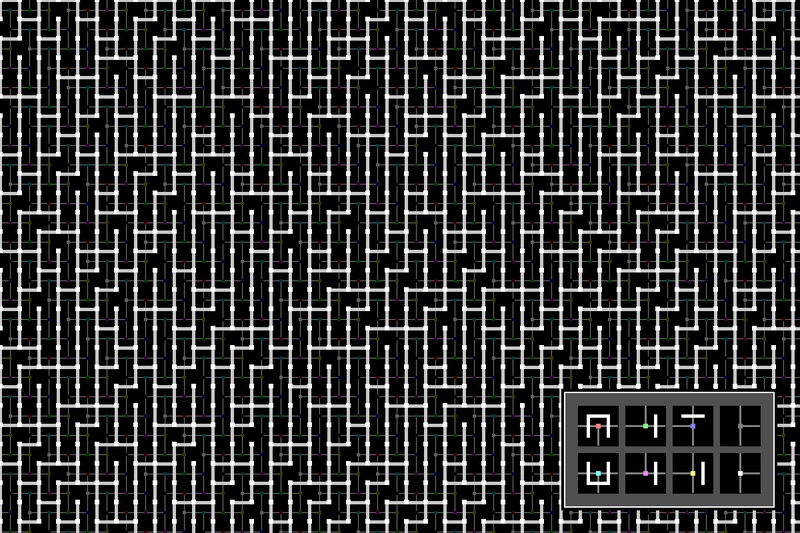 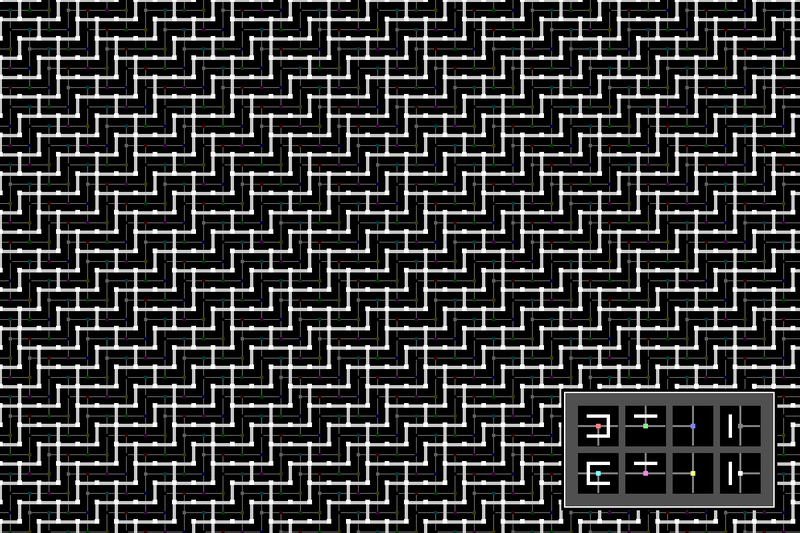 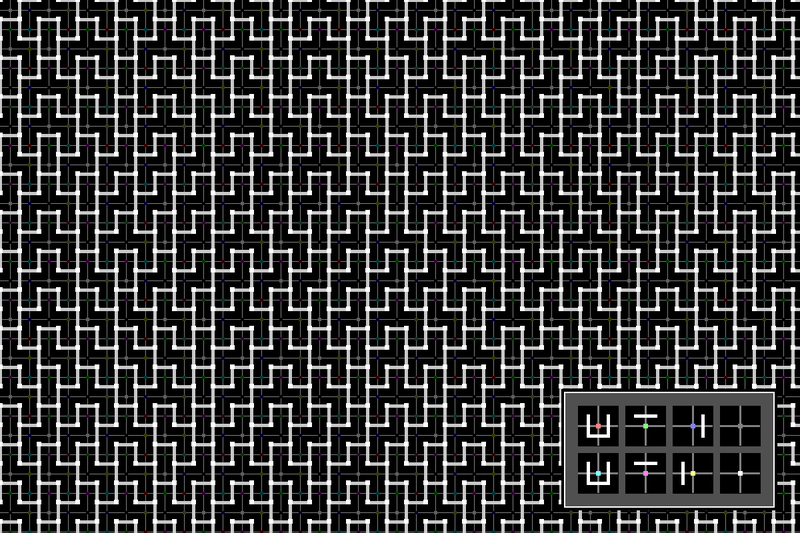 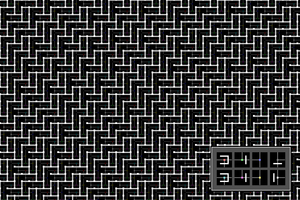 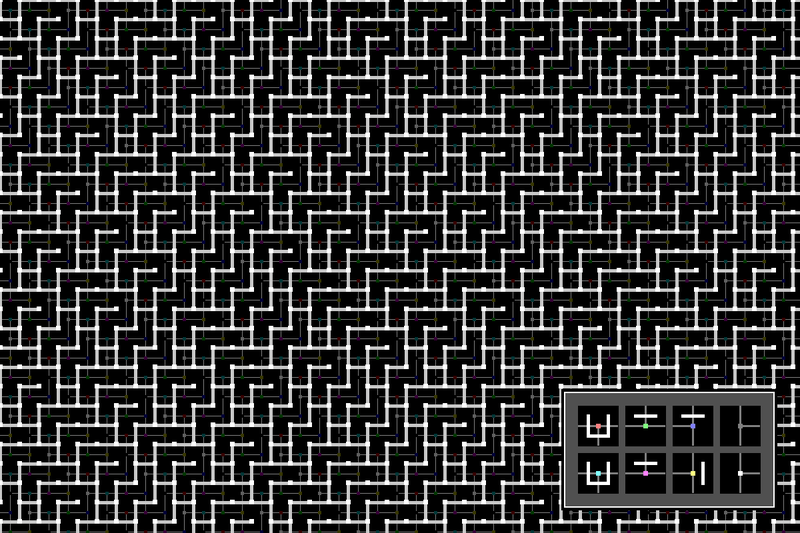 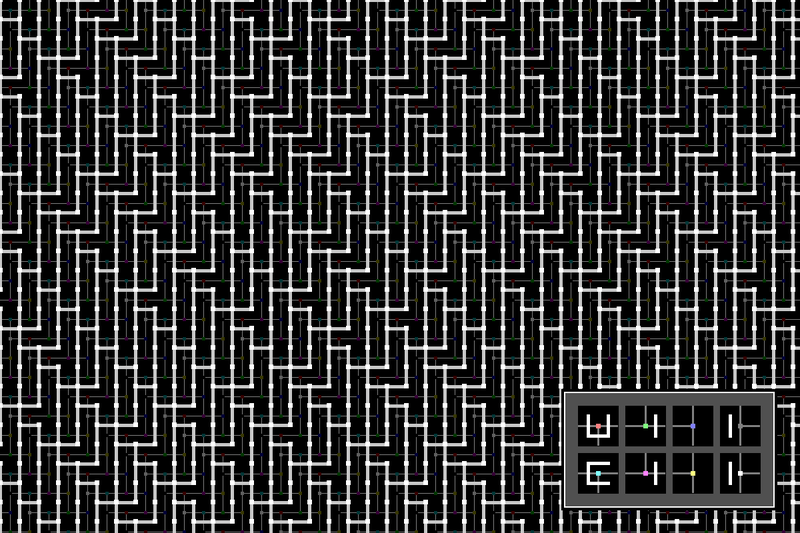 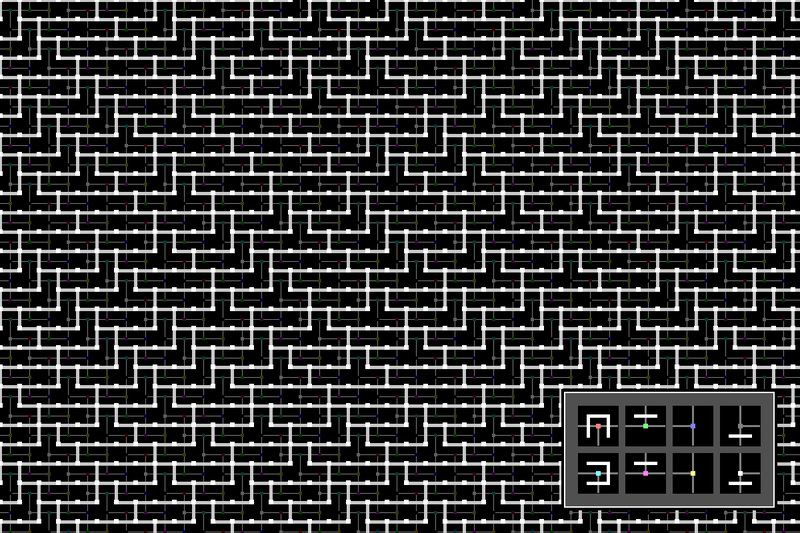 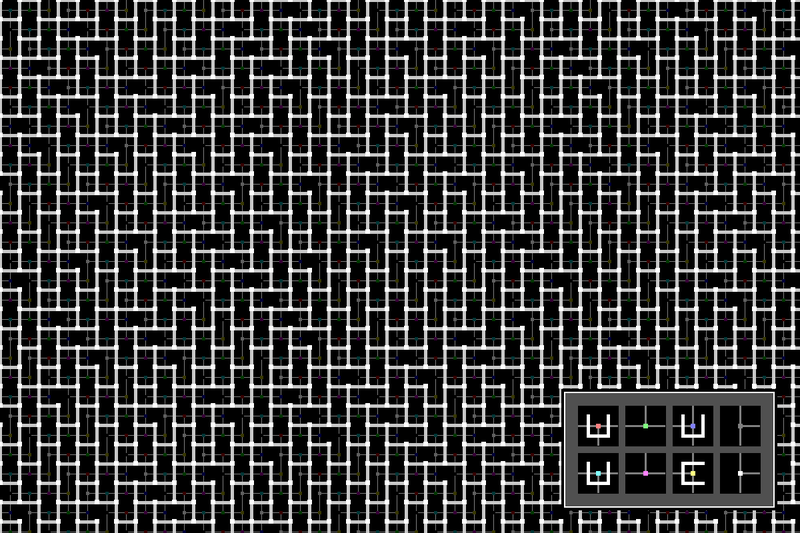 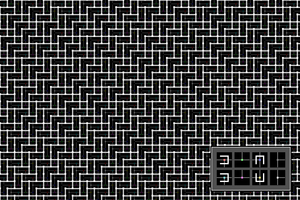 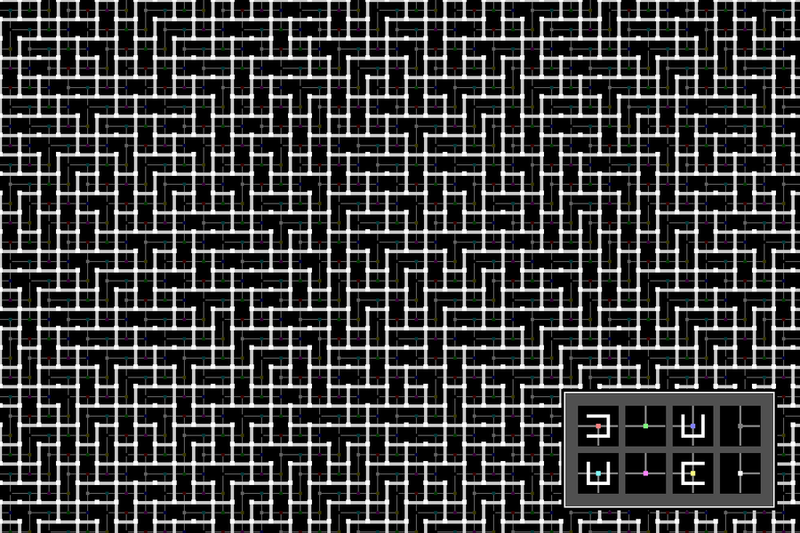 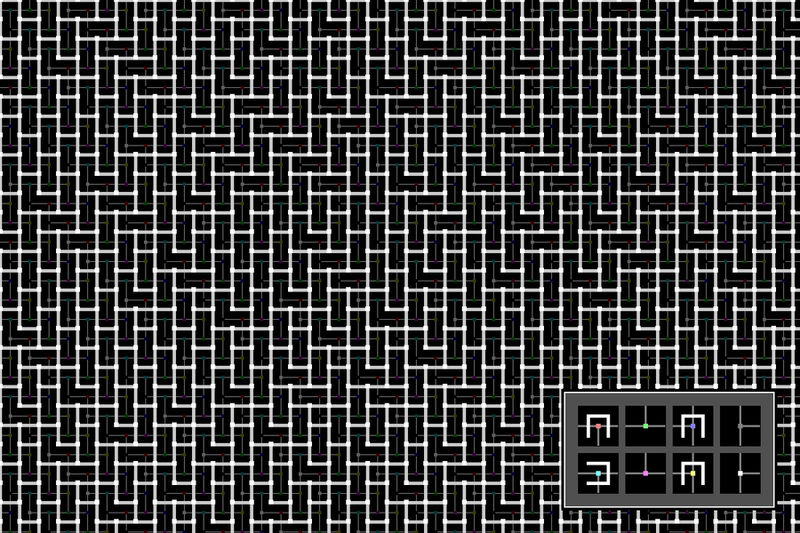 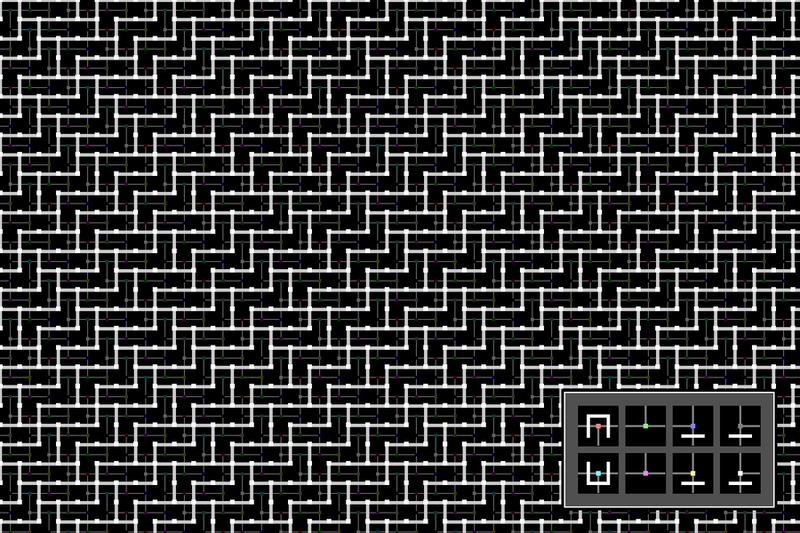 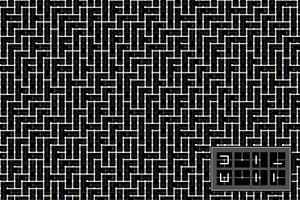 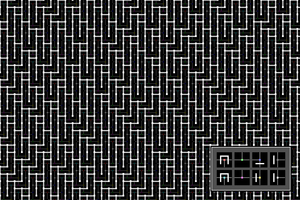 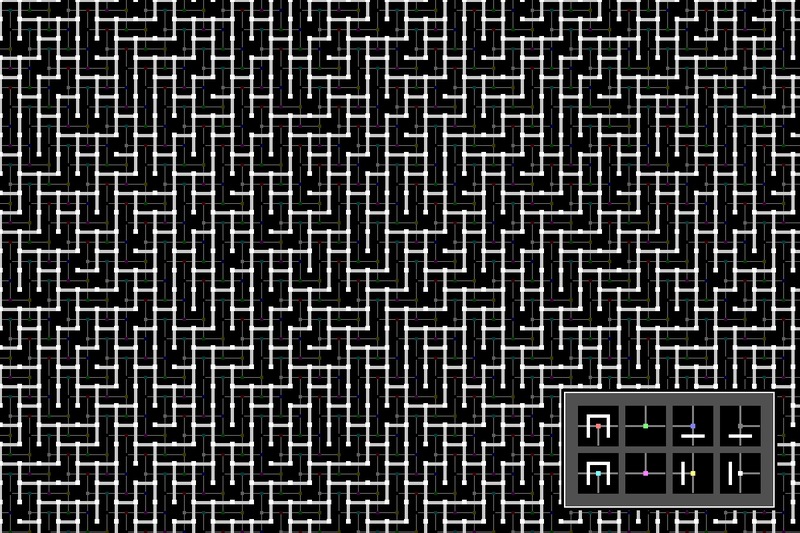 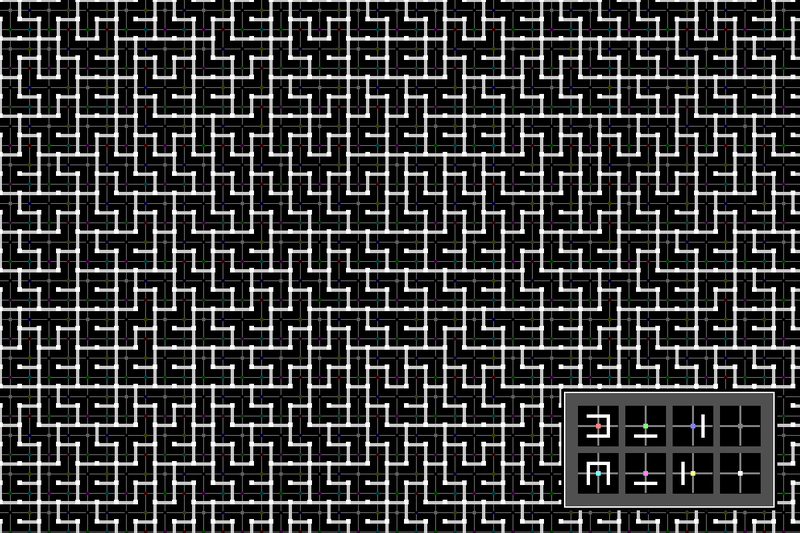 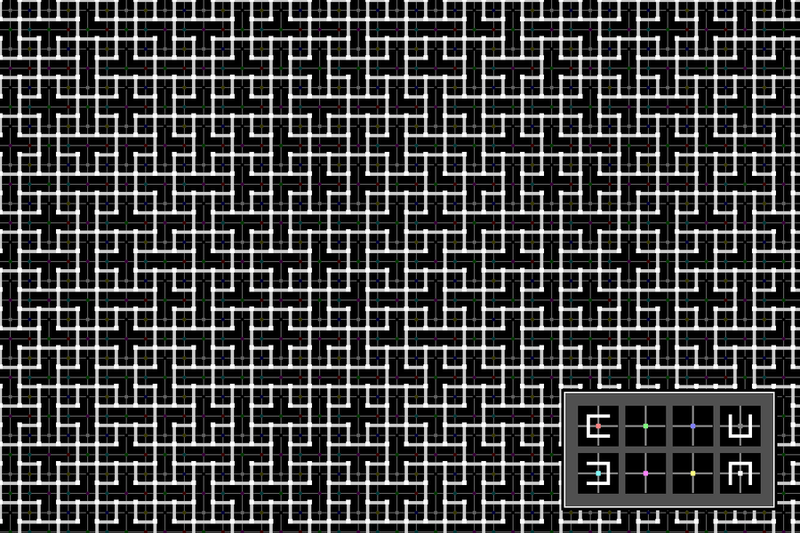 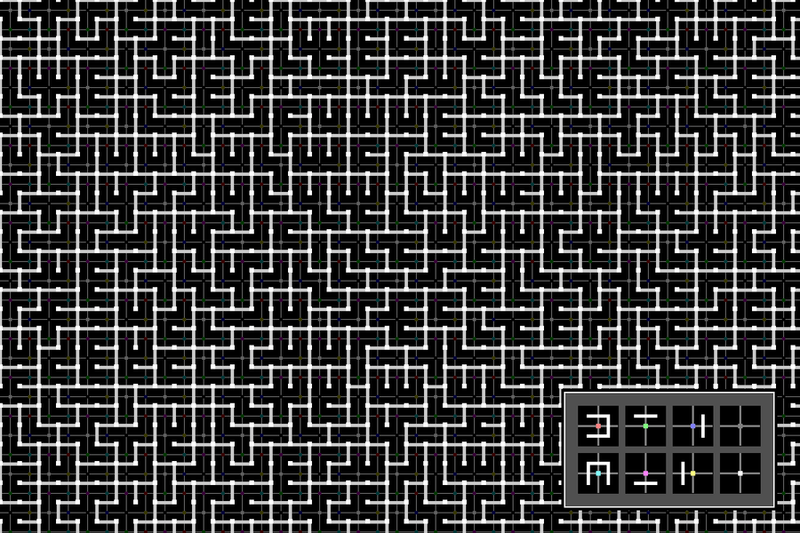 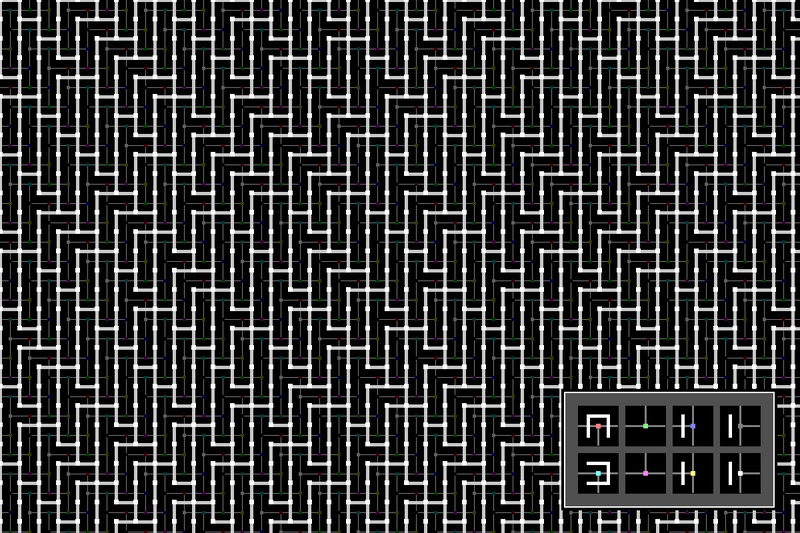 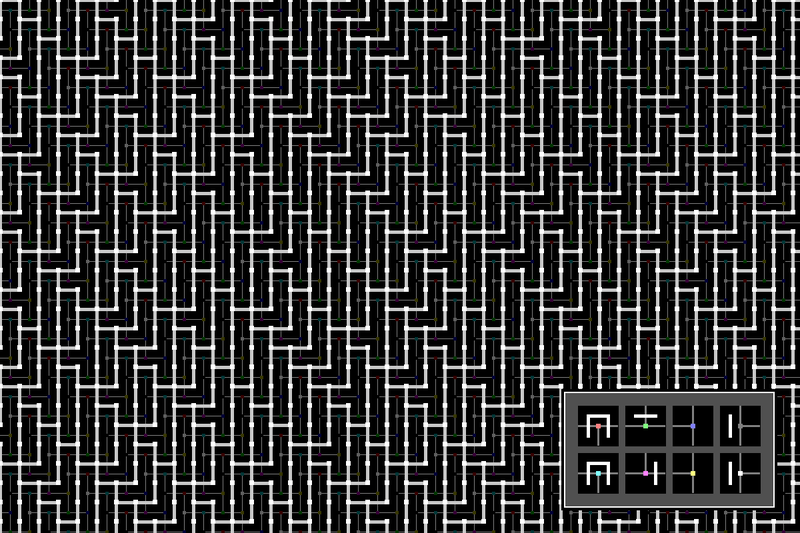 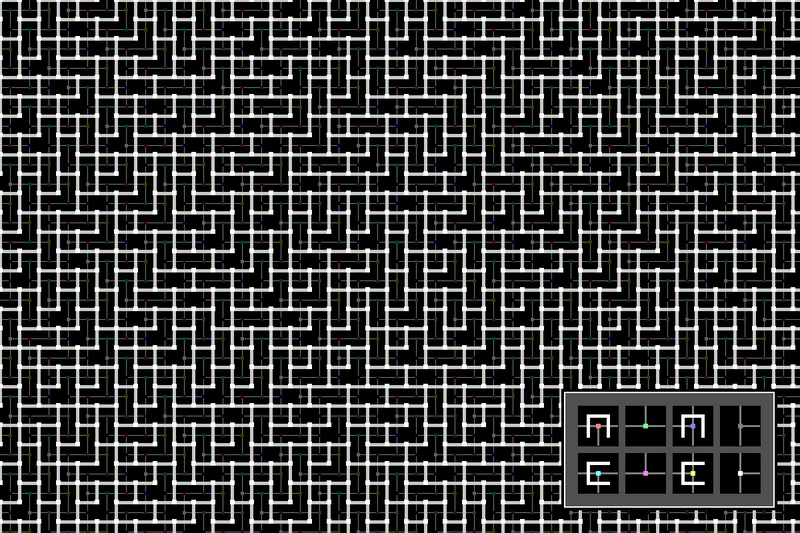 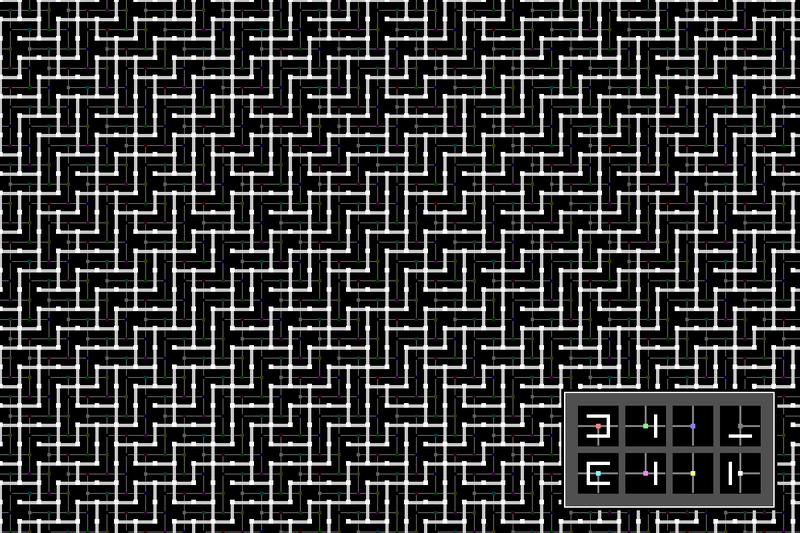 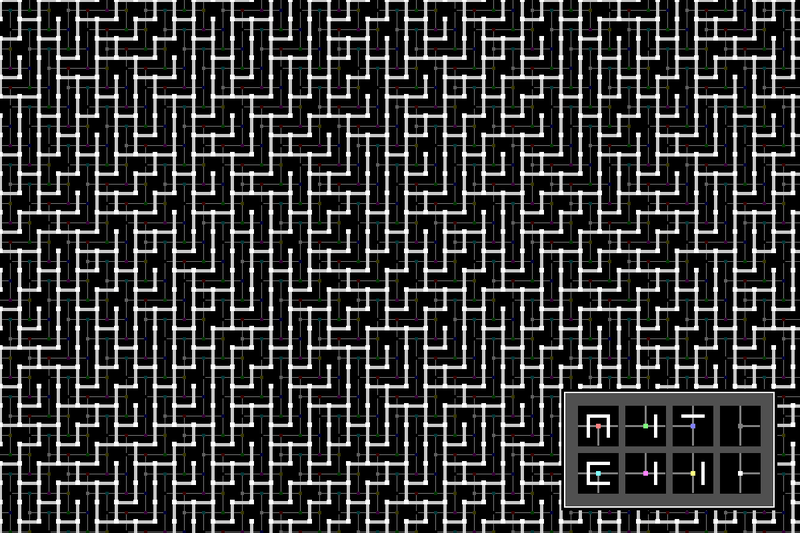 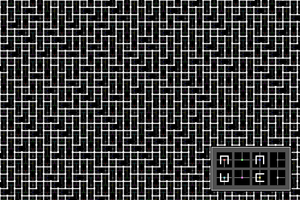 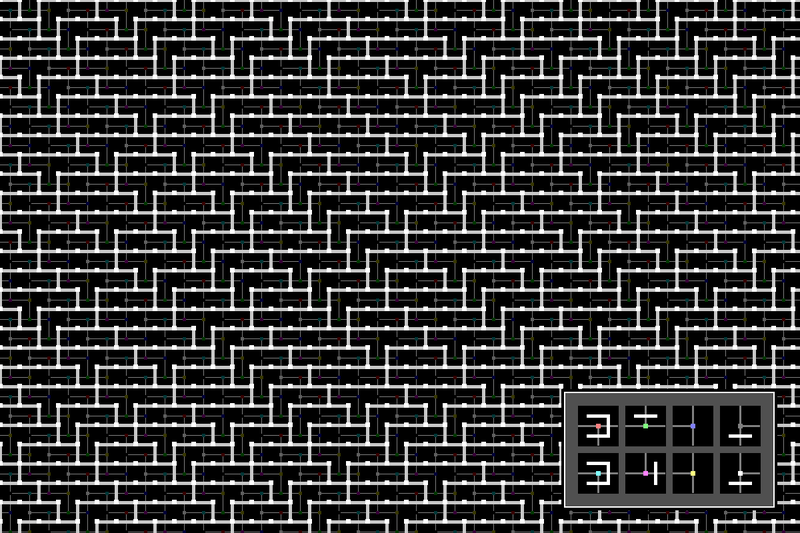 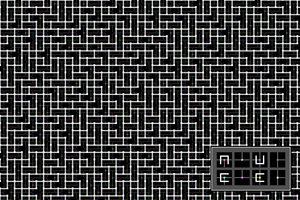 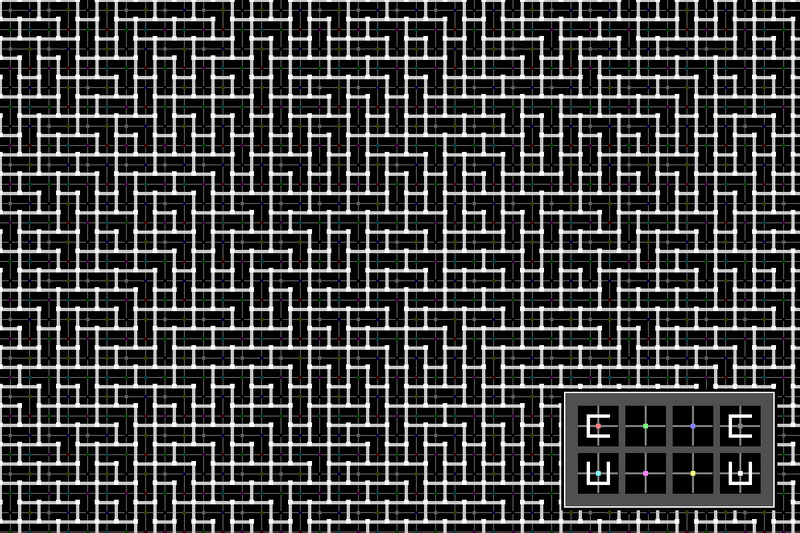 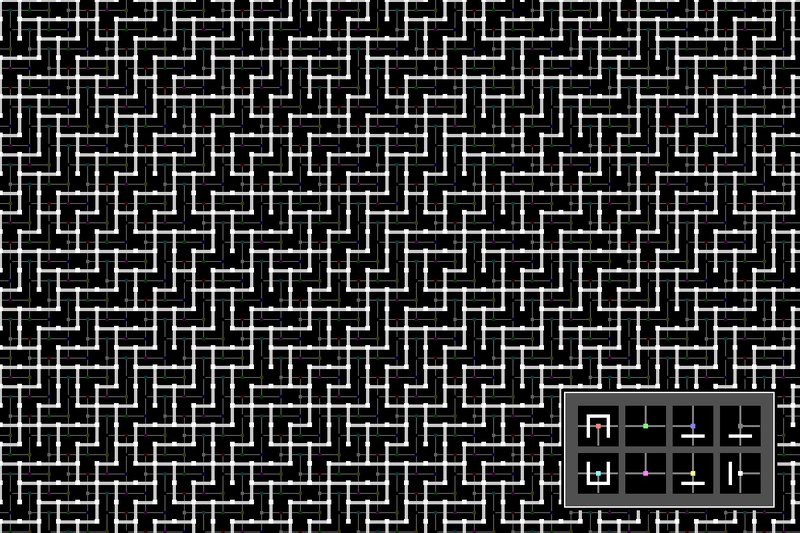 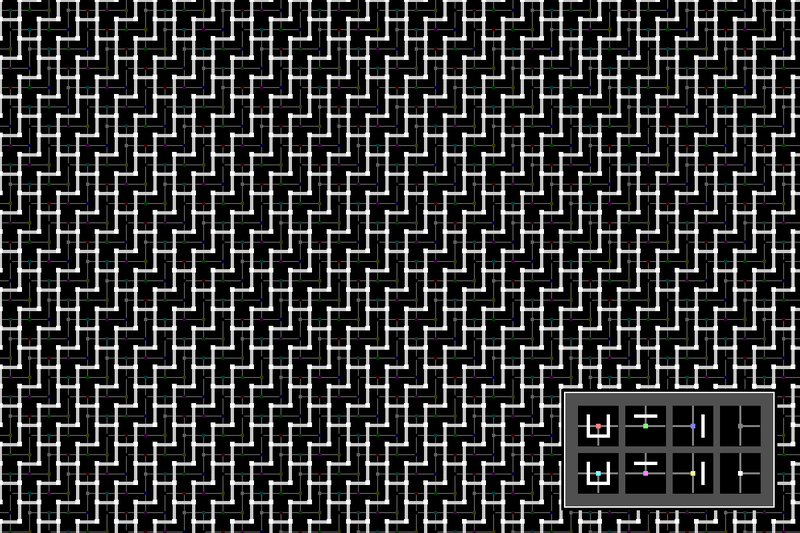 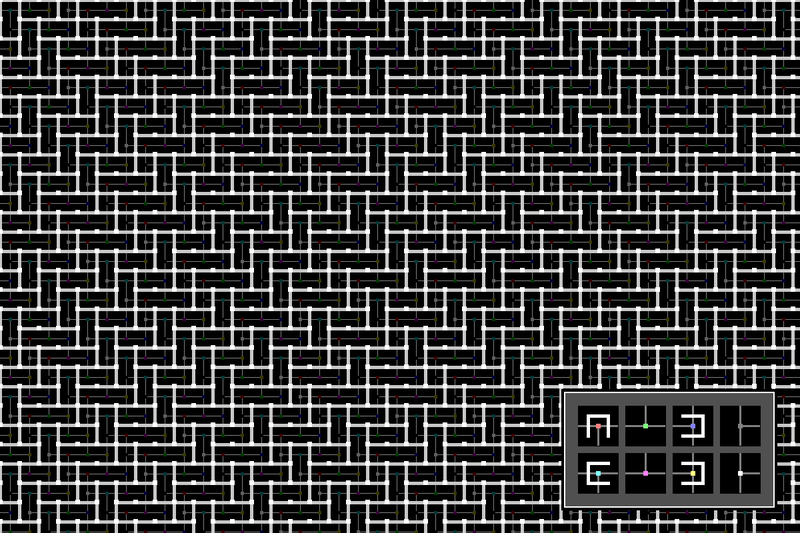 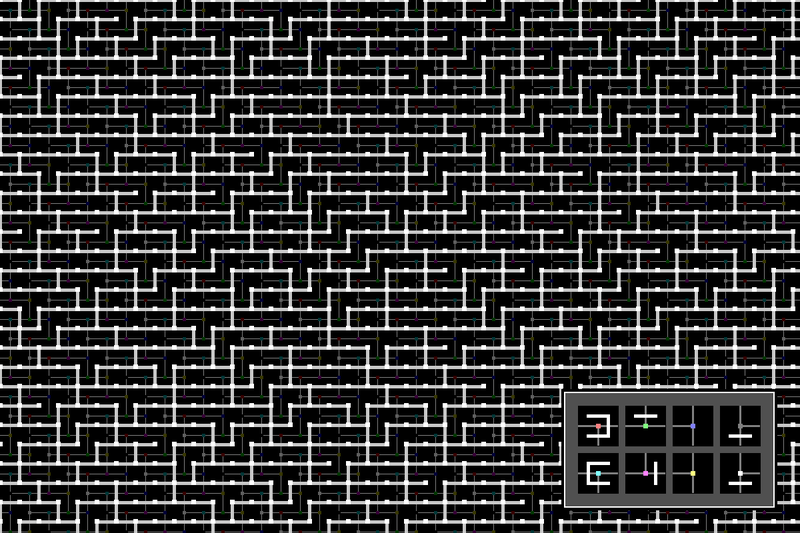 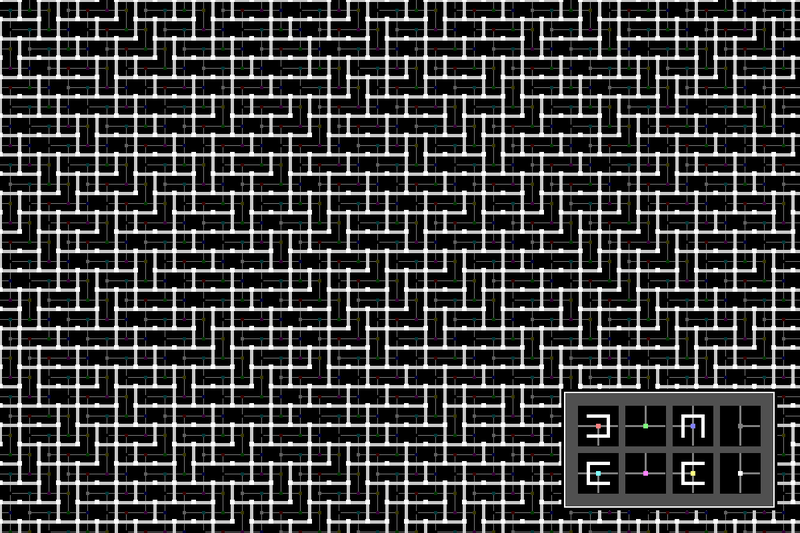 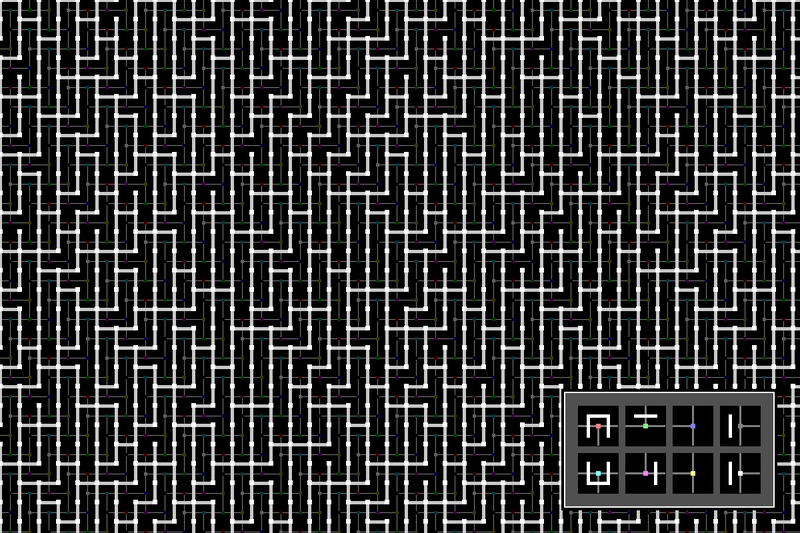 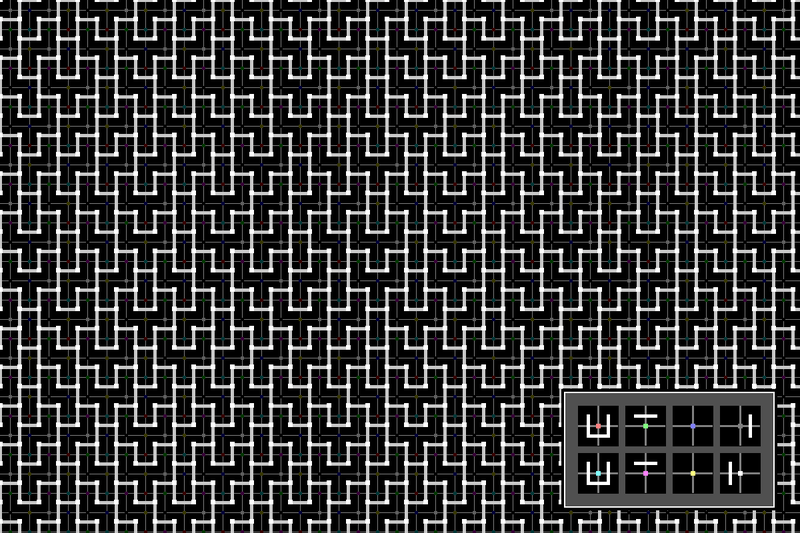 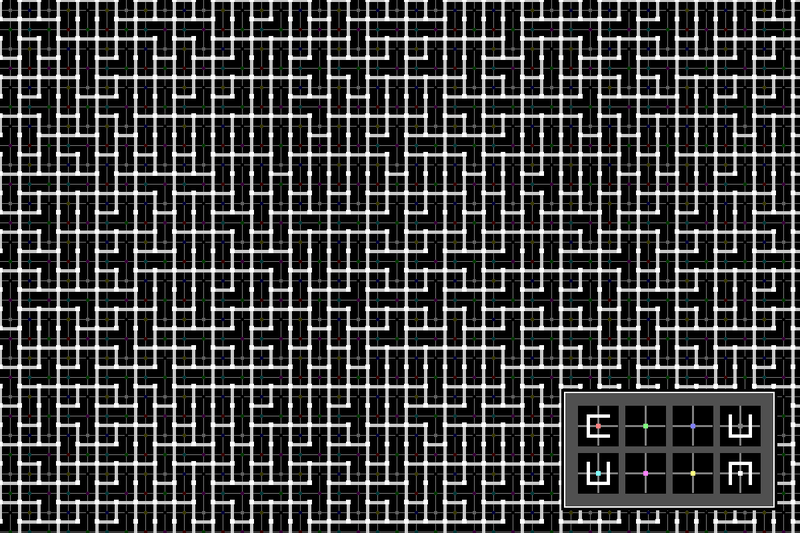 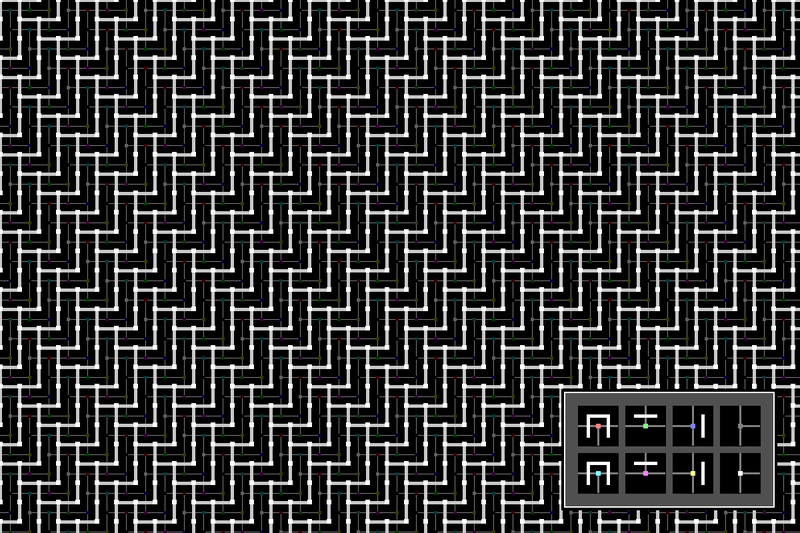 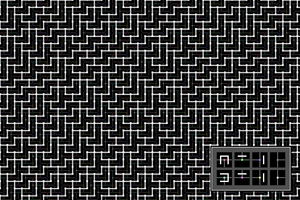 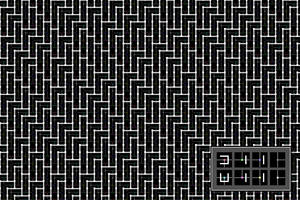 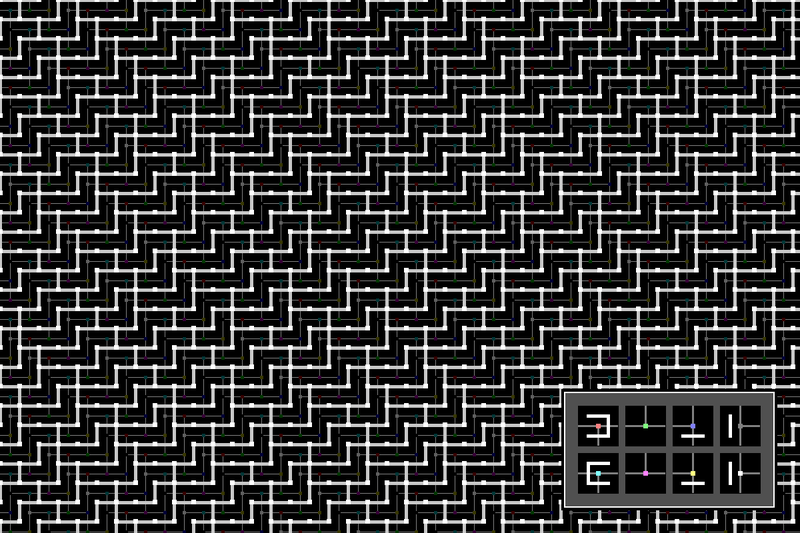 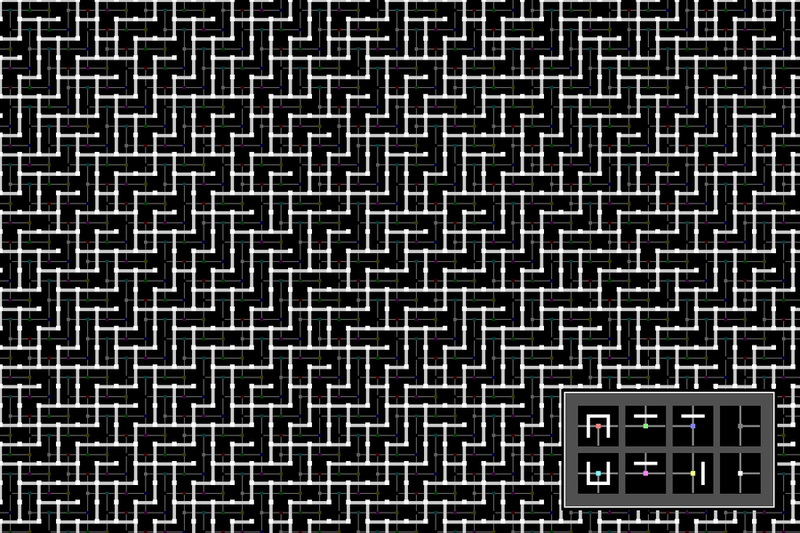 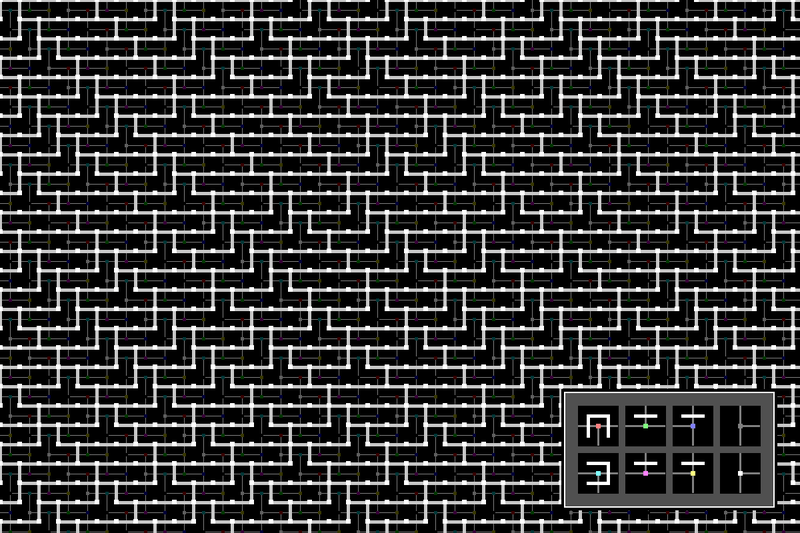 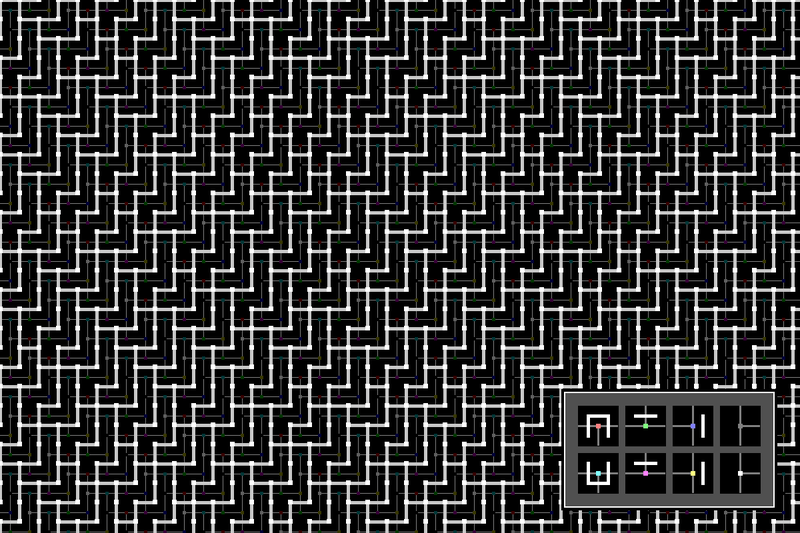 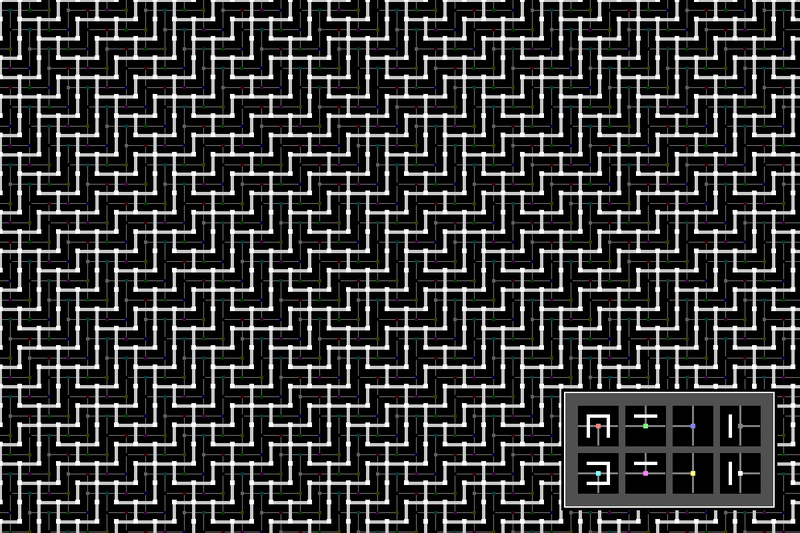 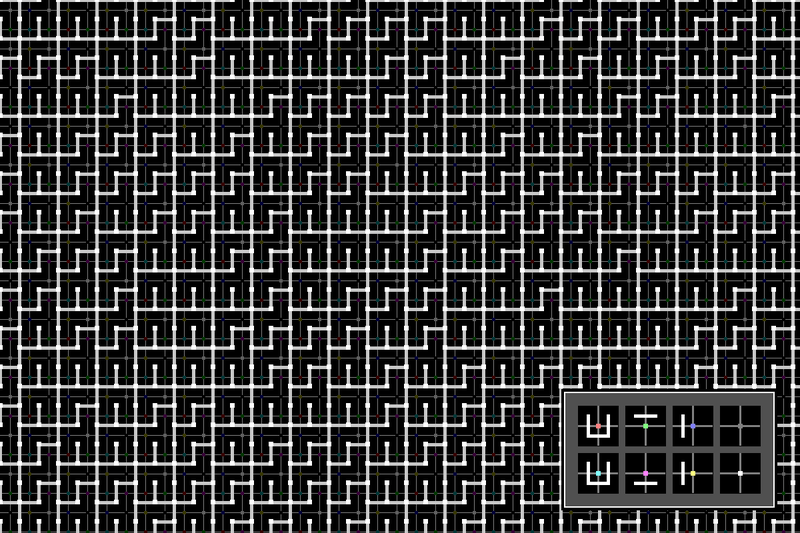 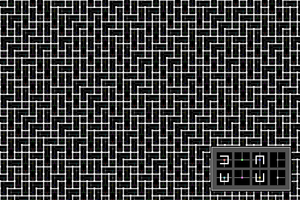 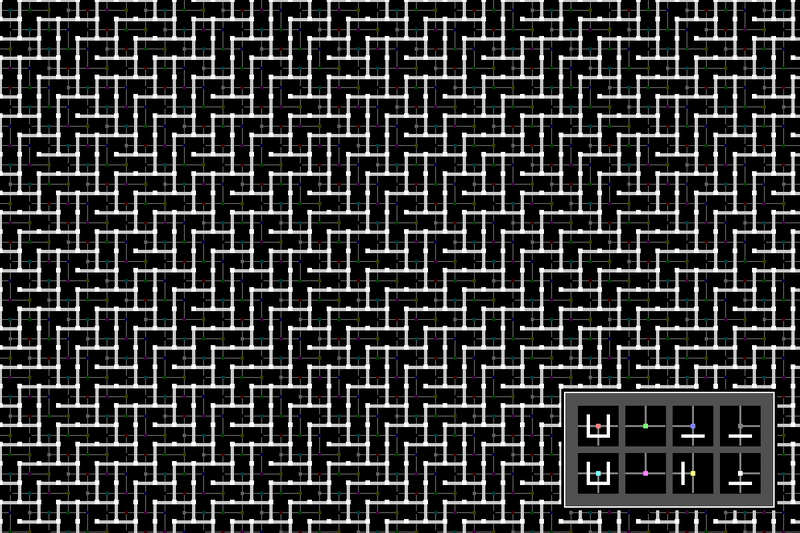 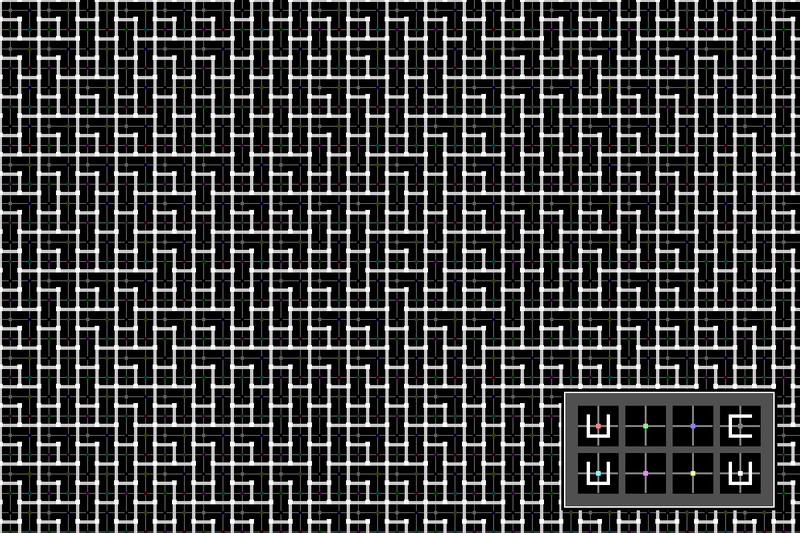 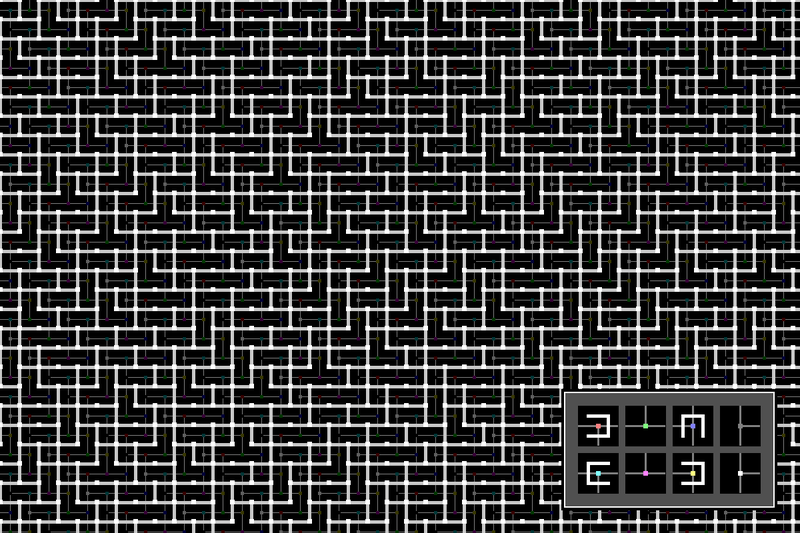 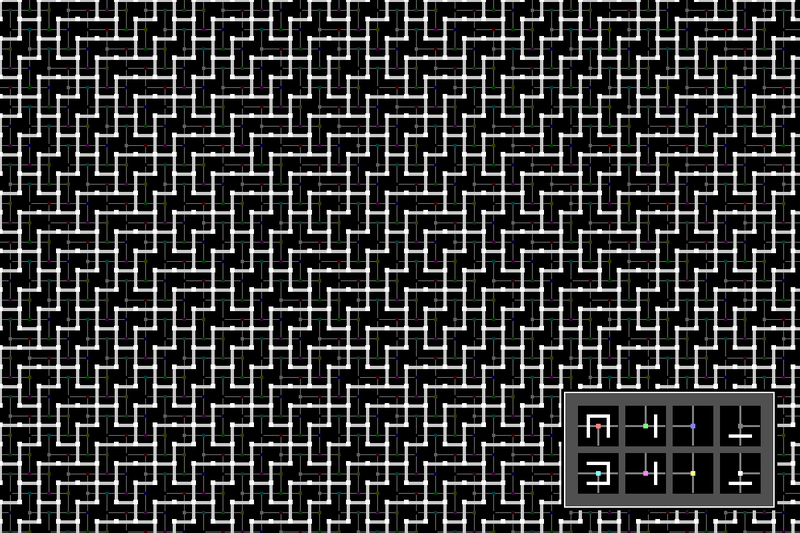 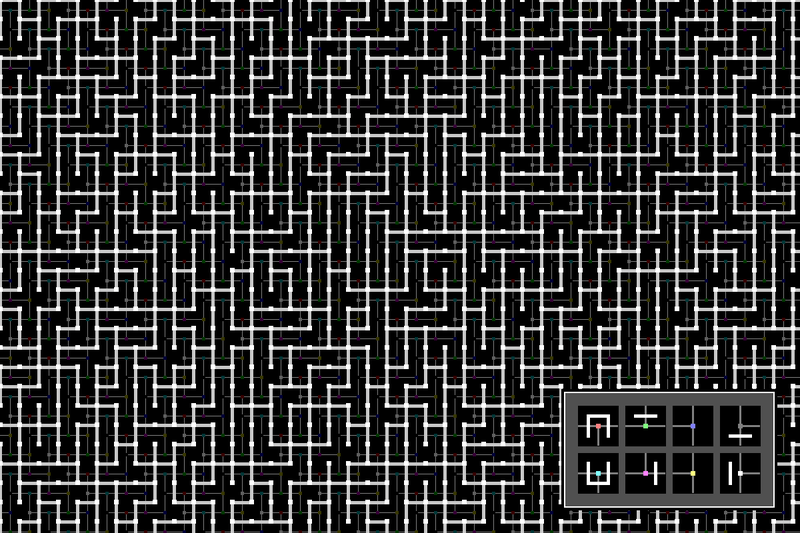 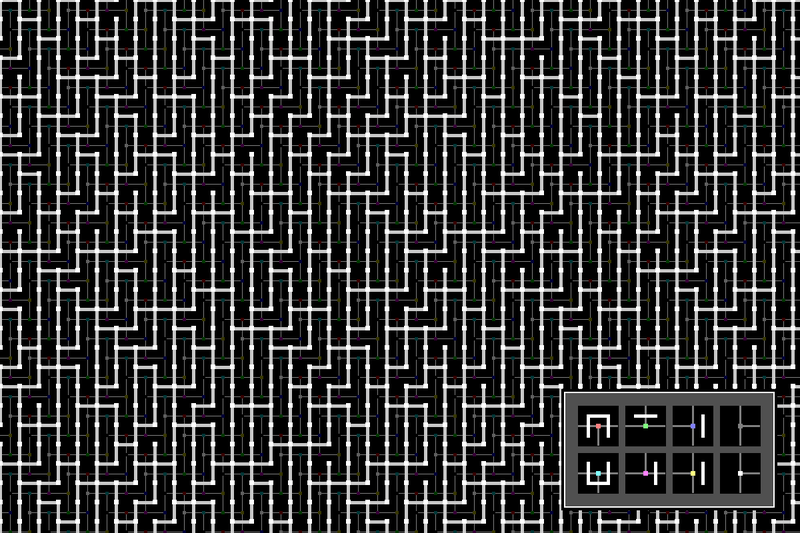 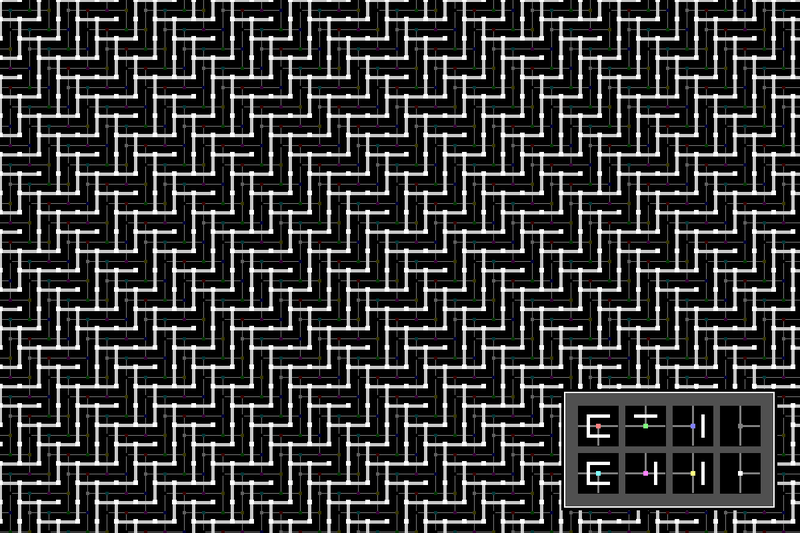 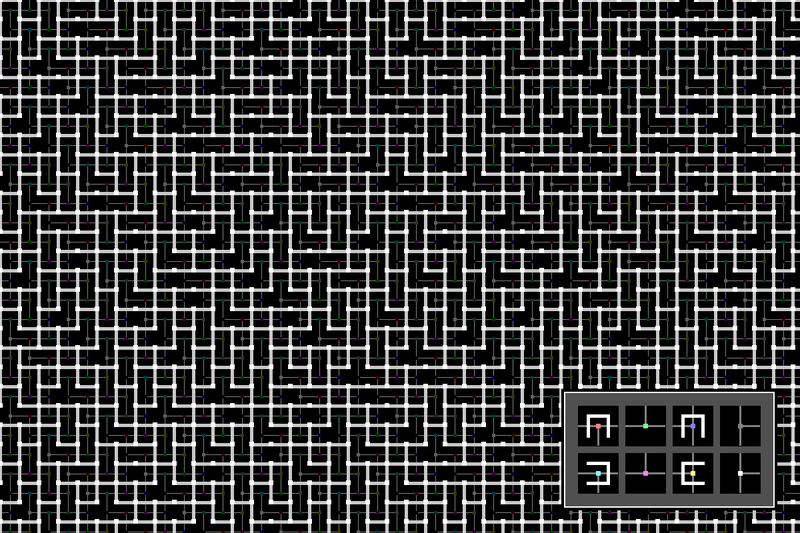 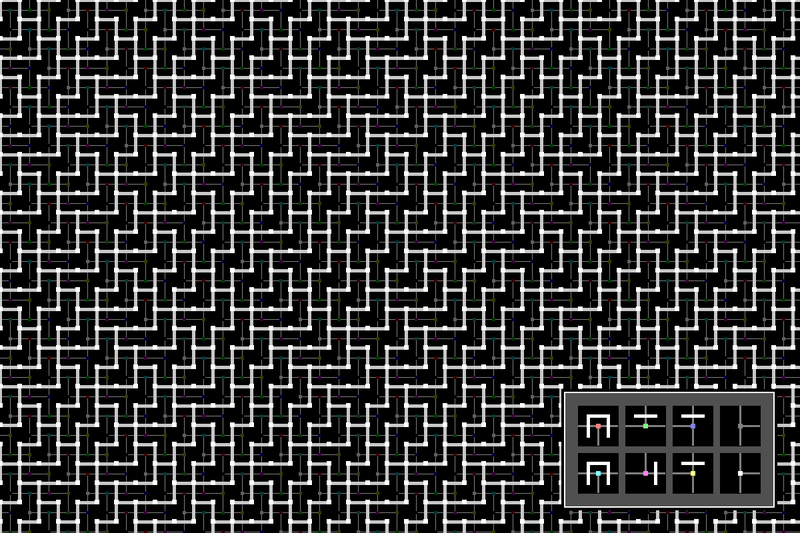 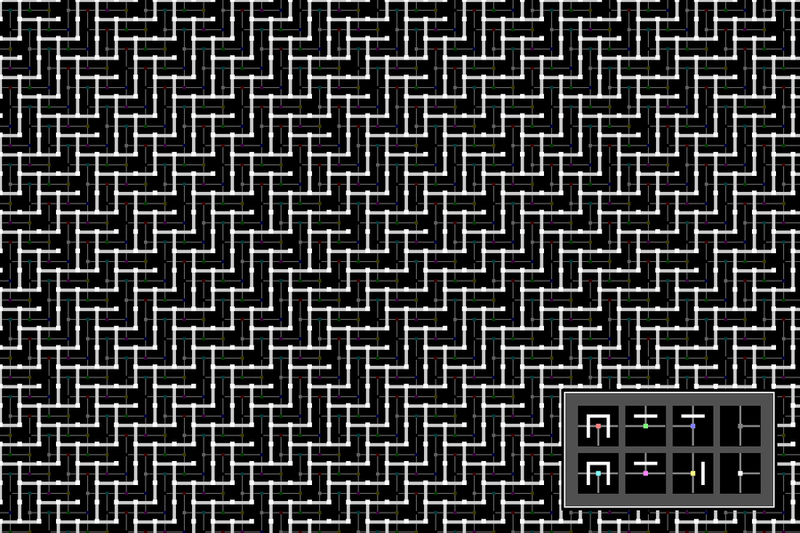 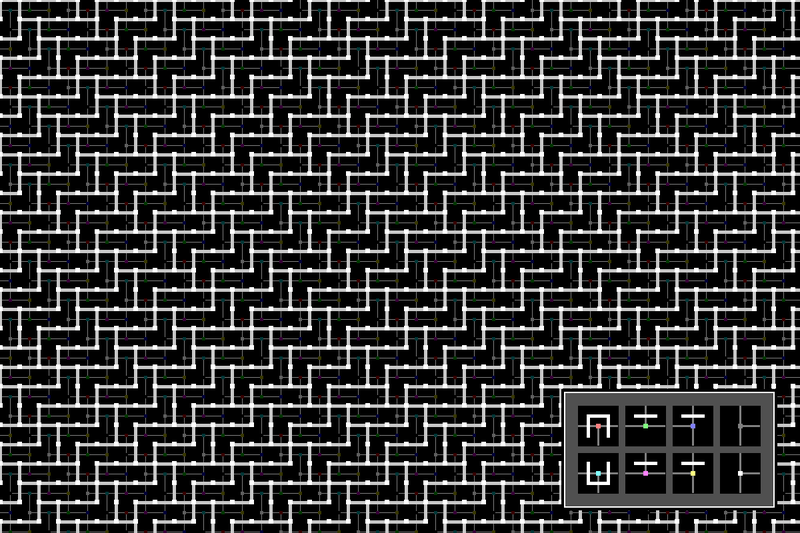 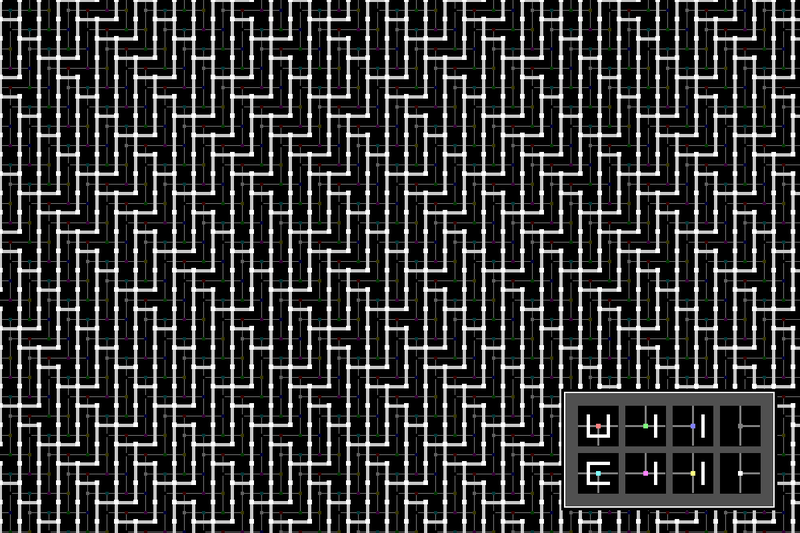 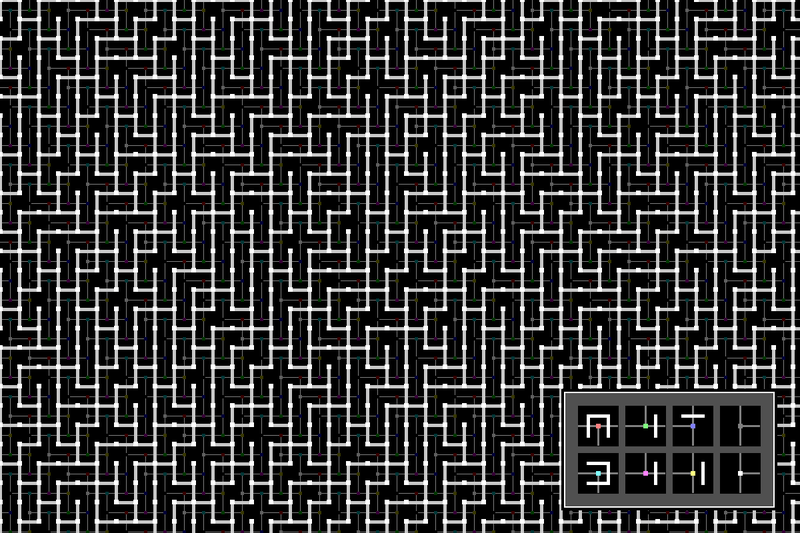 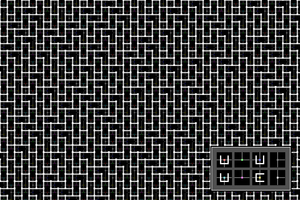 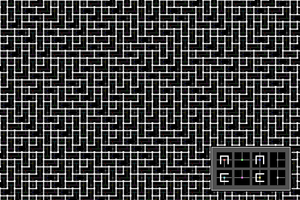 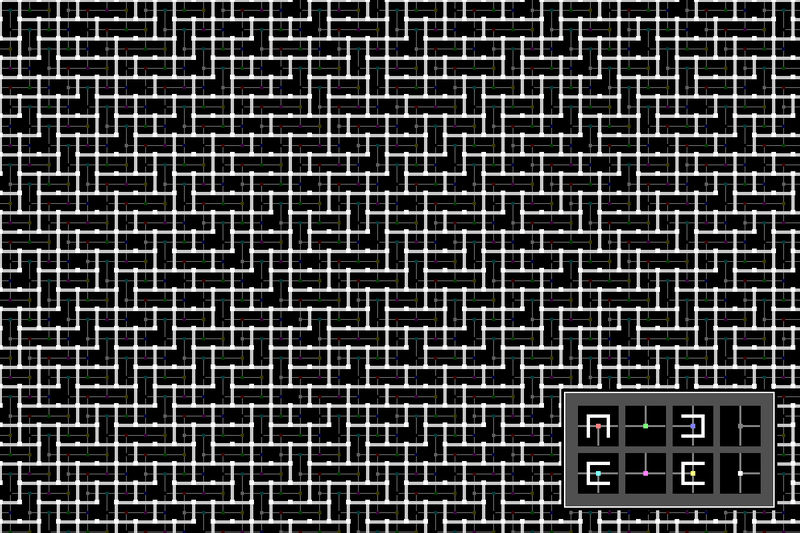 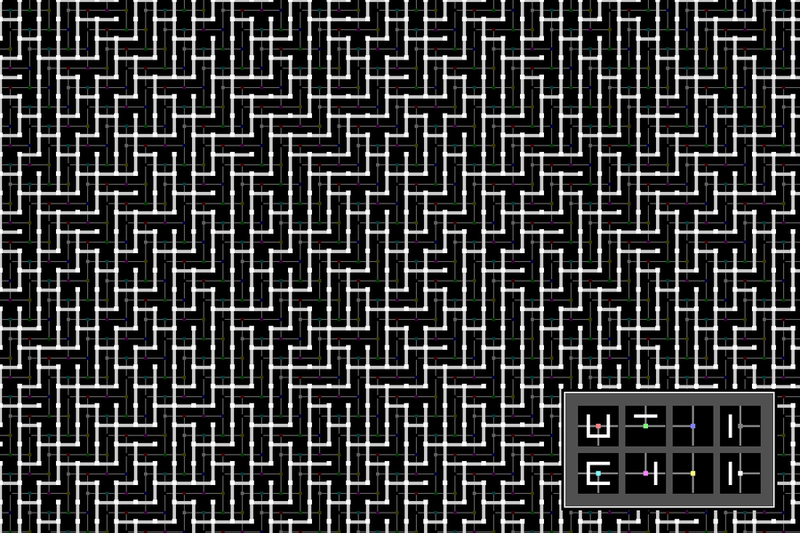 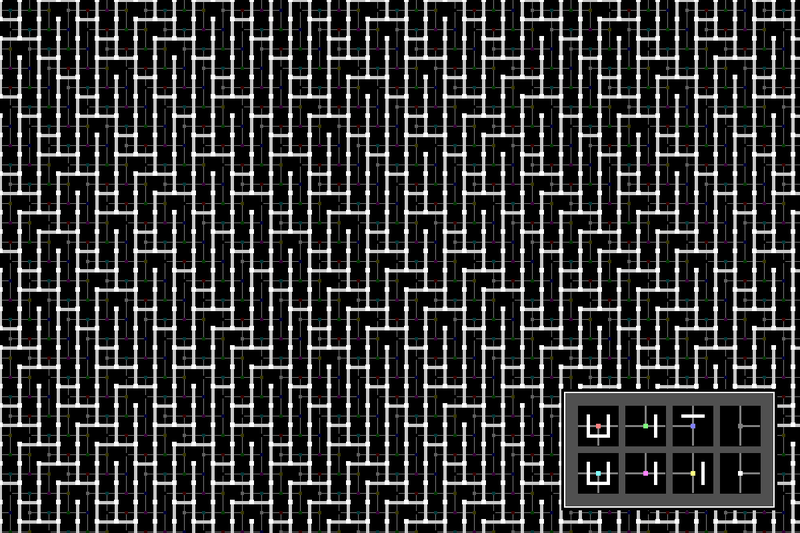 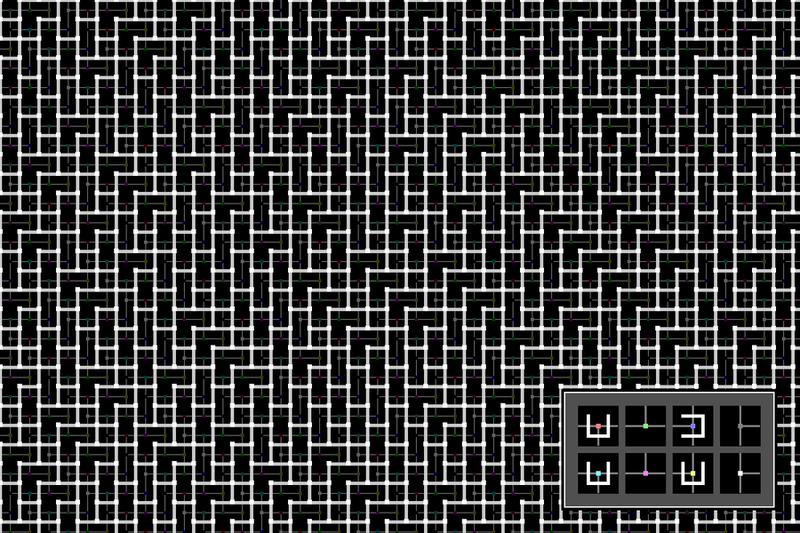 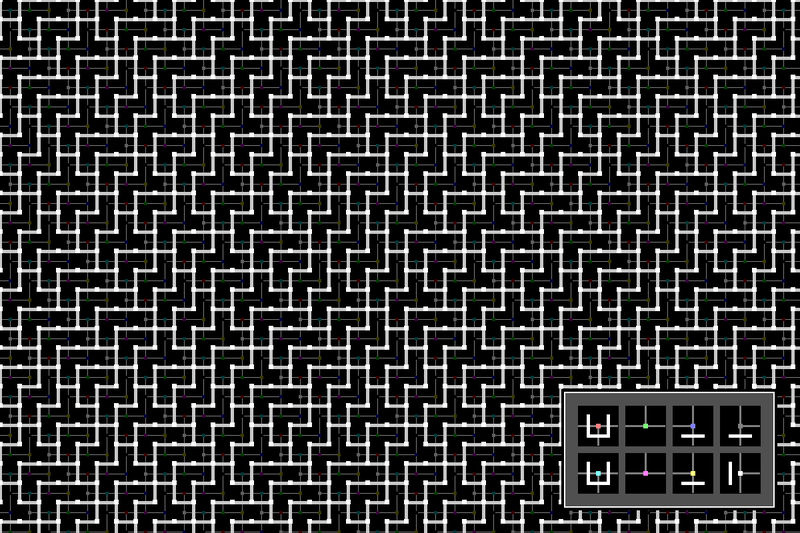 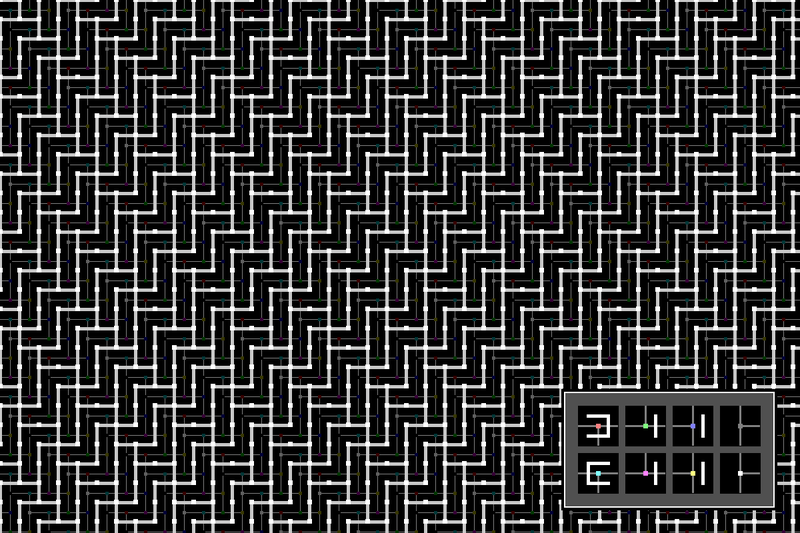 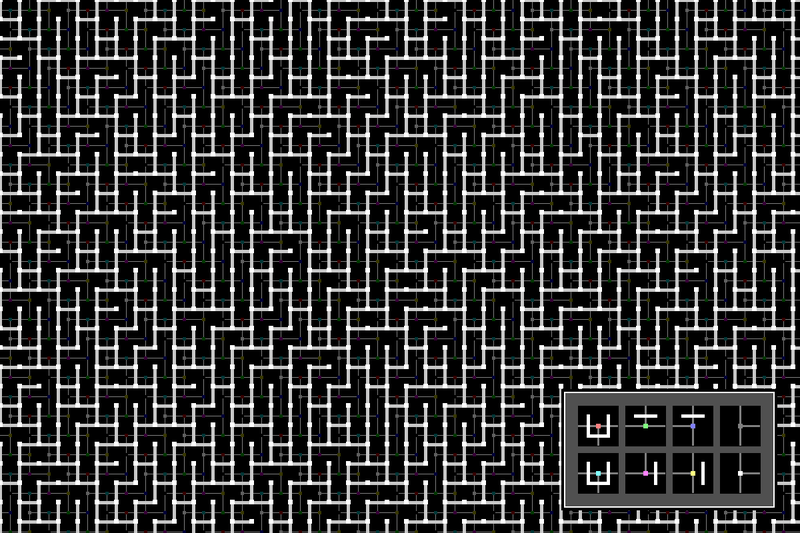 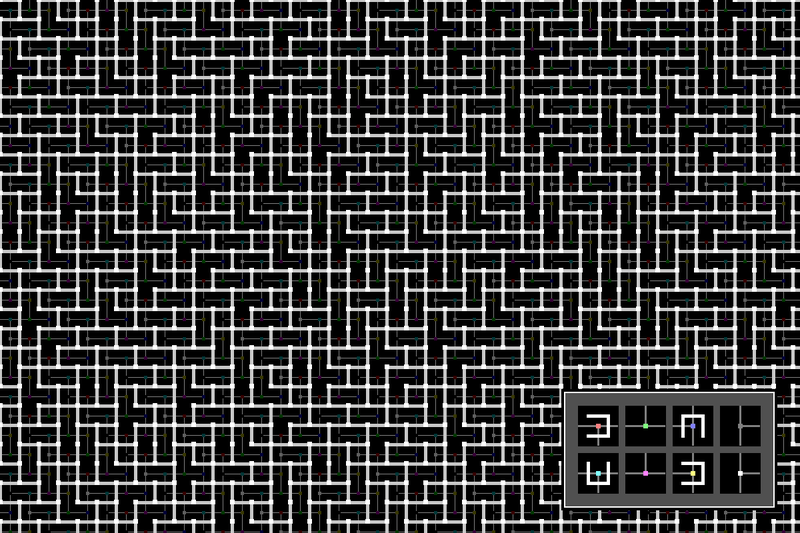 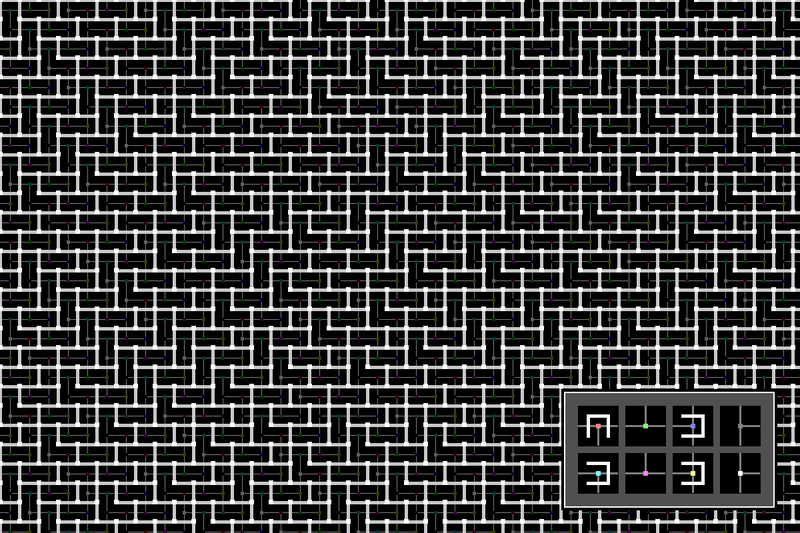 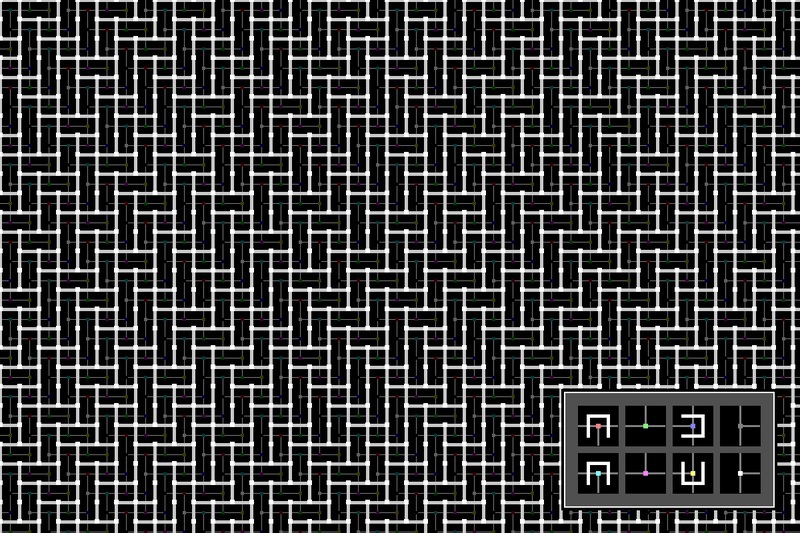 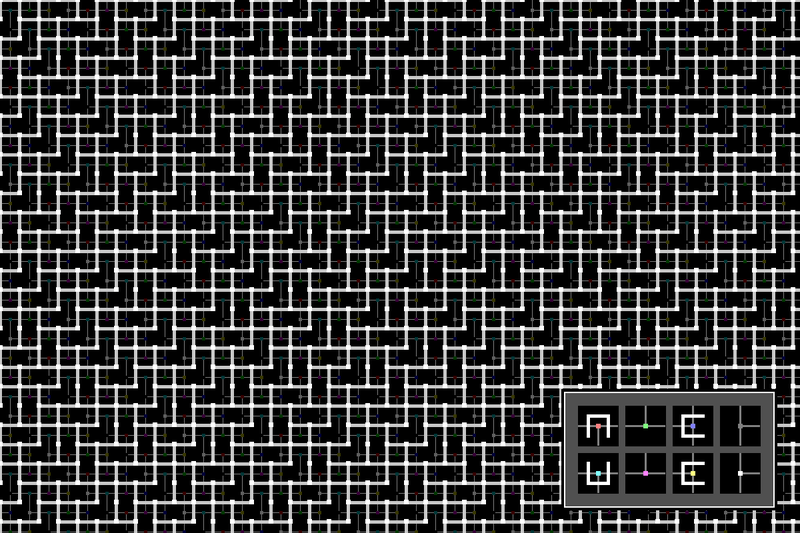 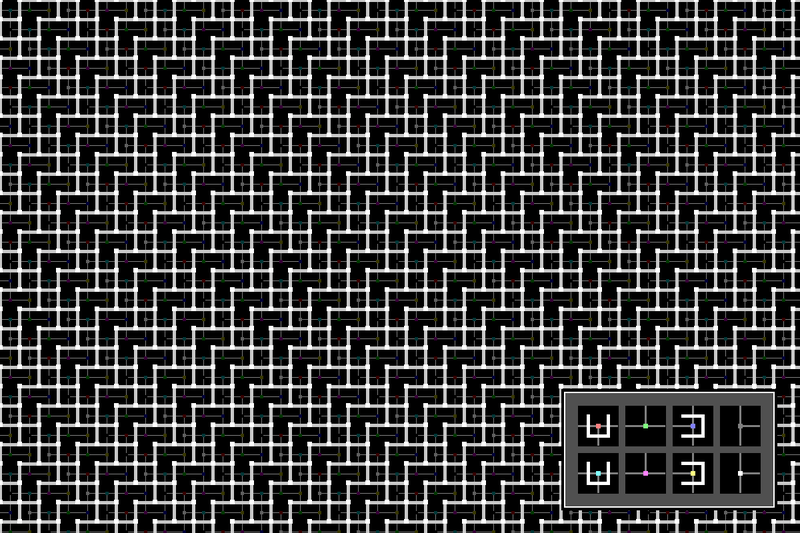 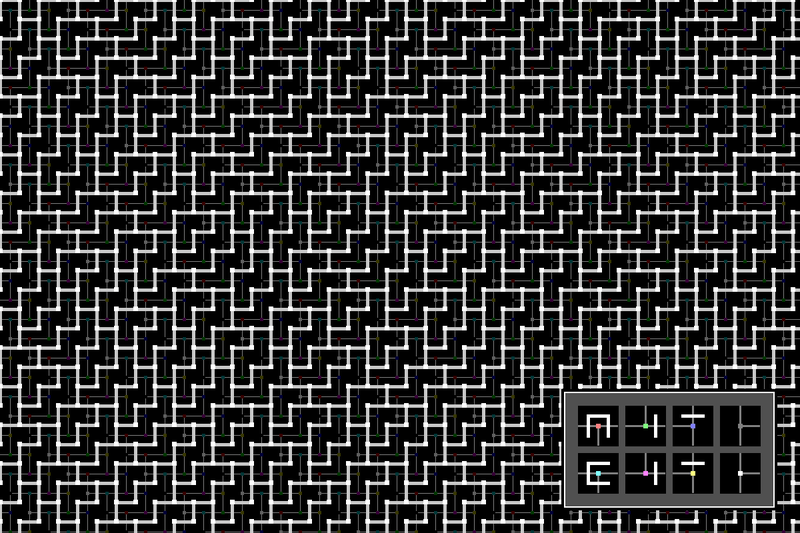 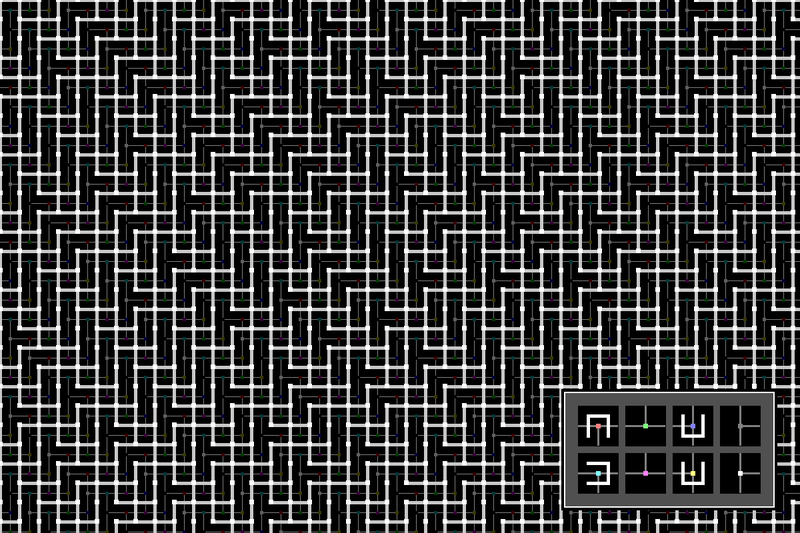 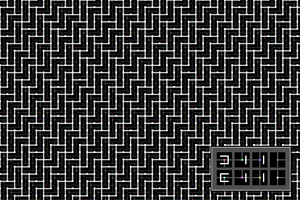 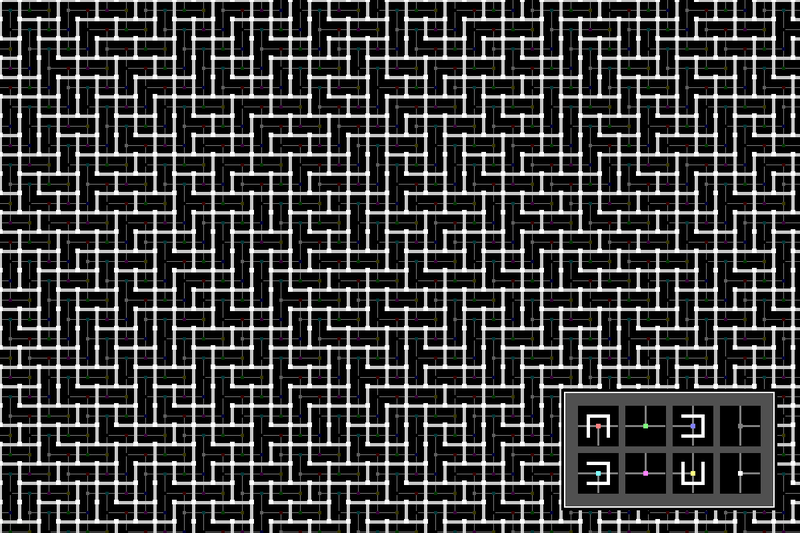 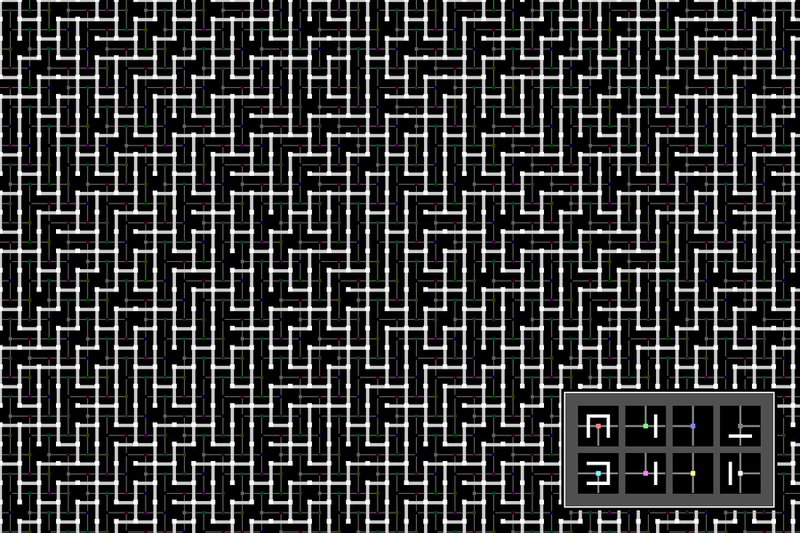 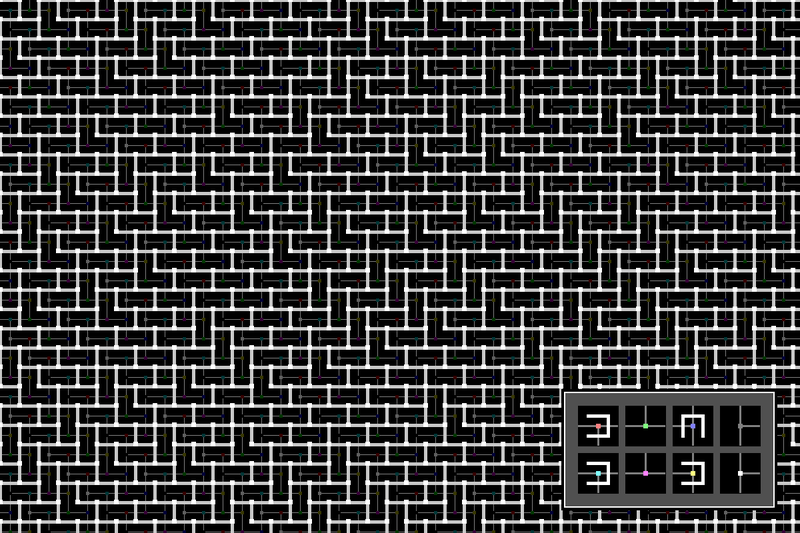 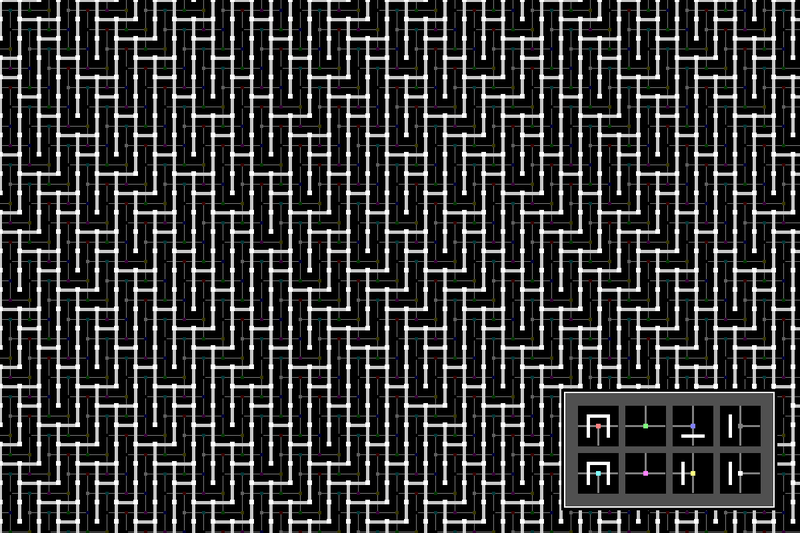 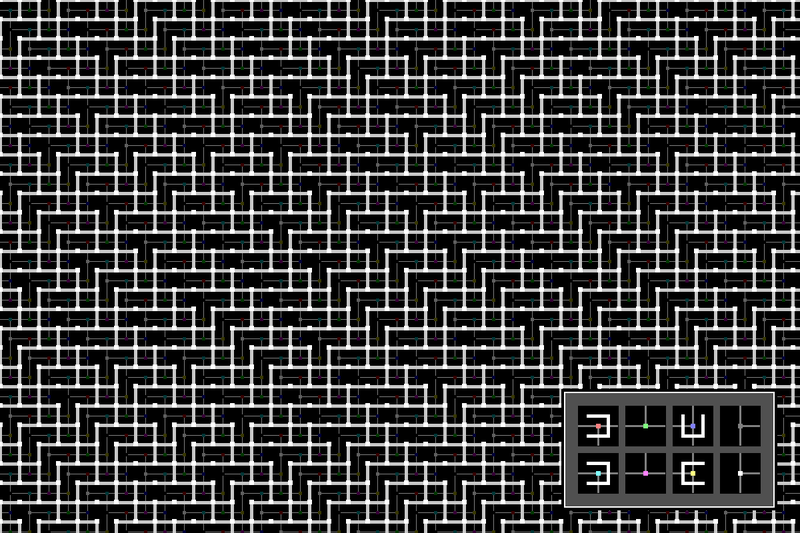 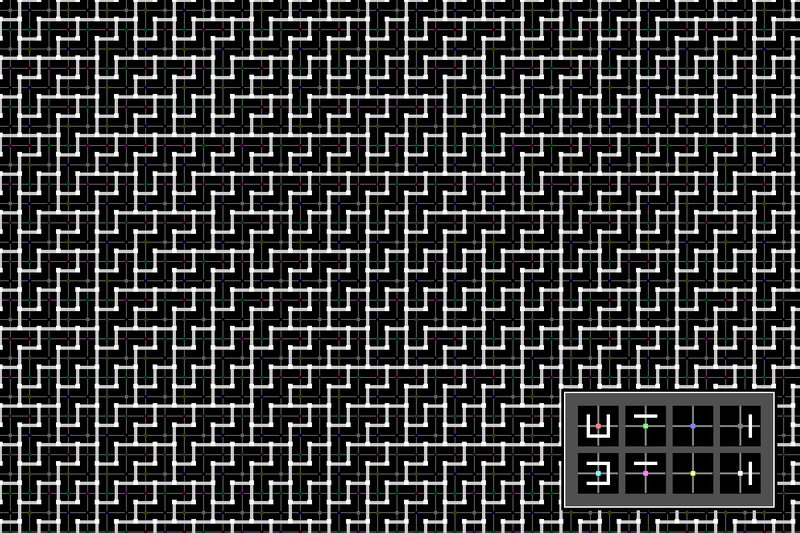 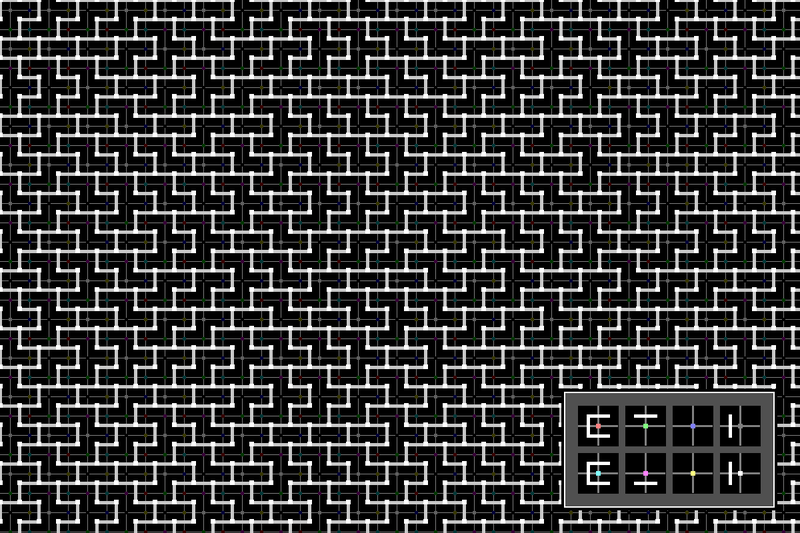 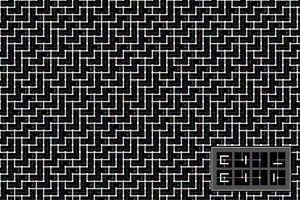 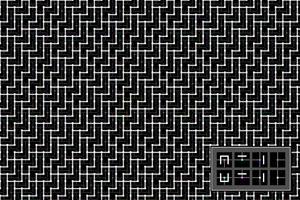 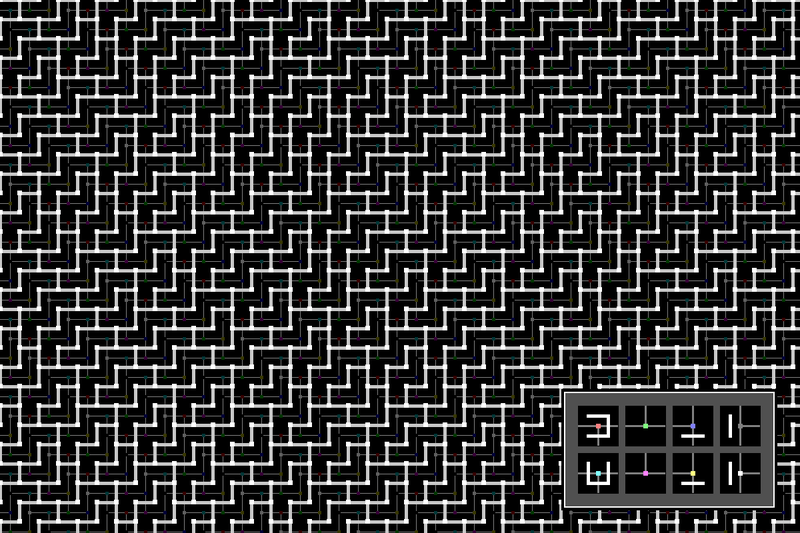 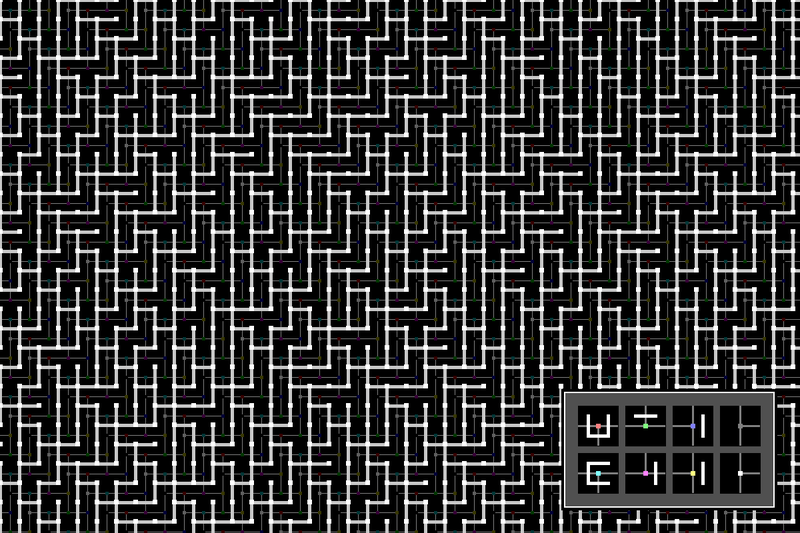 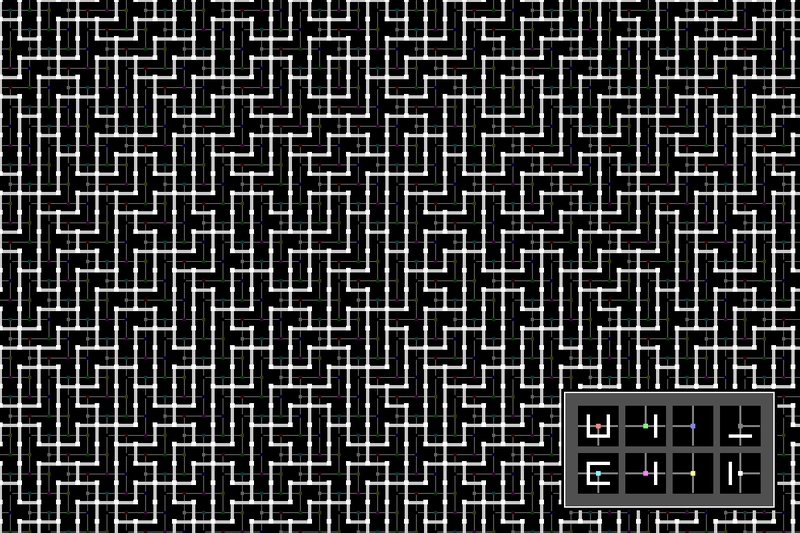 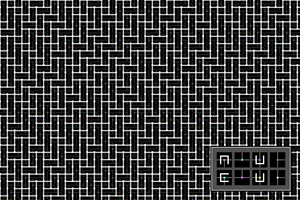 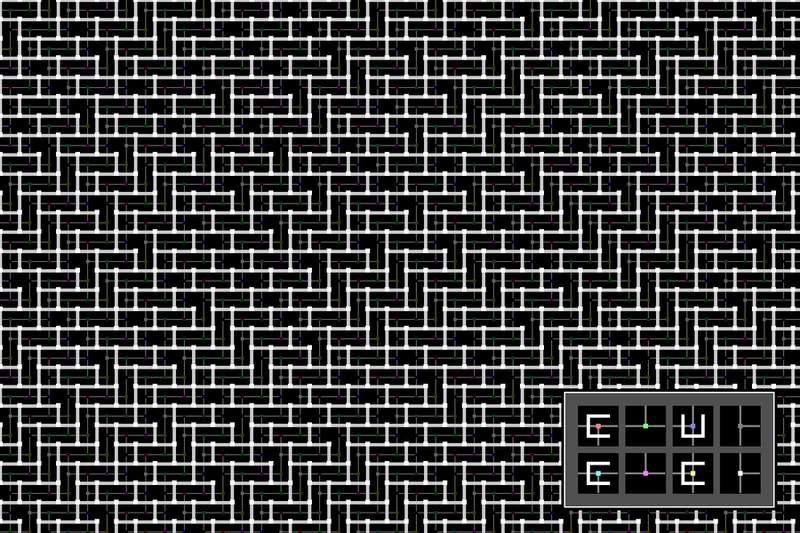 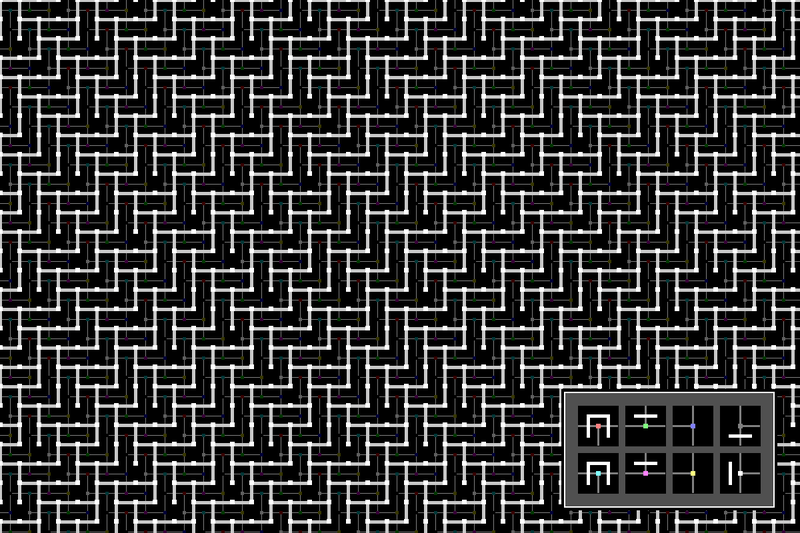 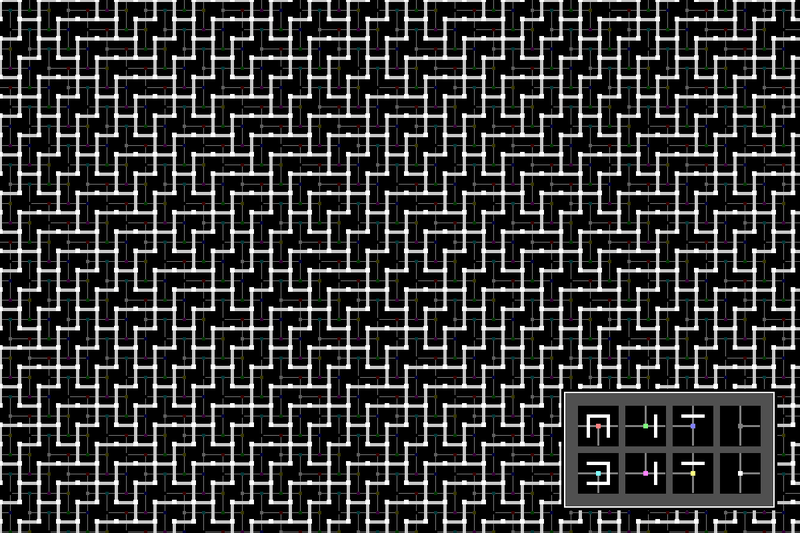 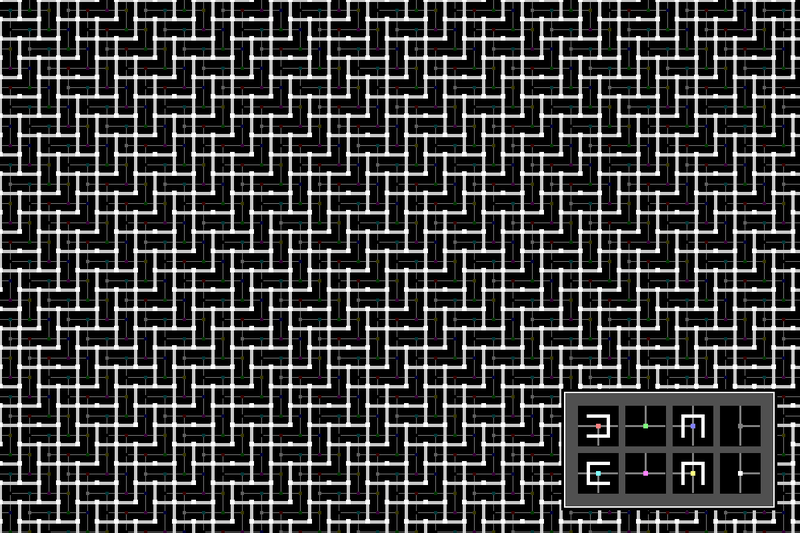 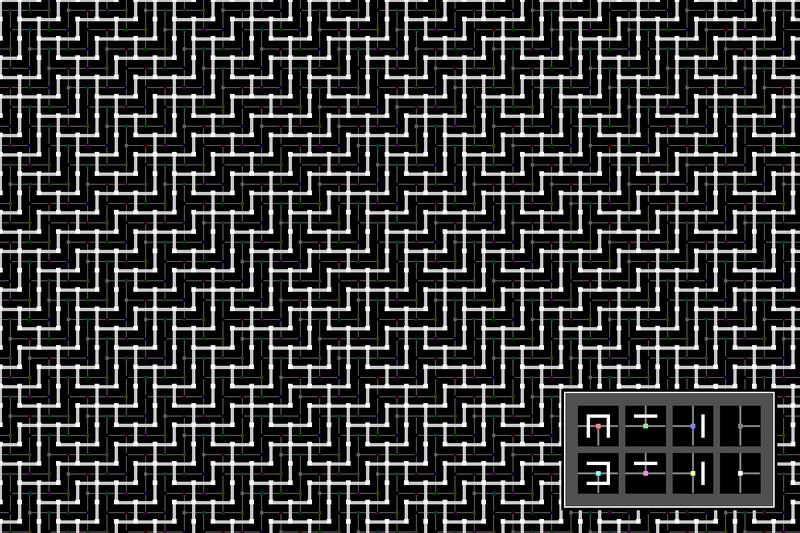 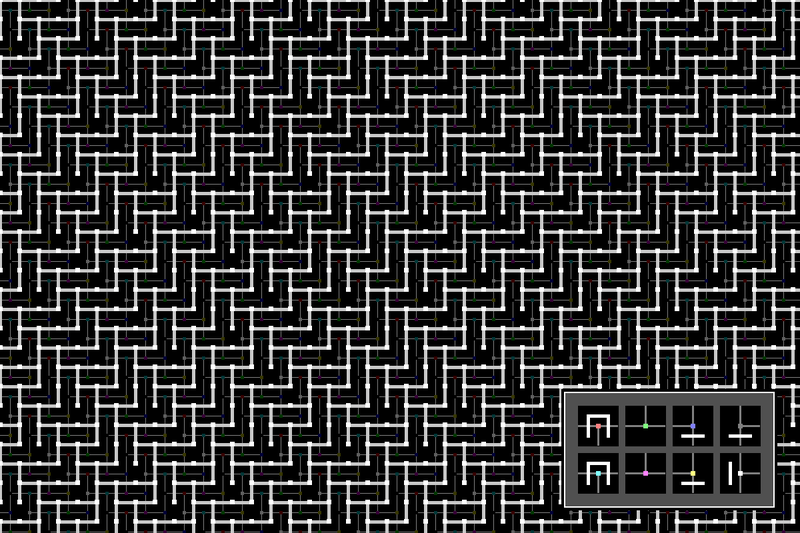 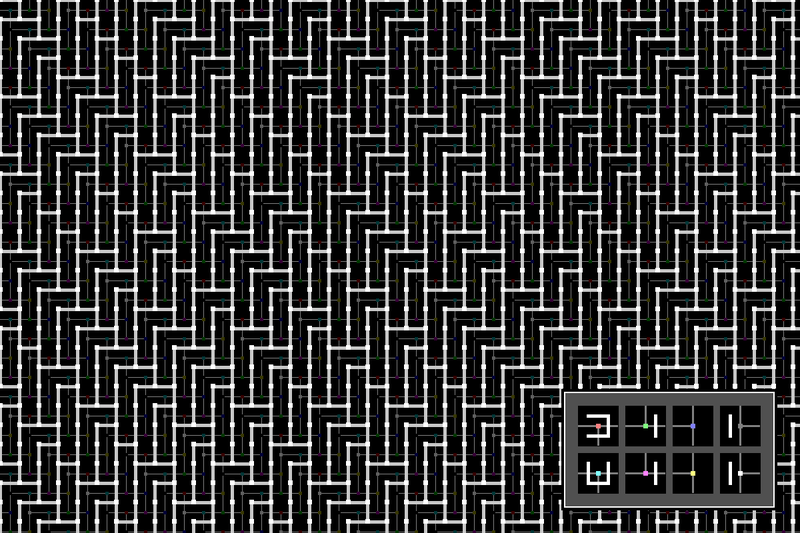 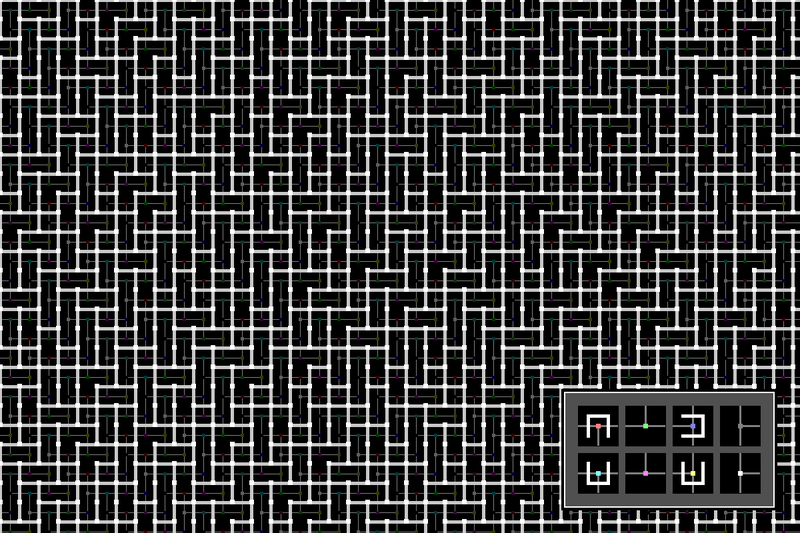 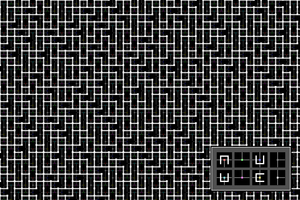 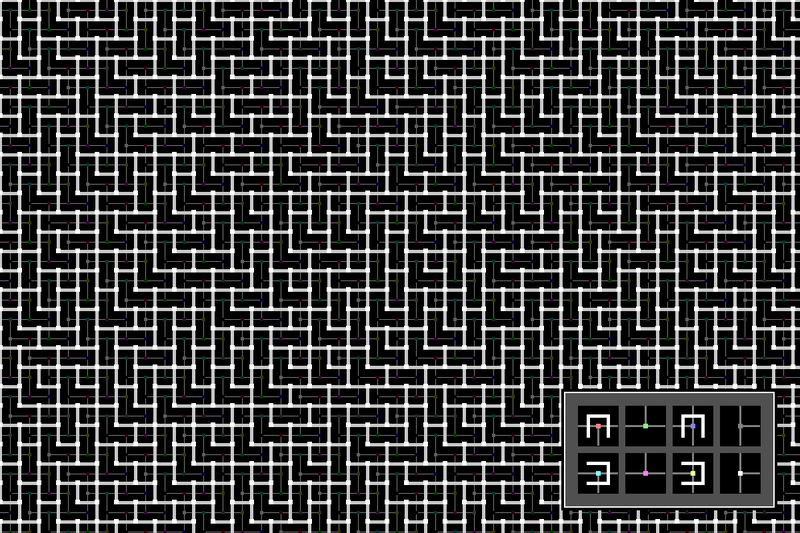 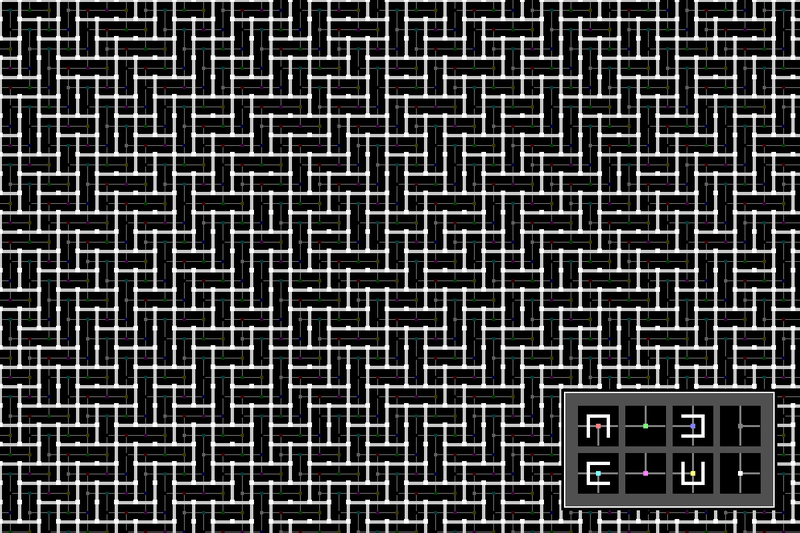 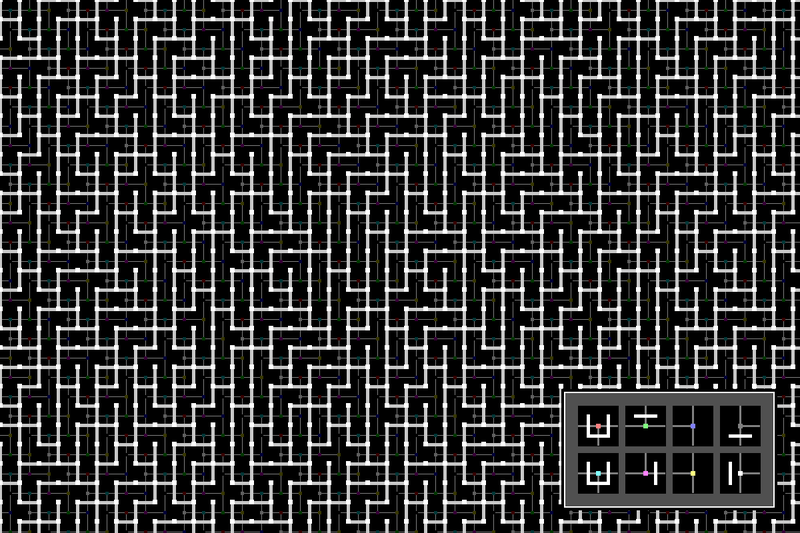 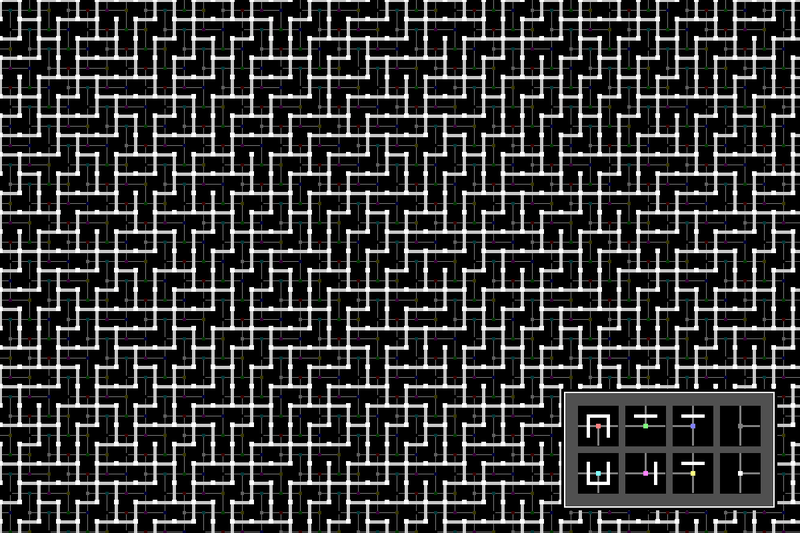 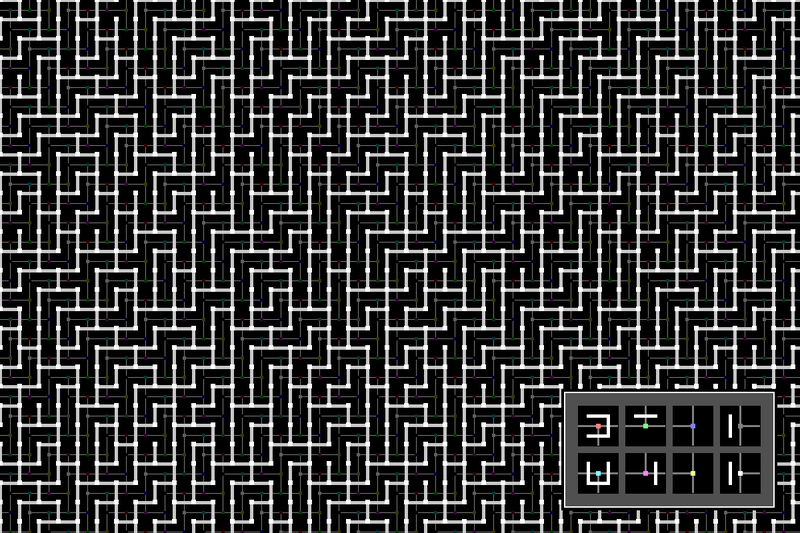 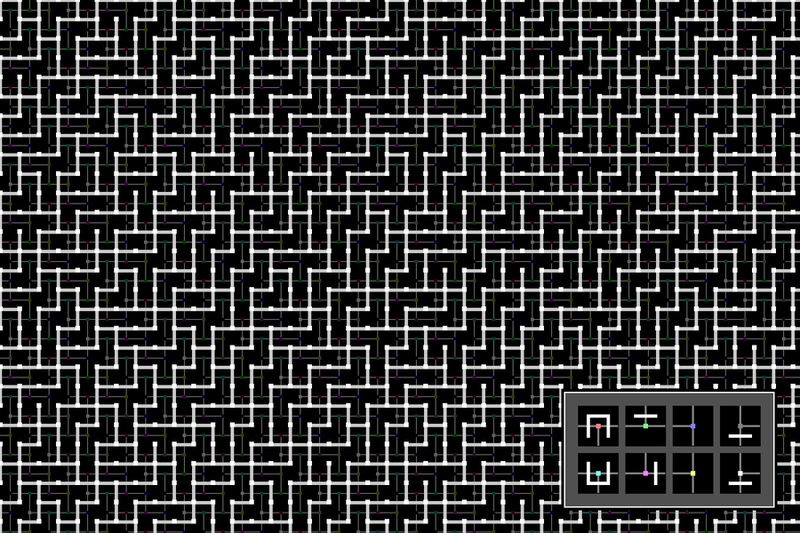 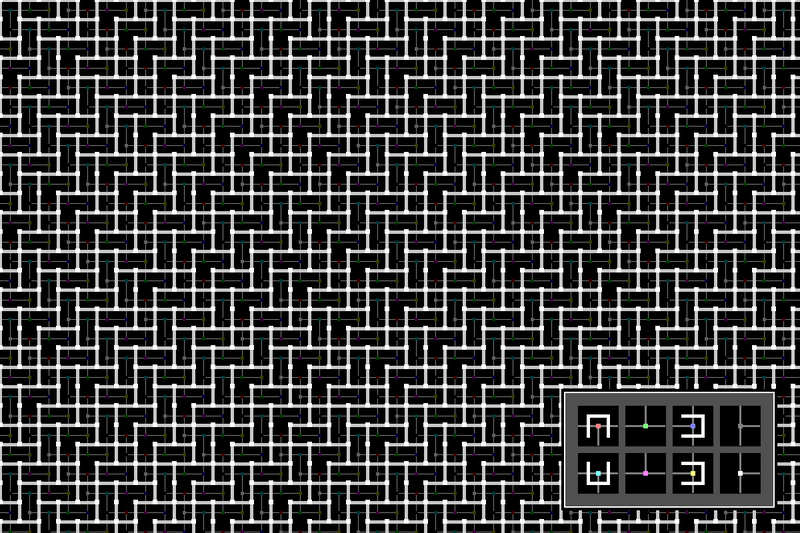 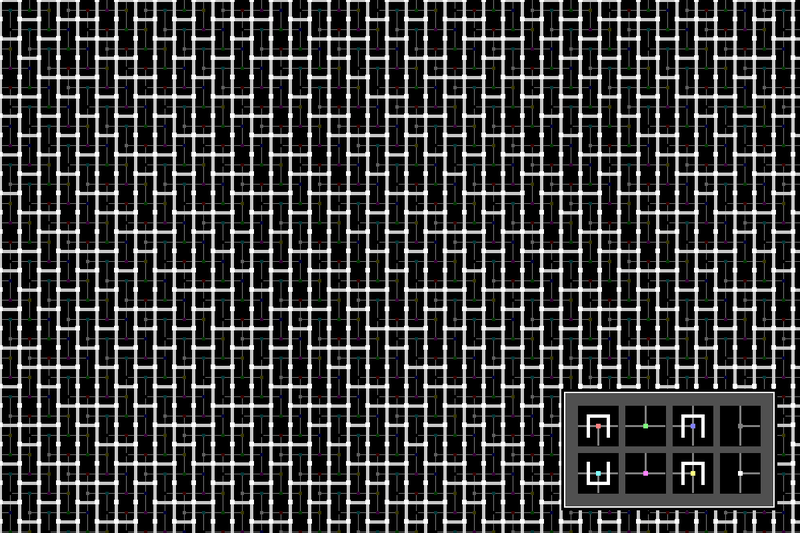 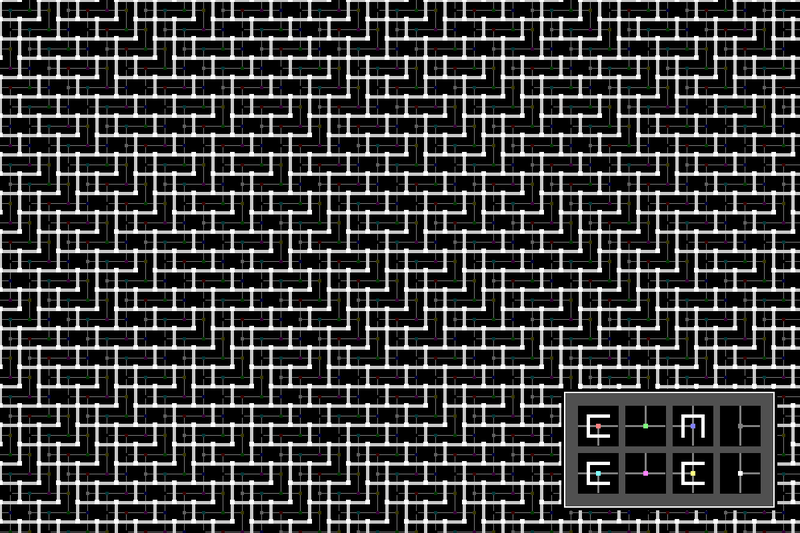 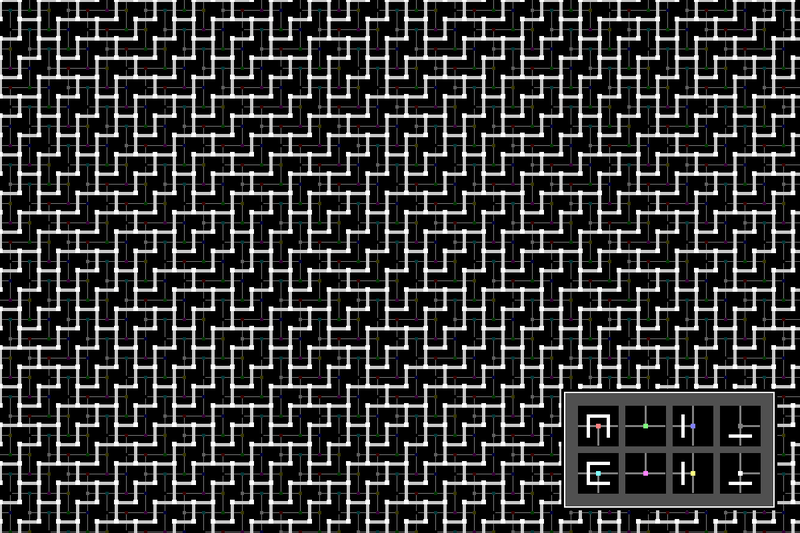 The following variation is the one used in the first herringbone Wang tile article, as connectivity is never forced through the middle of the 2x1 tiles, allowing every tile to choose for itself, independent of all Wang constraints, whether to add additional connectivity. 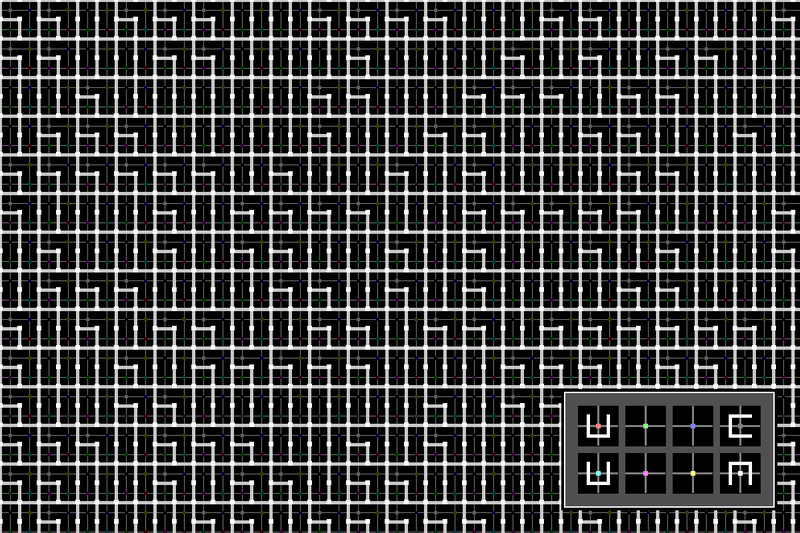 All tetris pieces can be tiled in some simple periodic pattern on the plane. 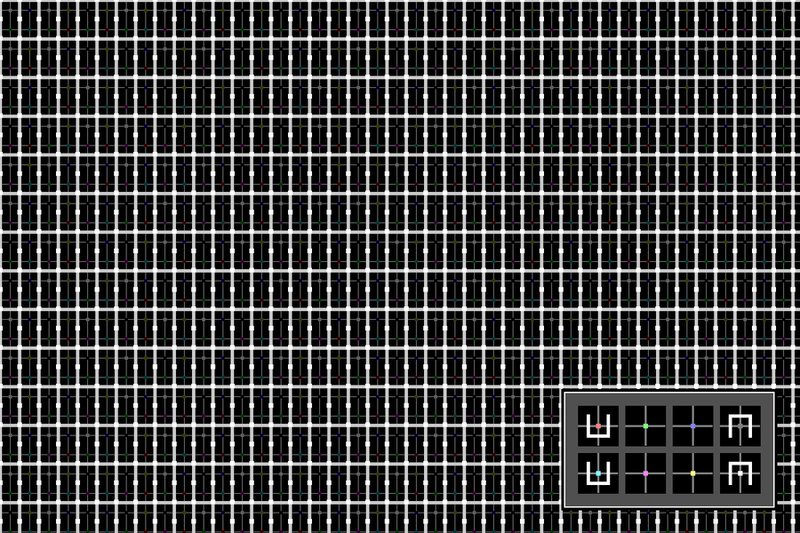 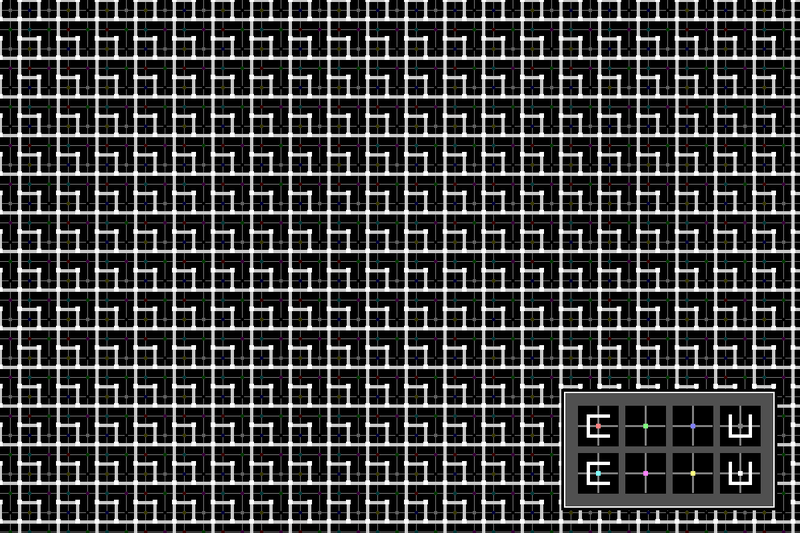 It turns out that for every tetris piece except the "T", there is some corner color constraint set that will produce connectivity shapes consisting of that tetrris piece tiled on the plane. Of course they all have the same trivial stats shown above. The 2x2 Tetris piece appears in connectivity loops with an interior dead-end. 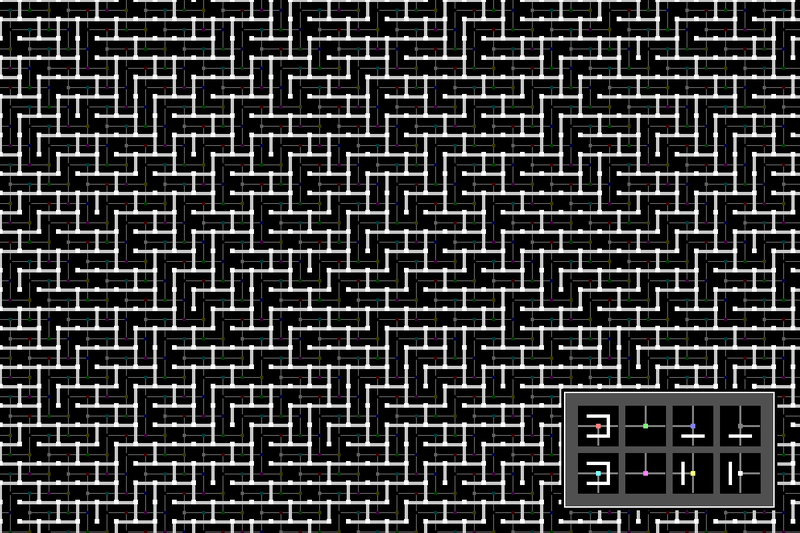 The tile set can have either 1 or 2 directions of dead-ends. There are also some simple tilings which consist of a tetris piece split into two chunks, but then a simple strict tiling that follows the tetris piece tiling. 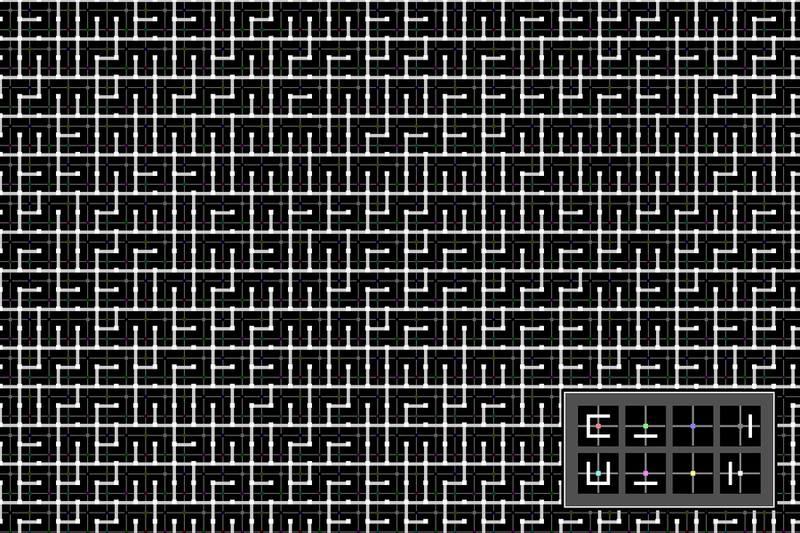 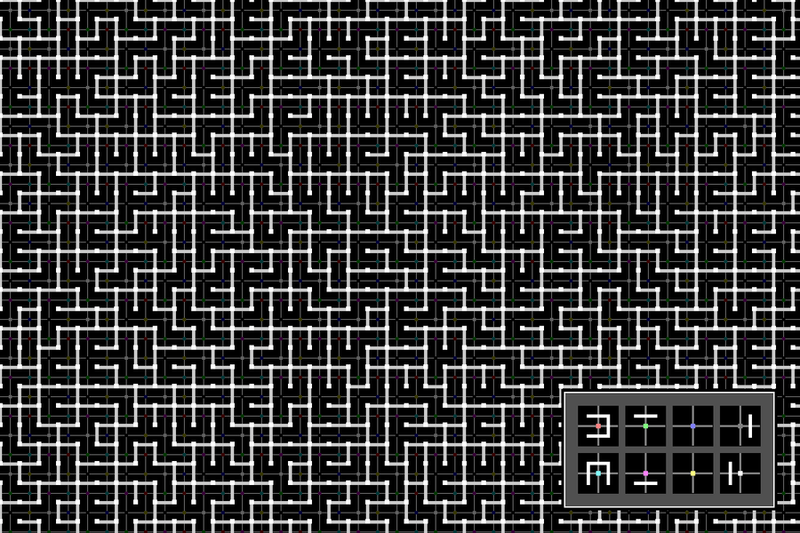 These are the only non-trivial connecivity that can be achieved with plain Wang tiles, that is, without introducing corner classes. They require at least three corner colors (which means 64 tiles in the set). 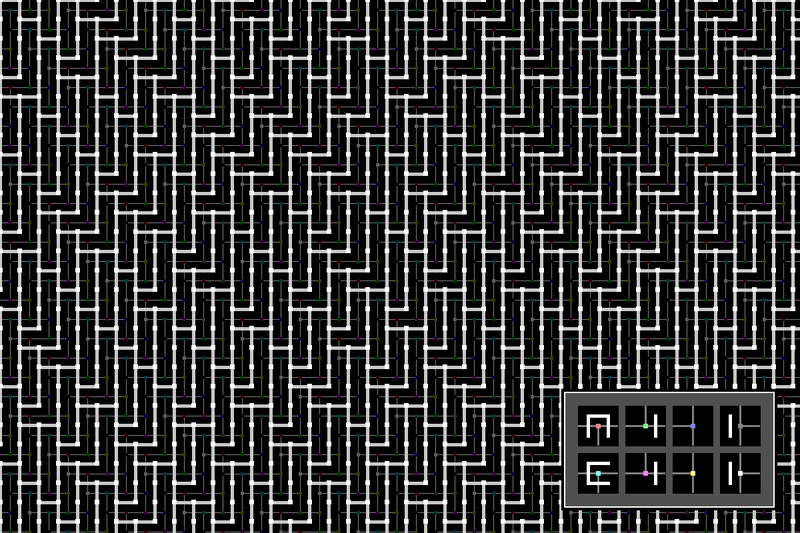 The following requires four corner colors (256 tiles in the set), allowing the output to omit both vertical and horizontal edges instead of only one as in the previous type. 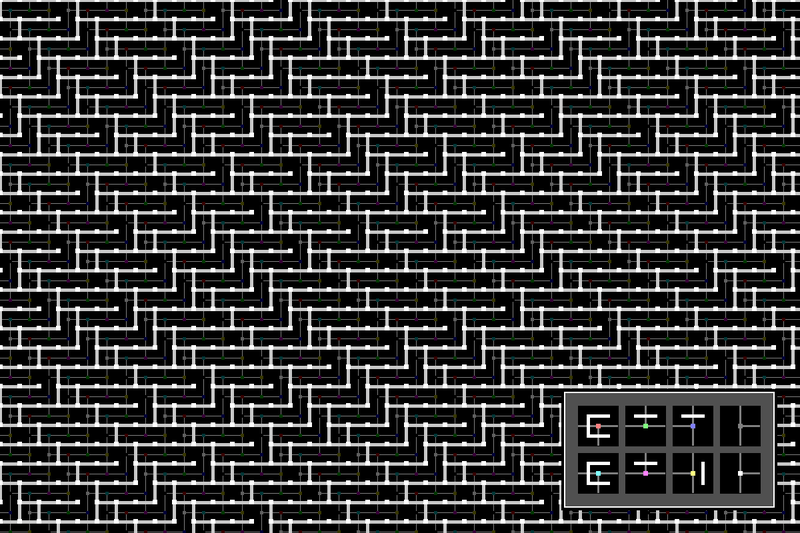 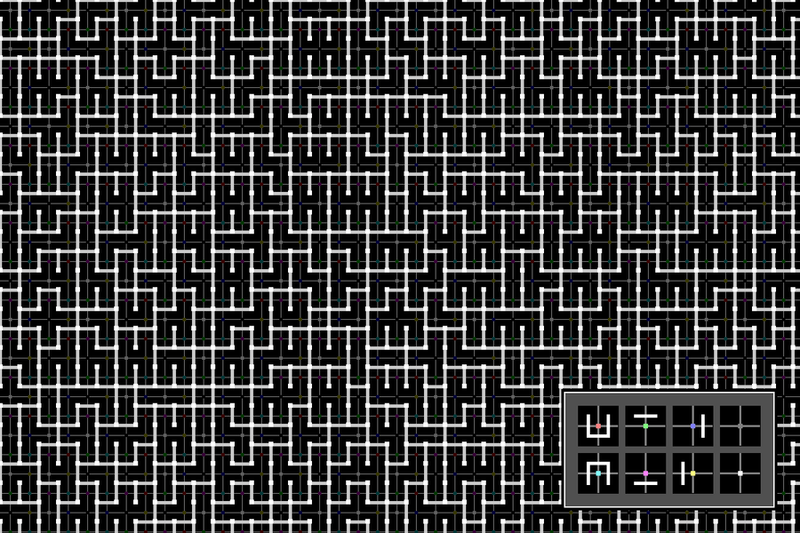 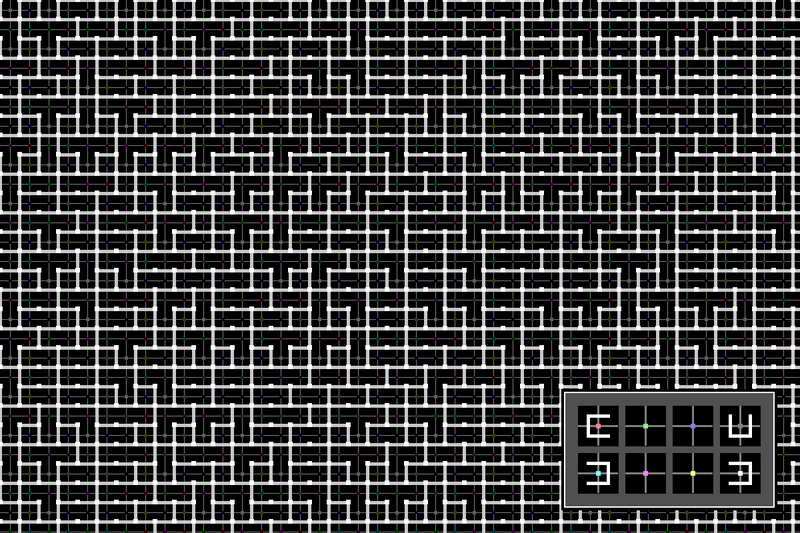 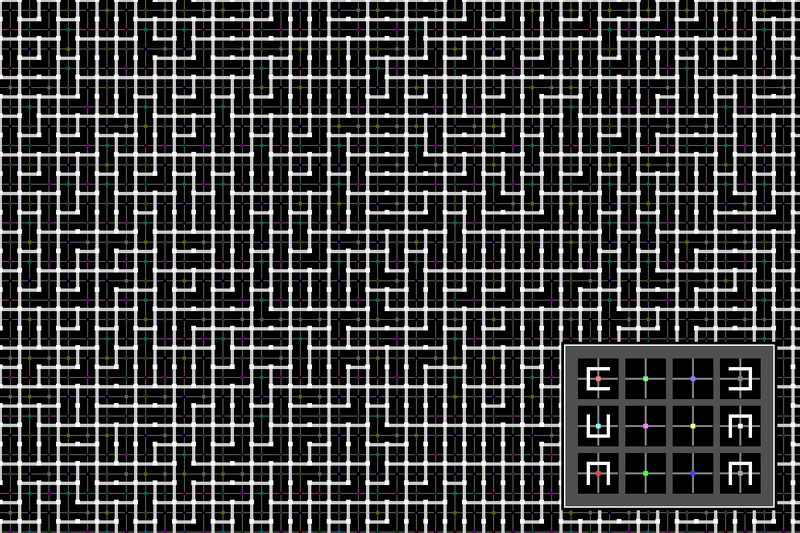 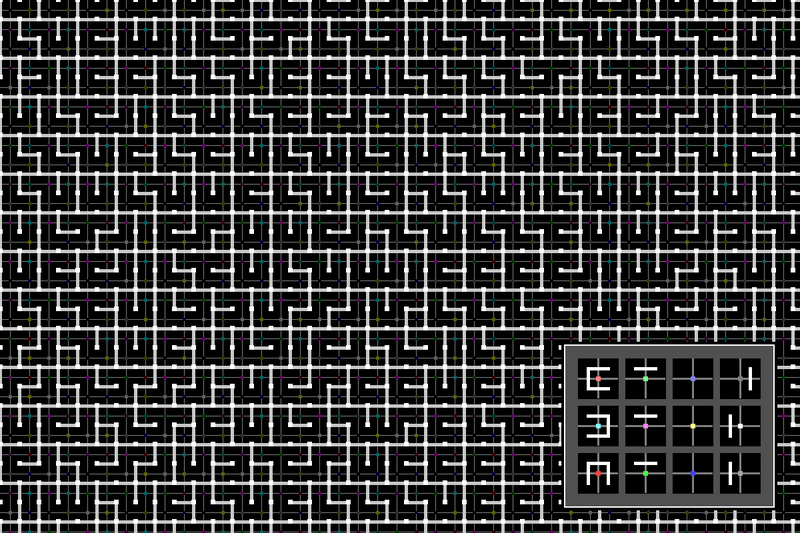 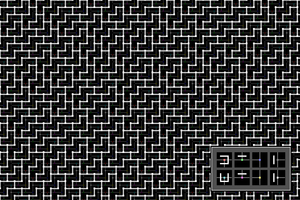 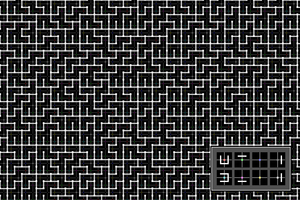 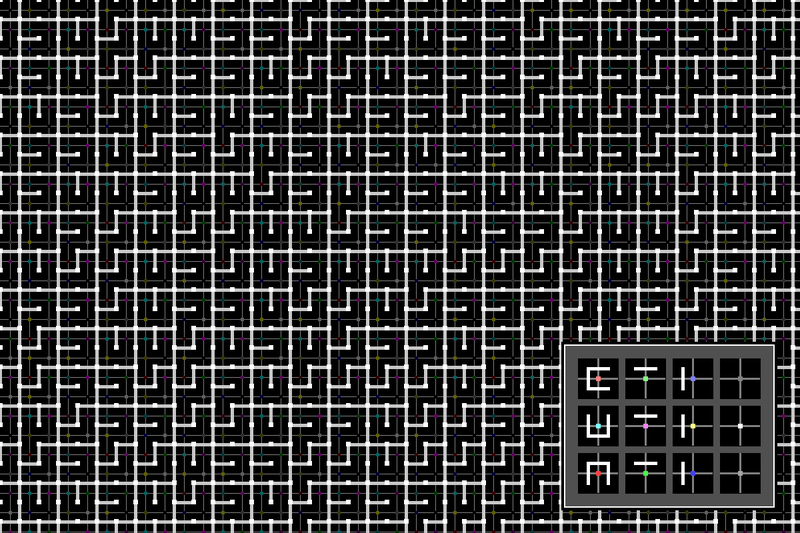 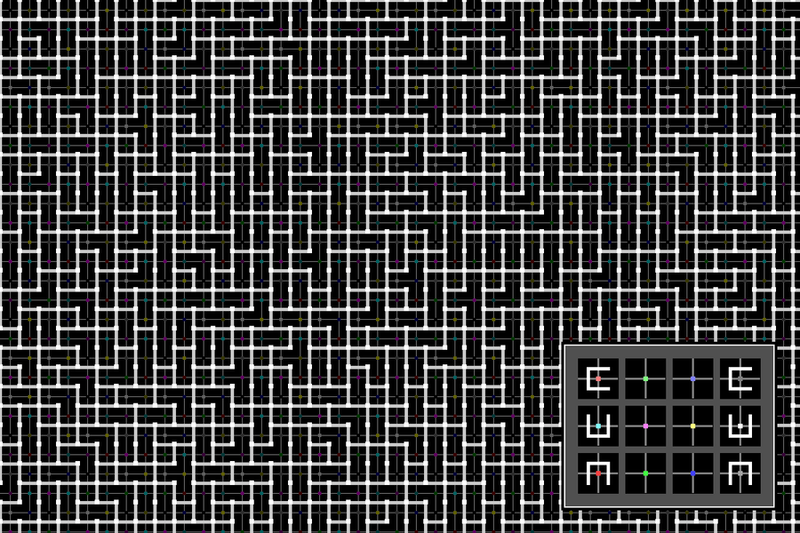 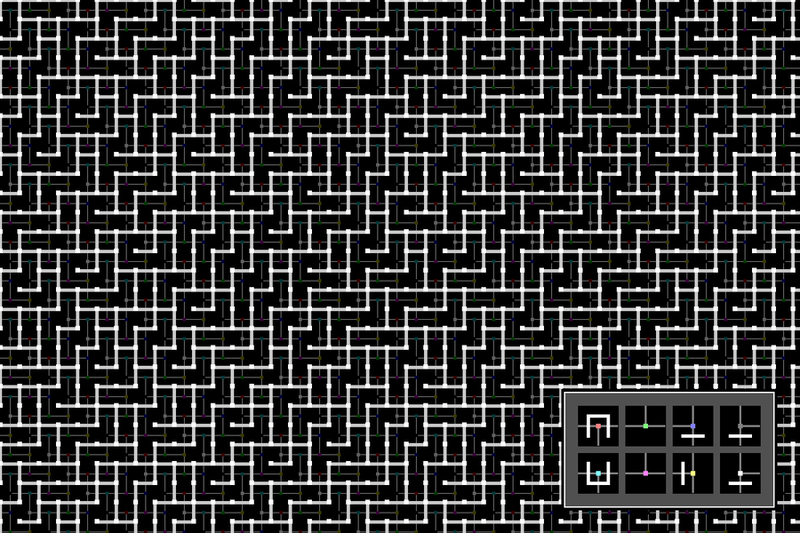 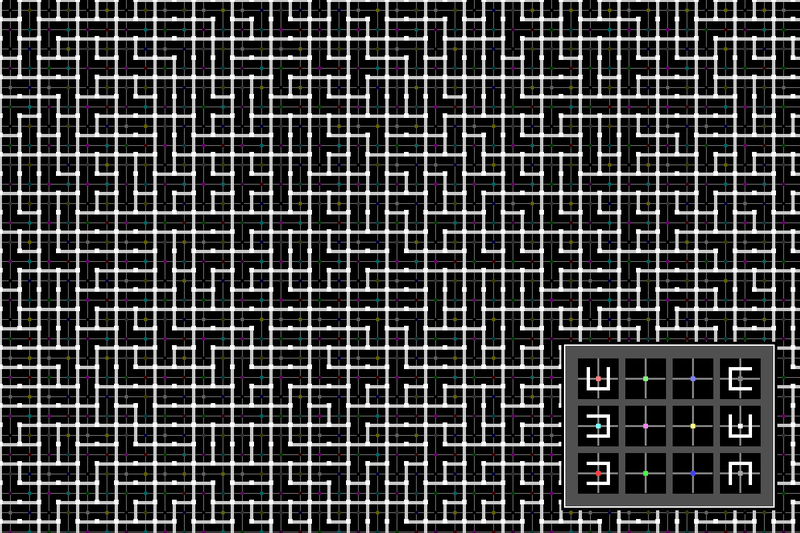 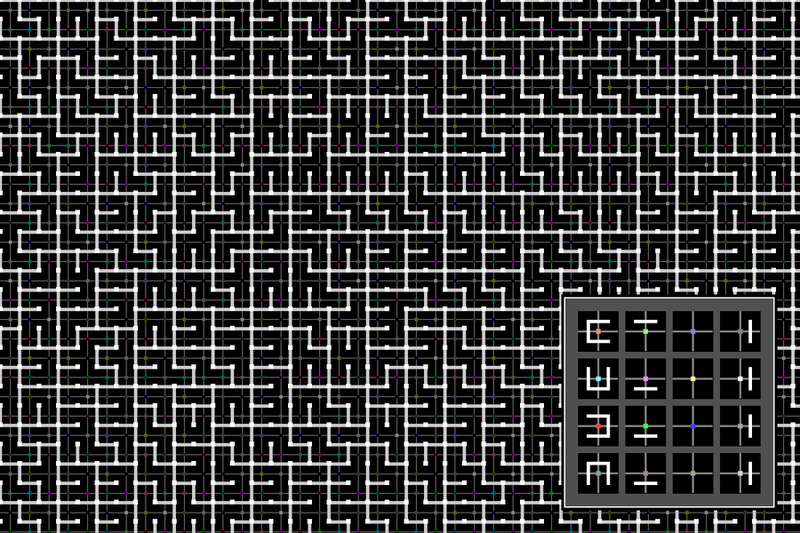 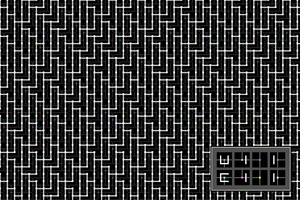 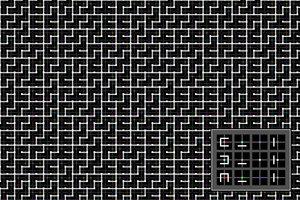 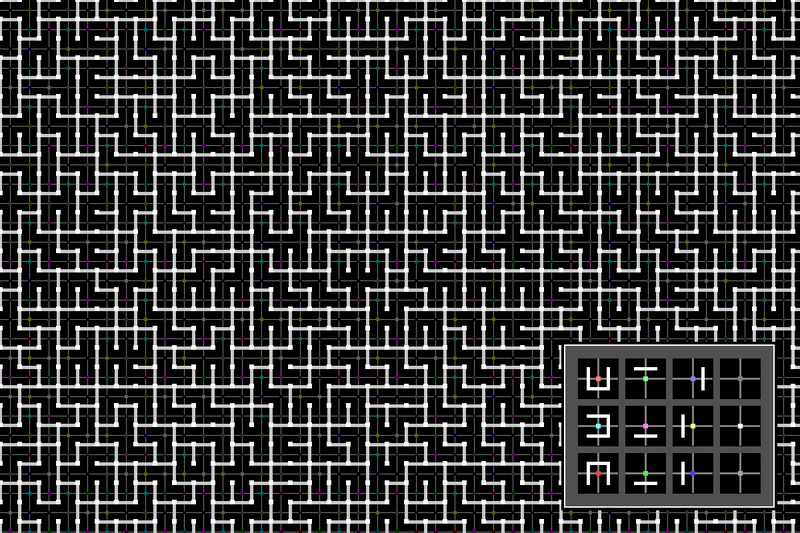 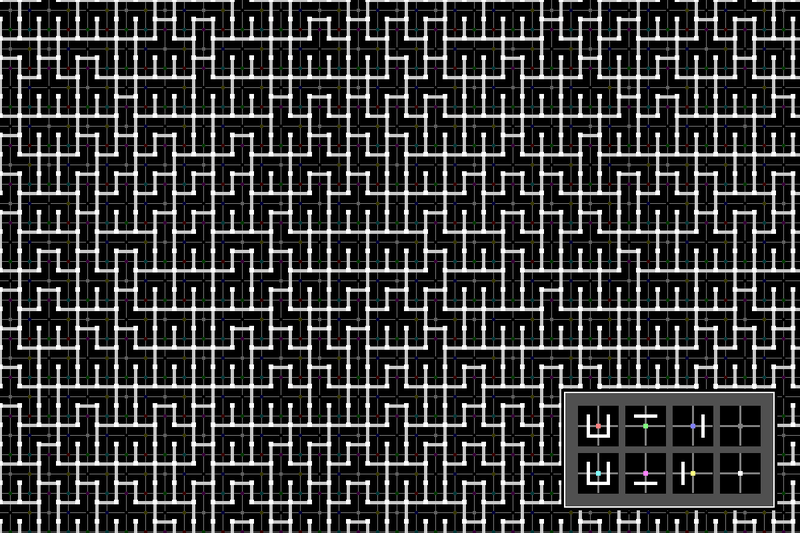 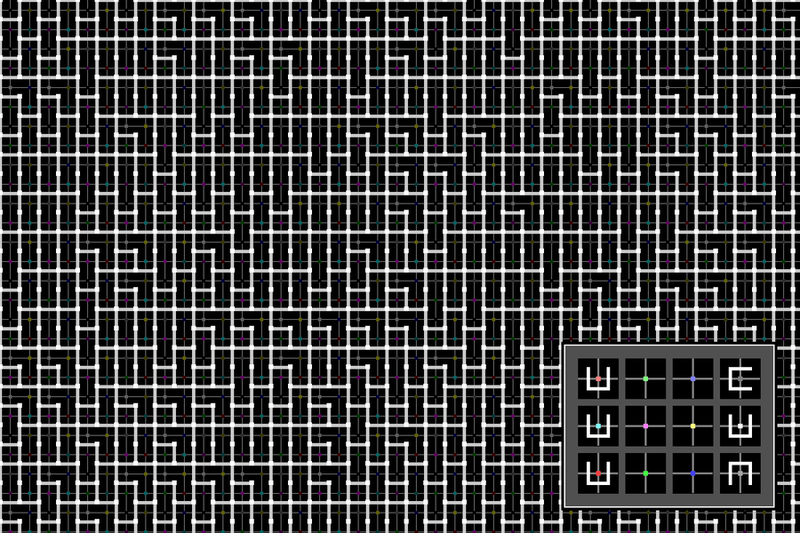 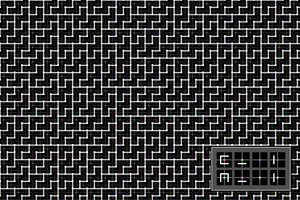 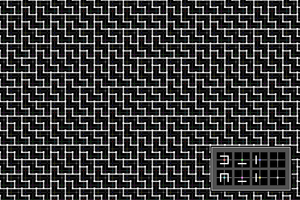 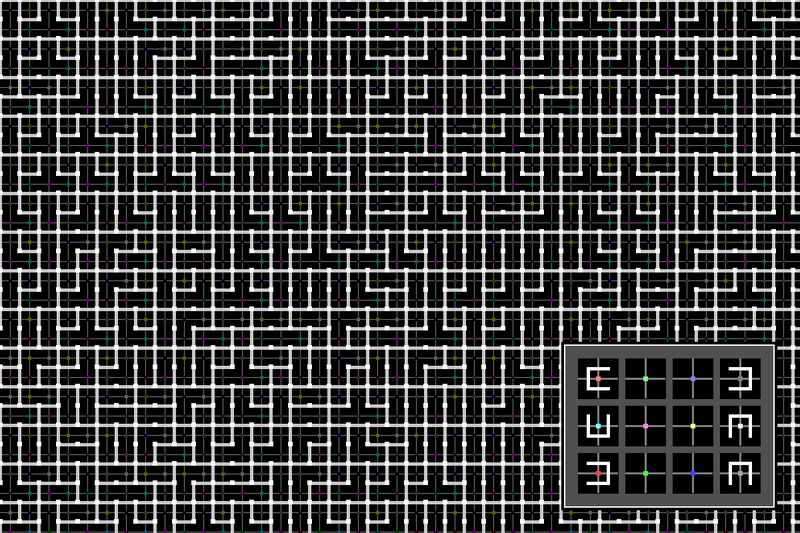 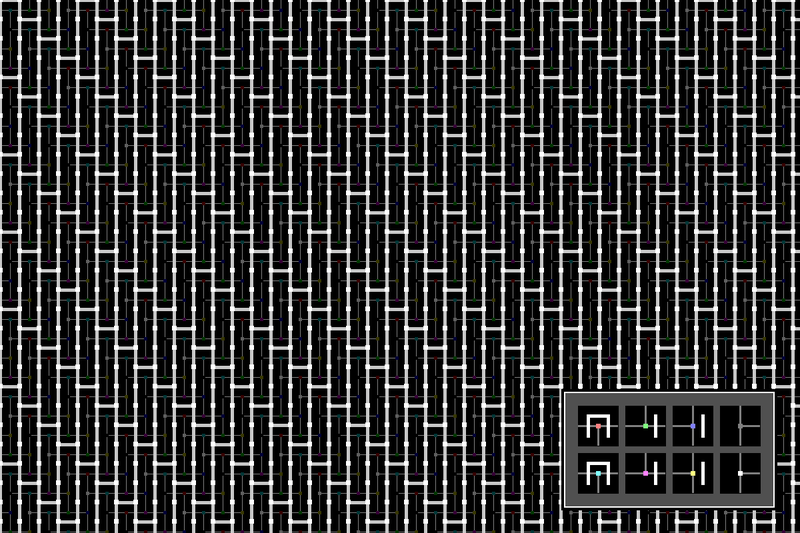 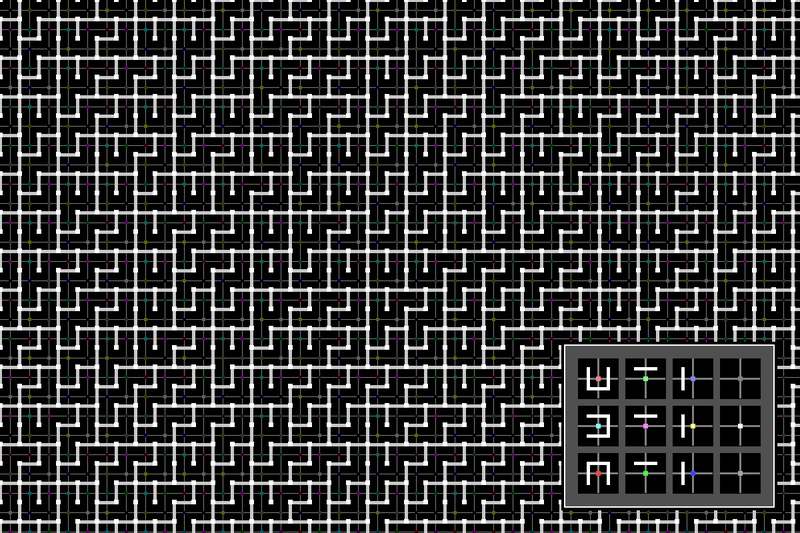 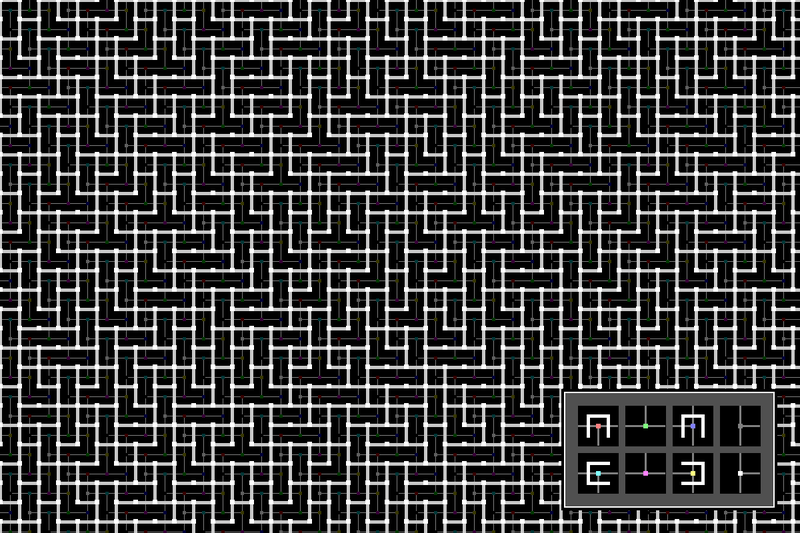 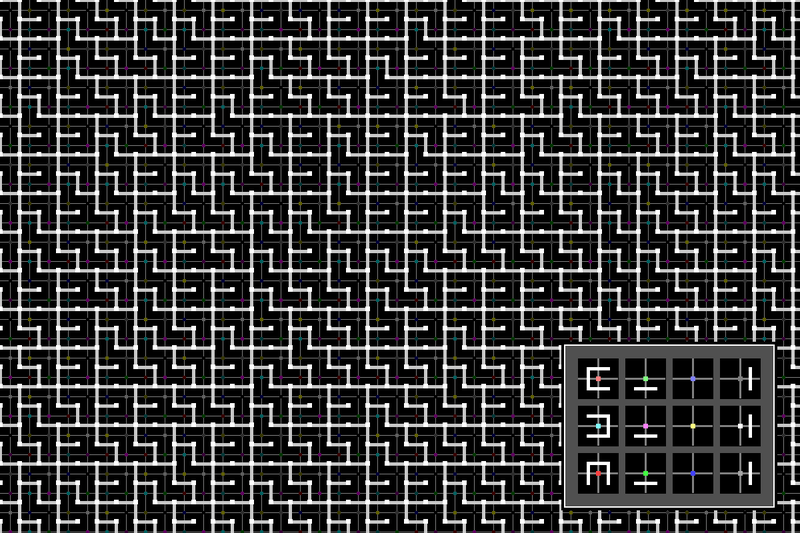 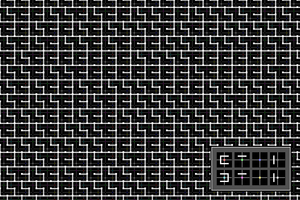 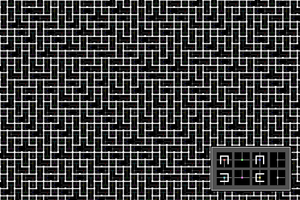 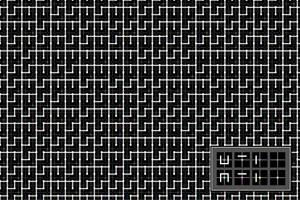 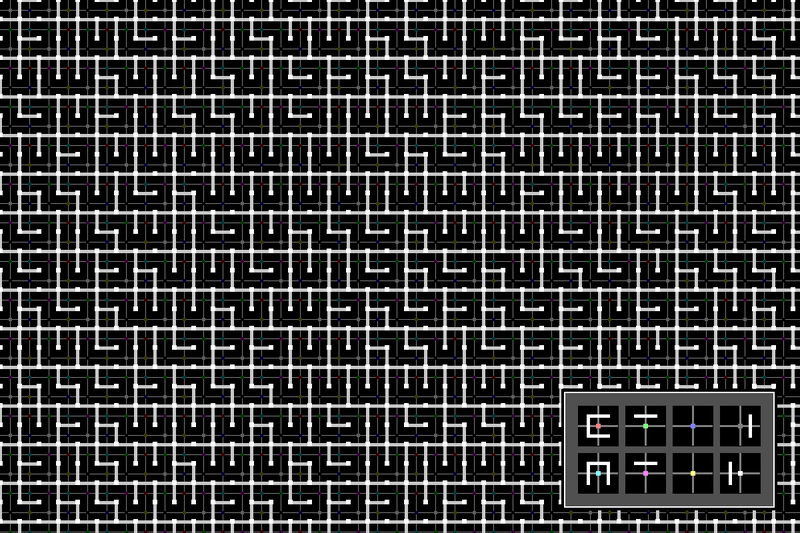 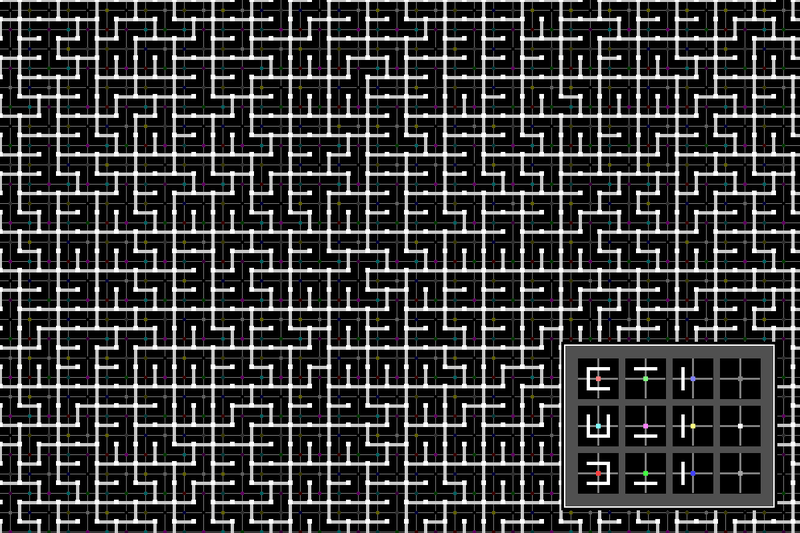 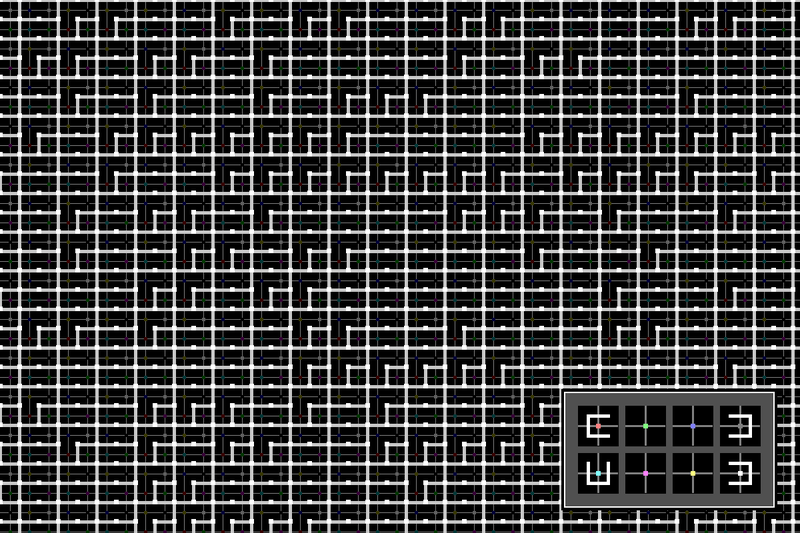 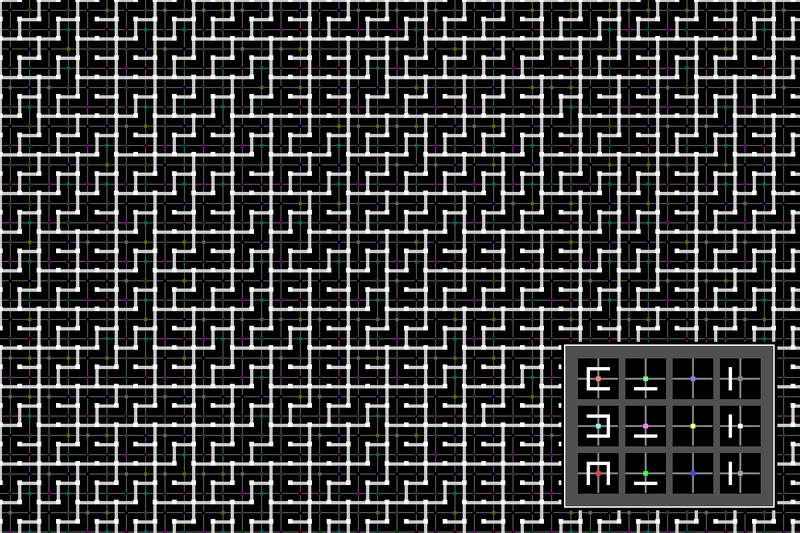 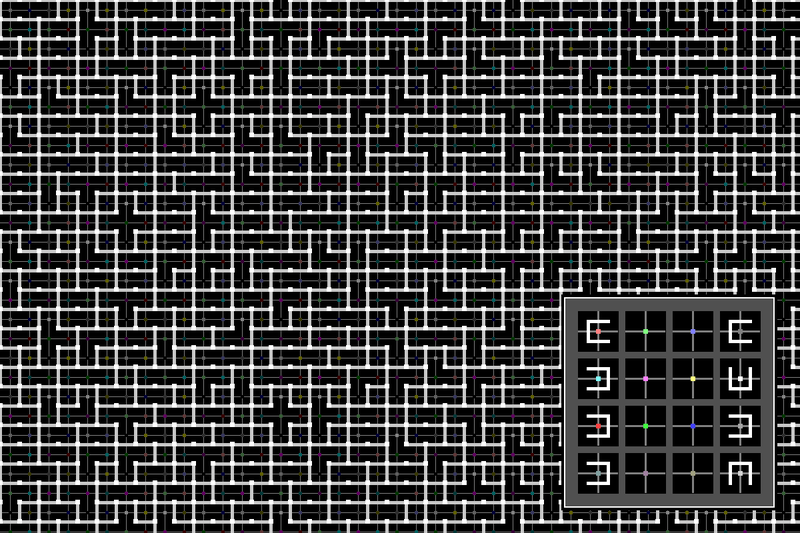 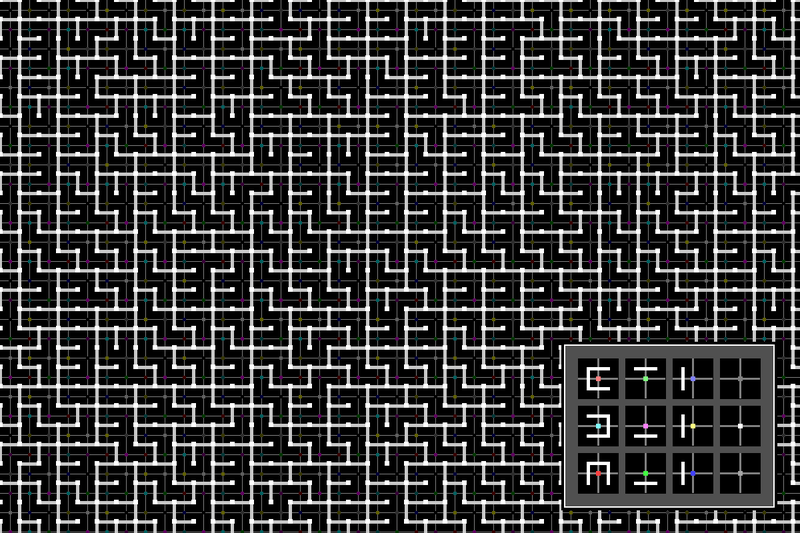 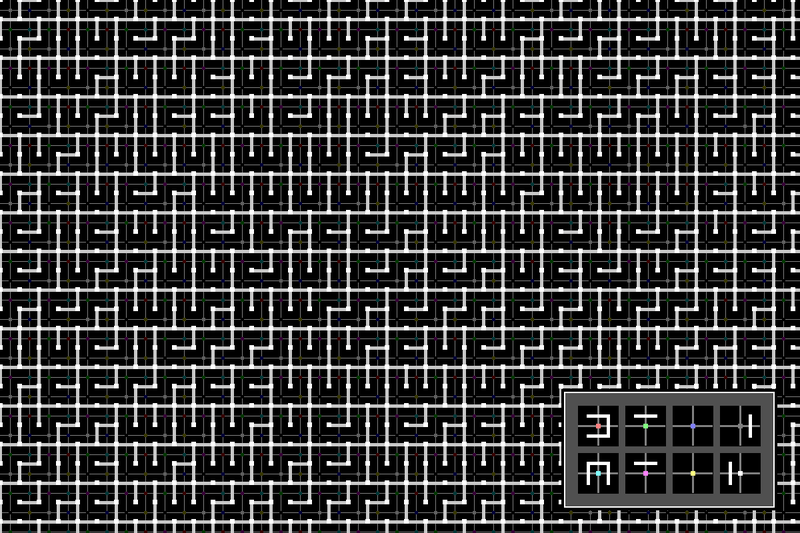 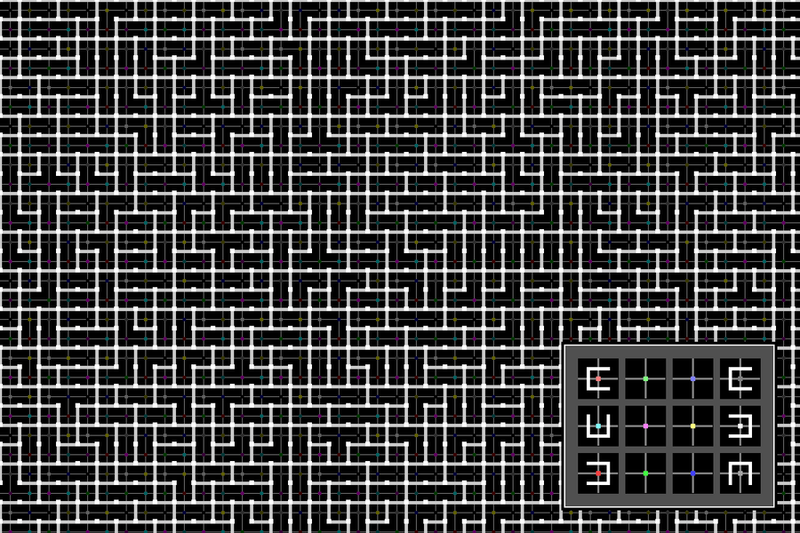 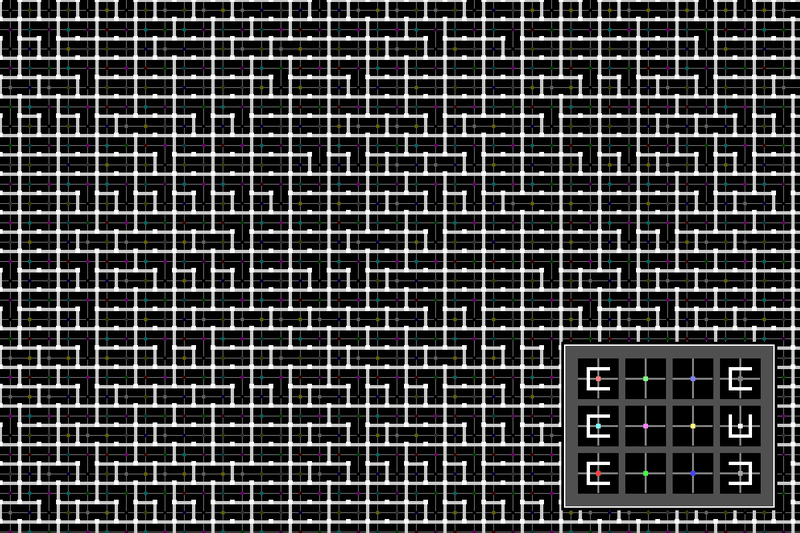 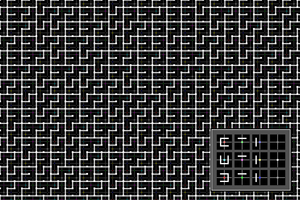 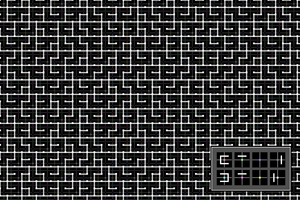 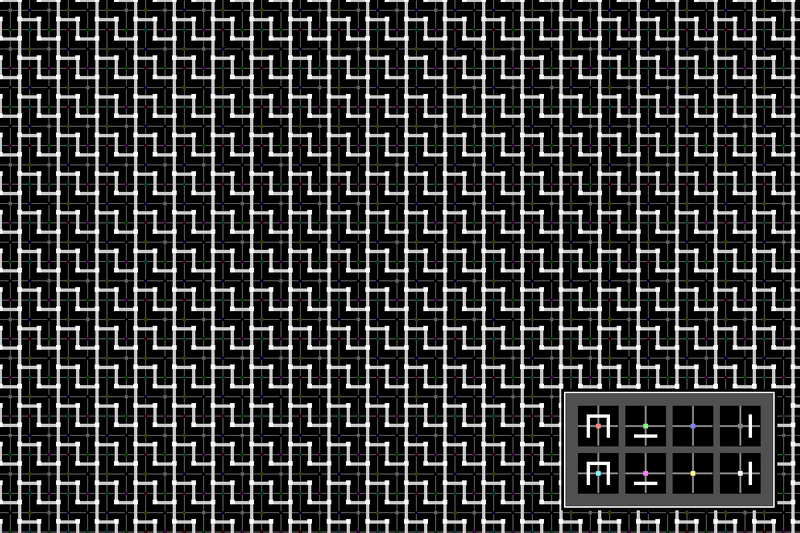 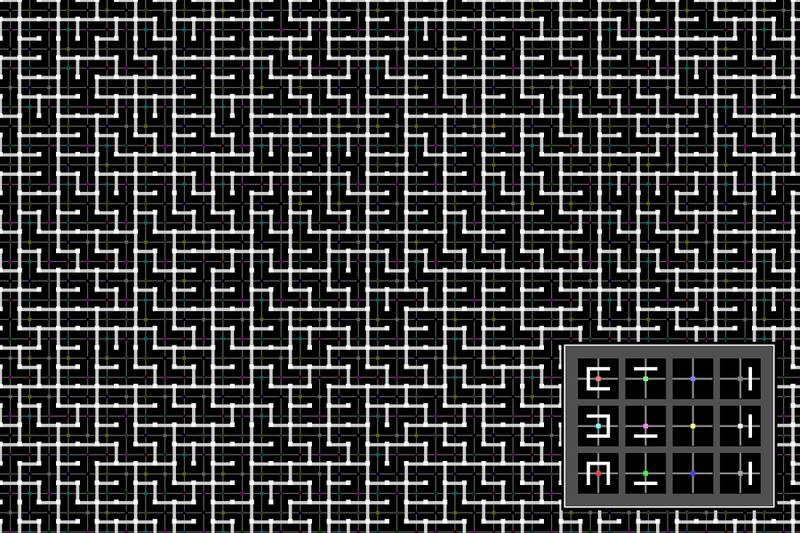 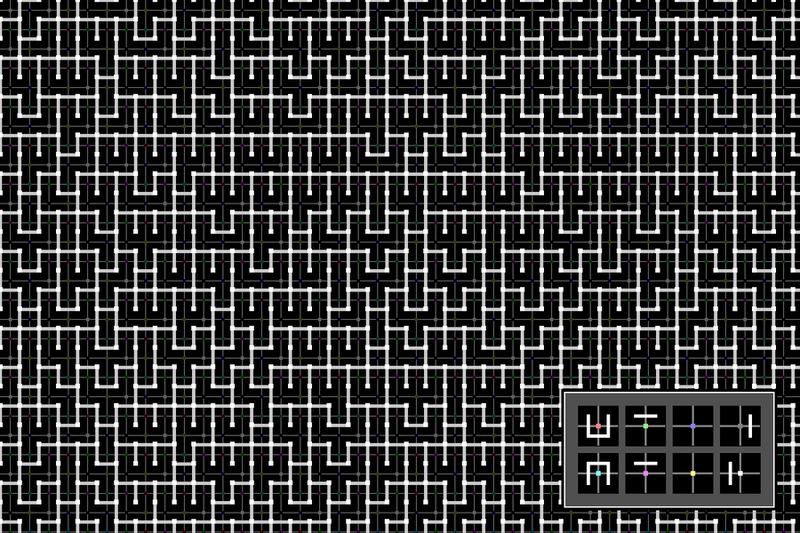 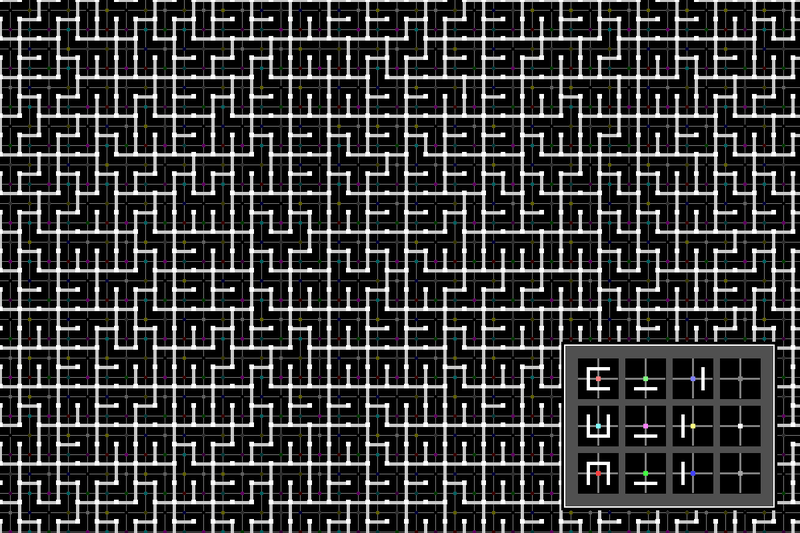 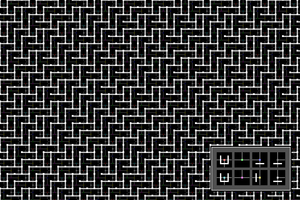 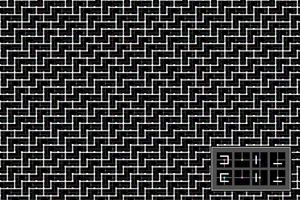 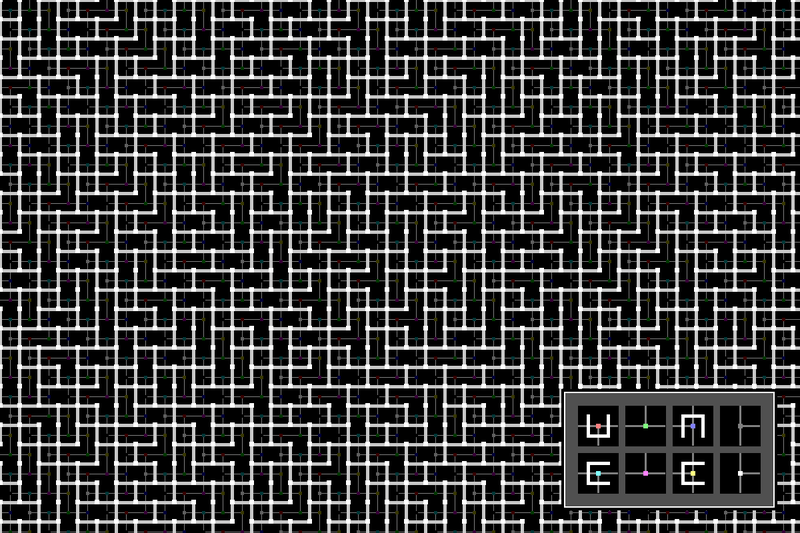 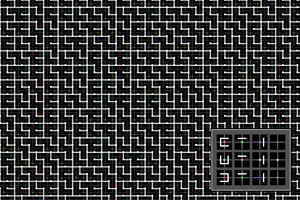 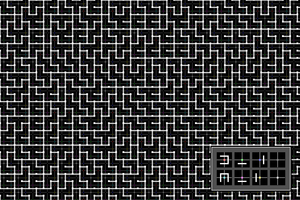 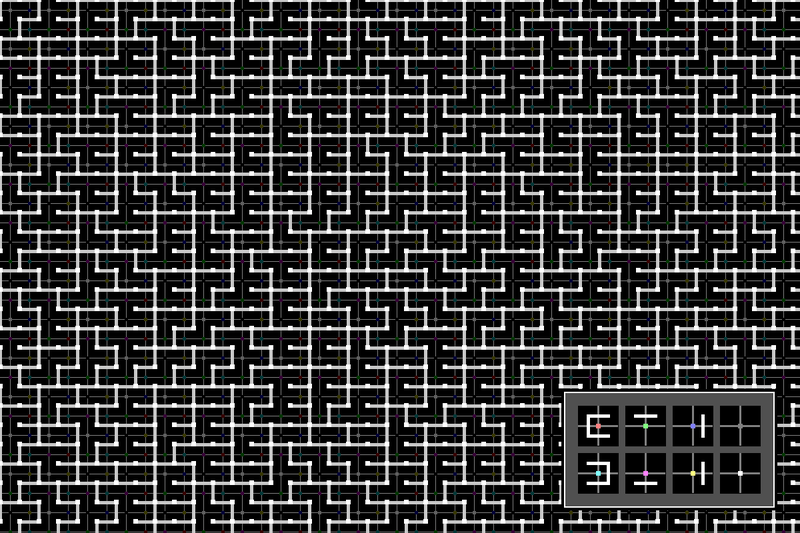 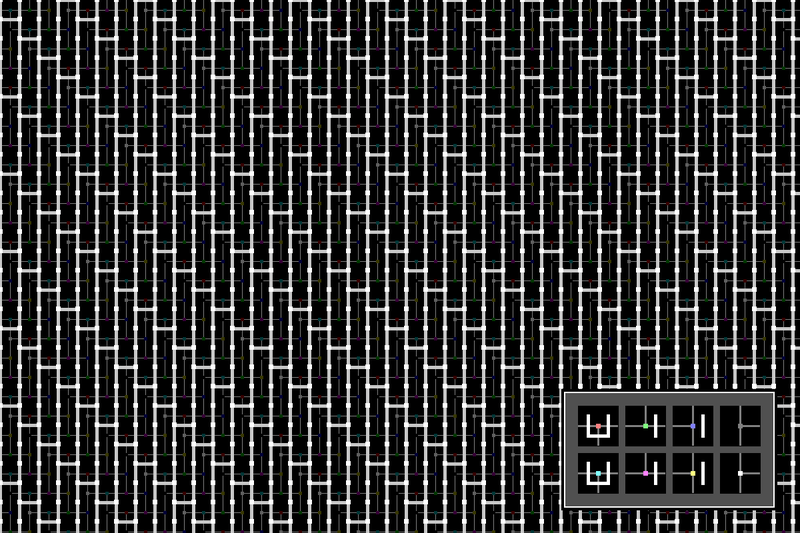 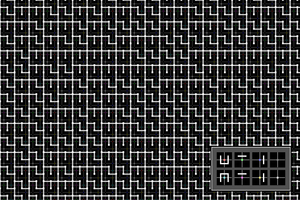 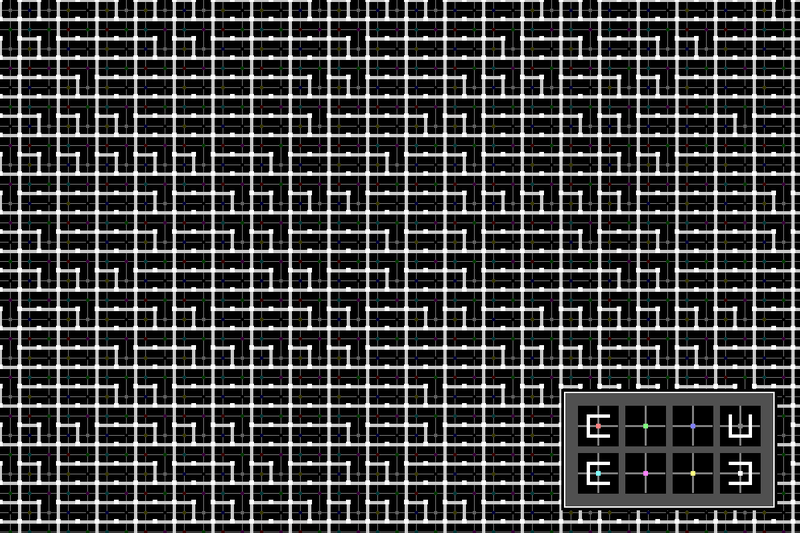 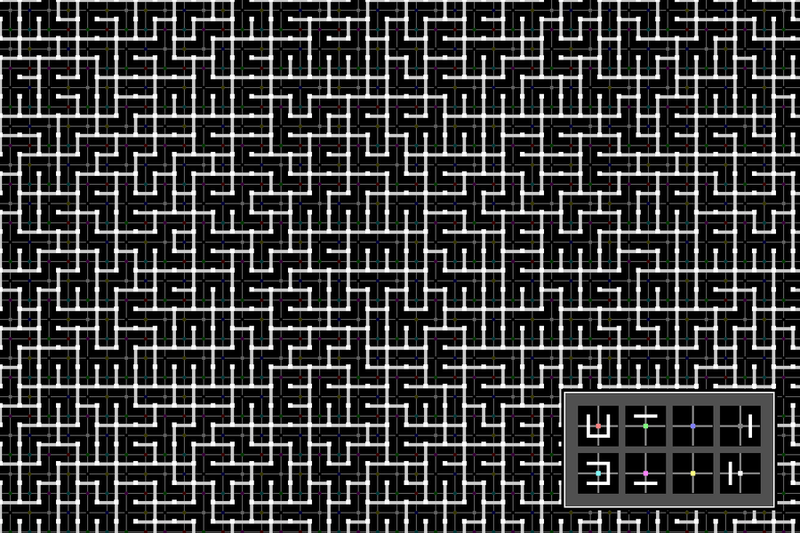 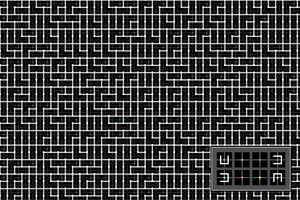 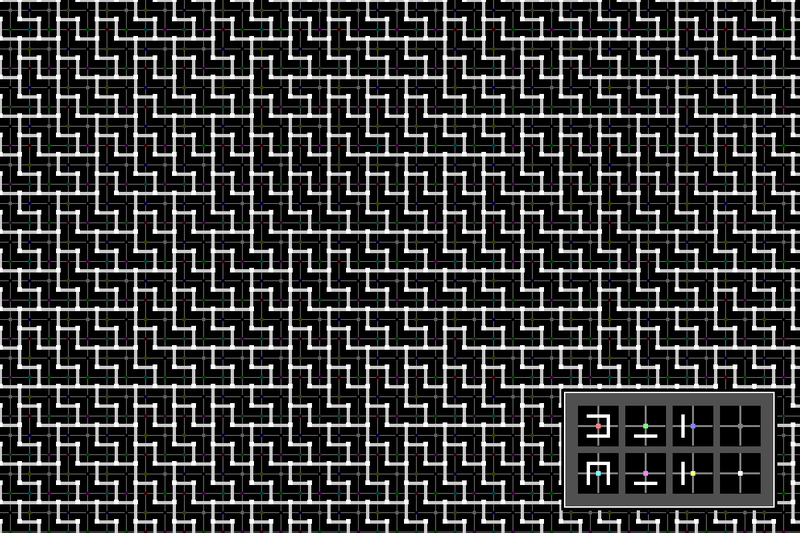 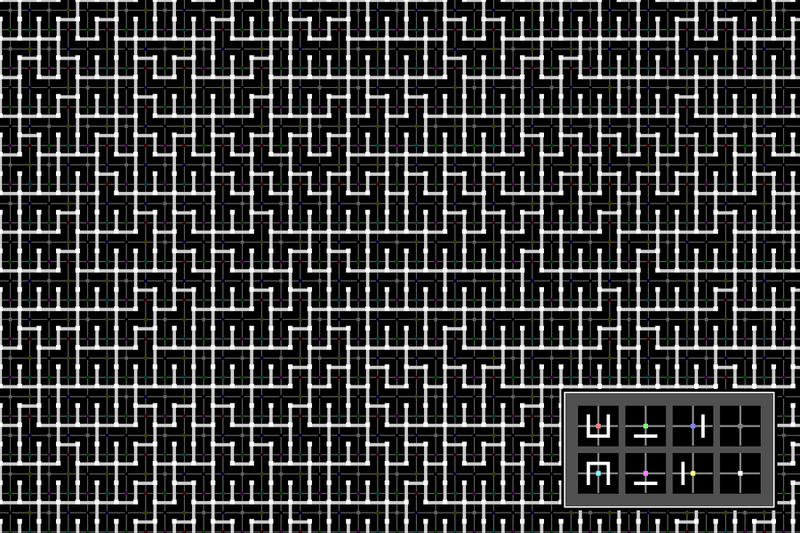 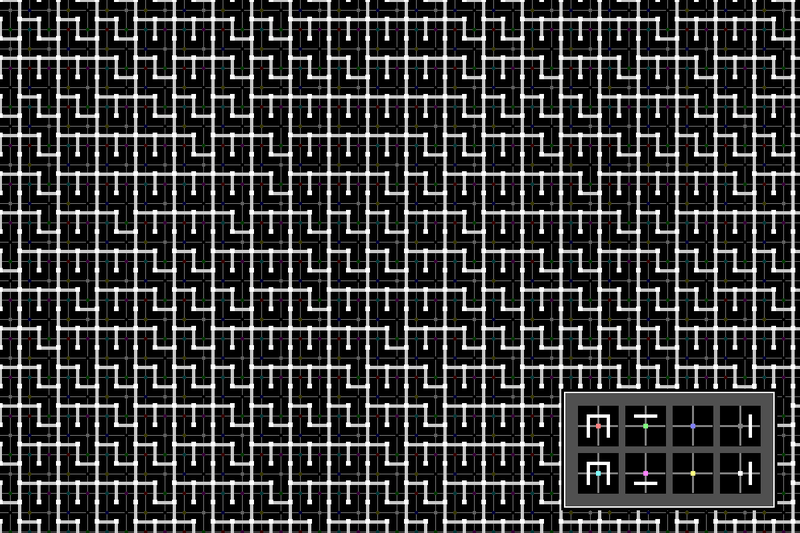 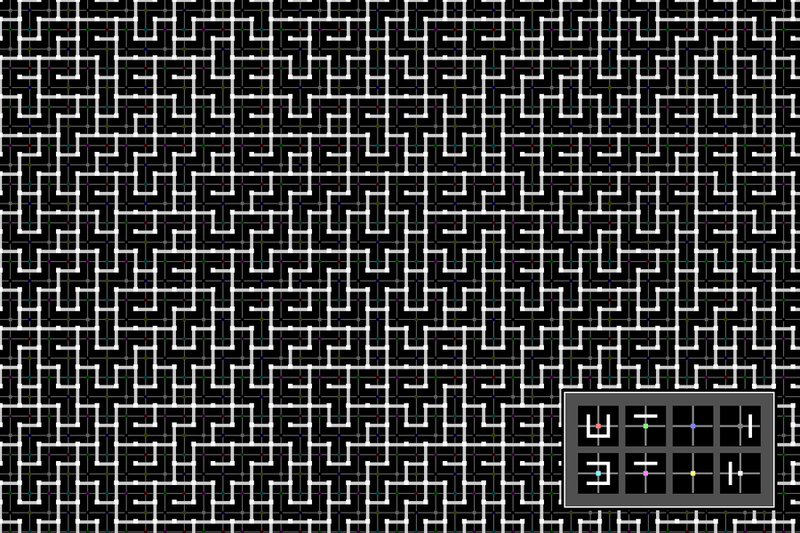 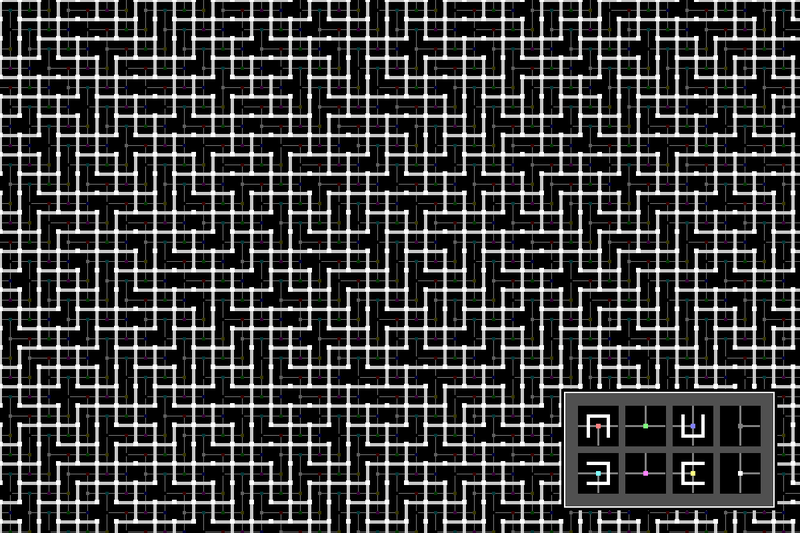 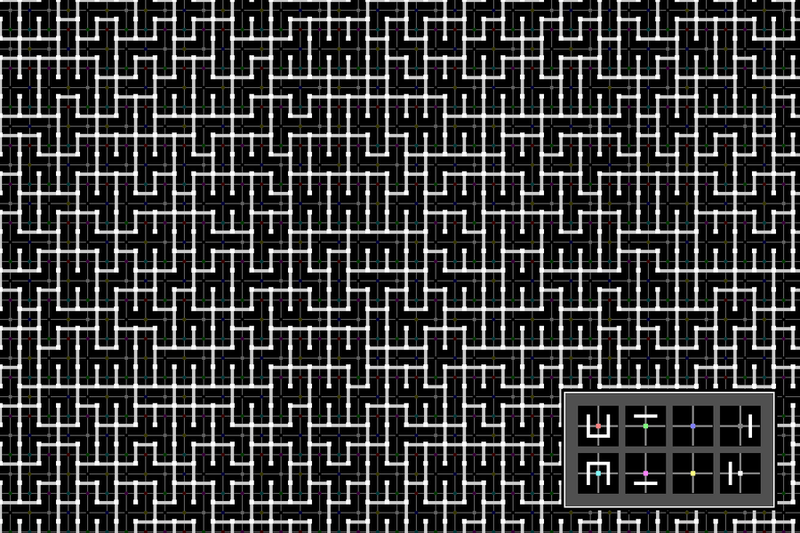 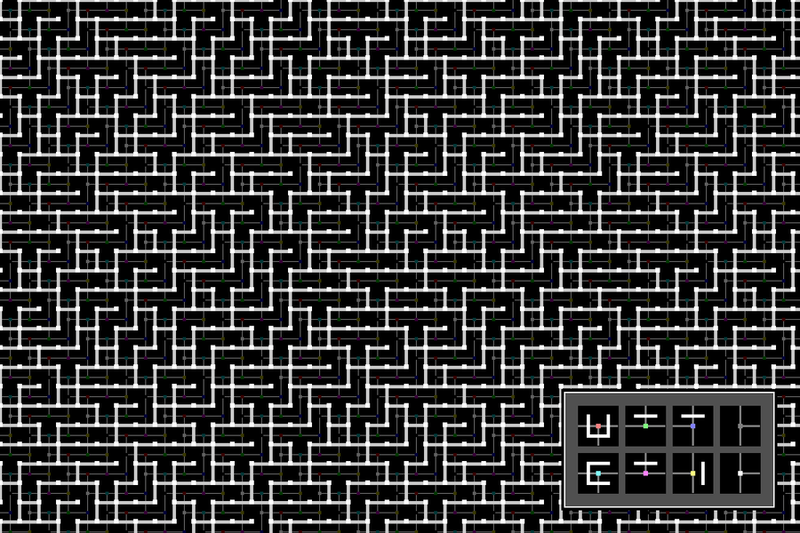 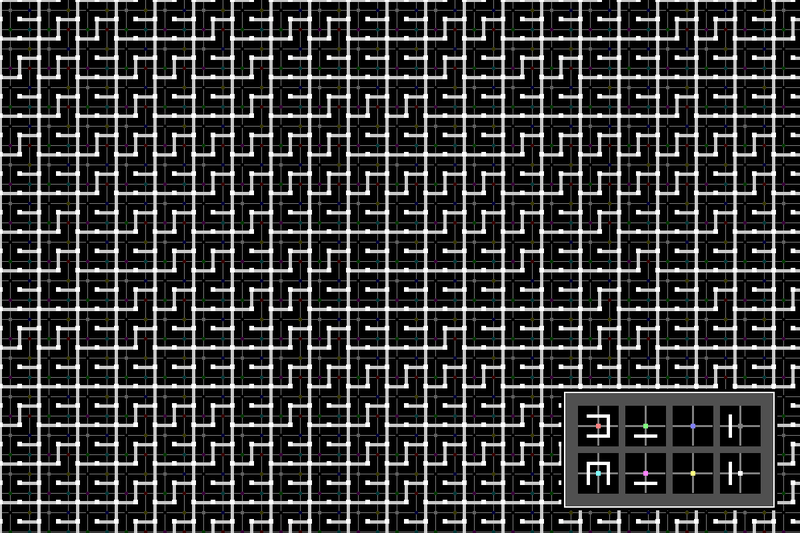 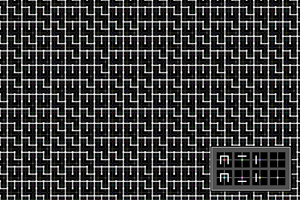 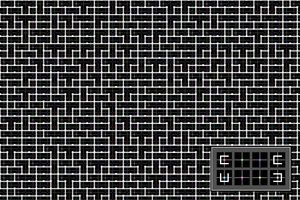 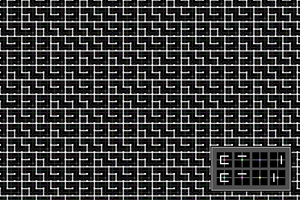 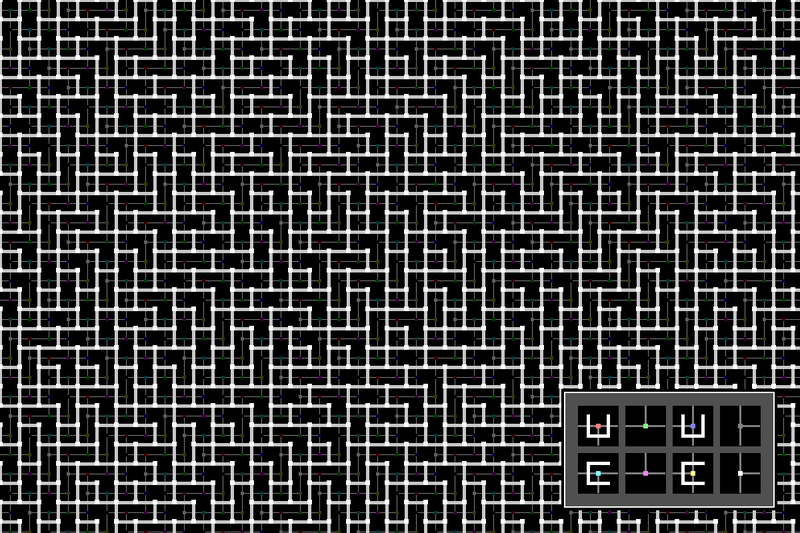 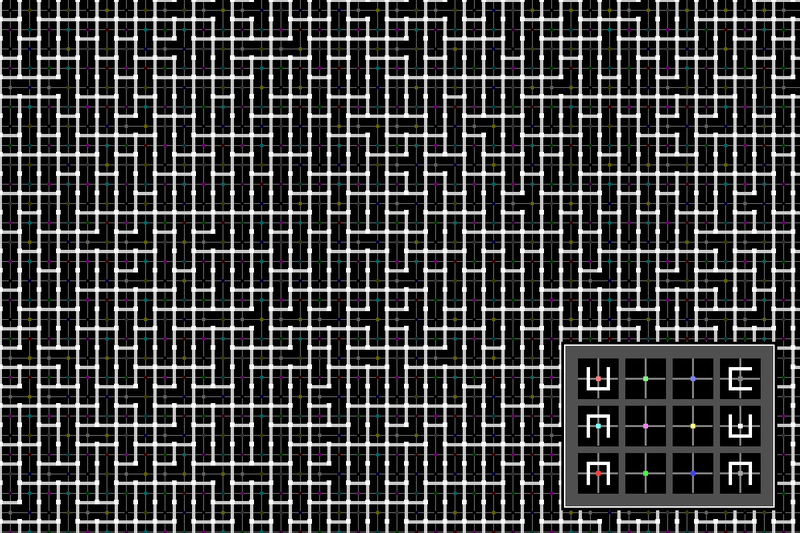 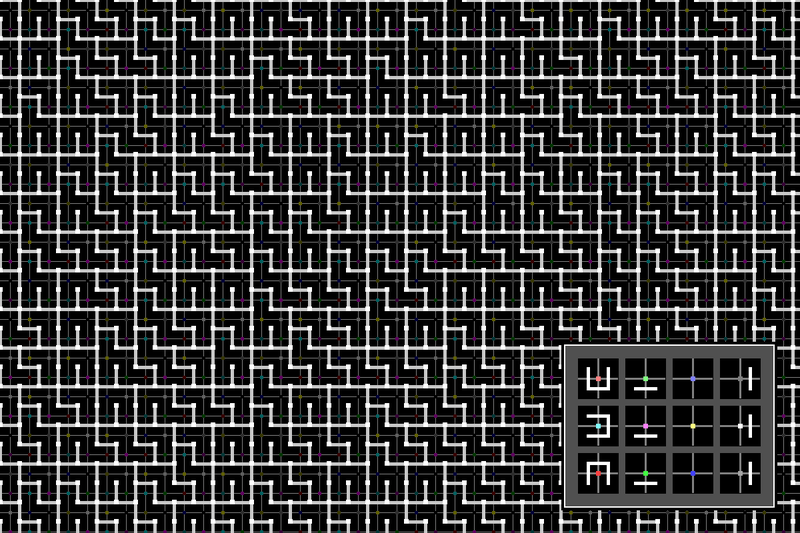 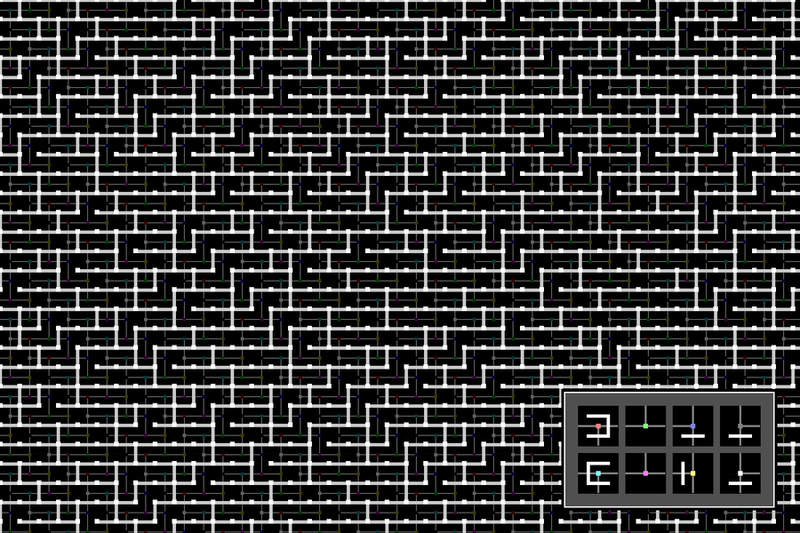 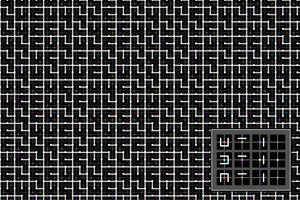 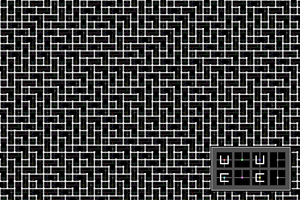 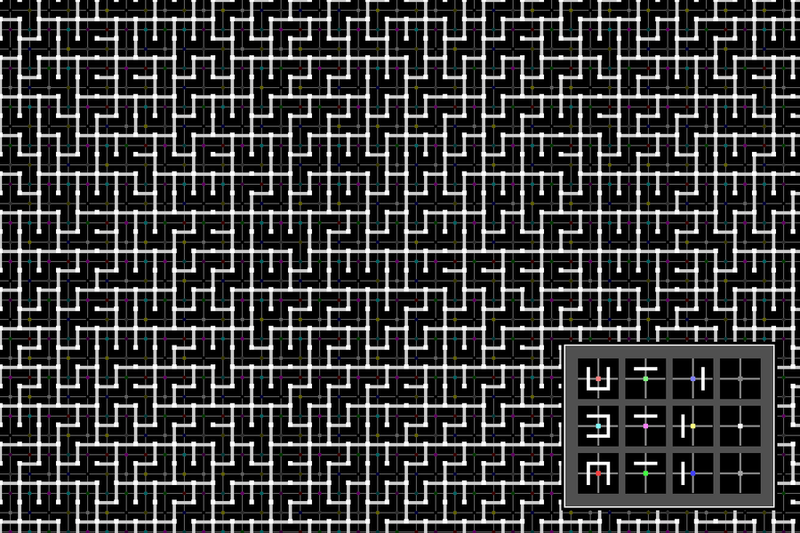 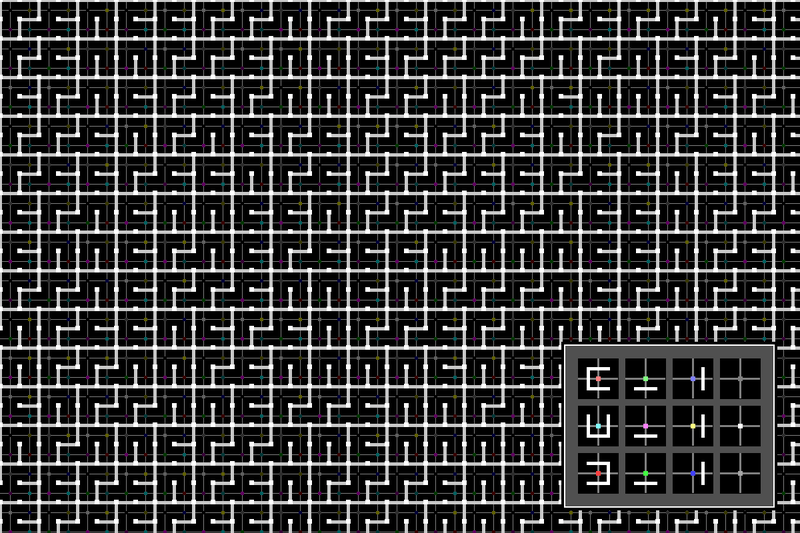 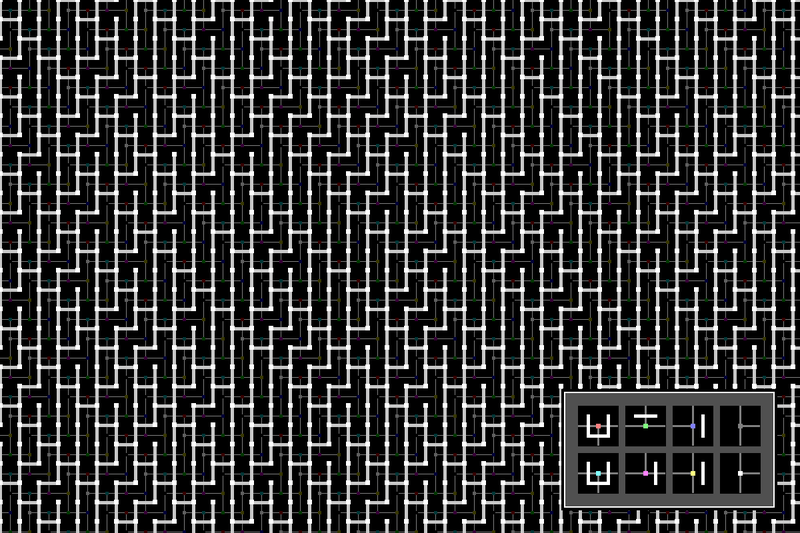 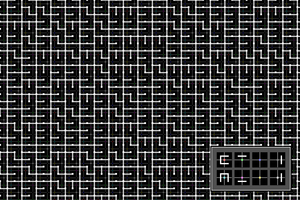 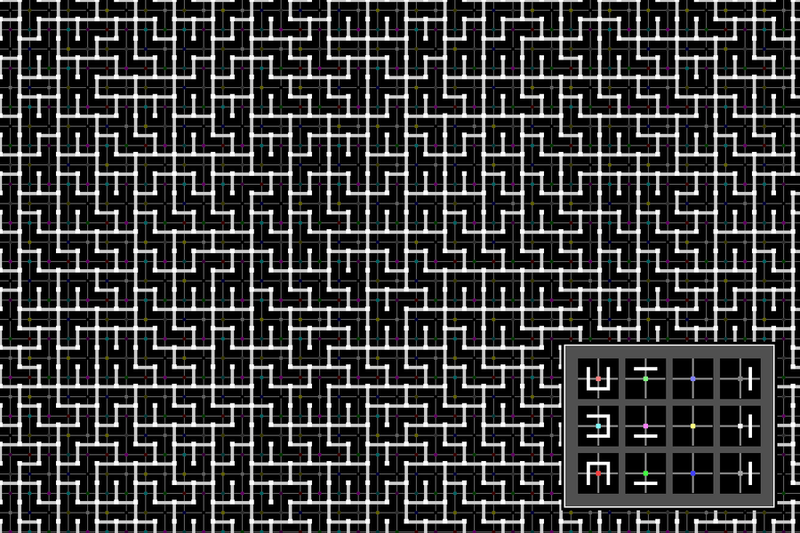 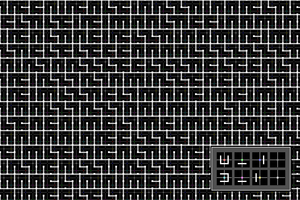 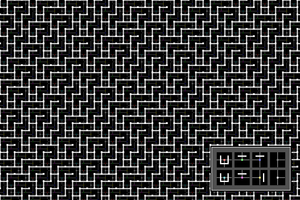 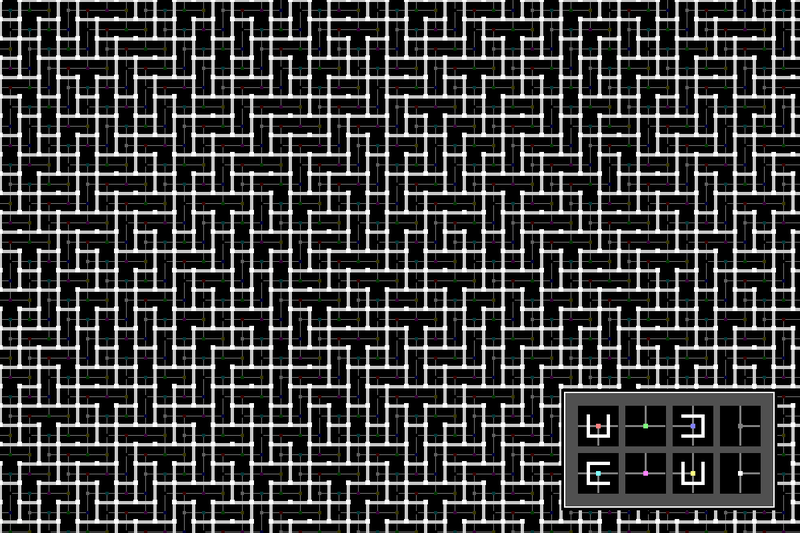 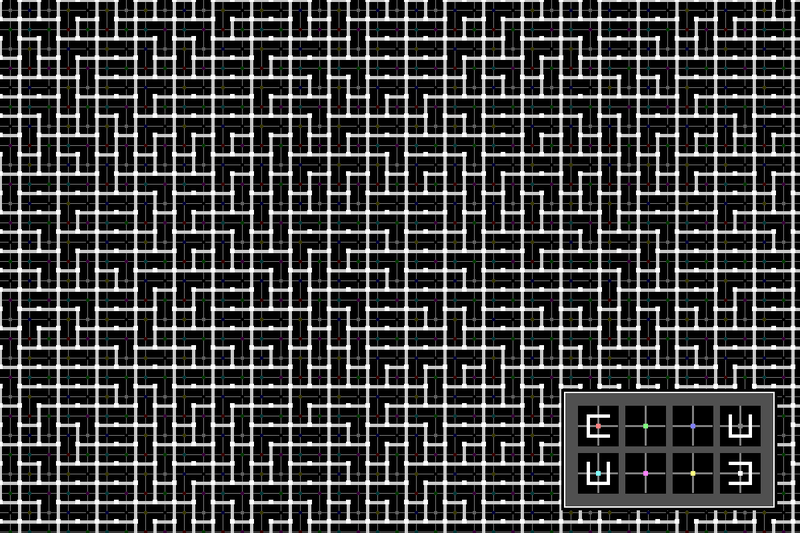 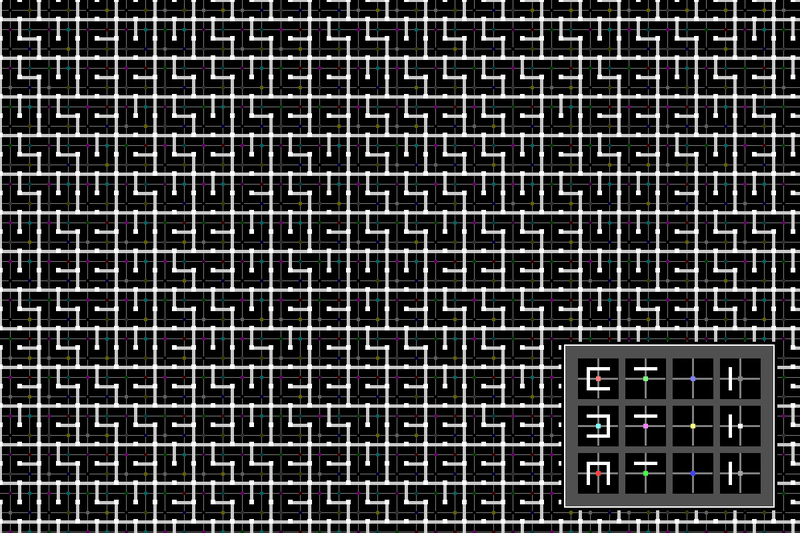 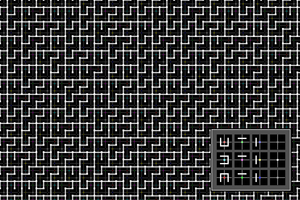 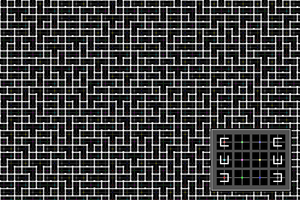 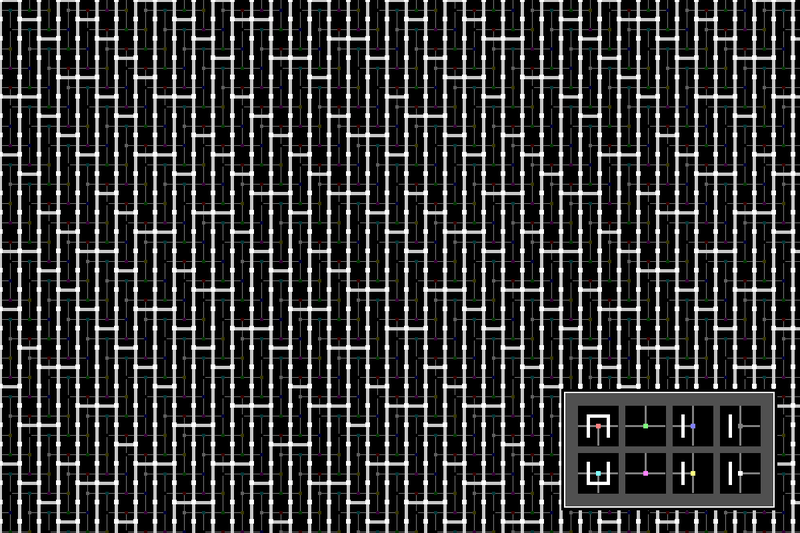 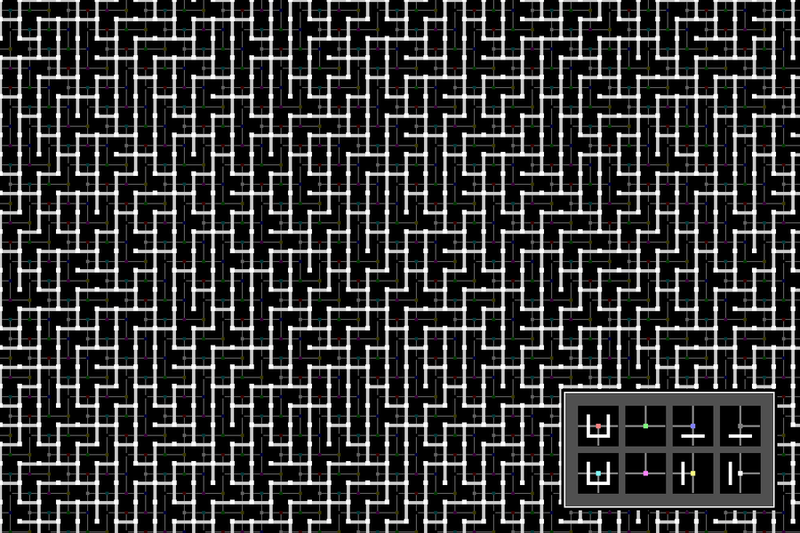 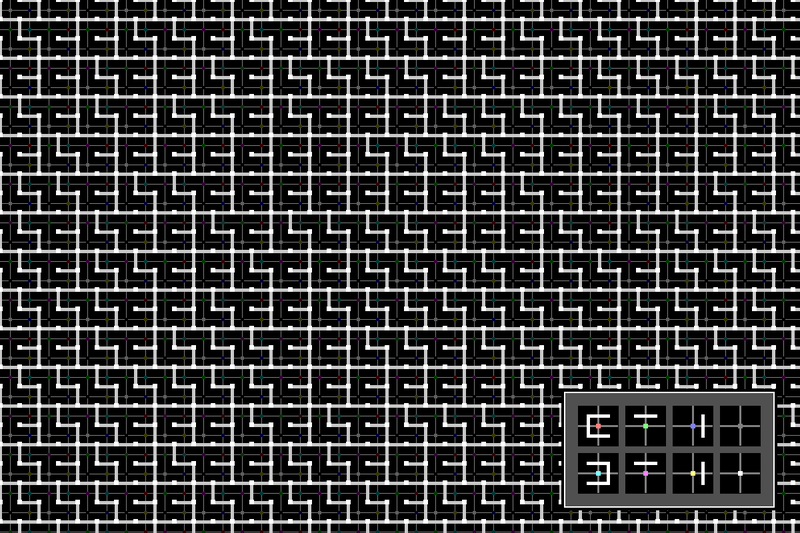 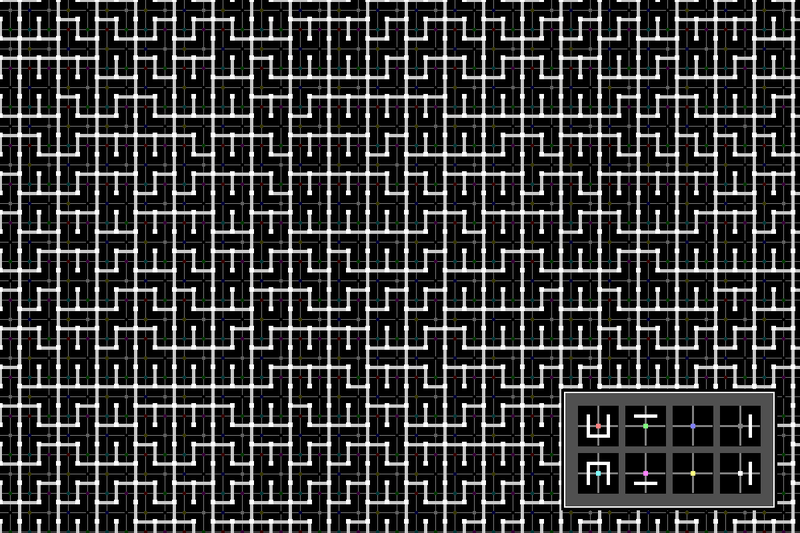 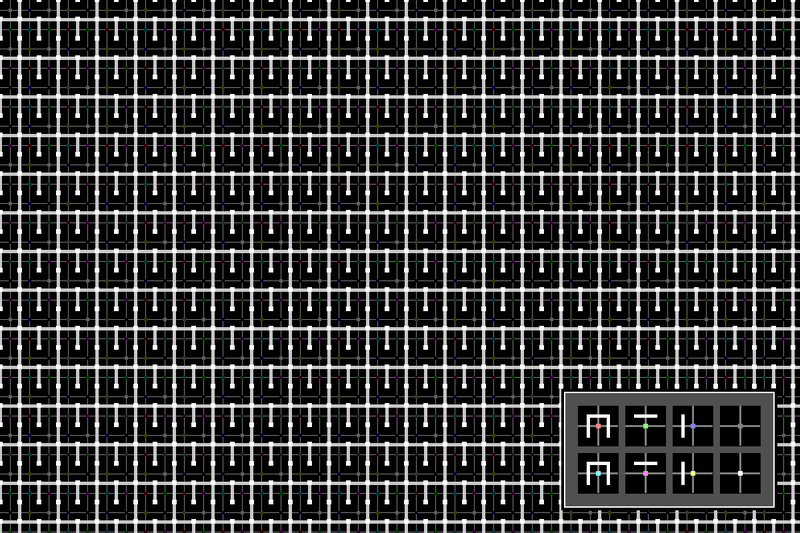 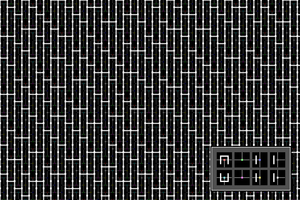 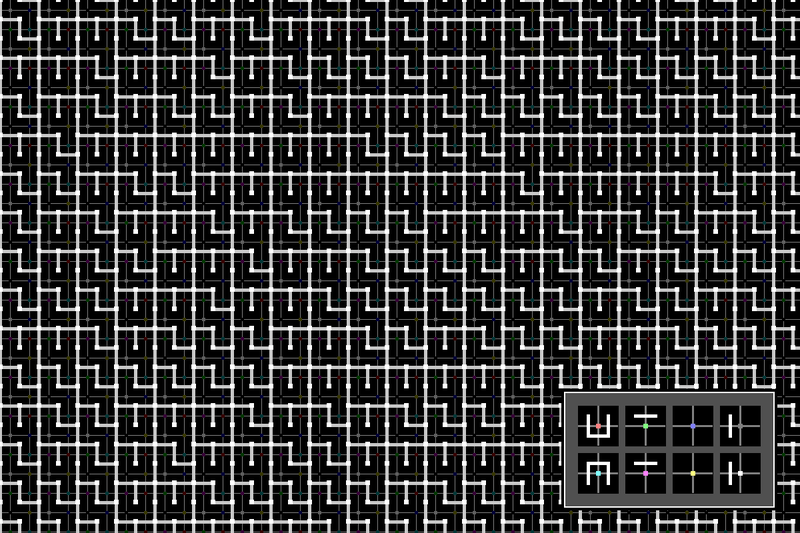 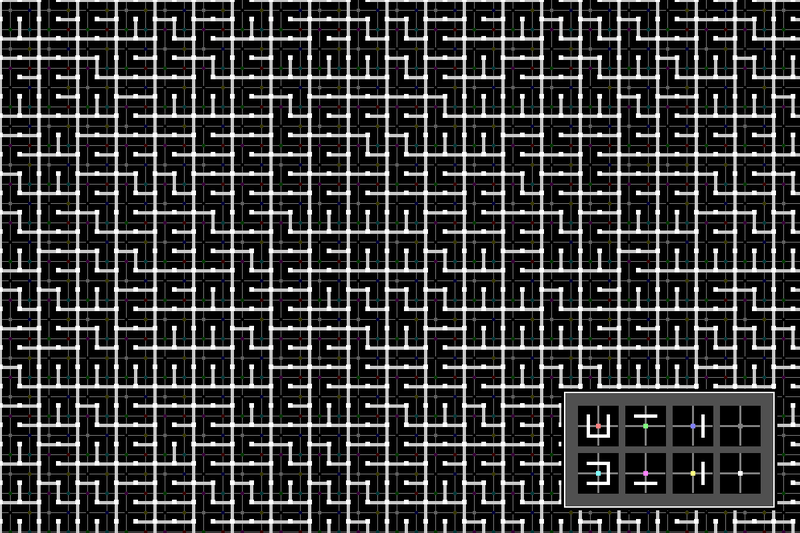 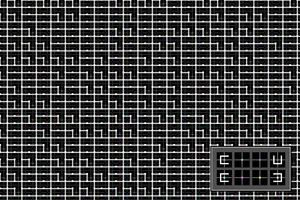 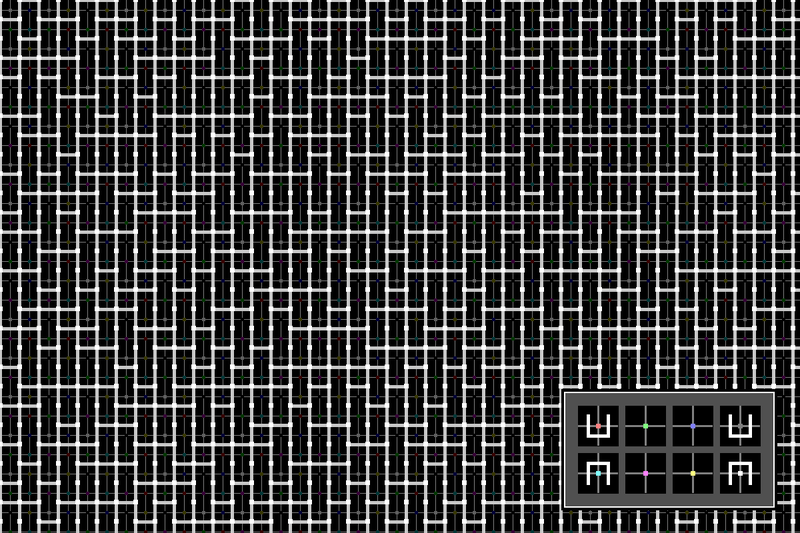 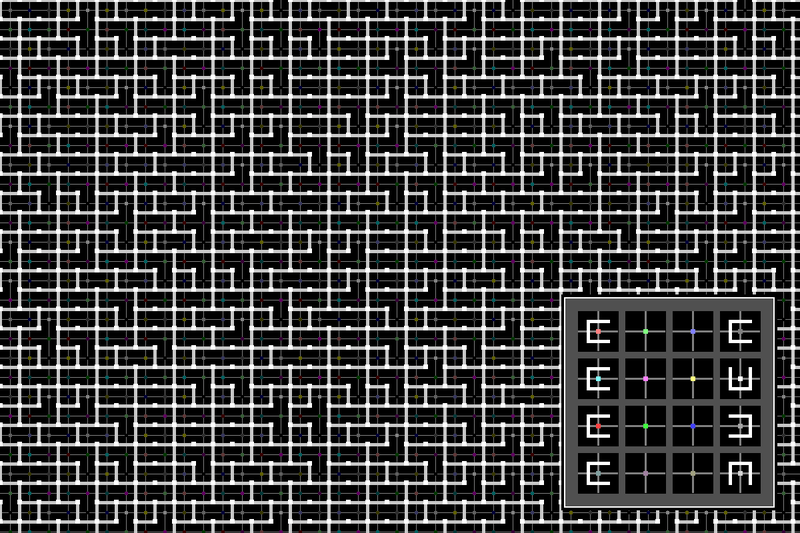 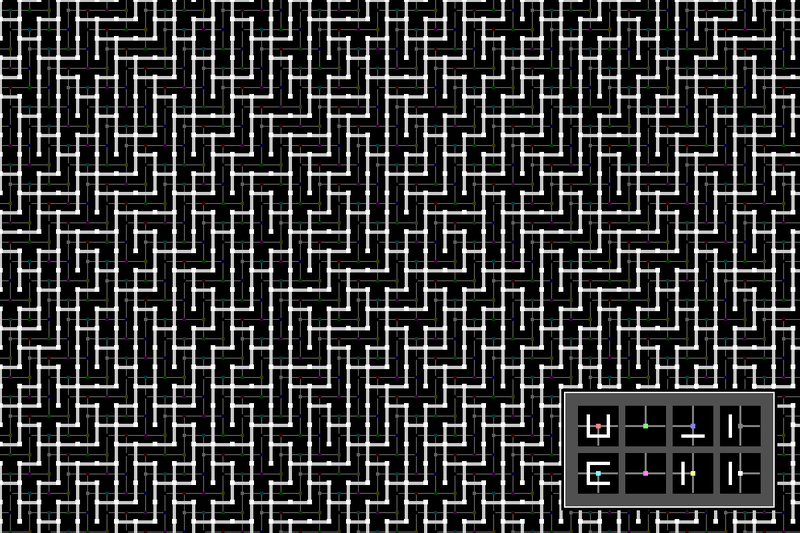 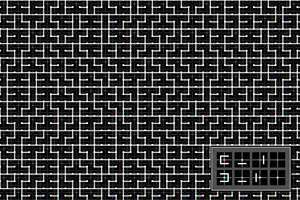 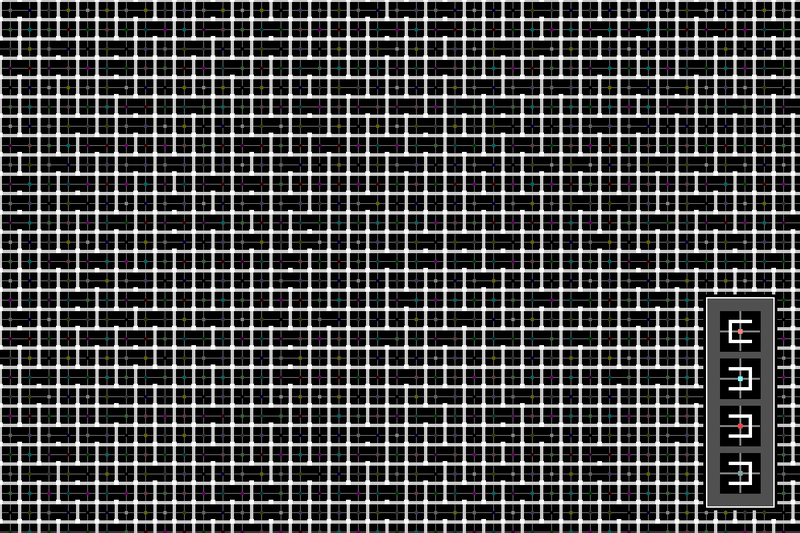 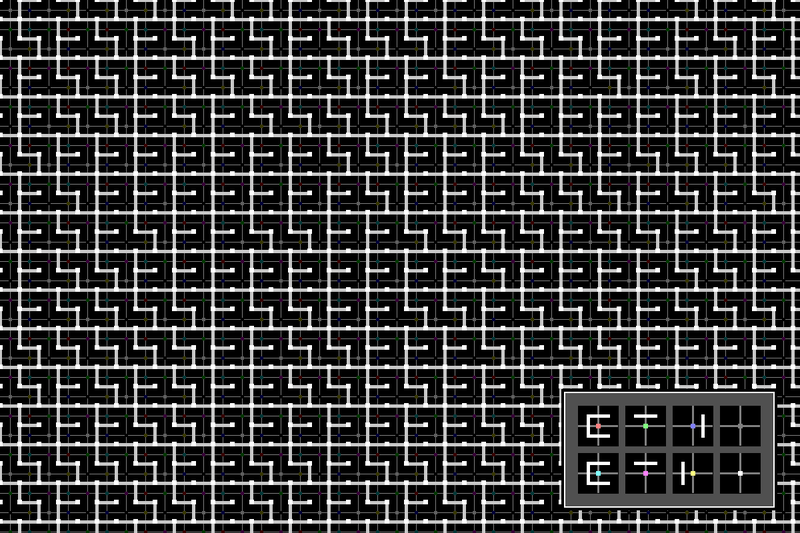 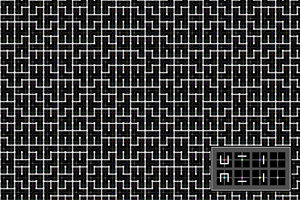 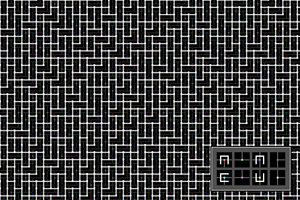 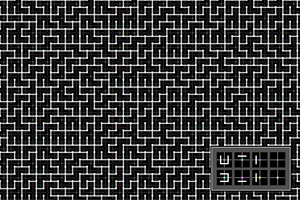 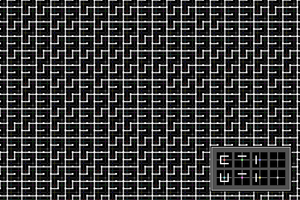 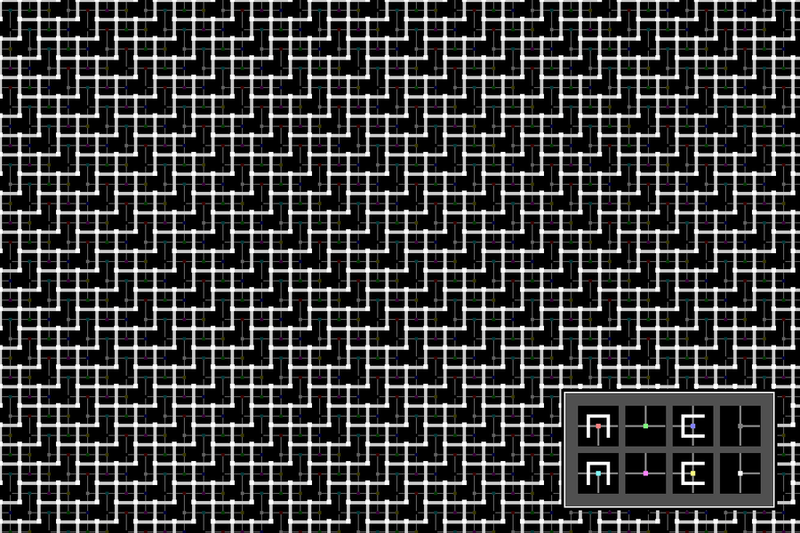 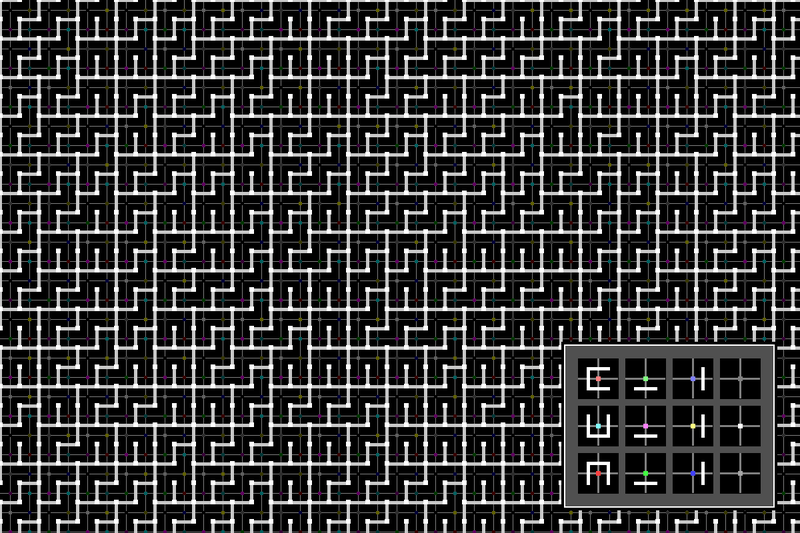 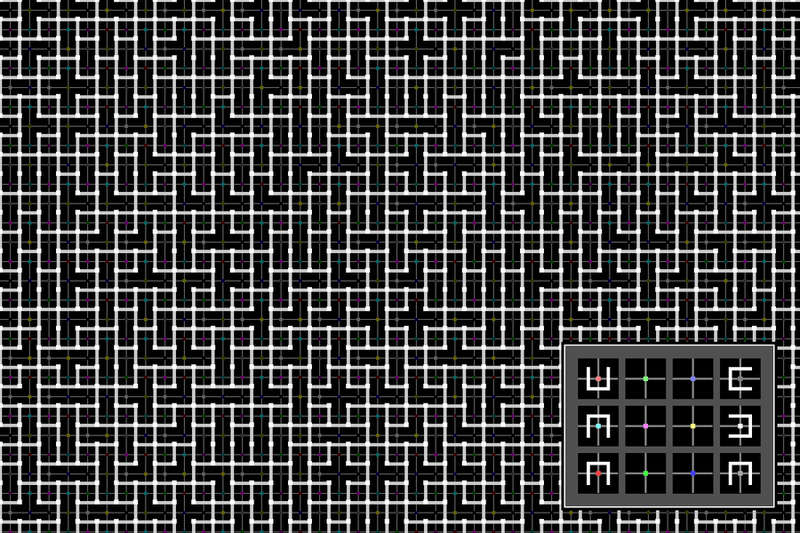 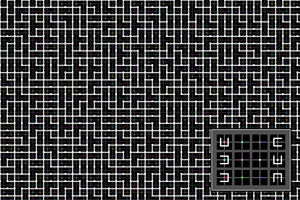 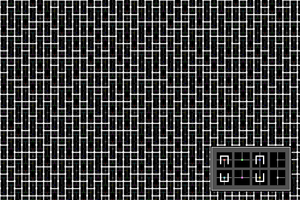 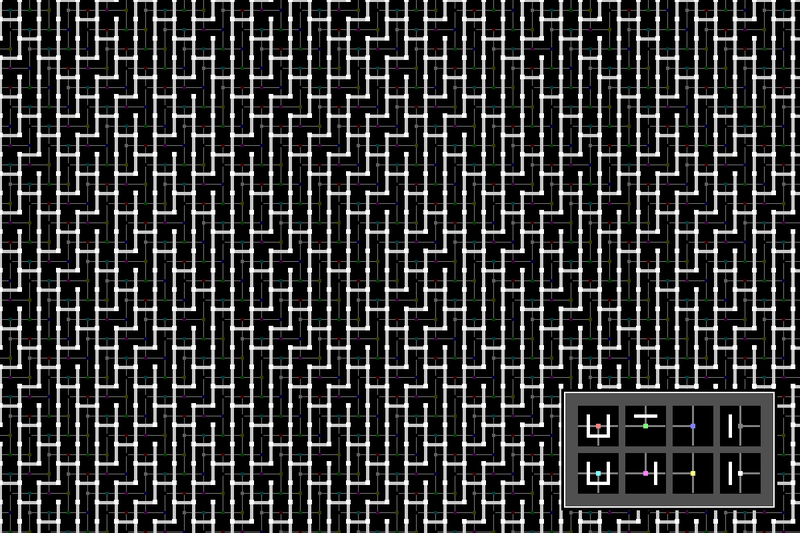 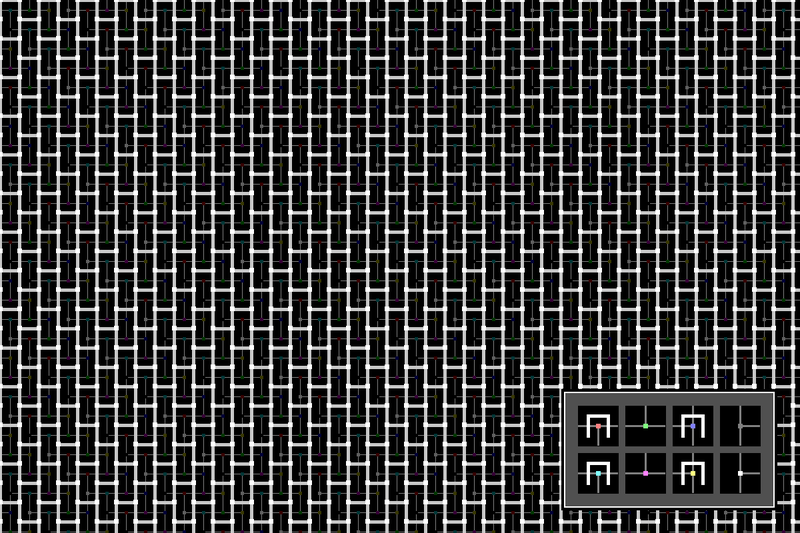 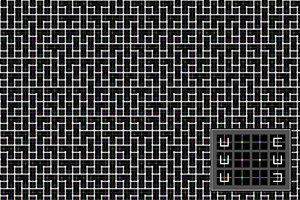 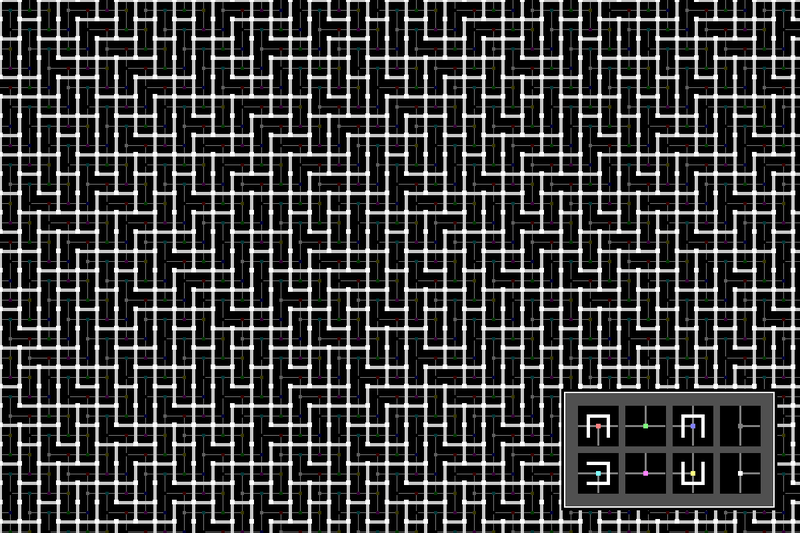 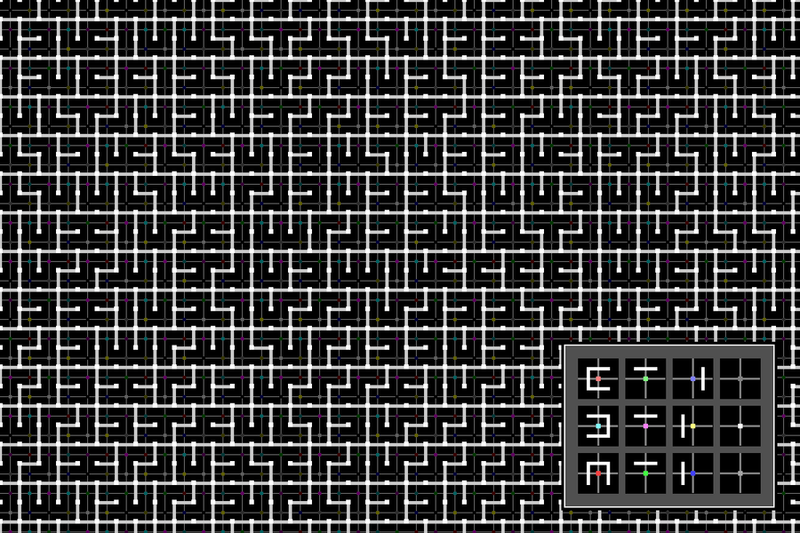 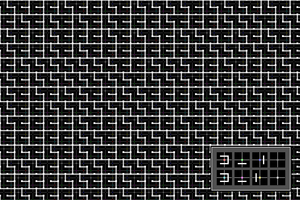 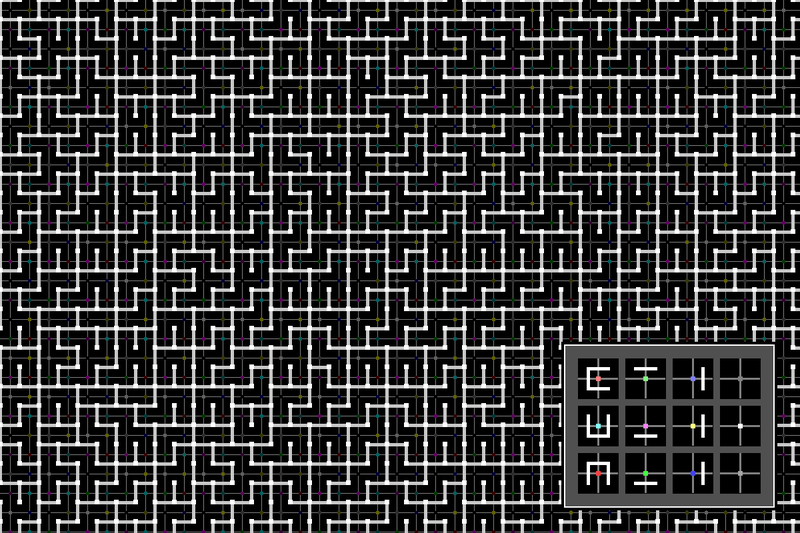 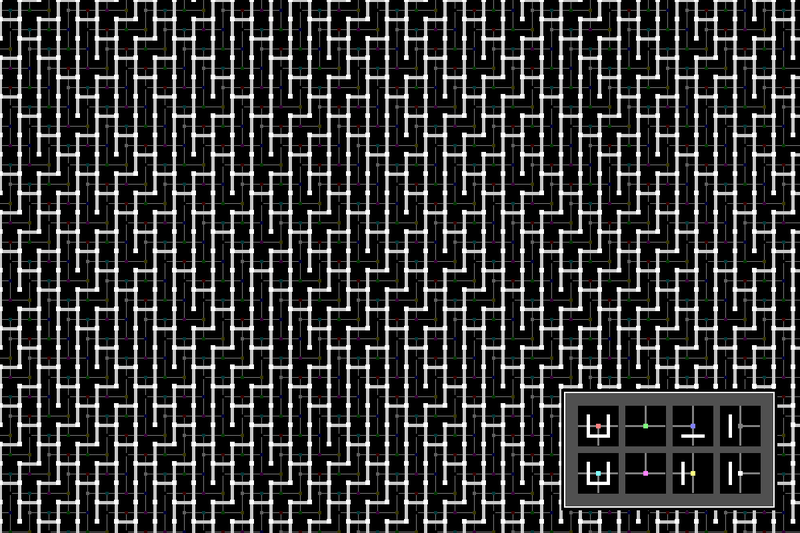 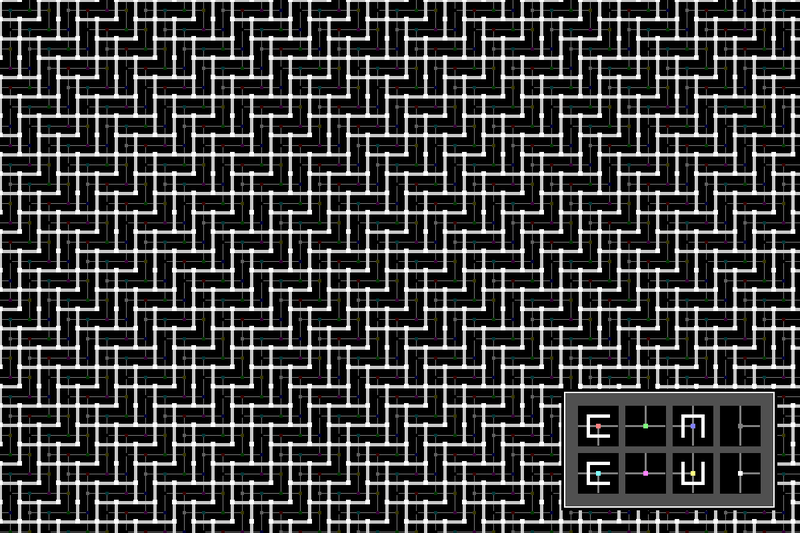 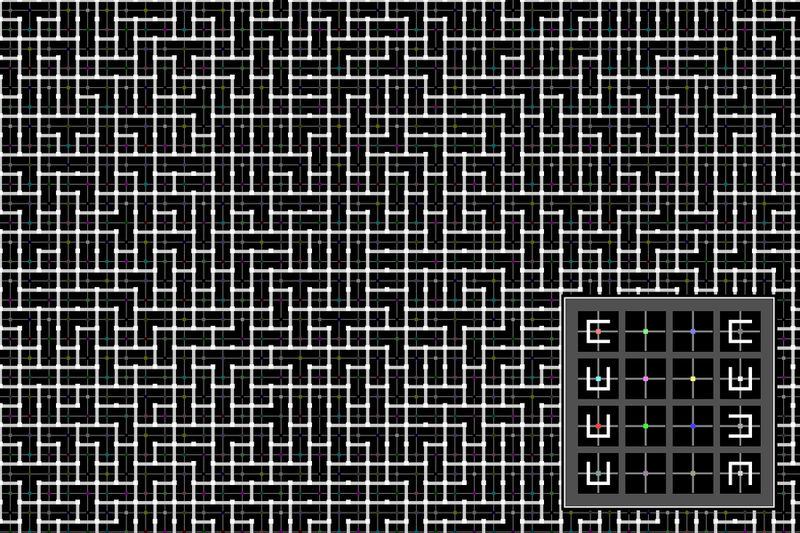 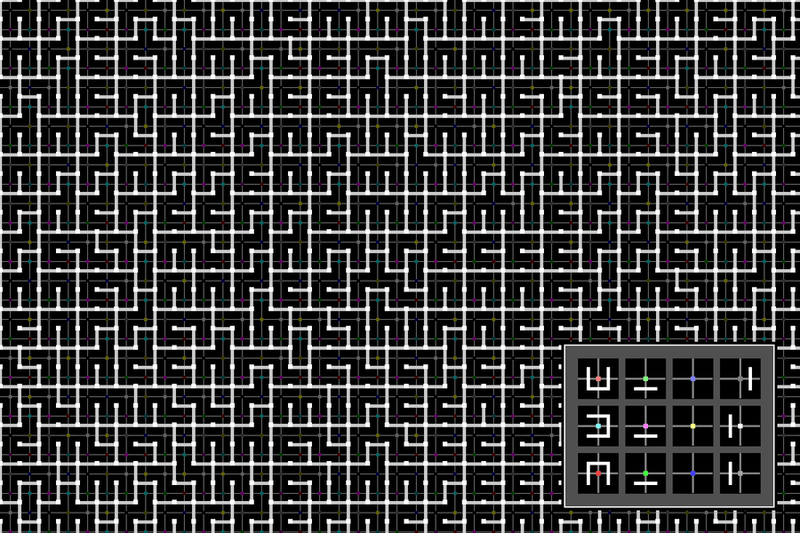 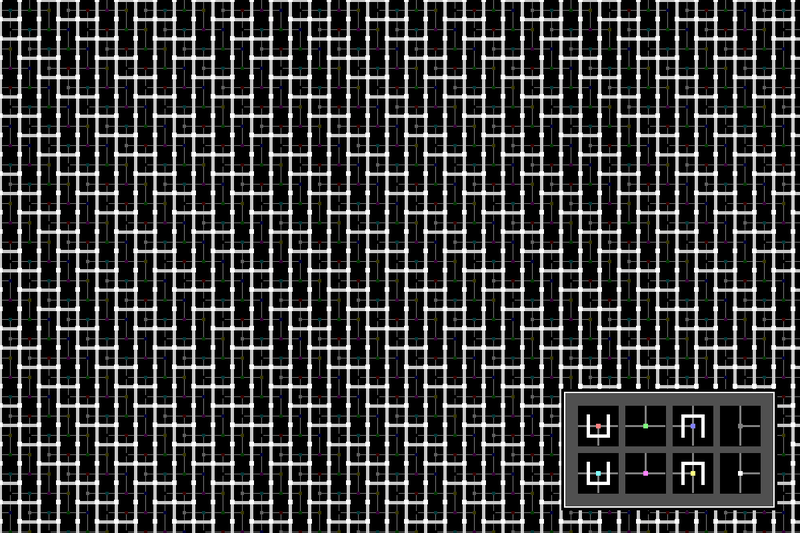 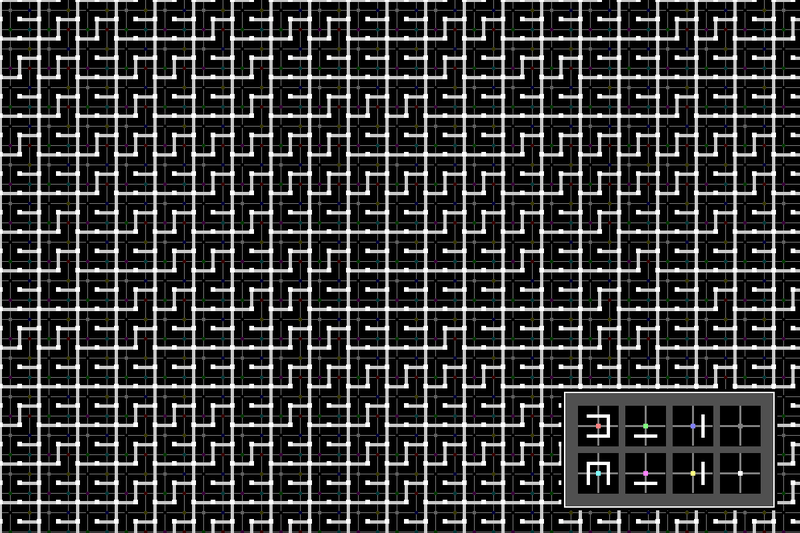 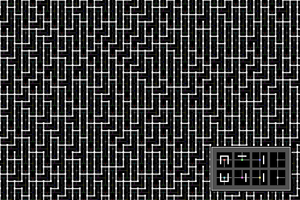 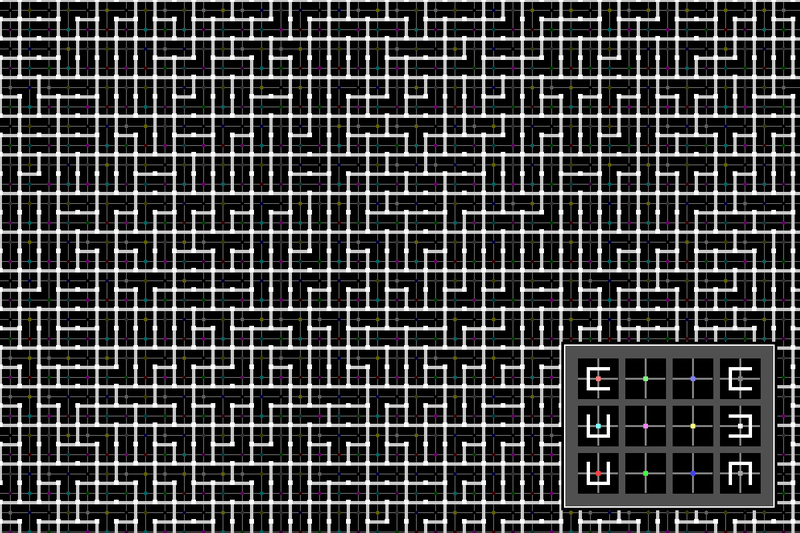 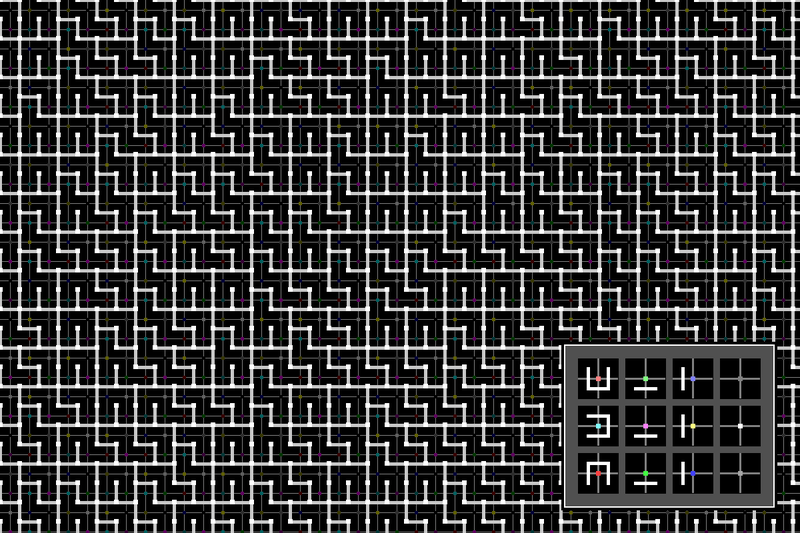 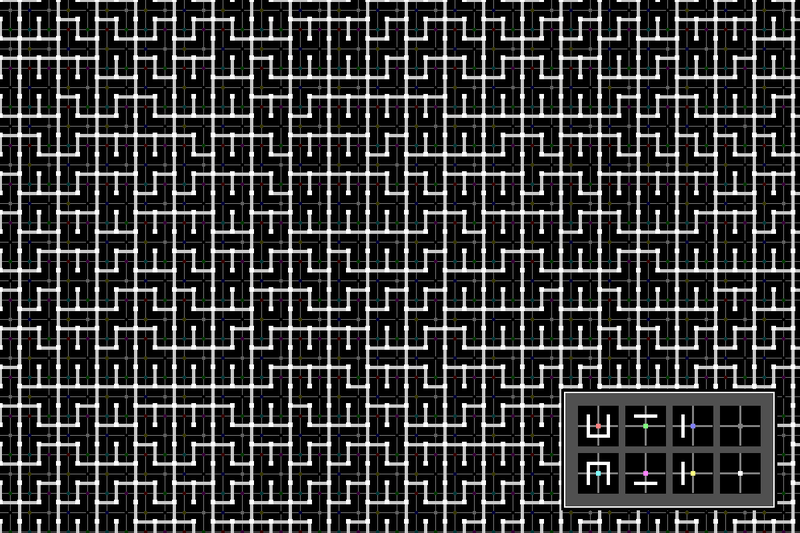 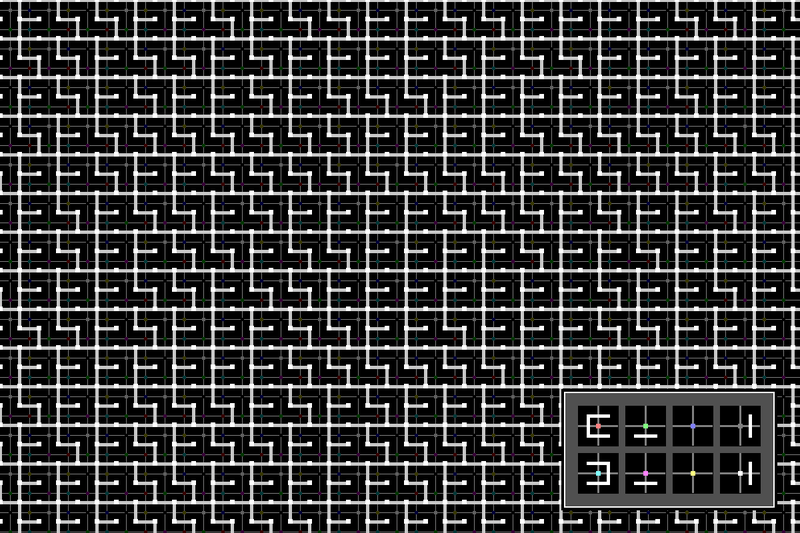 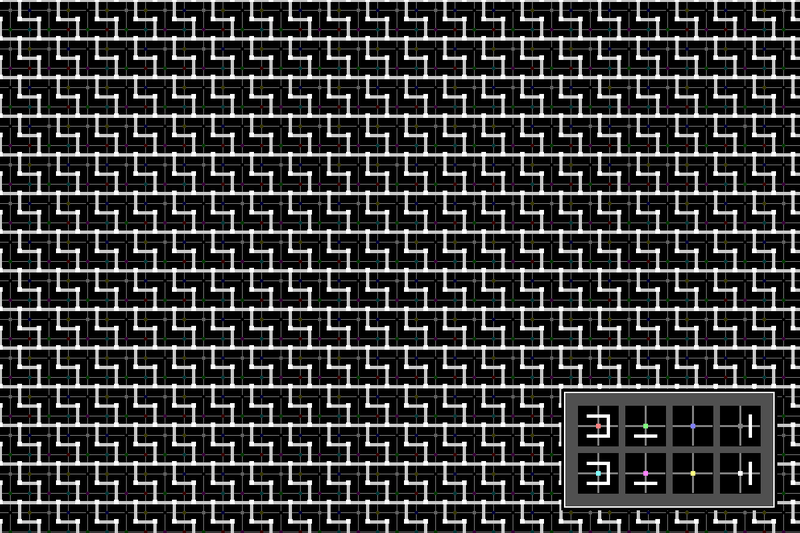 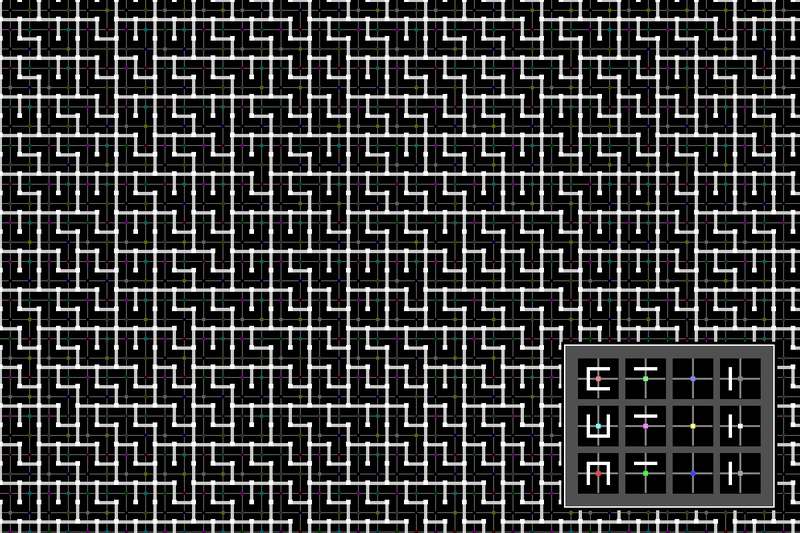 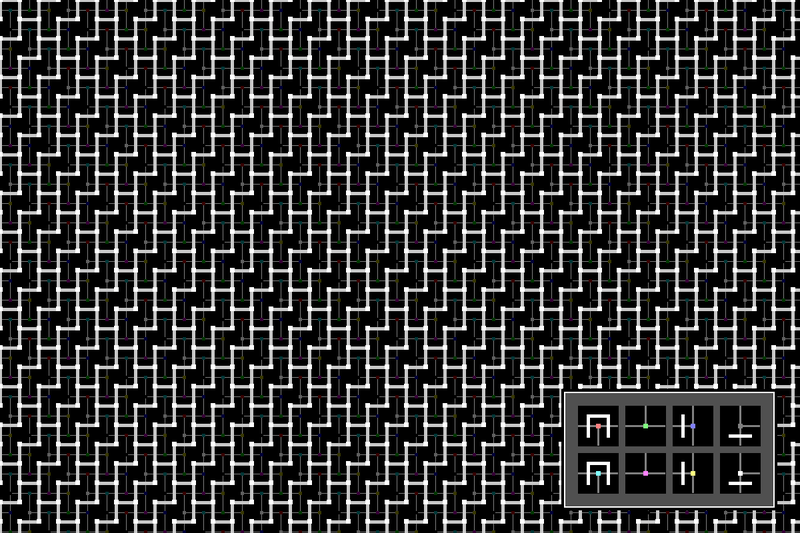 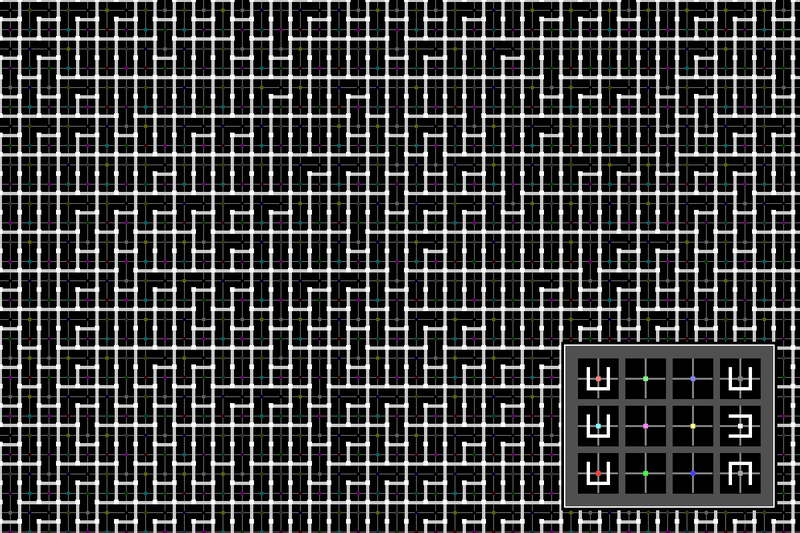 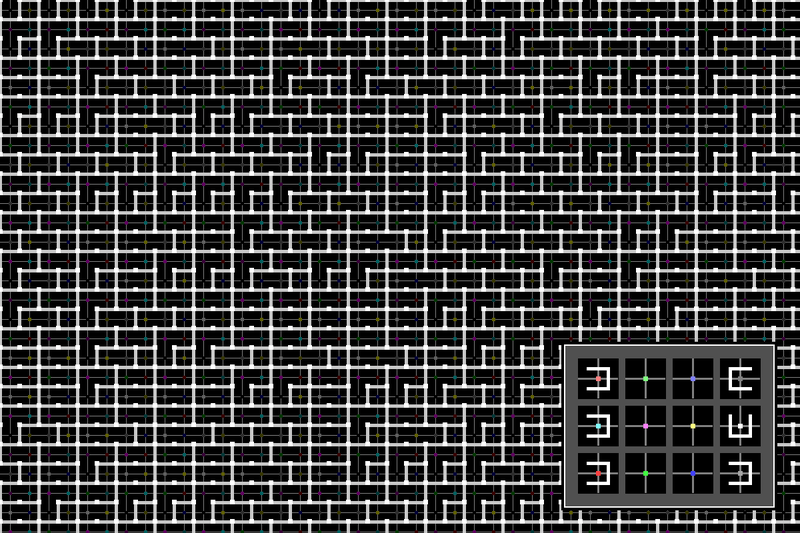 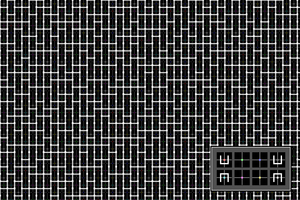 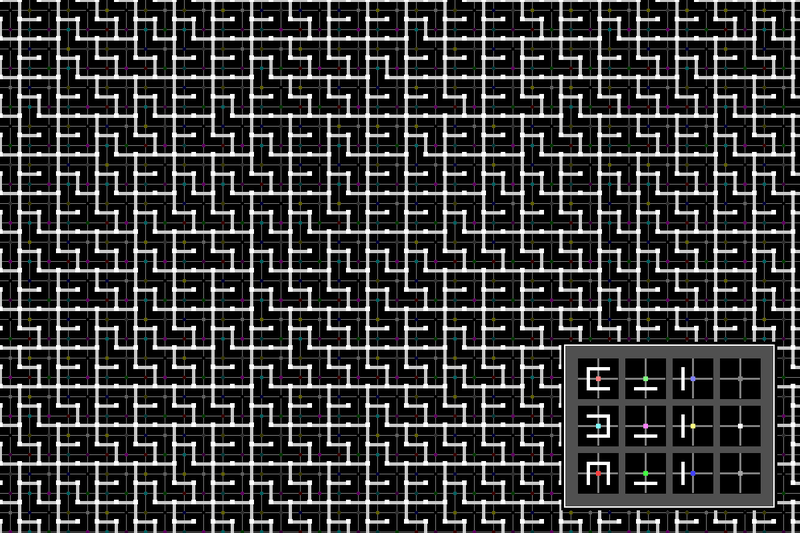 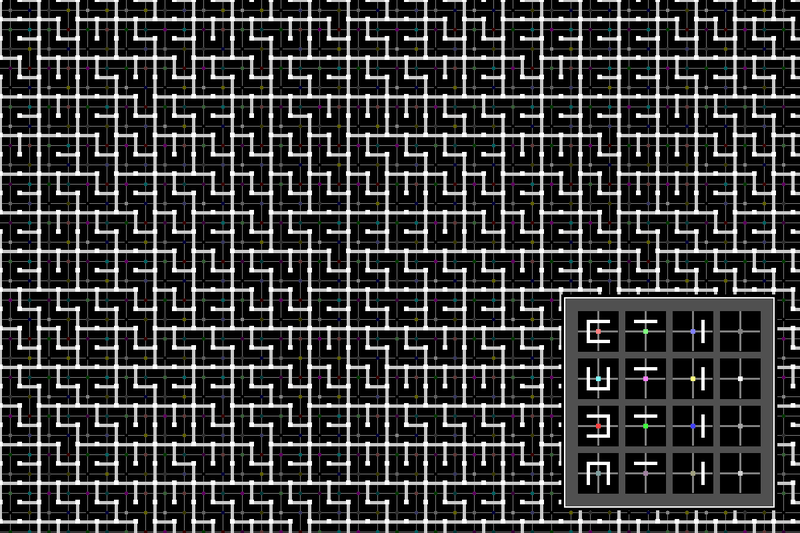 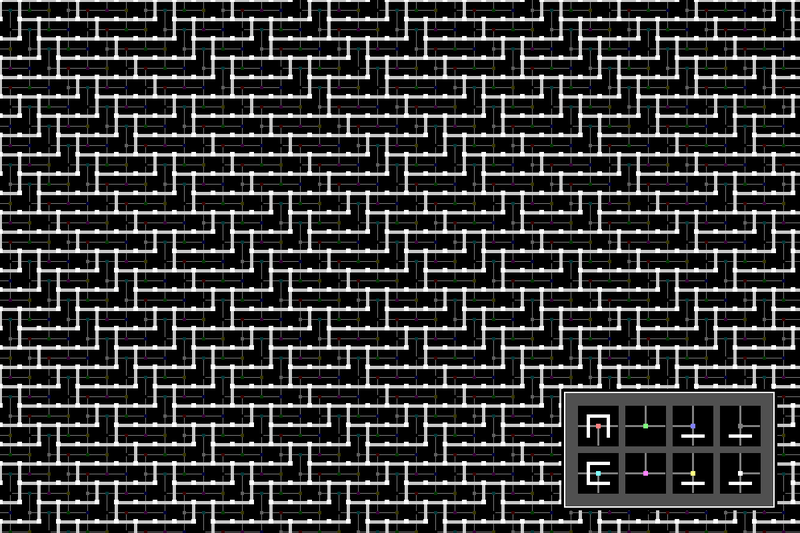 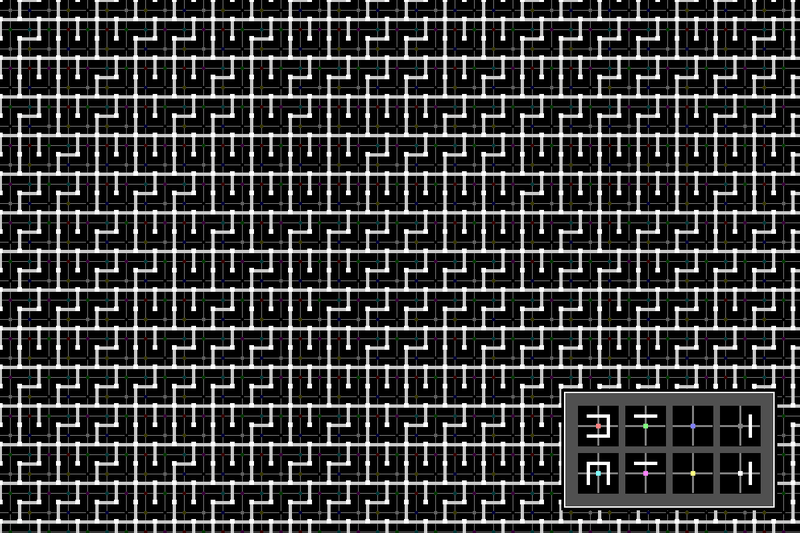 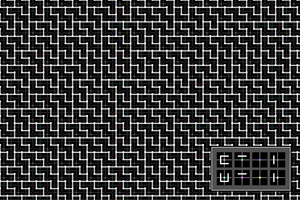 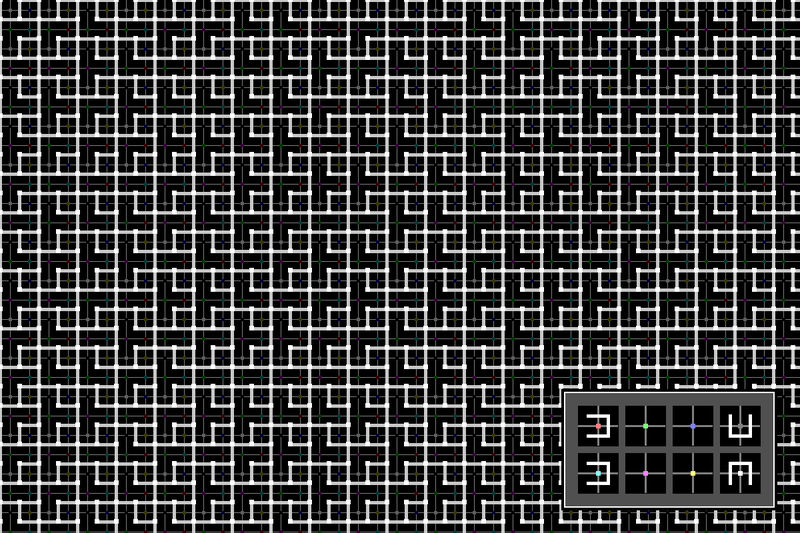 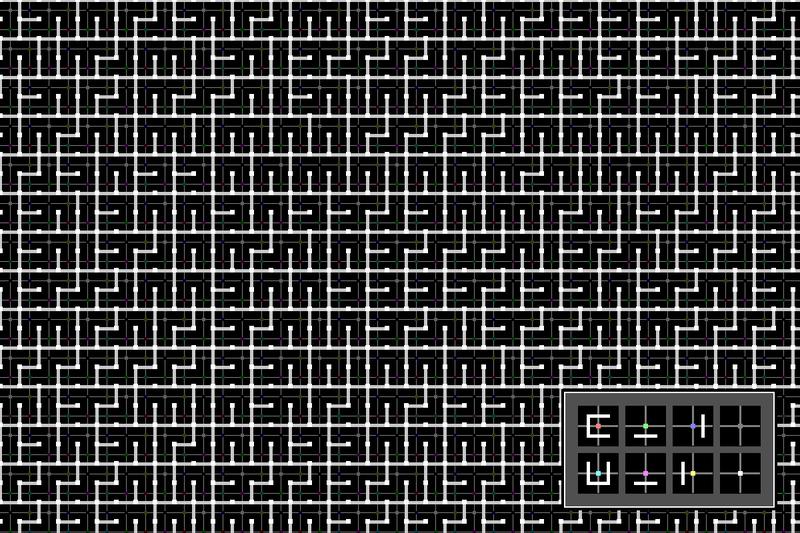 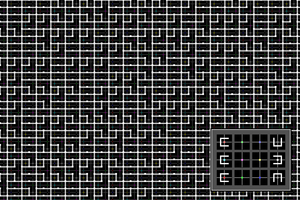 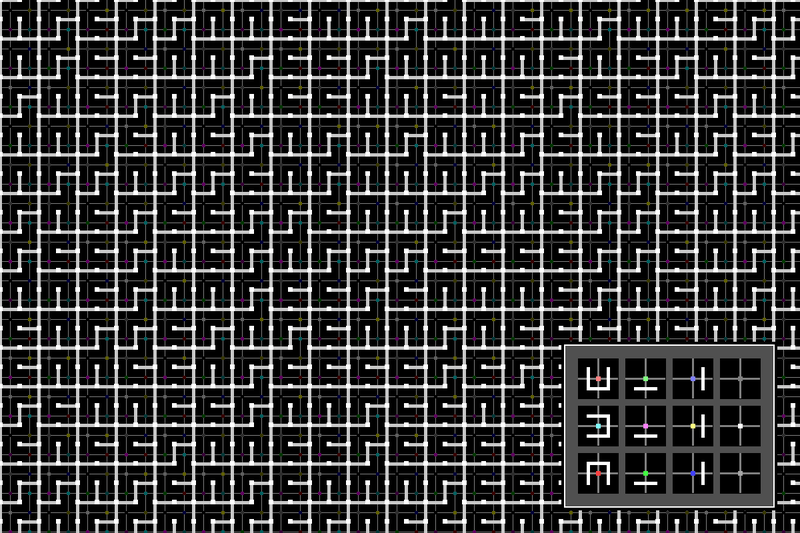 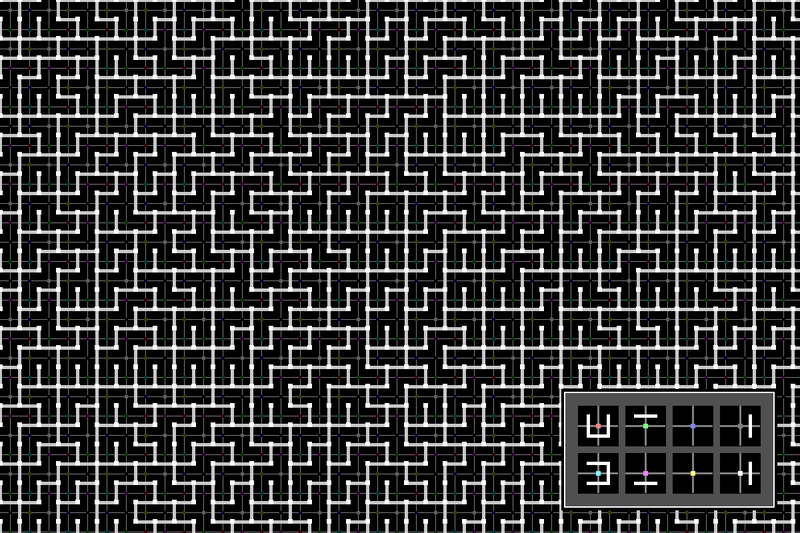 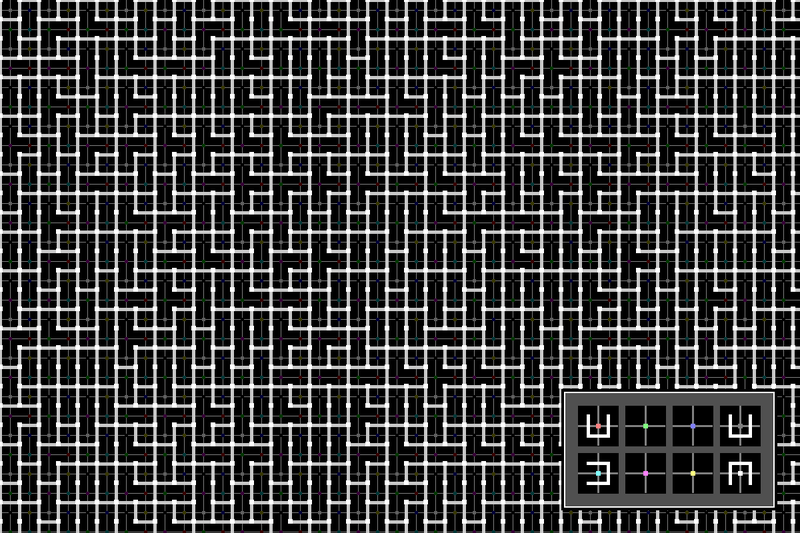 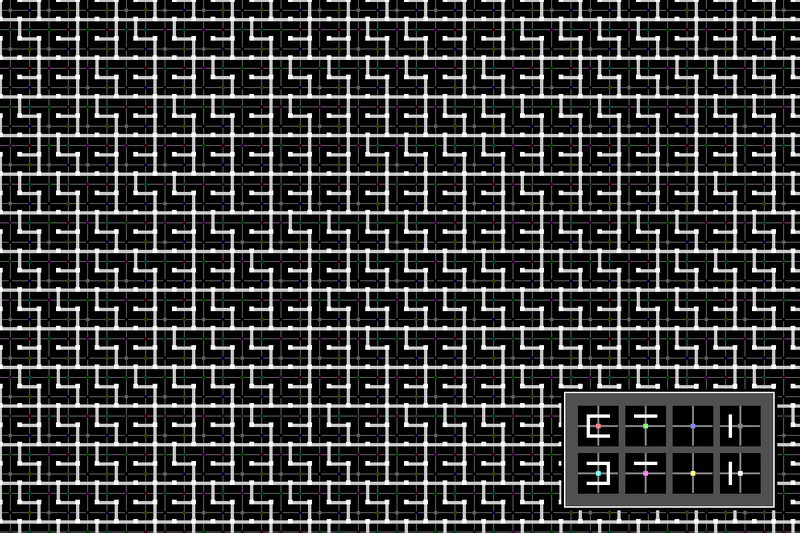 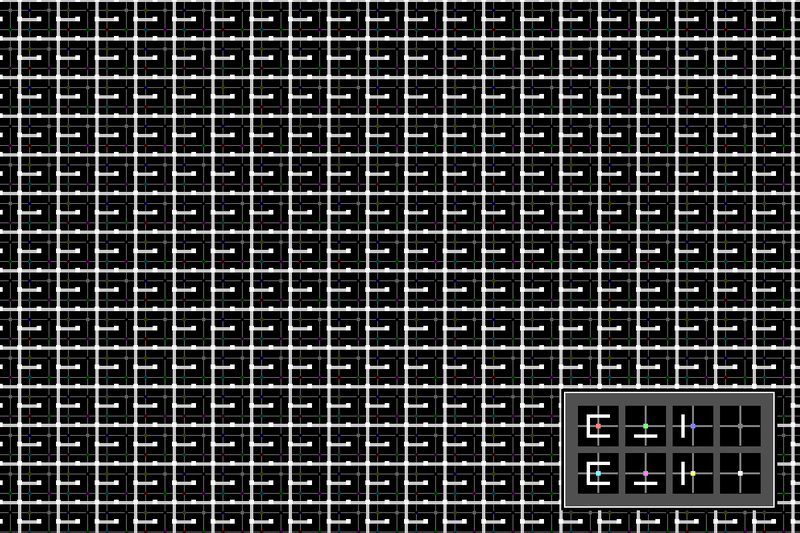 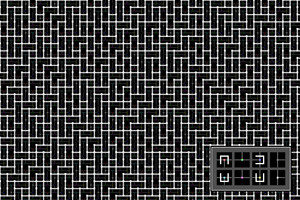 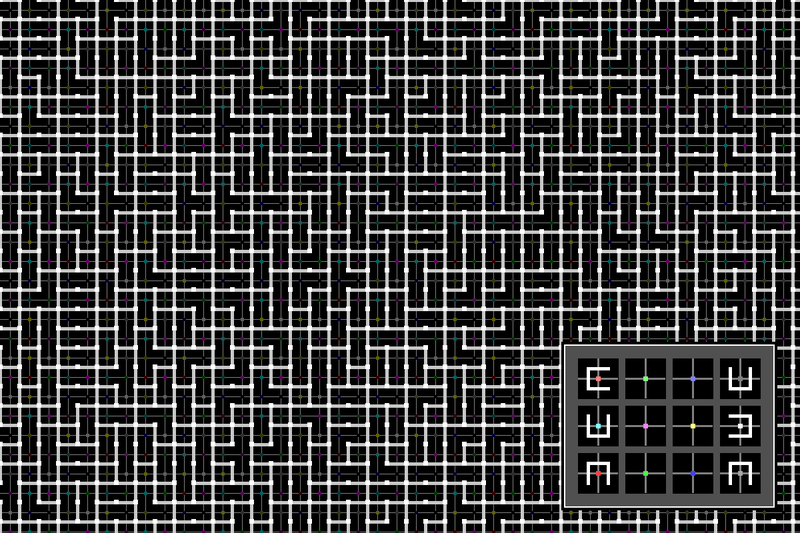 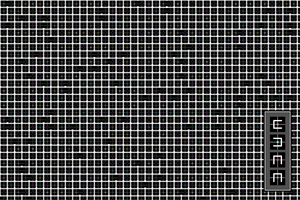 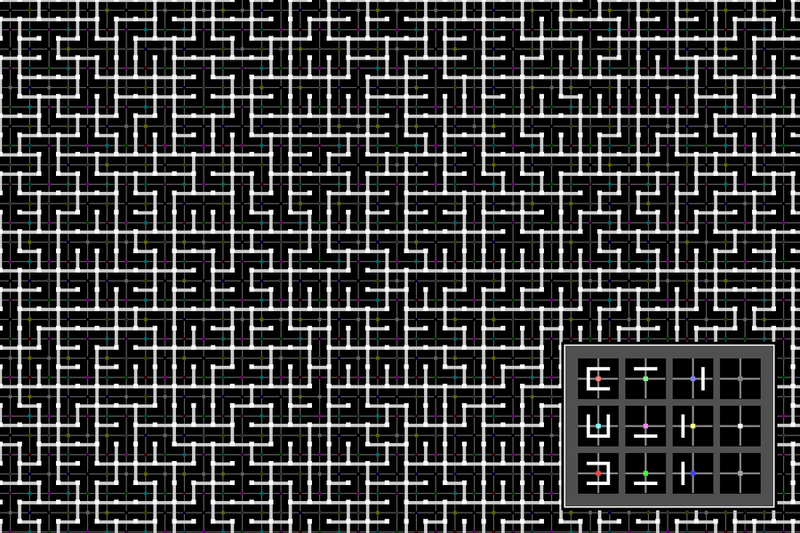 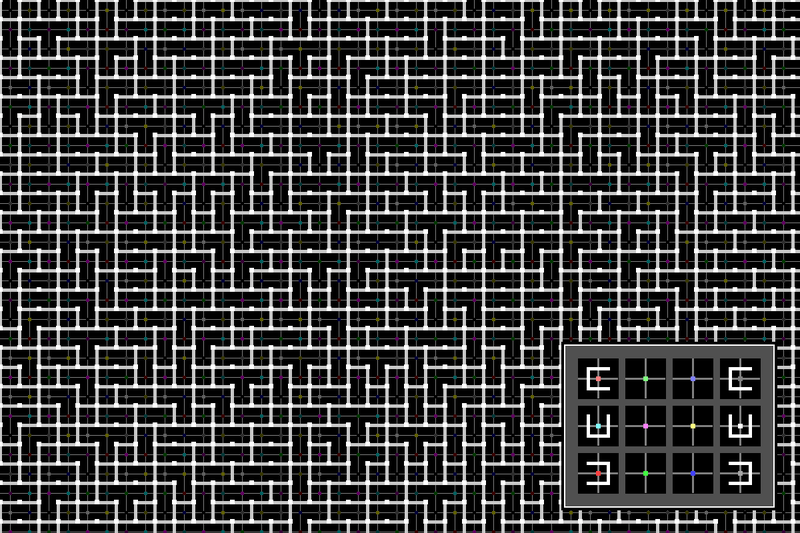 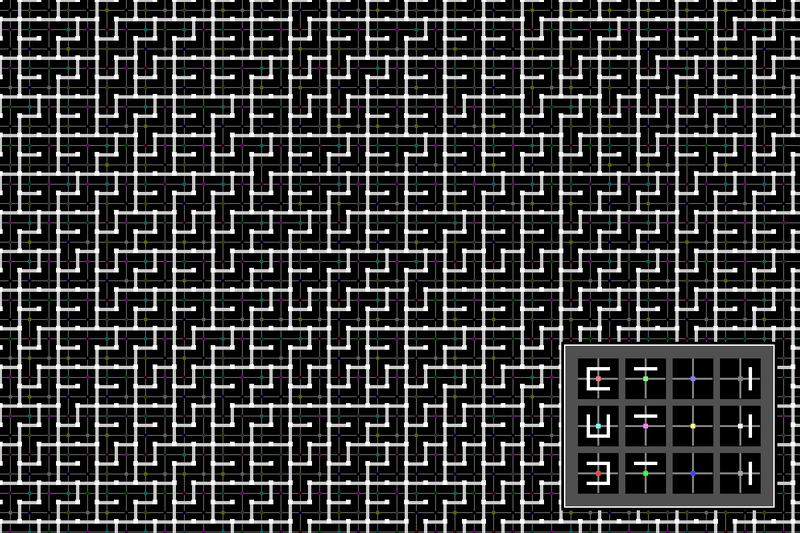 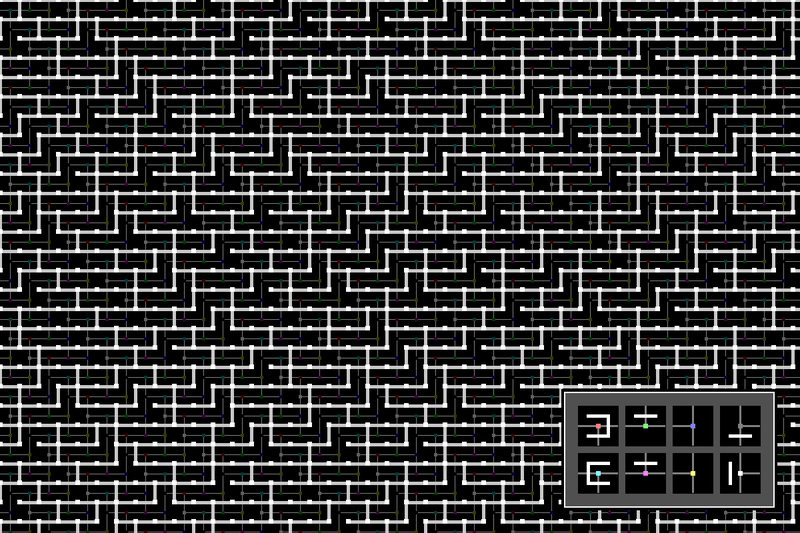 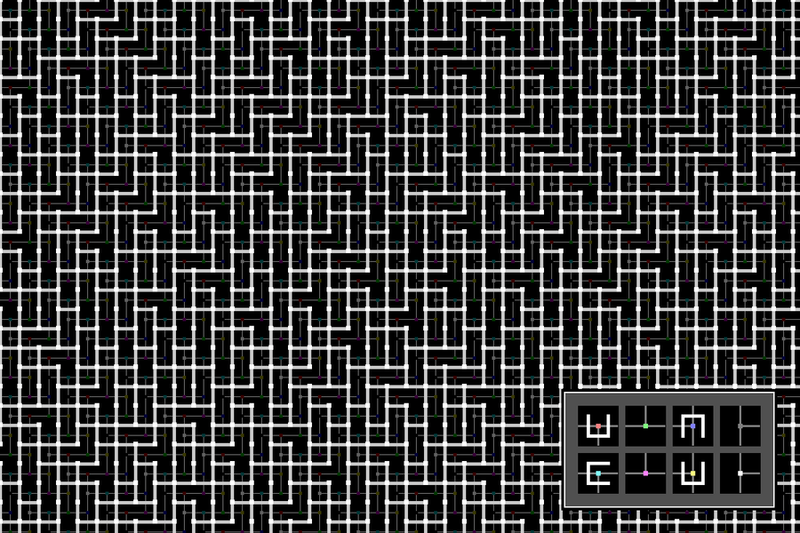 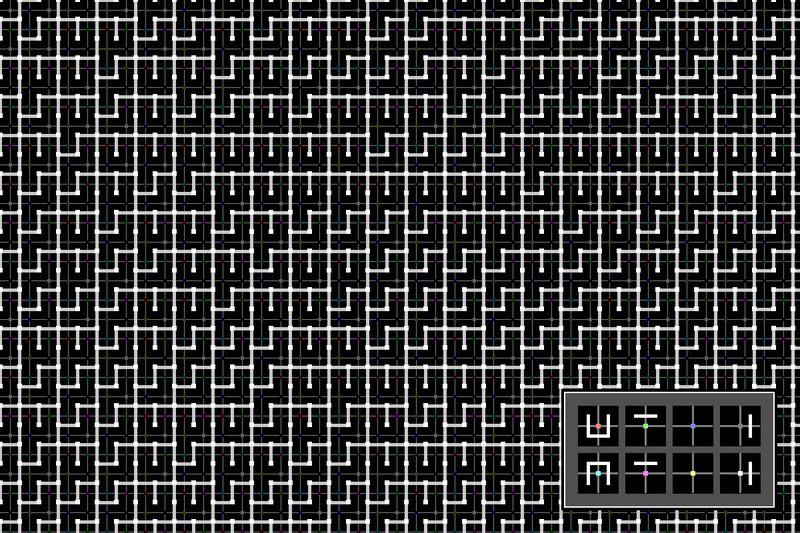 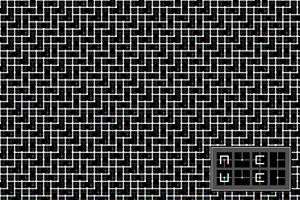 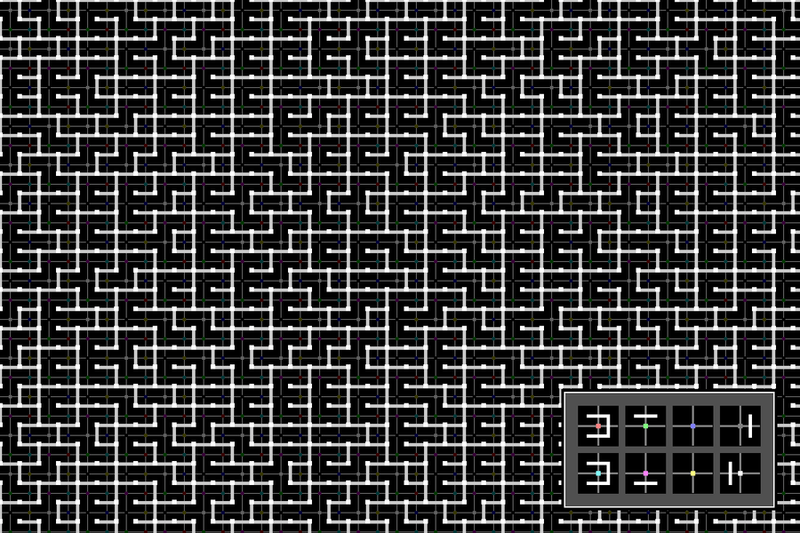 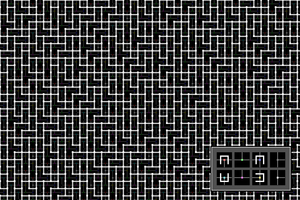 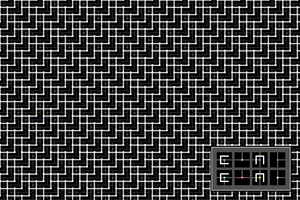 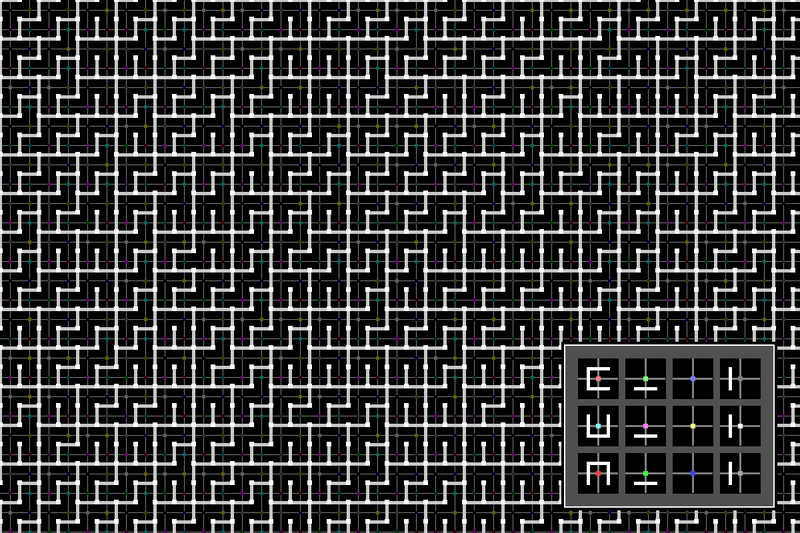 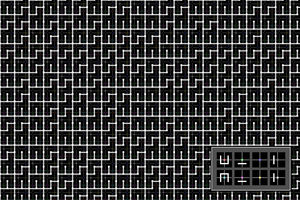 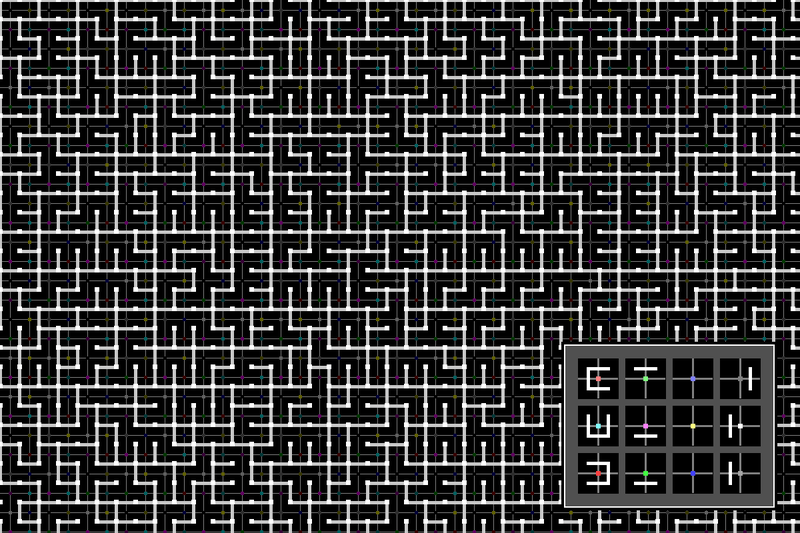 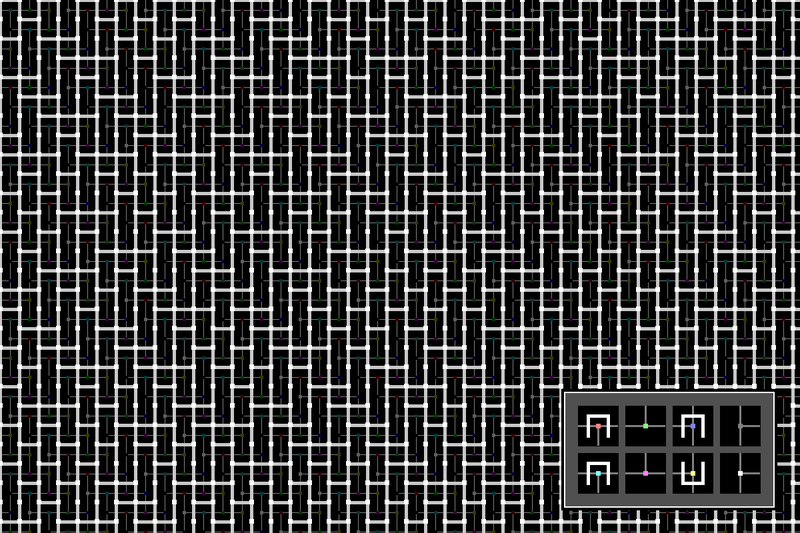 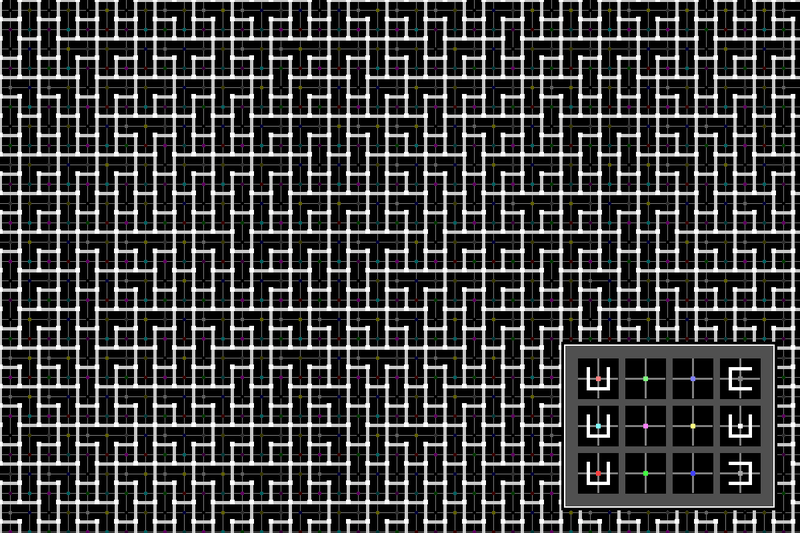 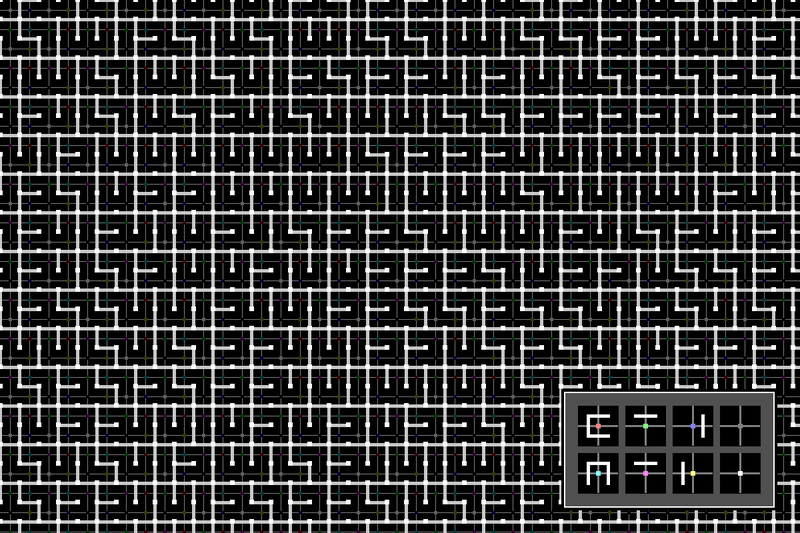 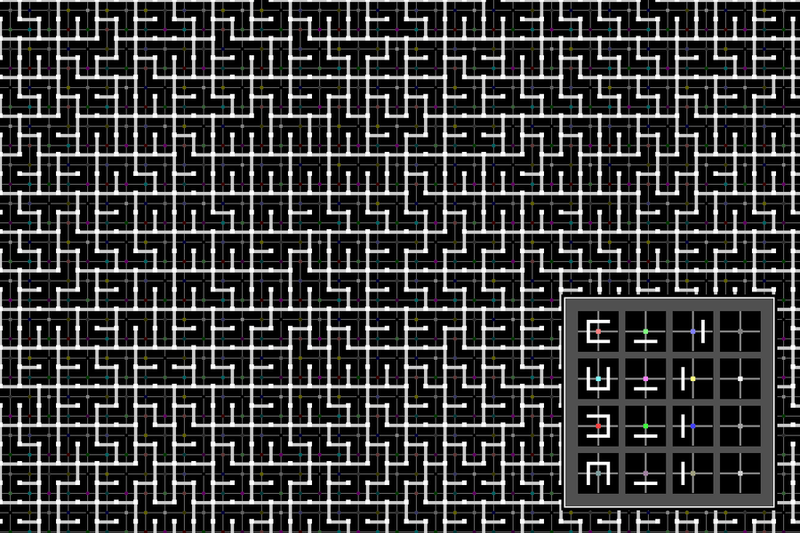 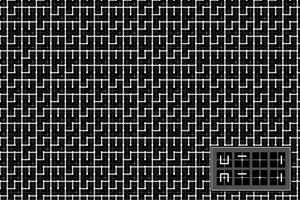 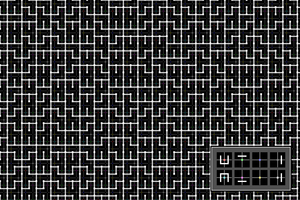 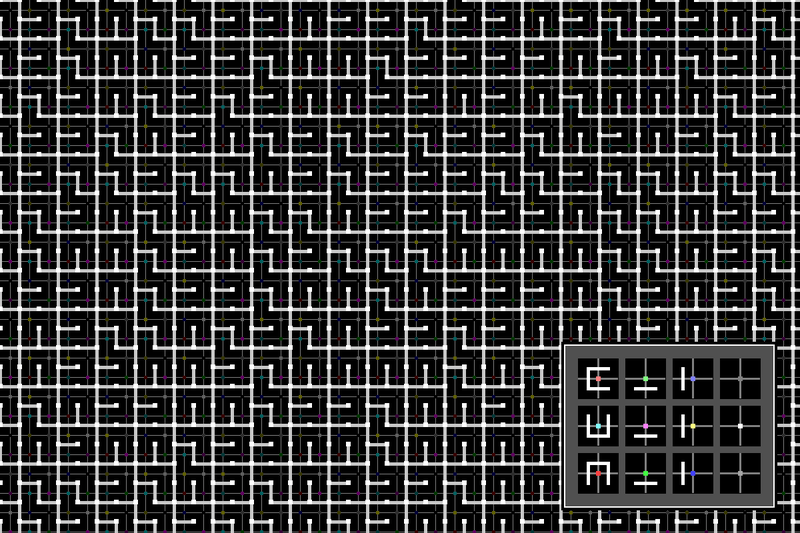 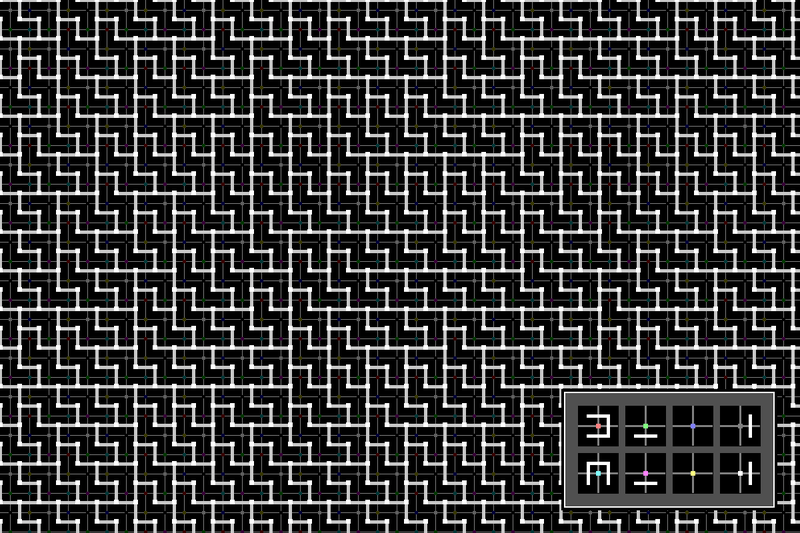 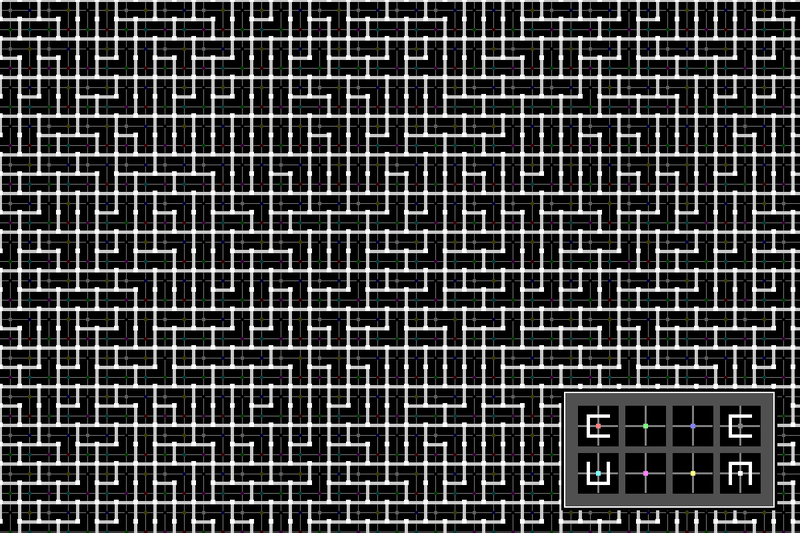 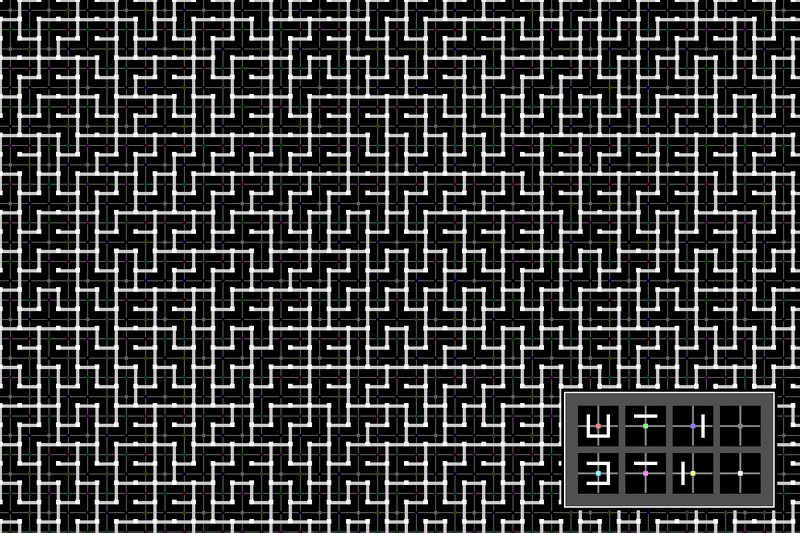 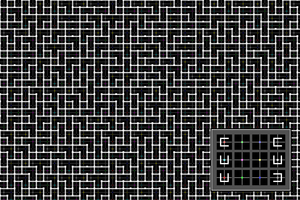 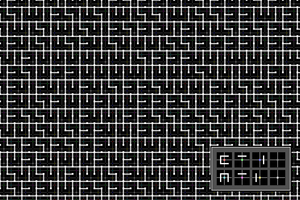 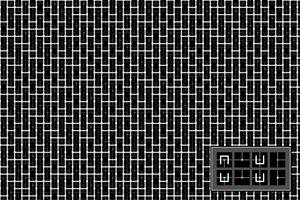 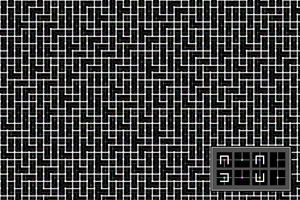 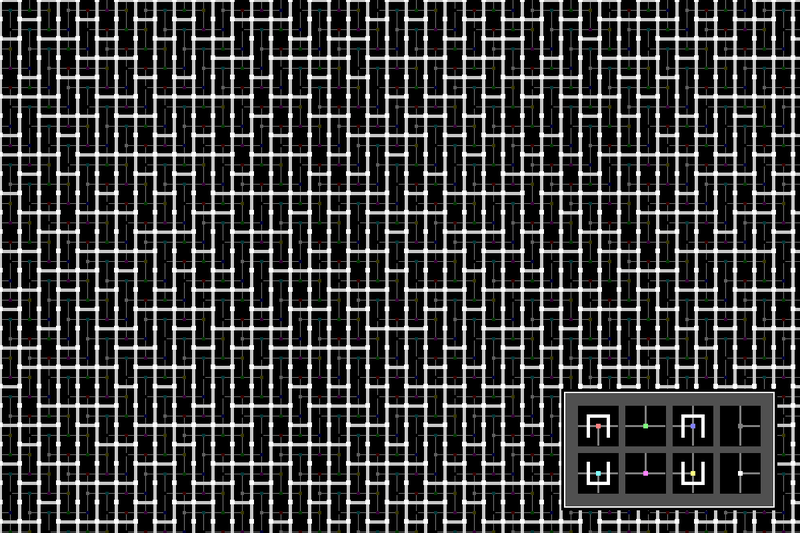 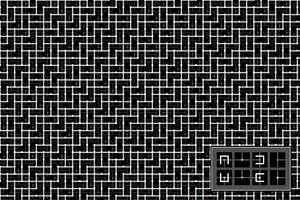 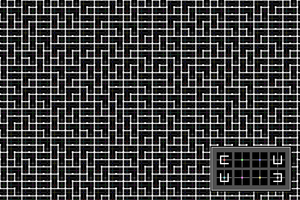 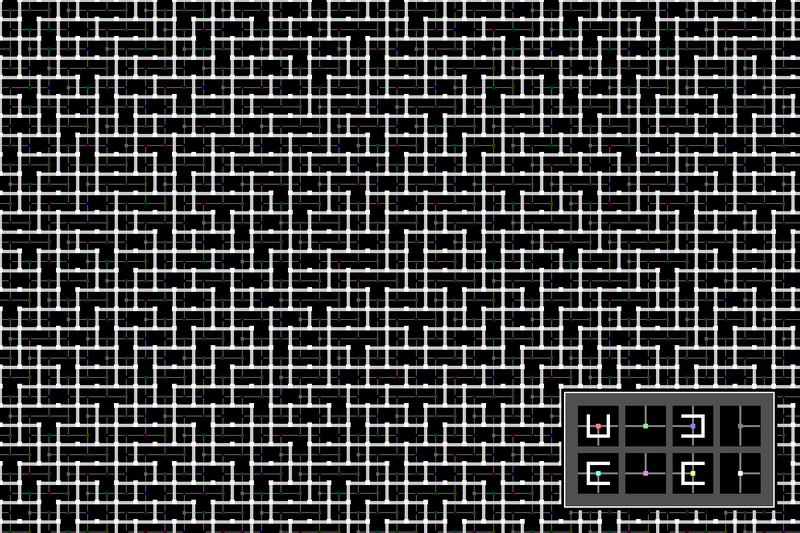 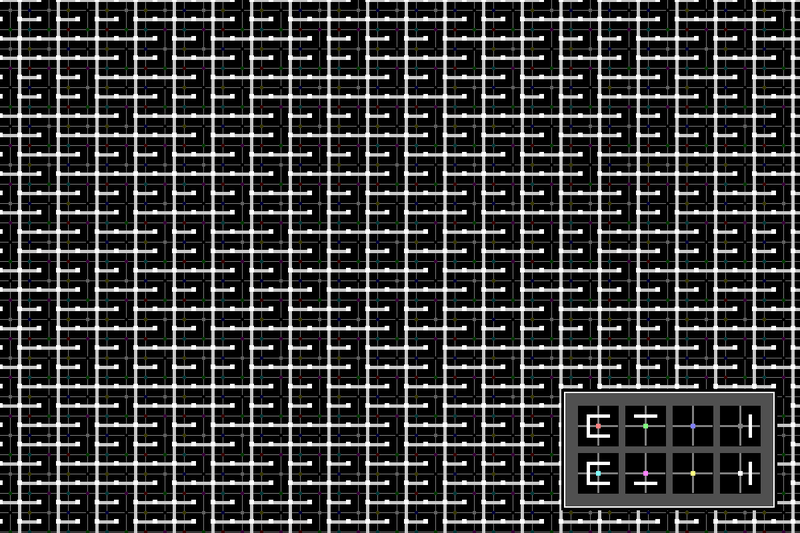 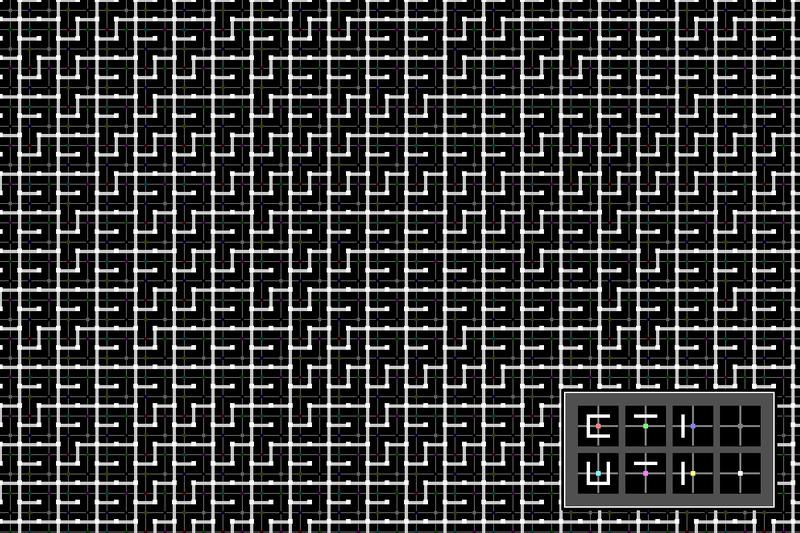 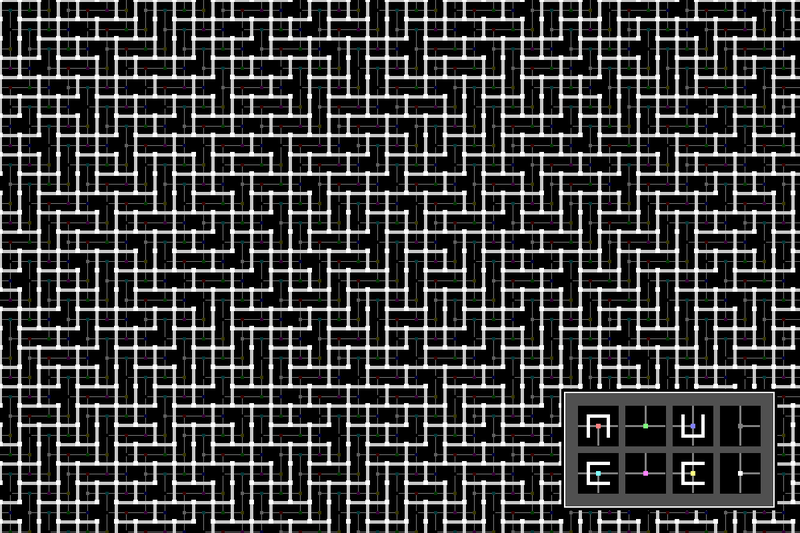 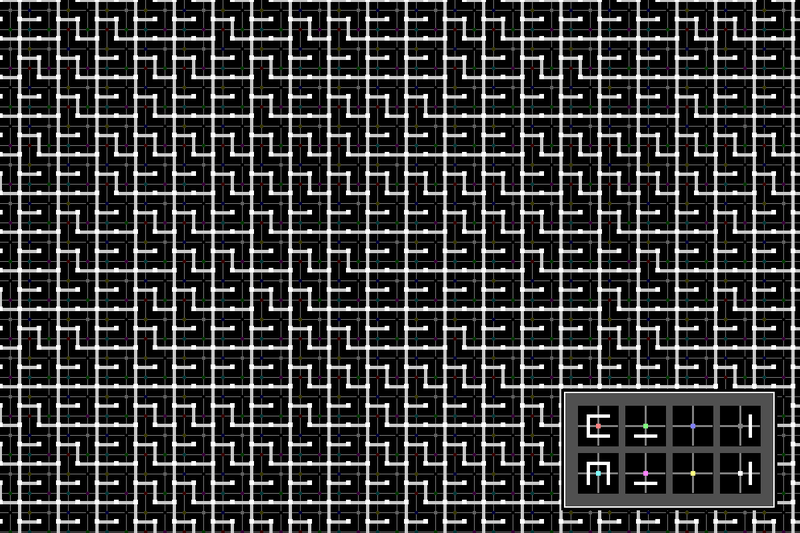 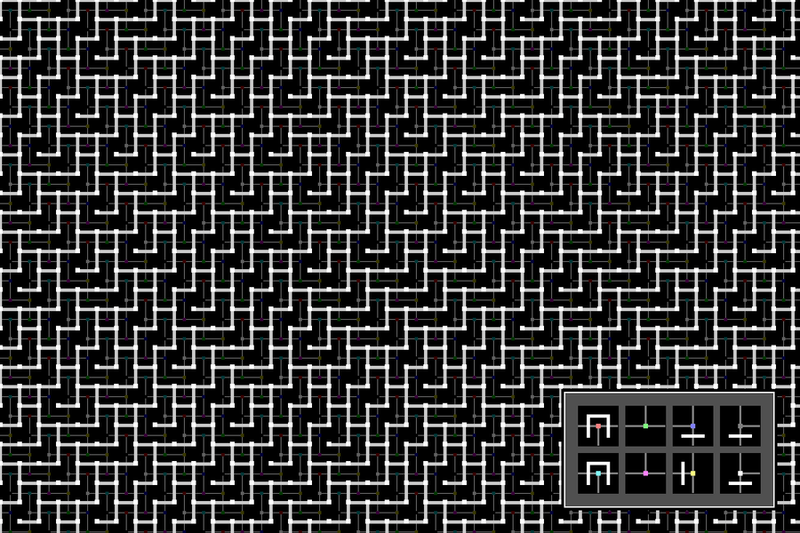 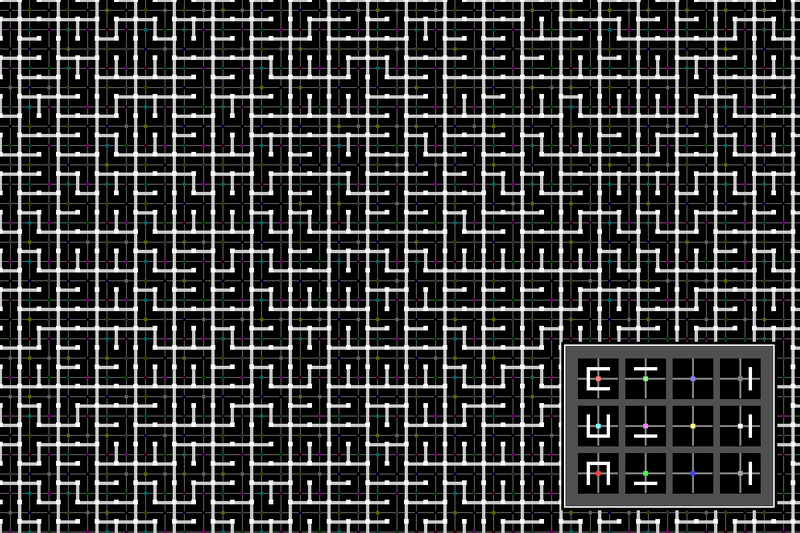 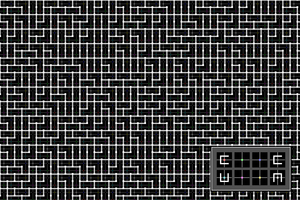 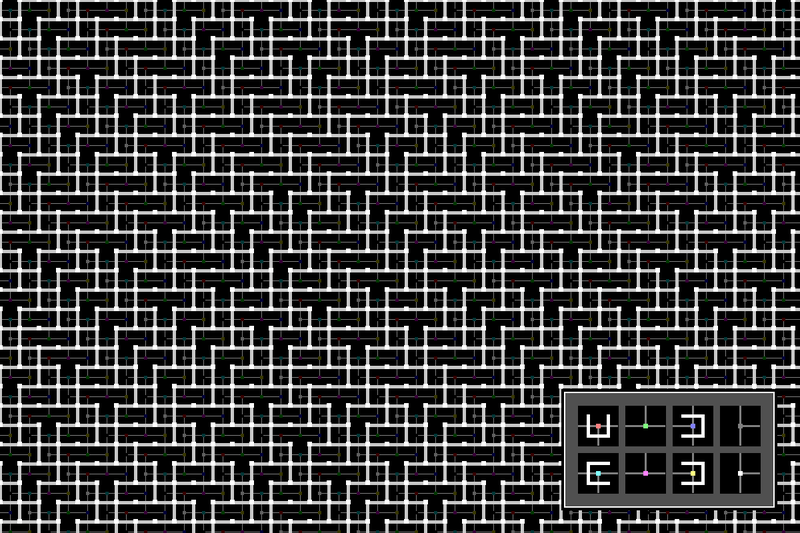 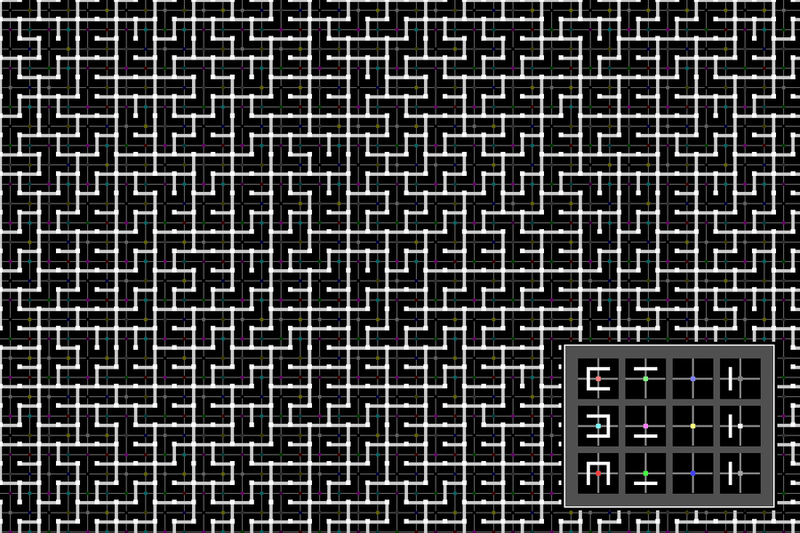 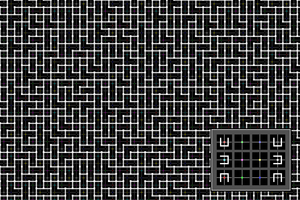 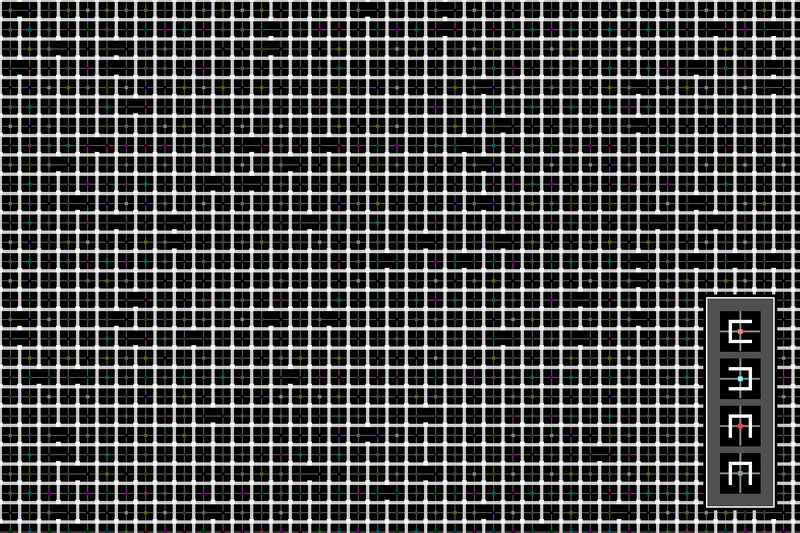 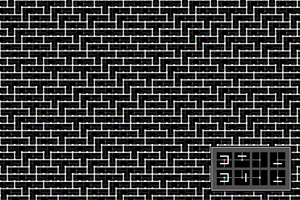 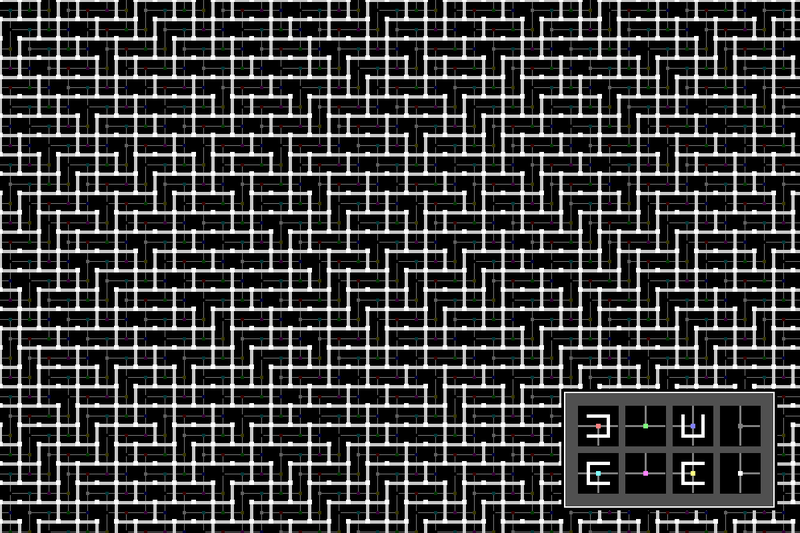 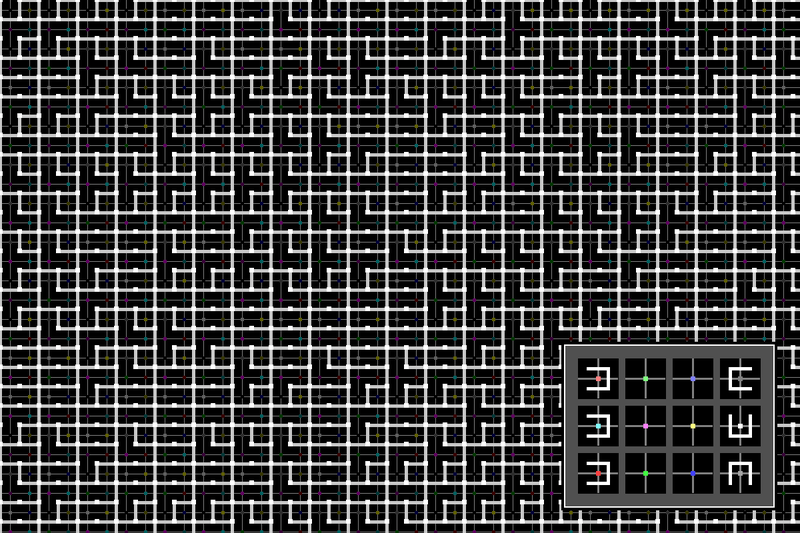 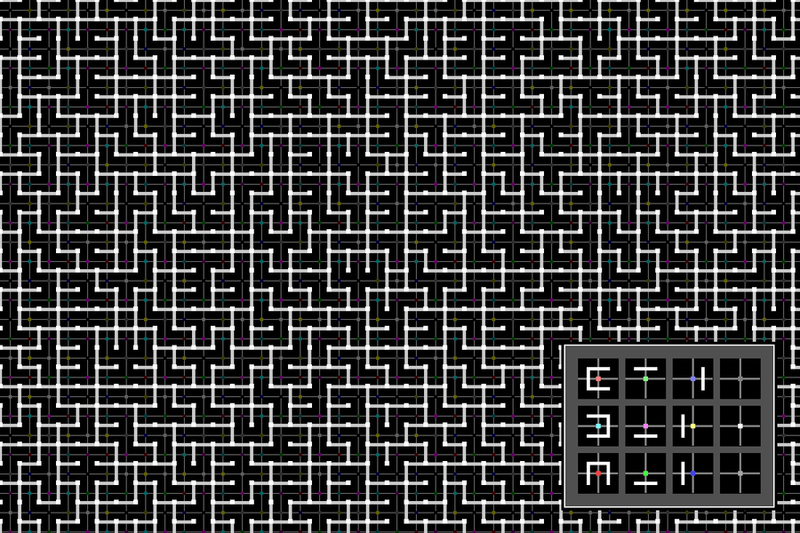 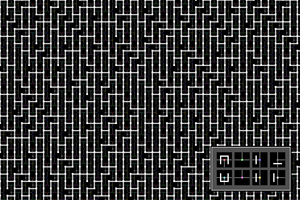 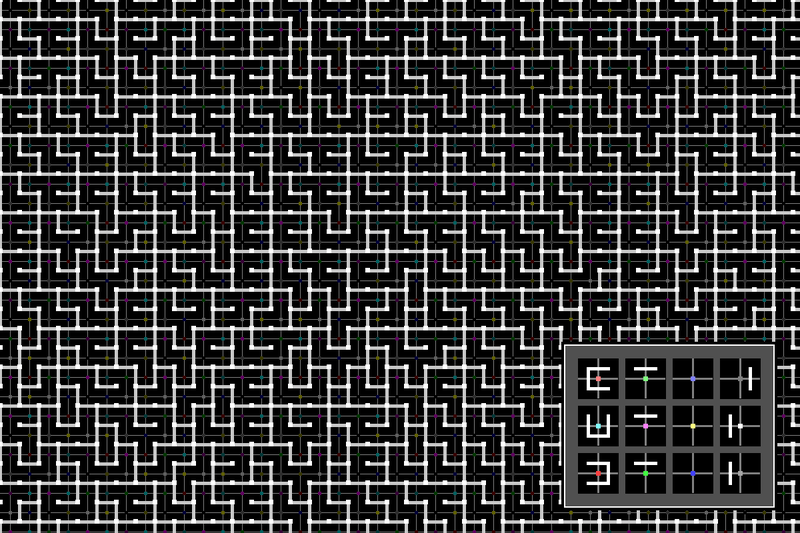 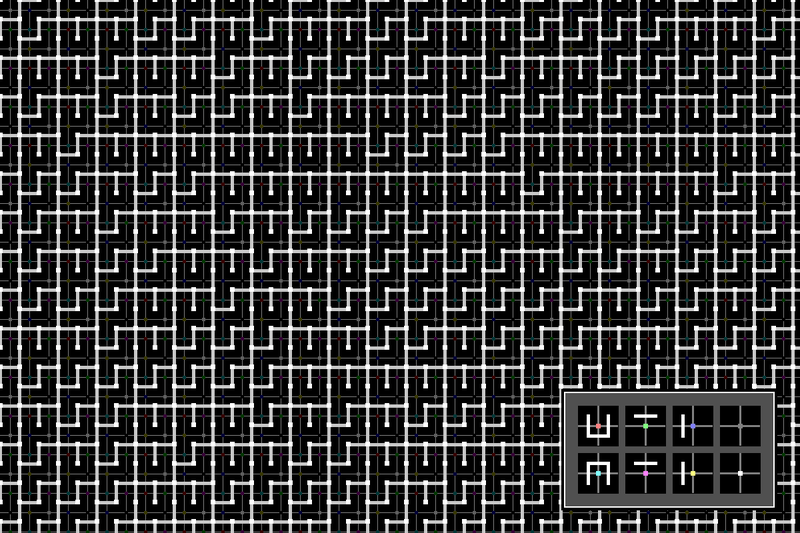 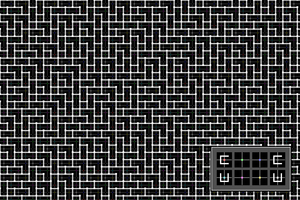 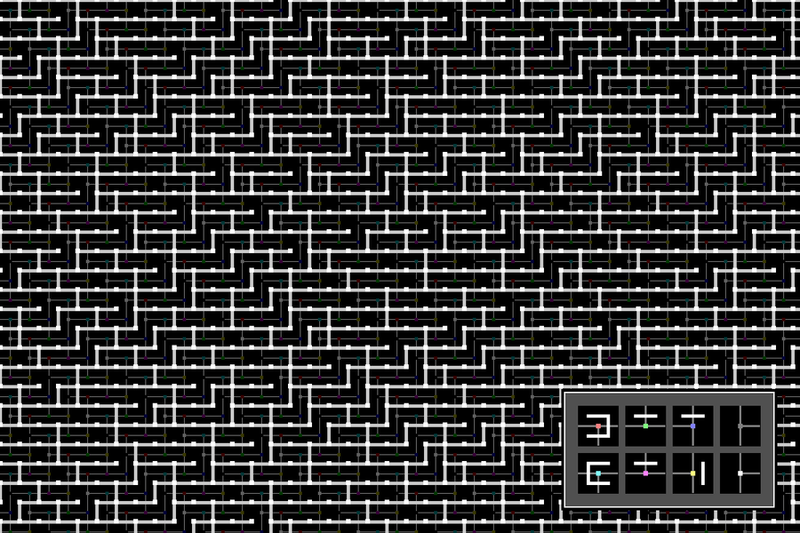 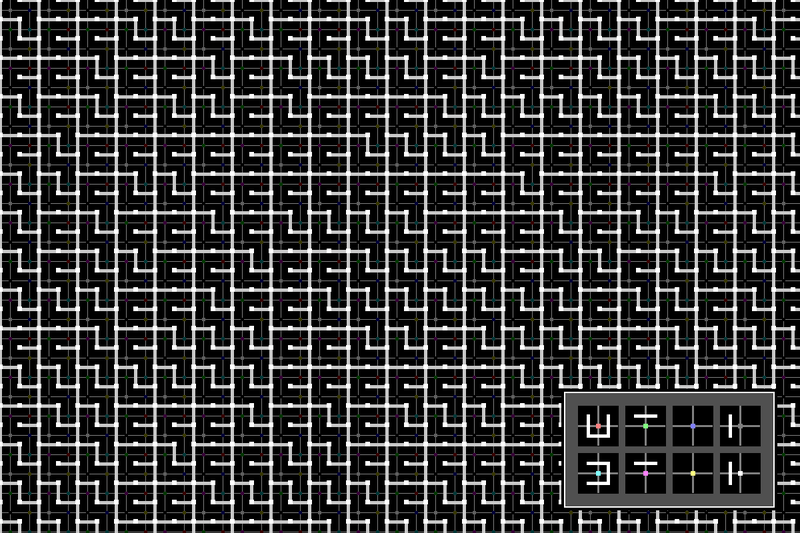 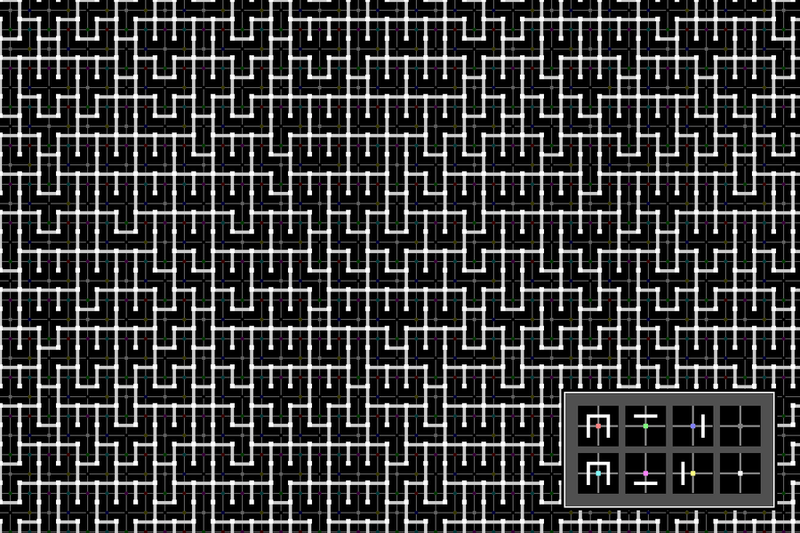 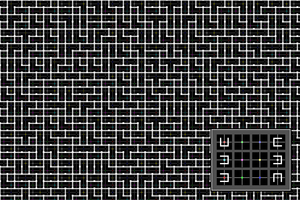 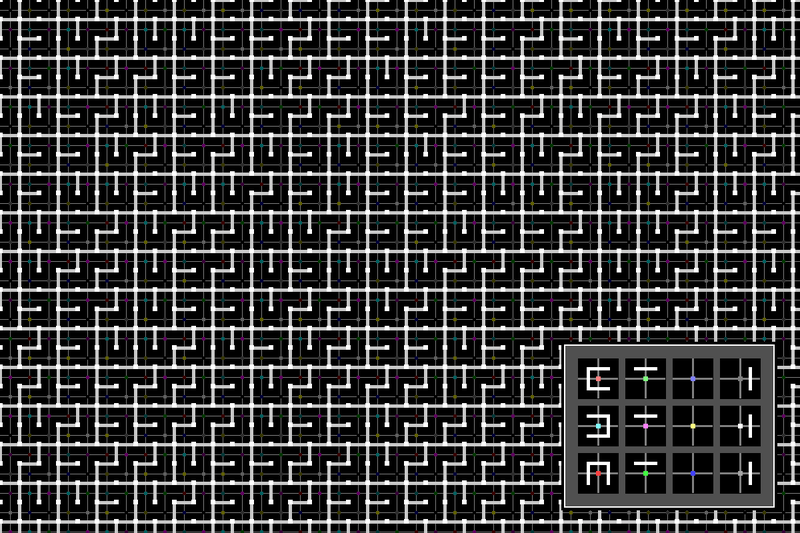 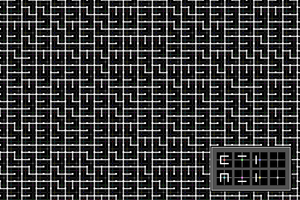 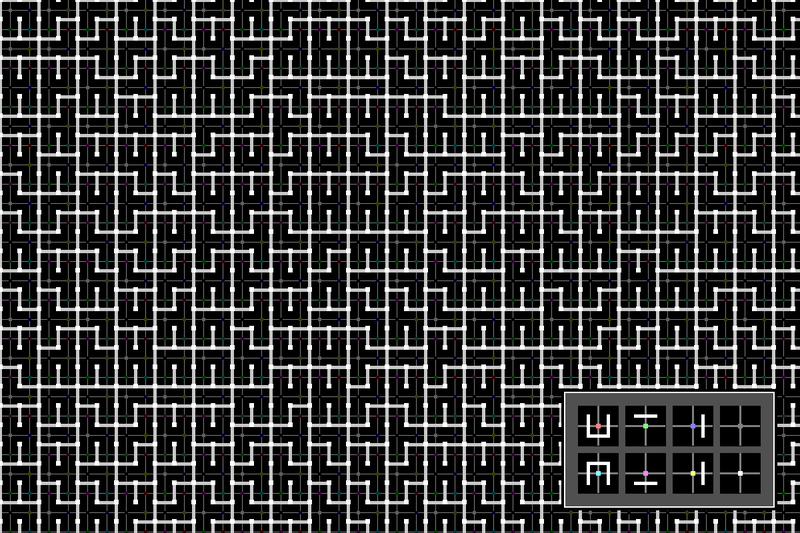 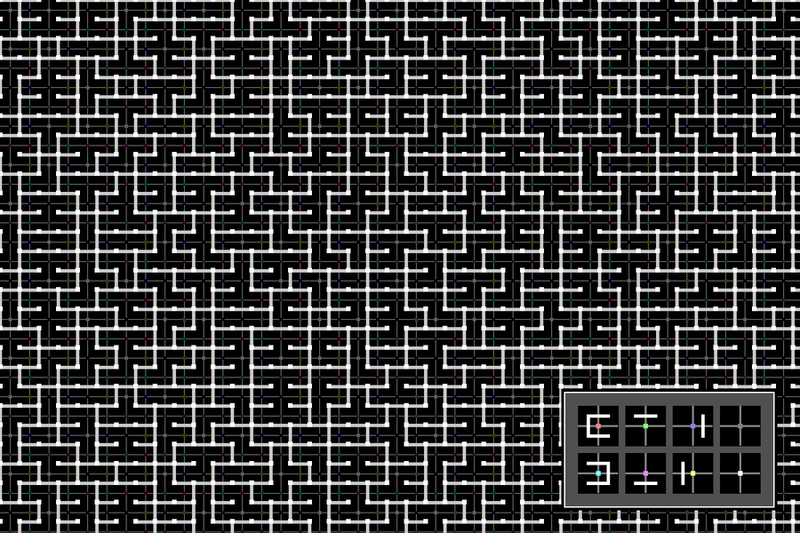 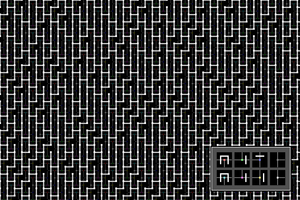 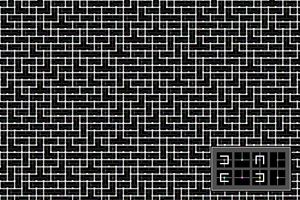 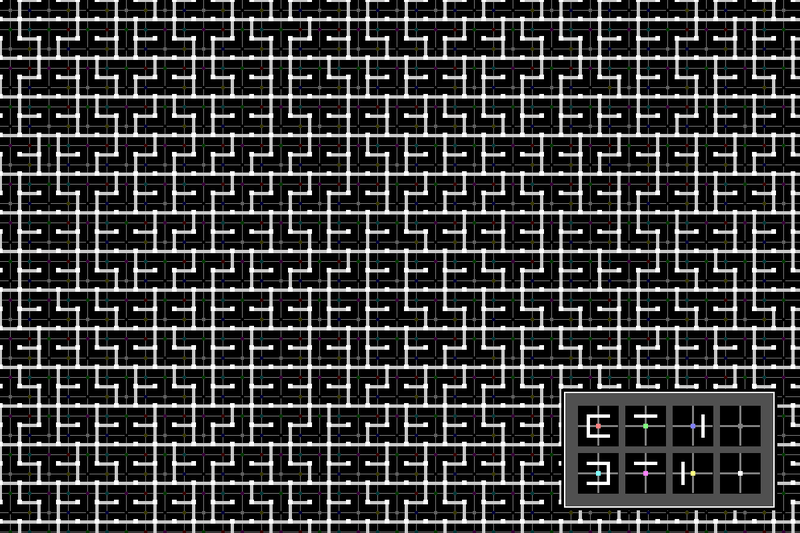 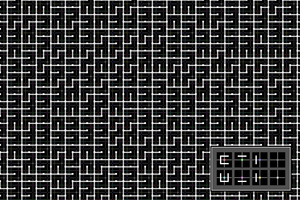 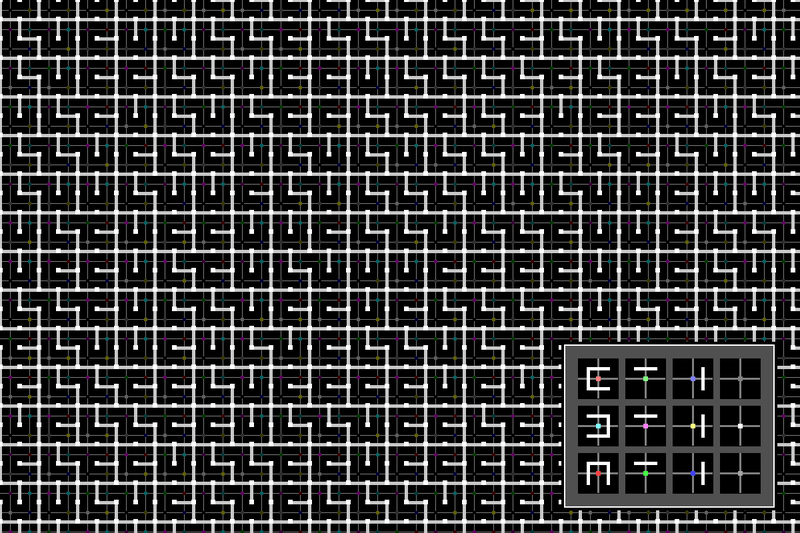 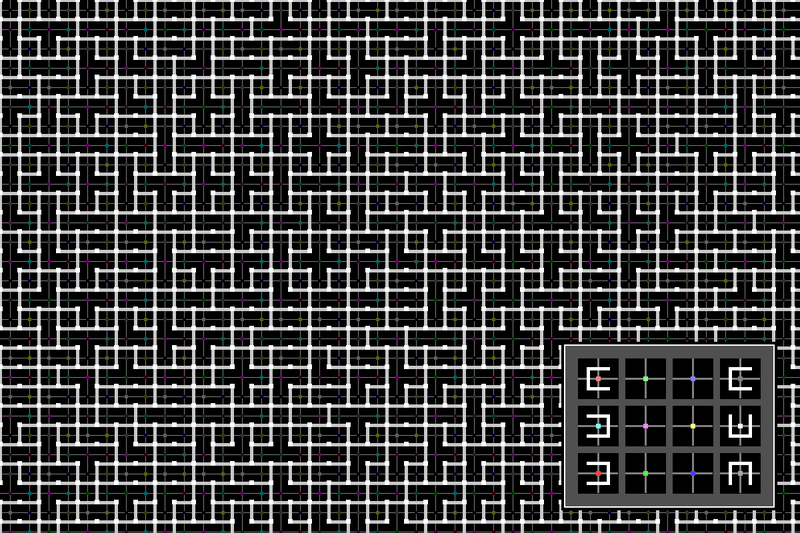 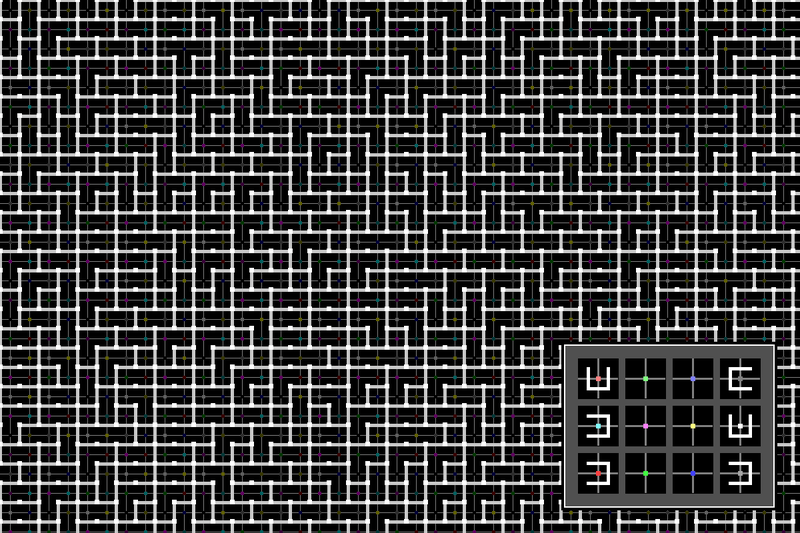 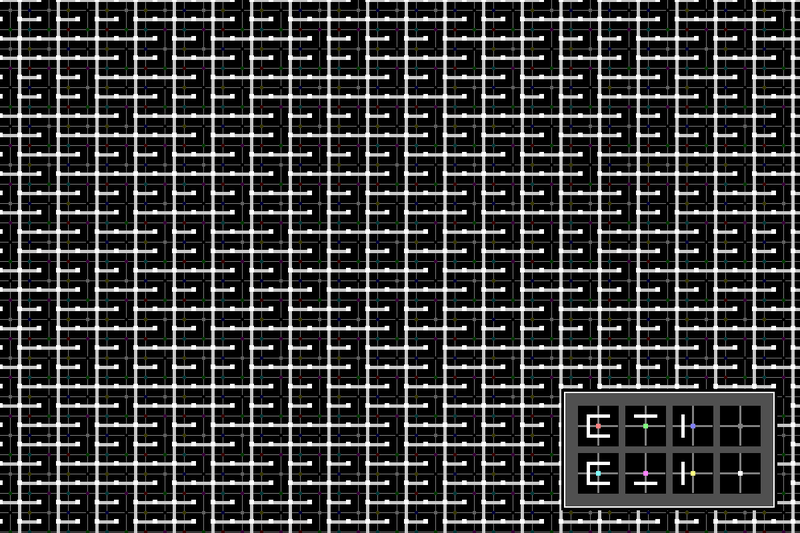 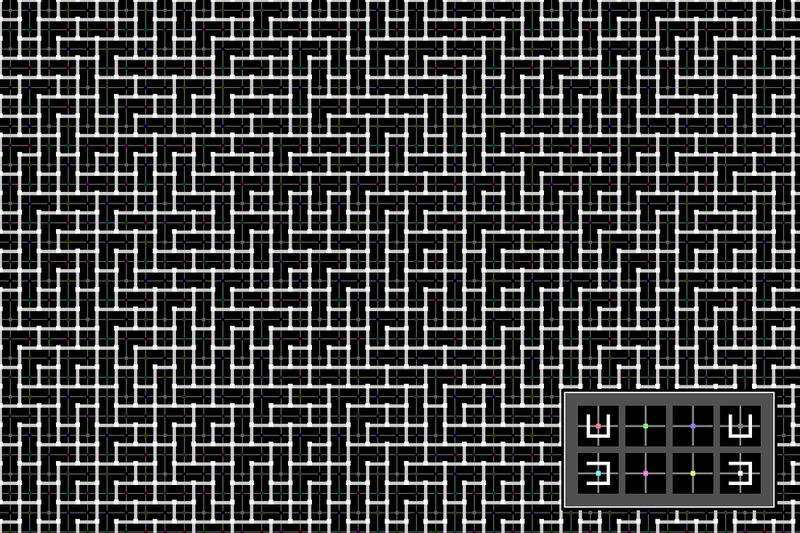 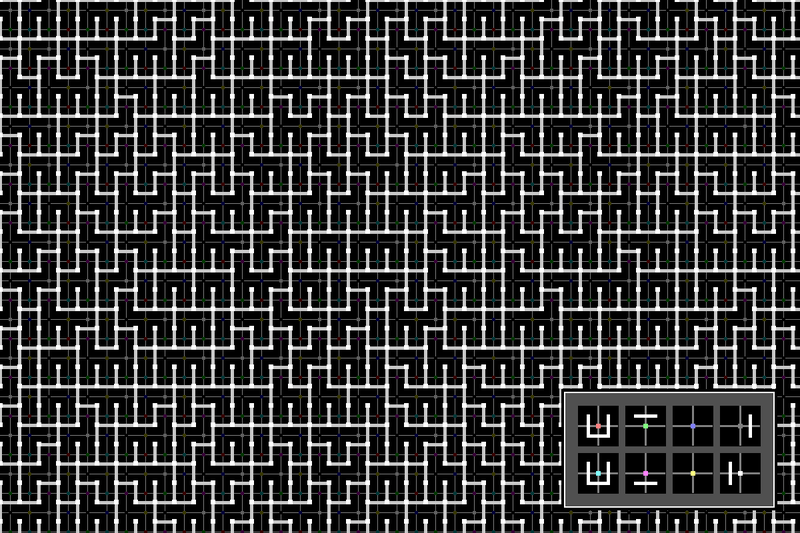 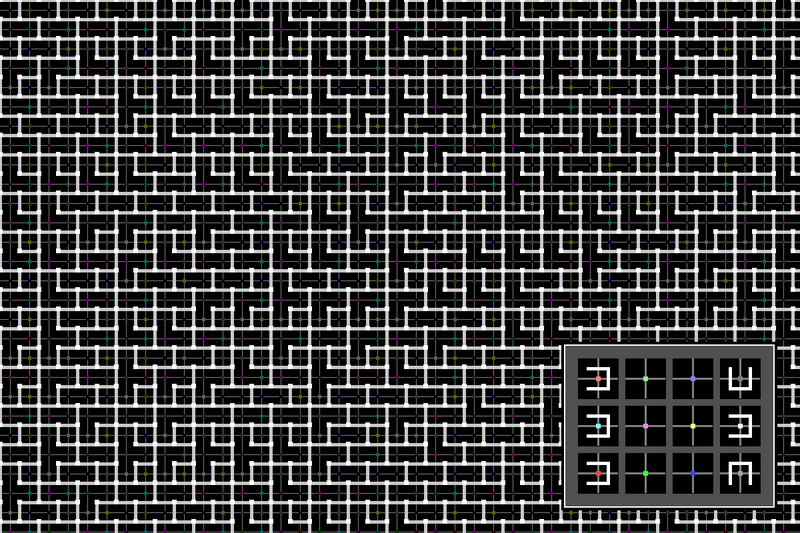 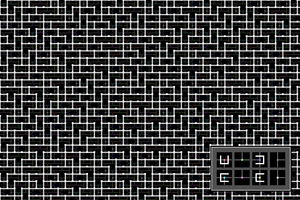 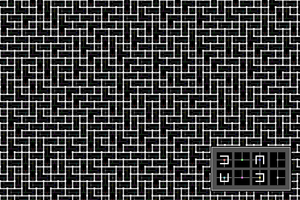 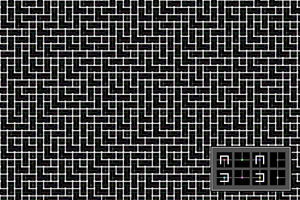 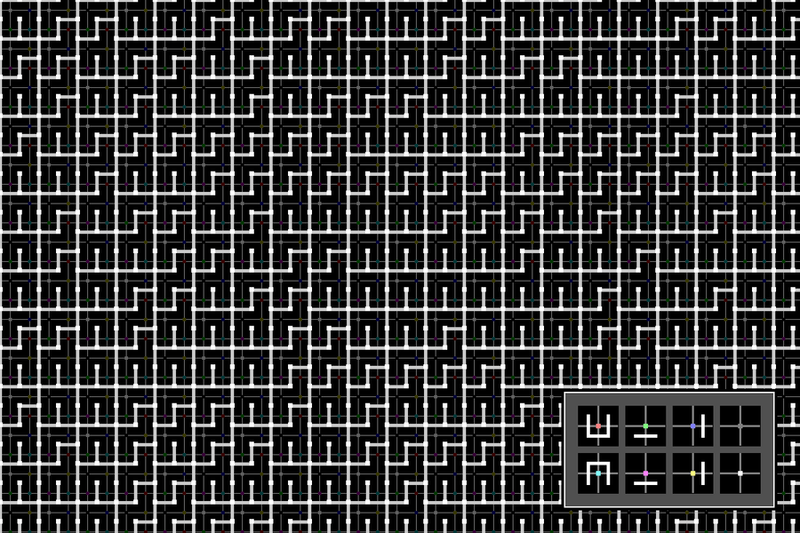 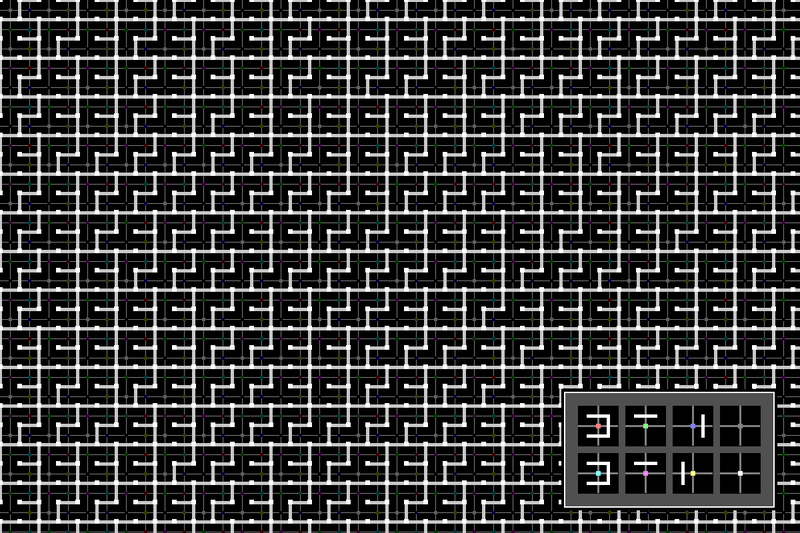 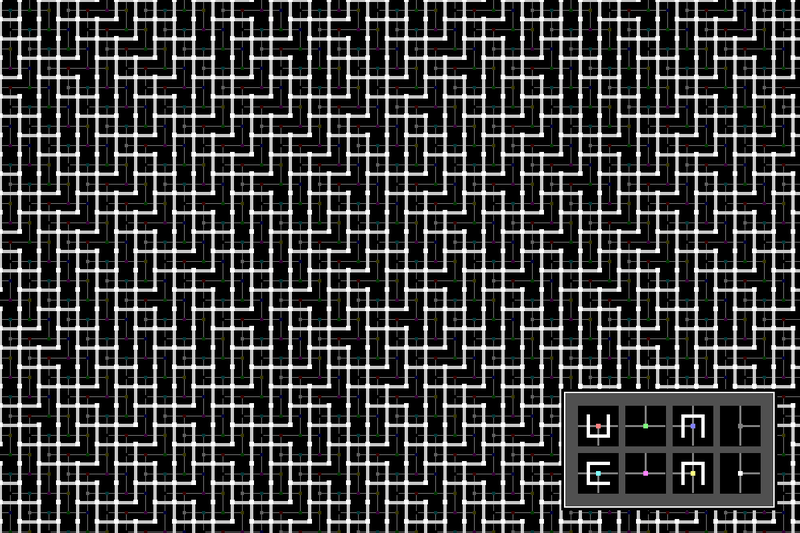 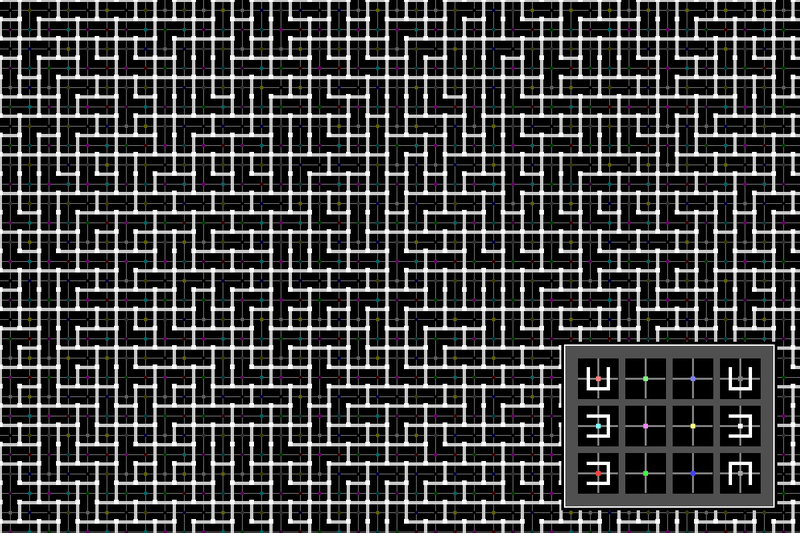 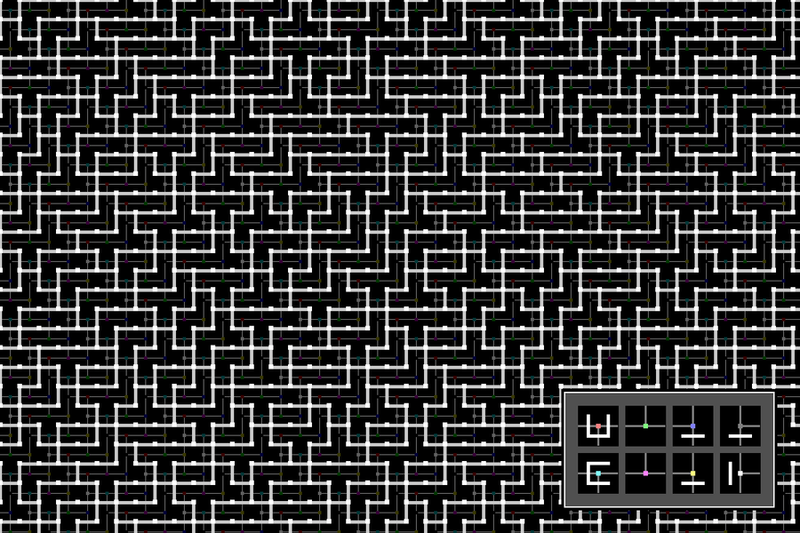 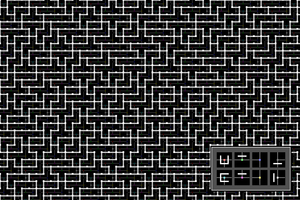 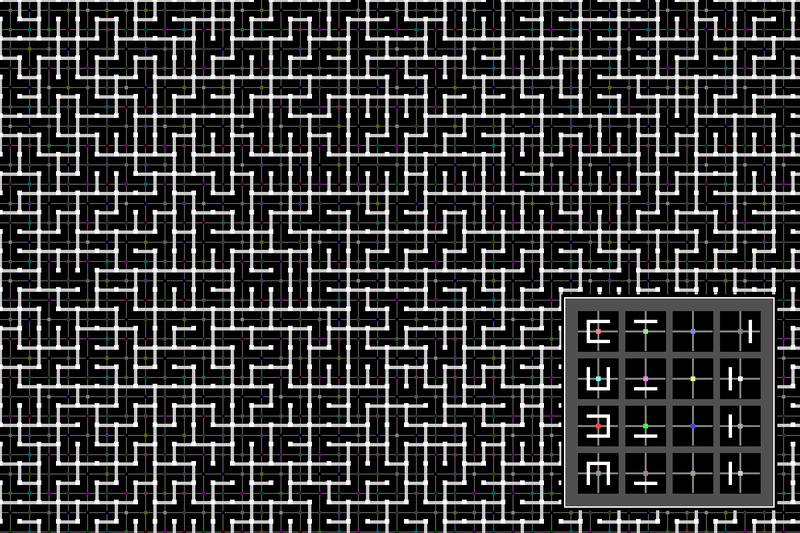 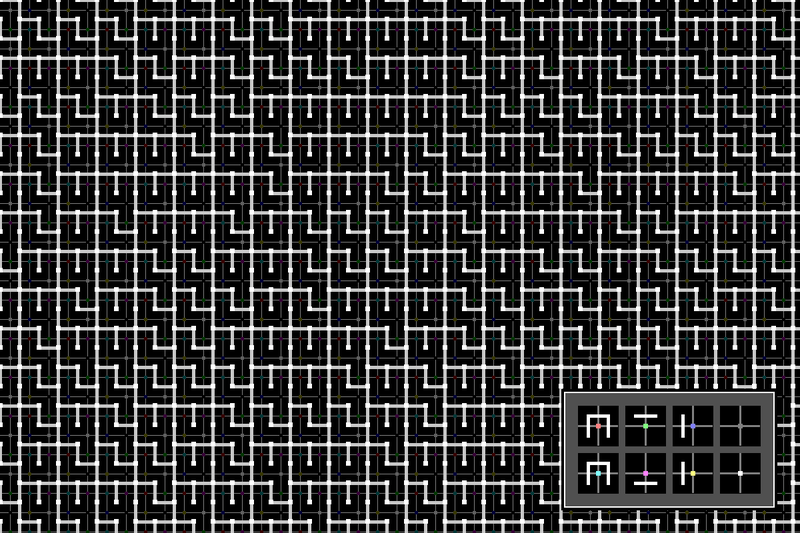 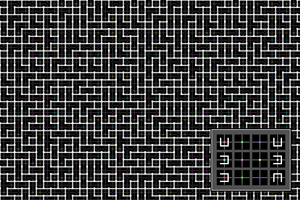 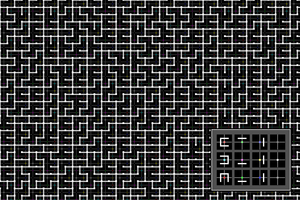 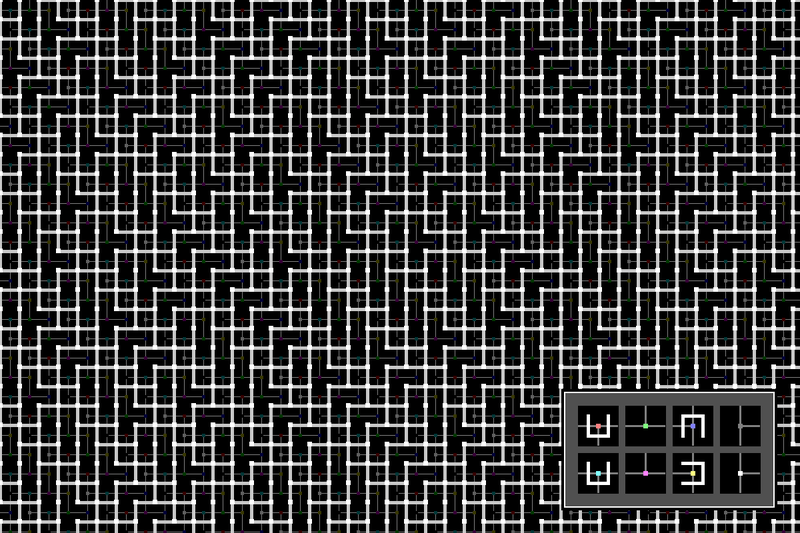 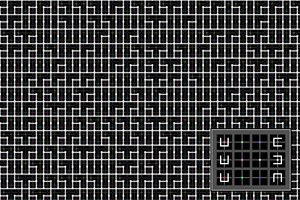 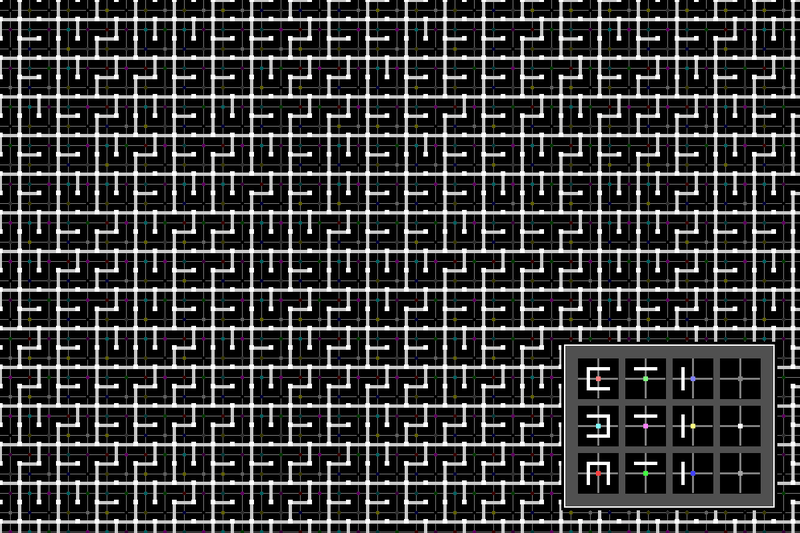 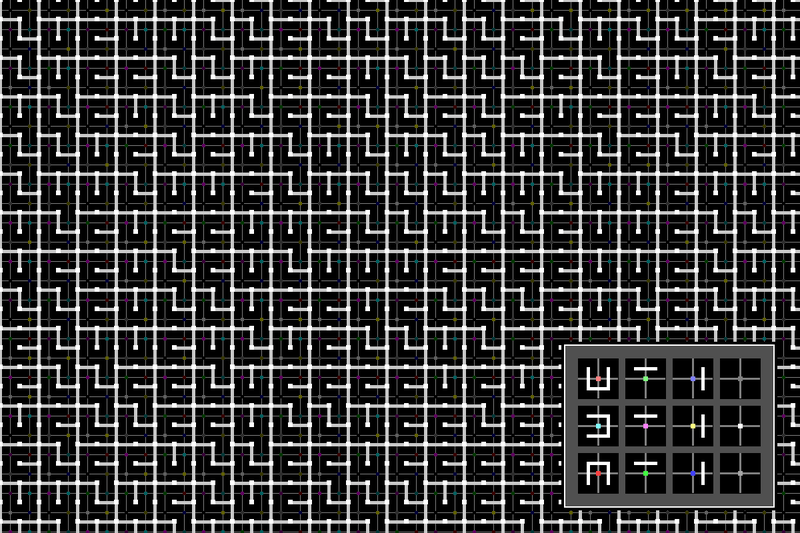 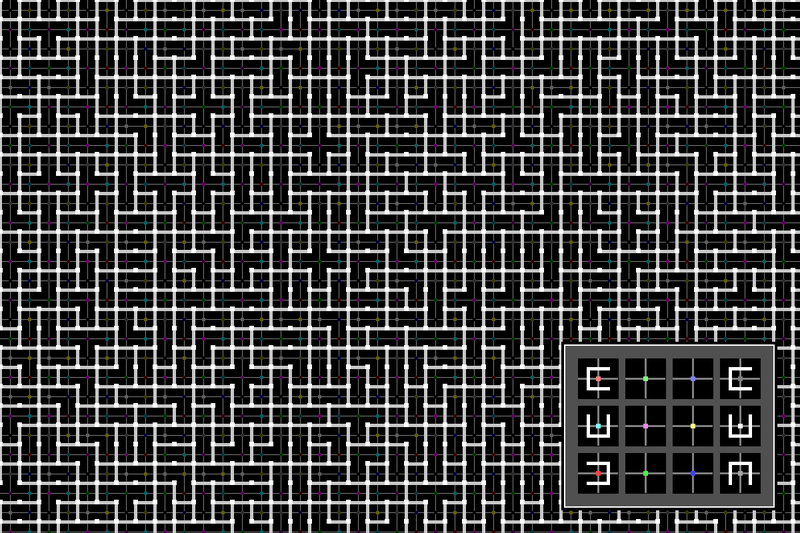 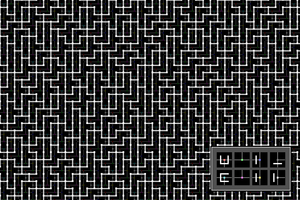 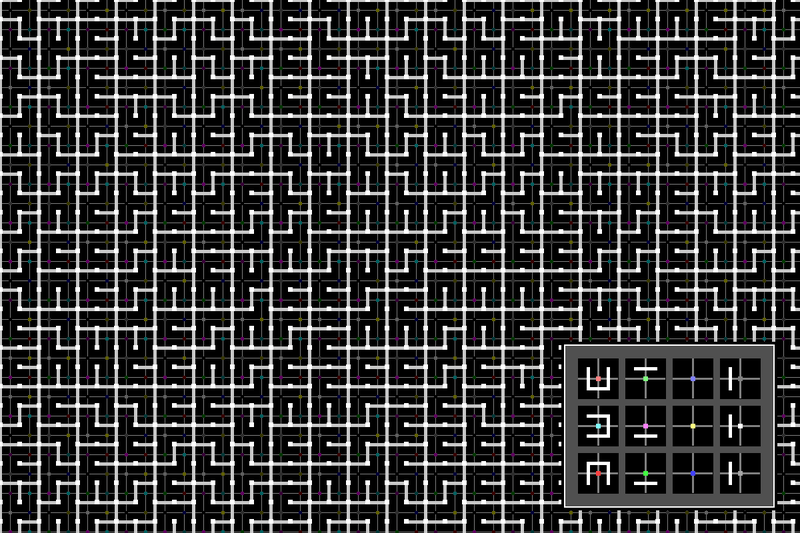 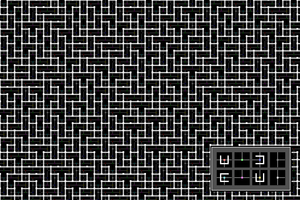 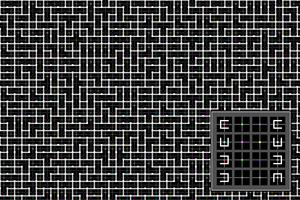 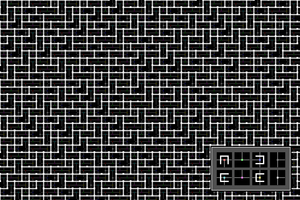 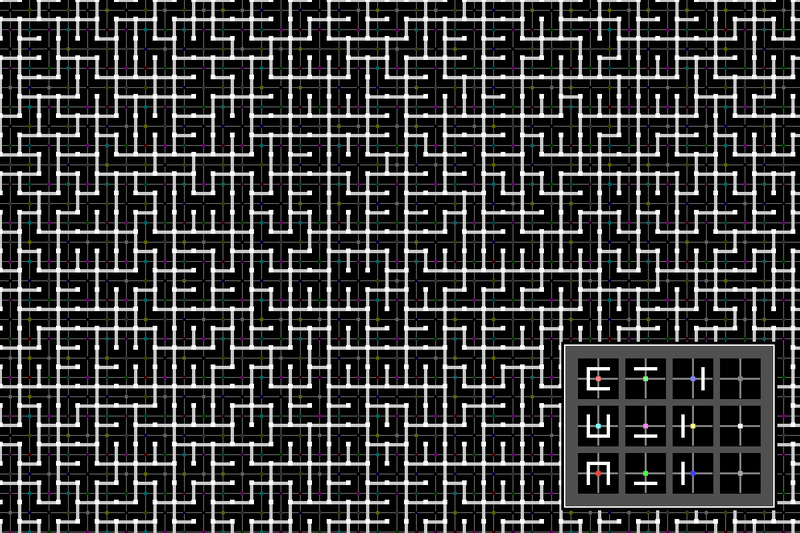 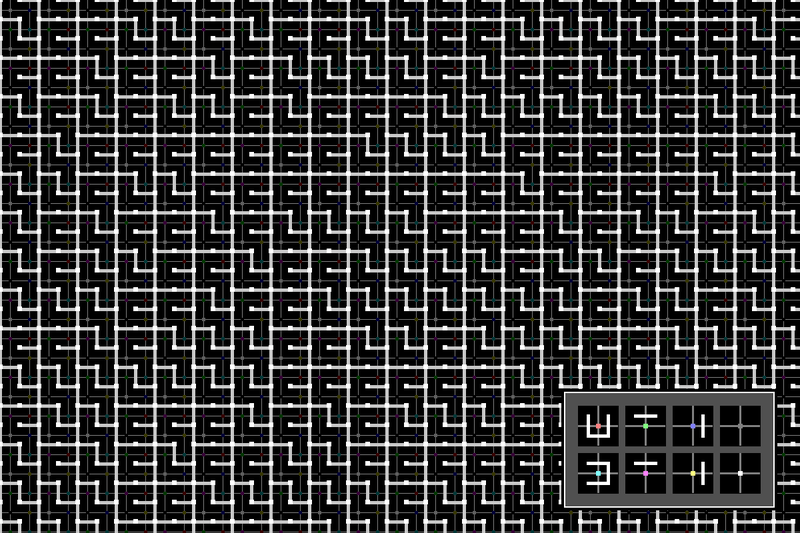 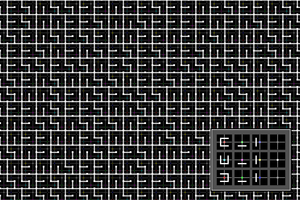 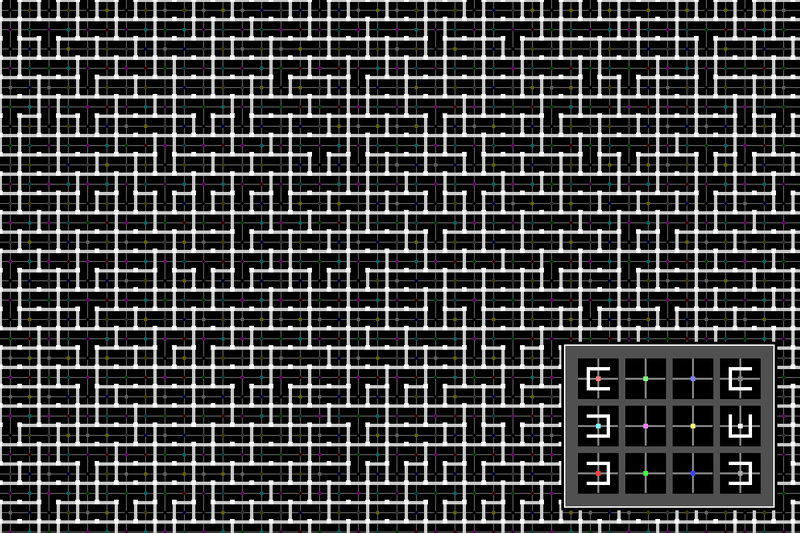 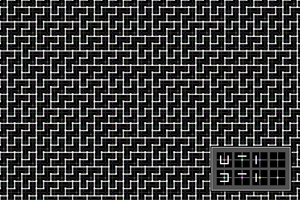 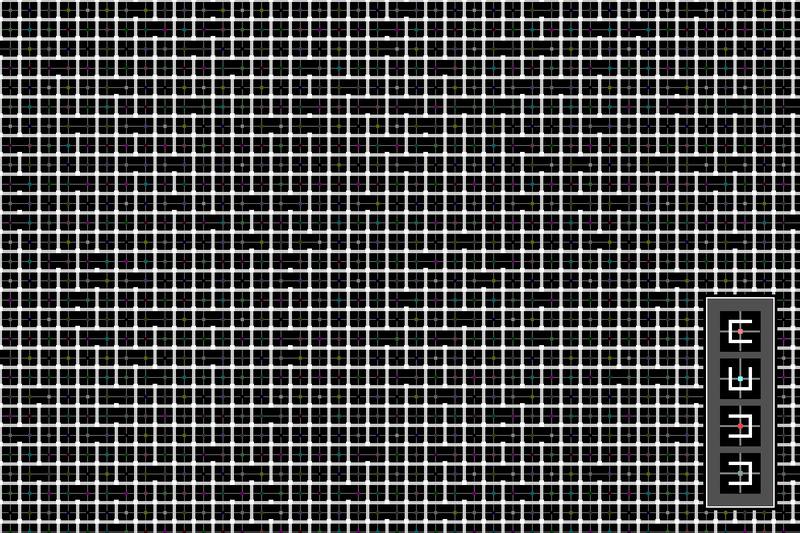 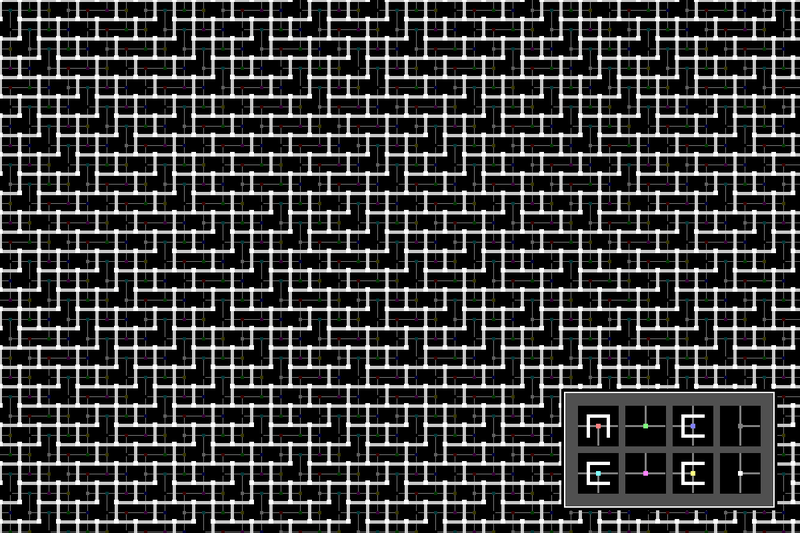 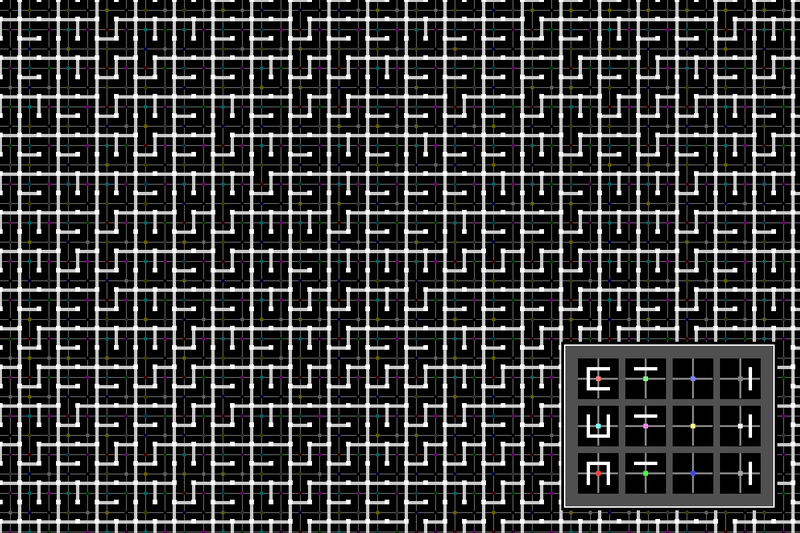 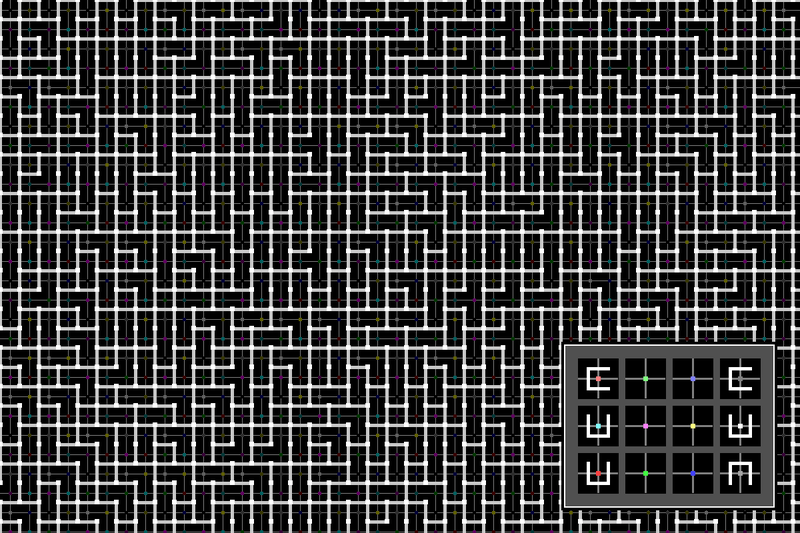 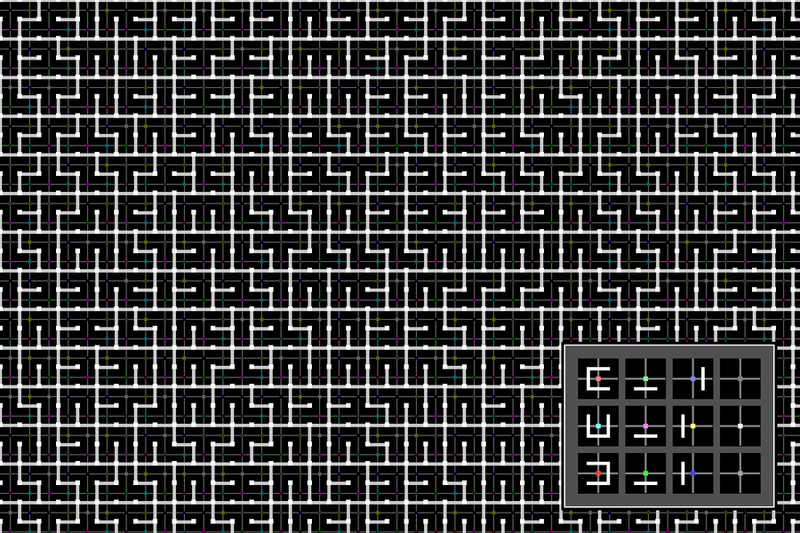 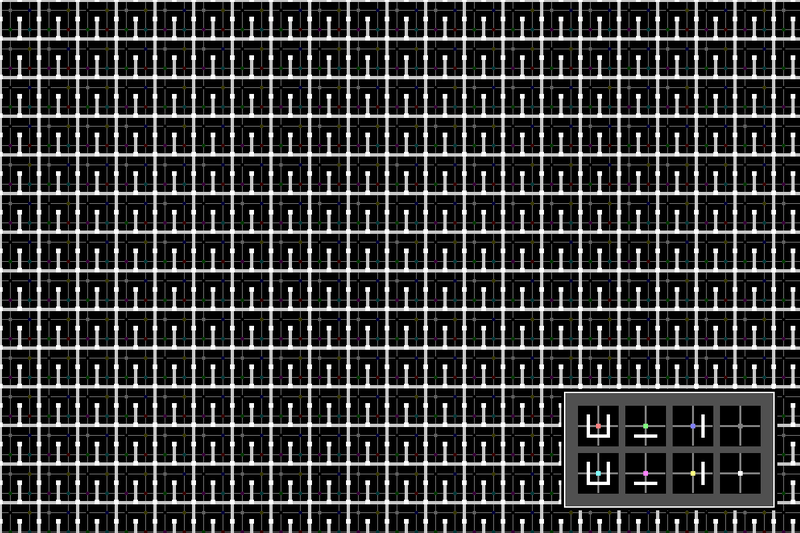 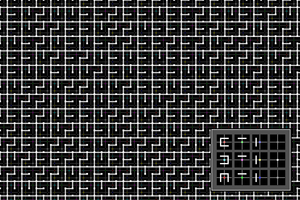 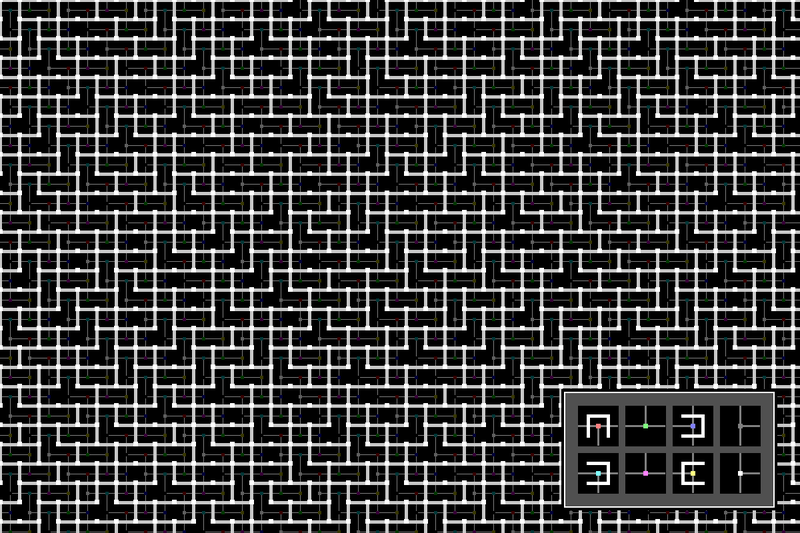 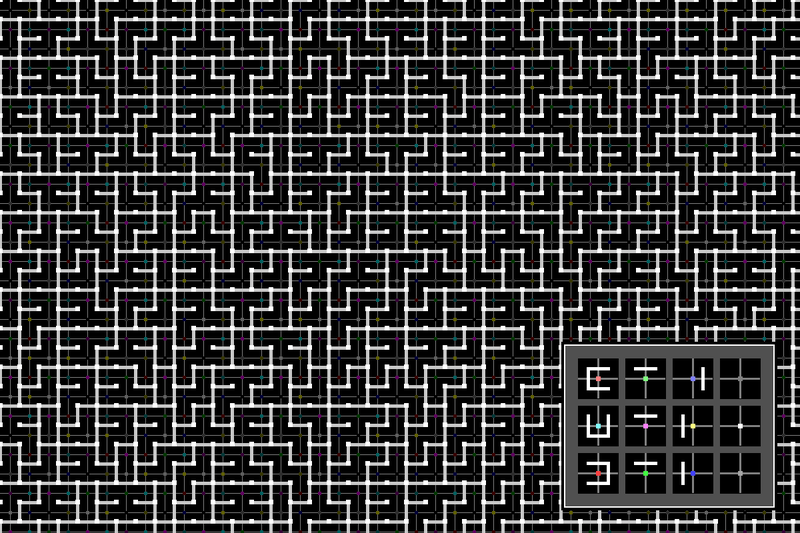 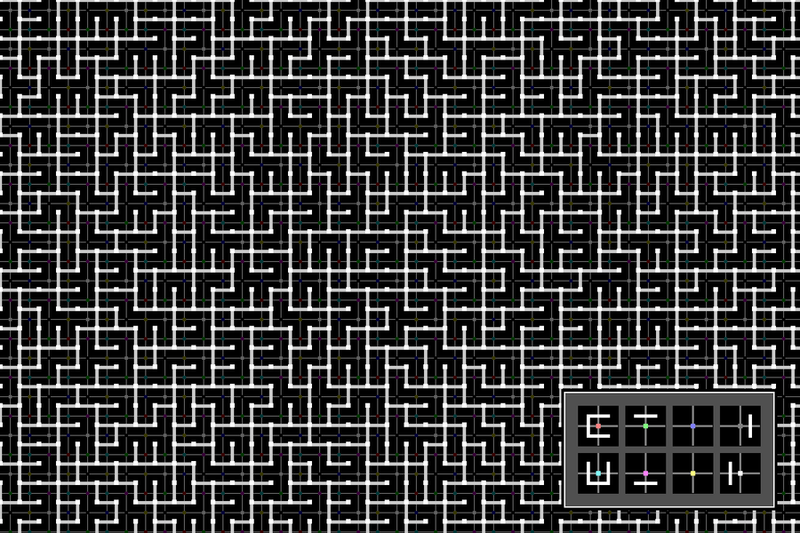 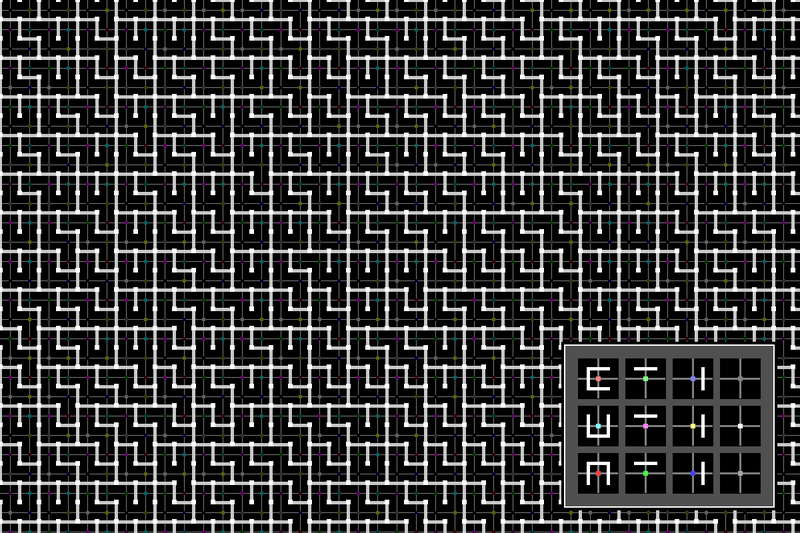 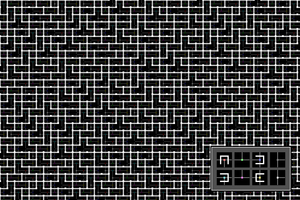 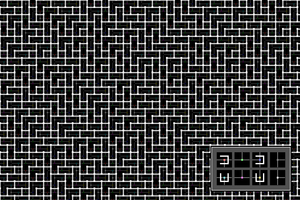 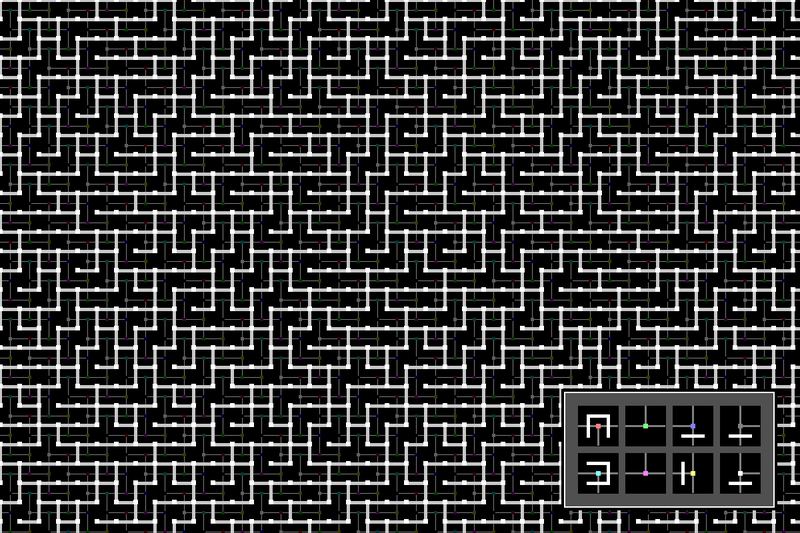 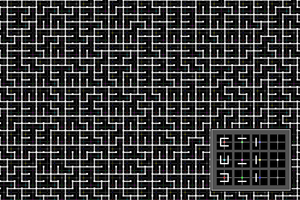 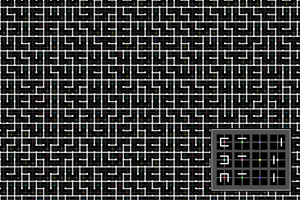 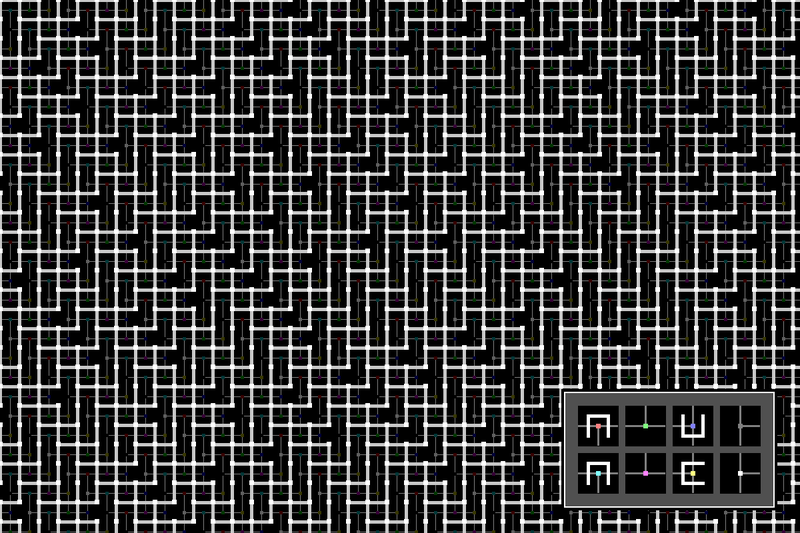 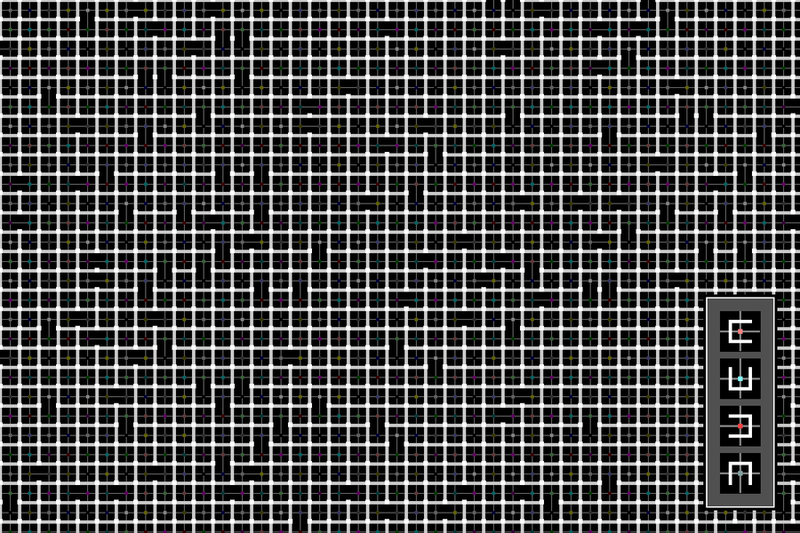 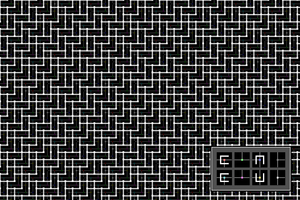 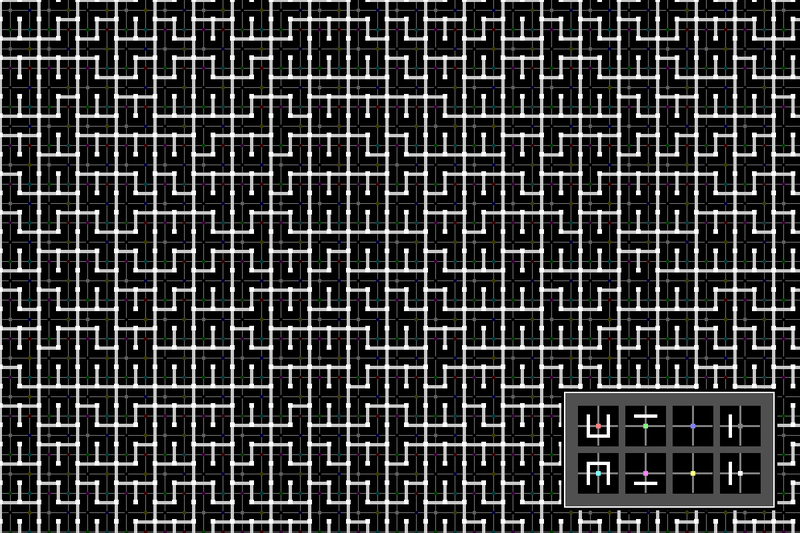 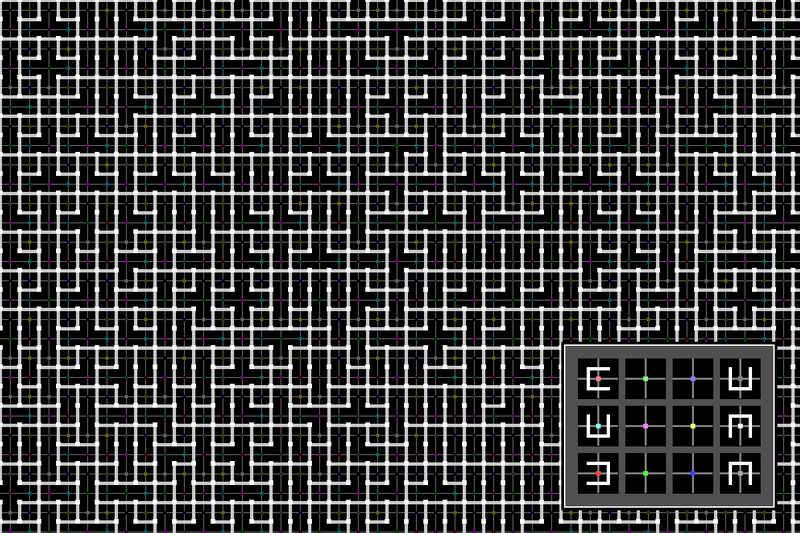 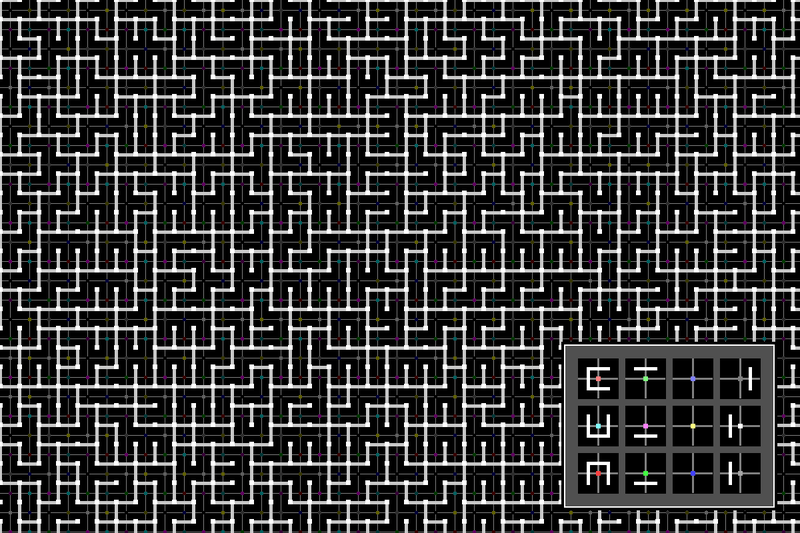 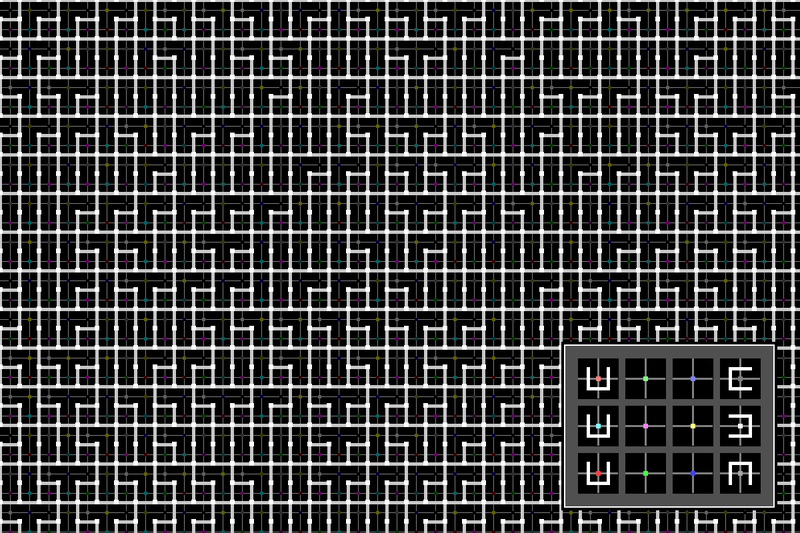 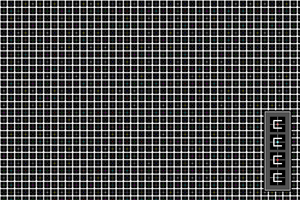 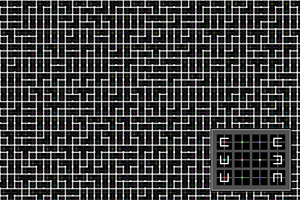 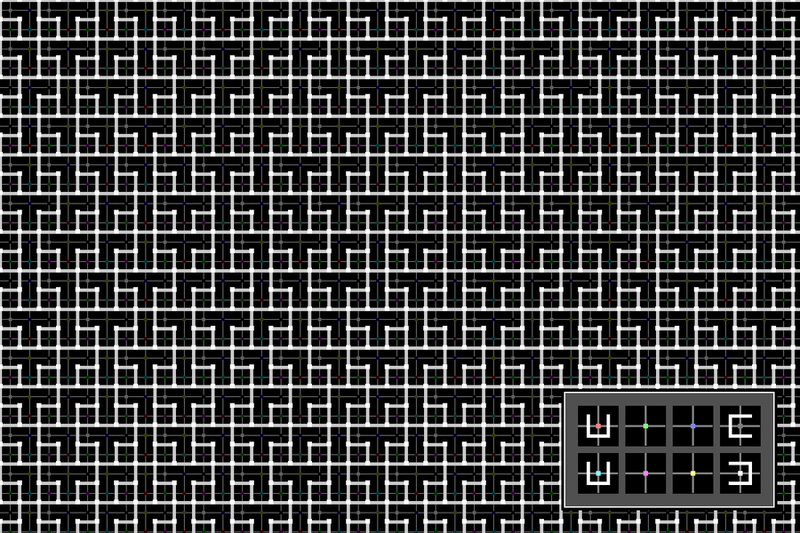 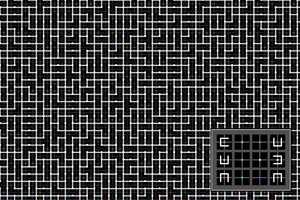 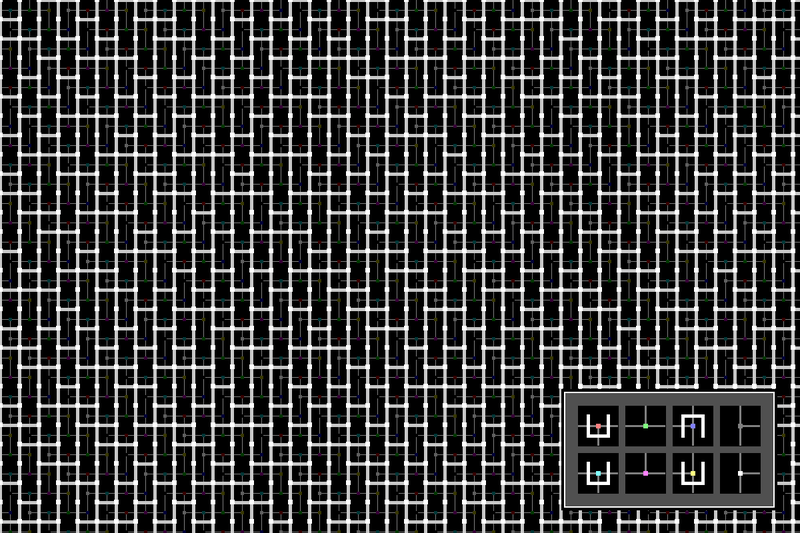 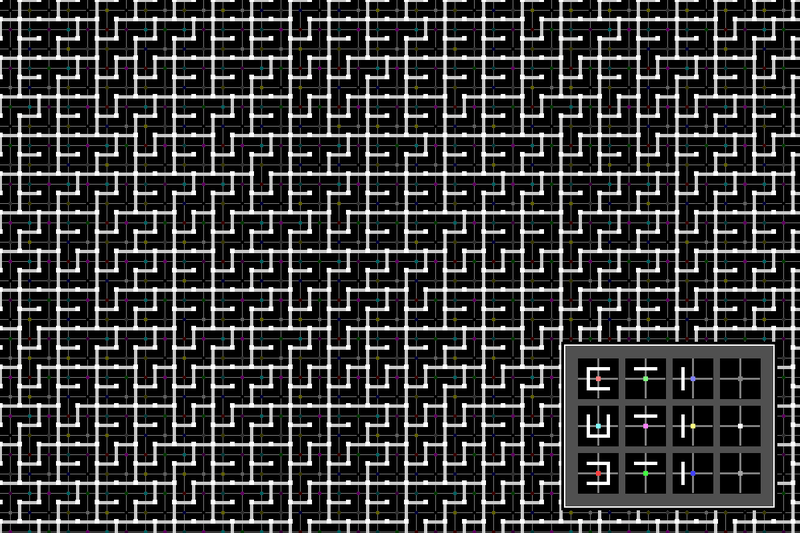 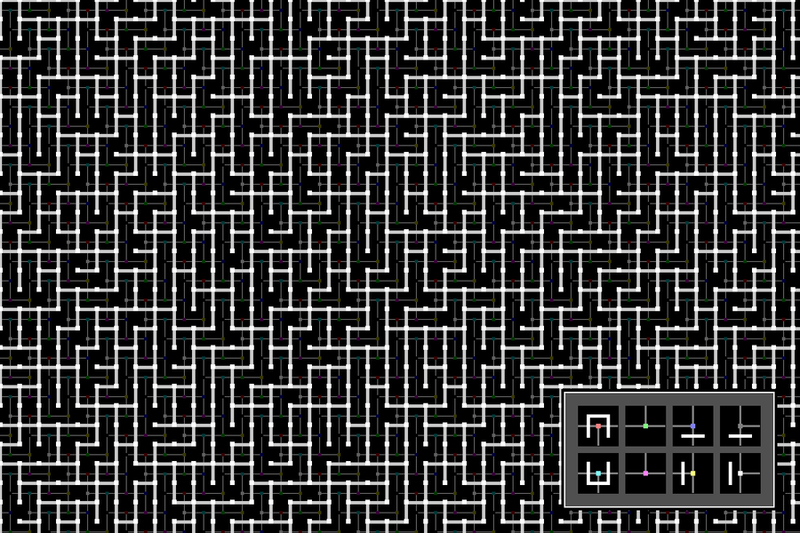 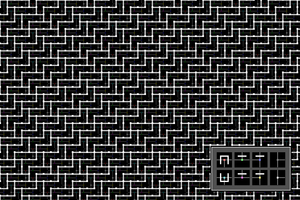 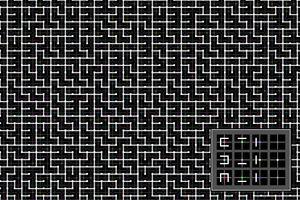 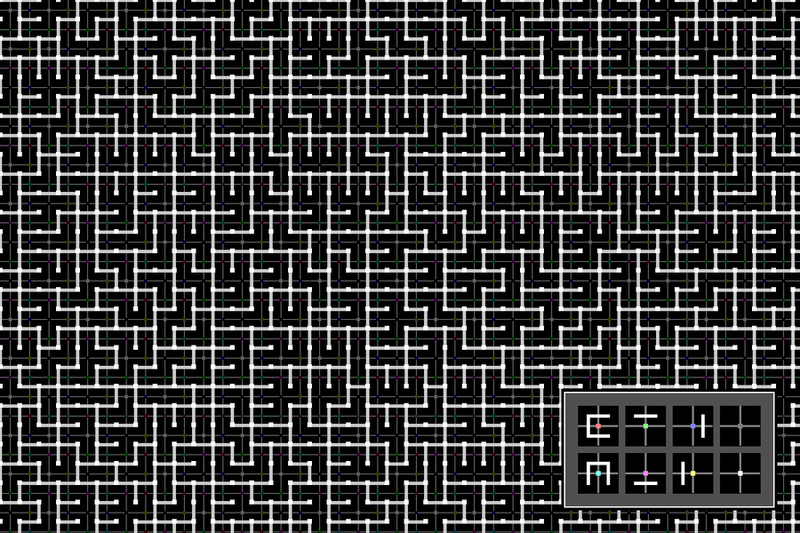 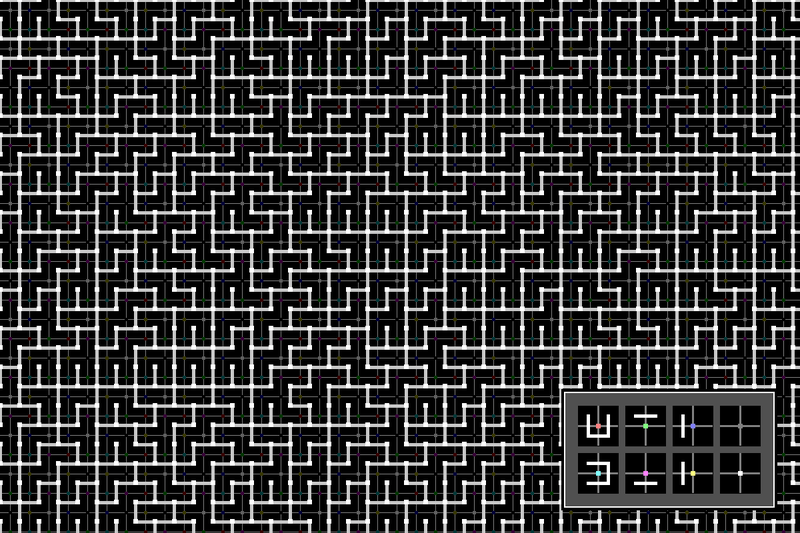 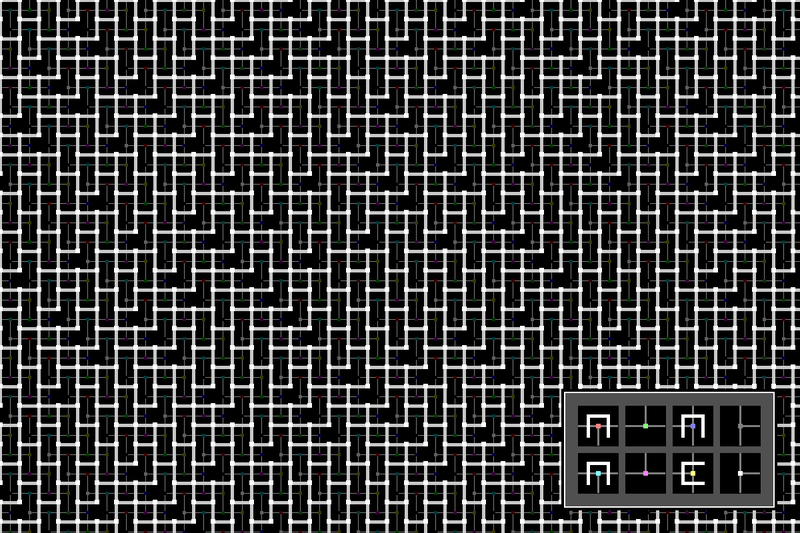 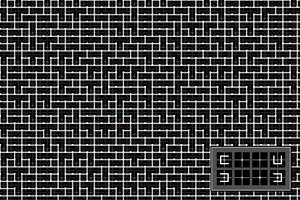 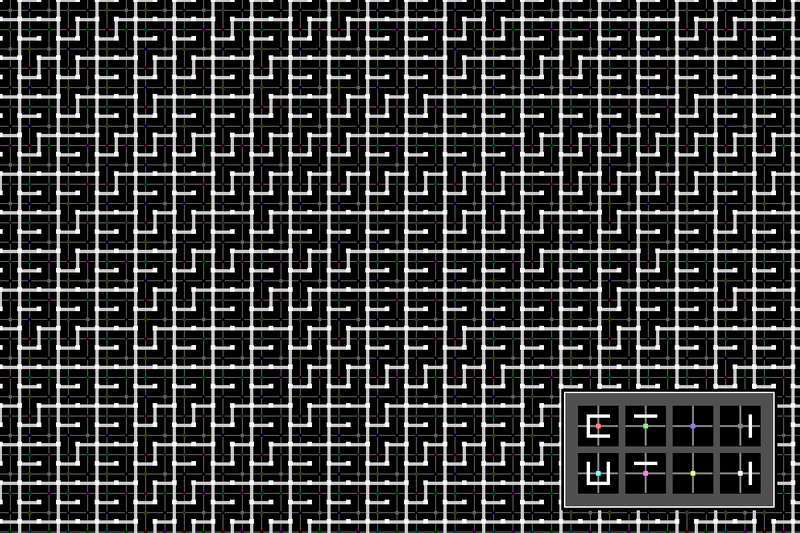 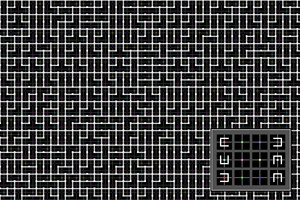 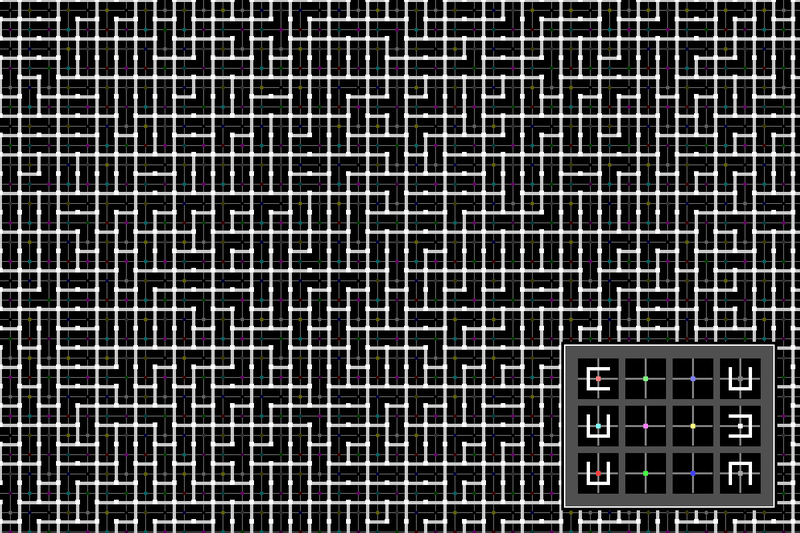 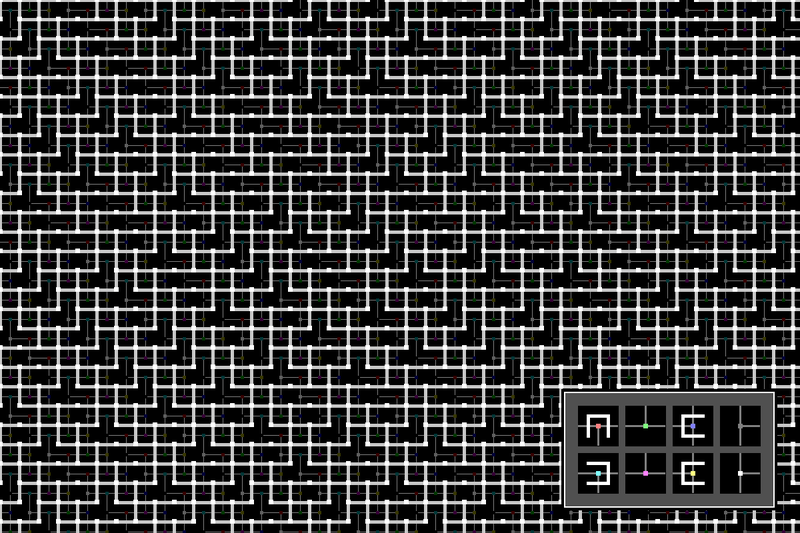 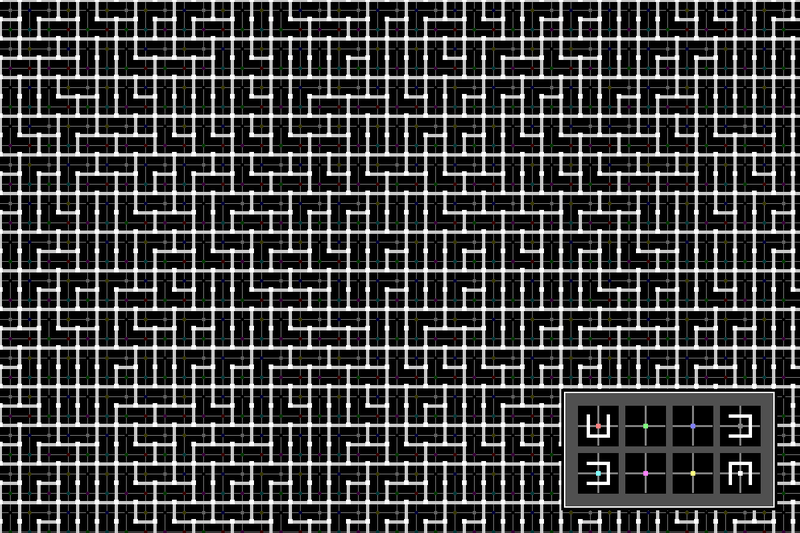 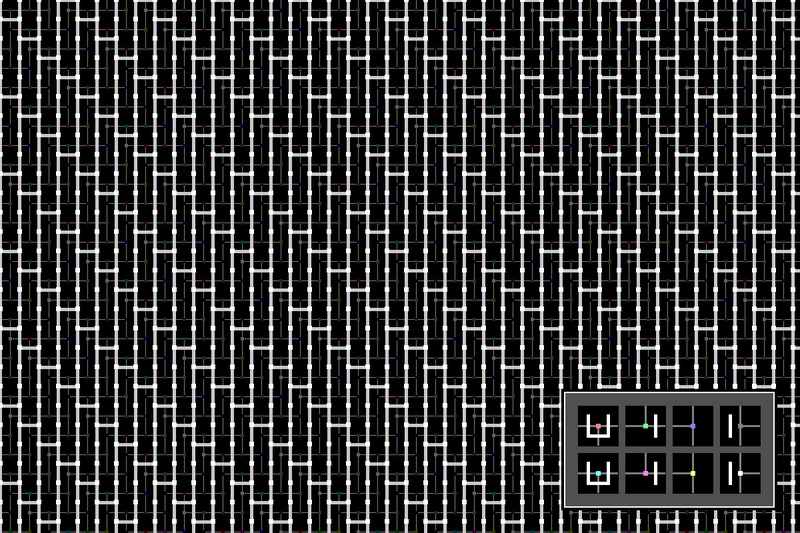 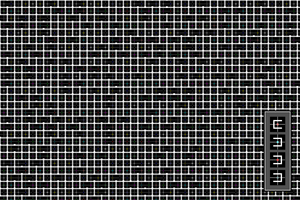 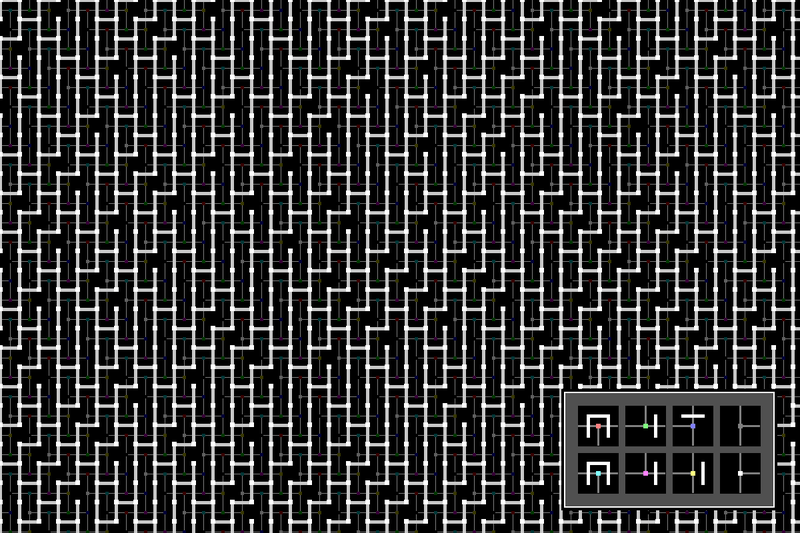 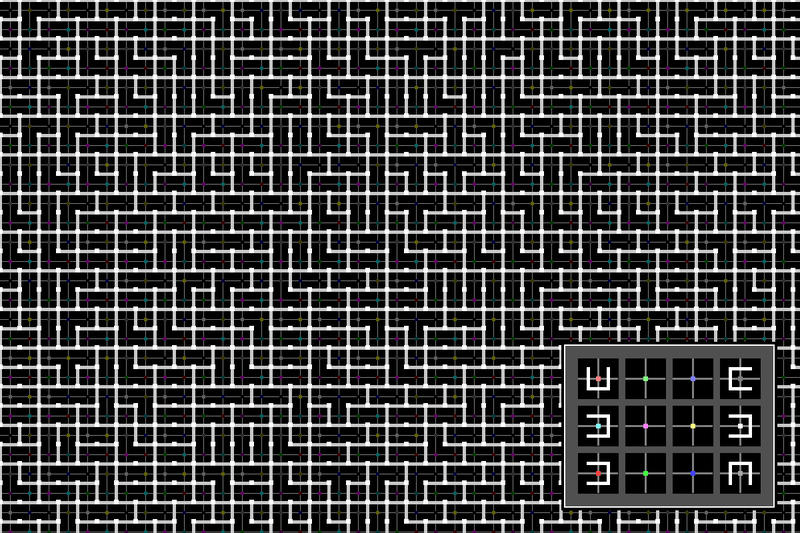 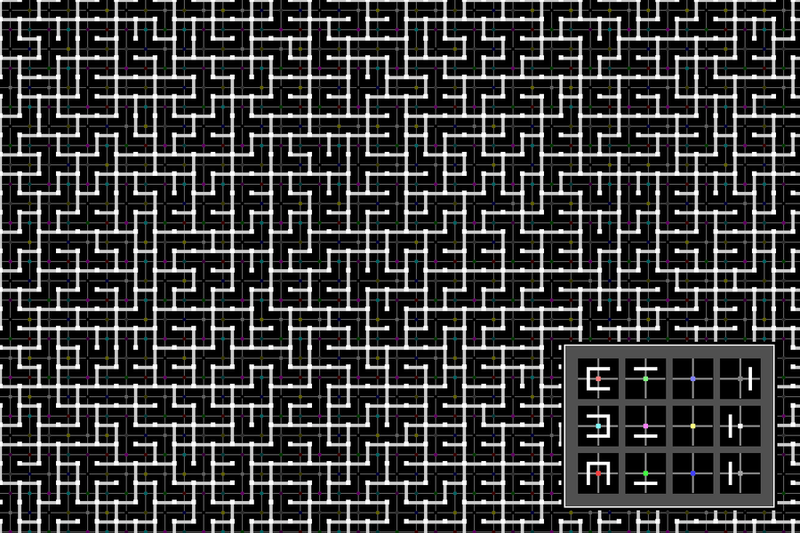 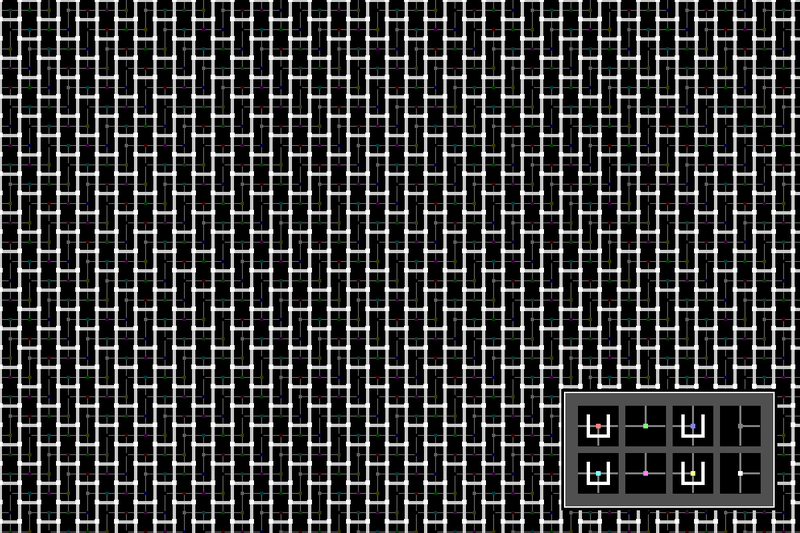 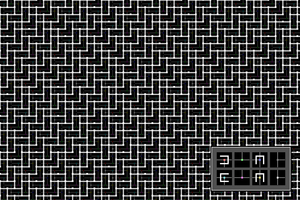 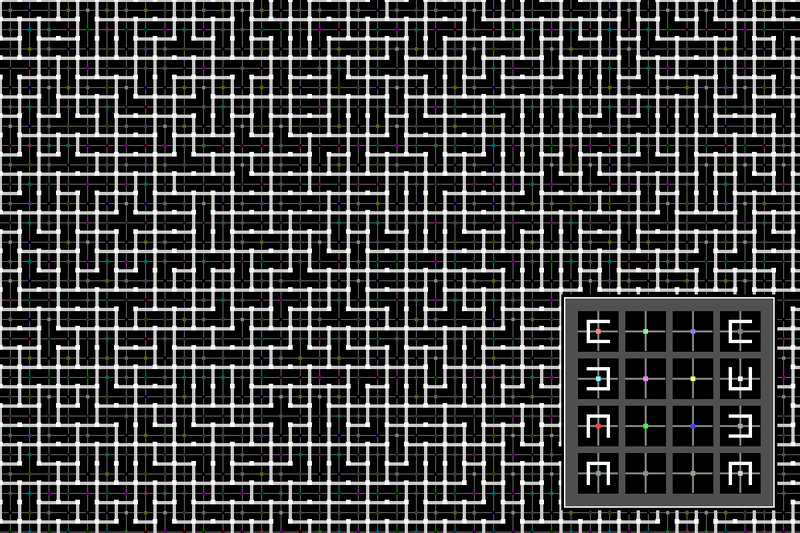 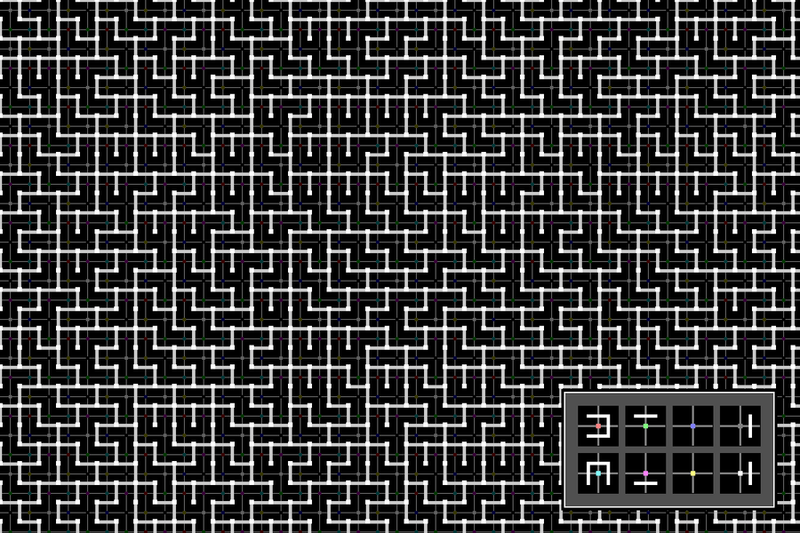 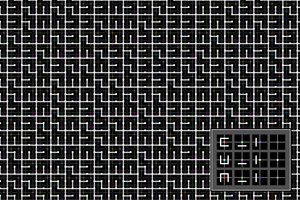 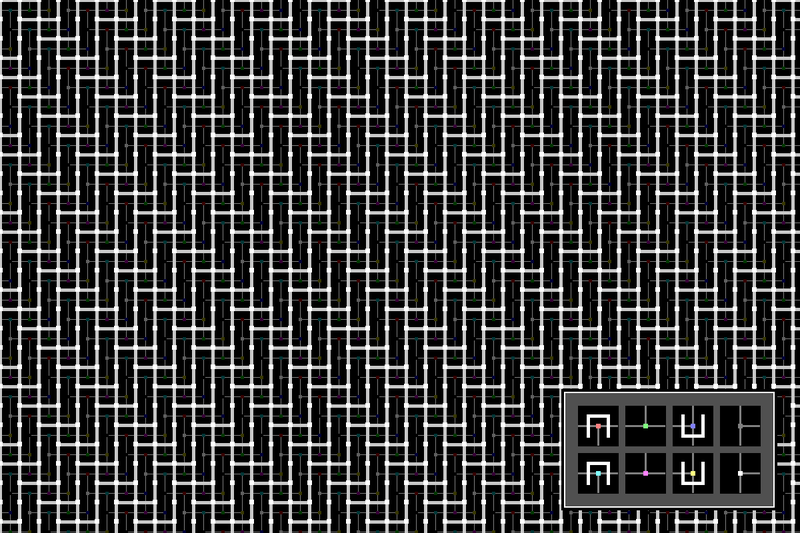 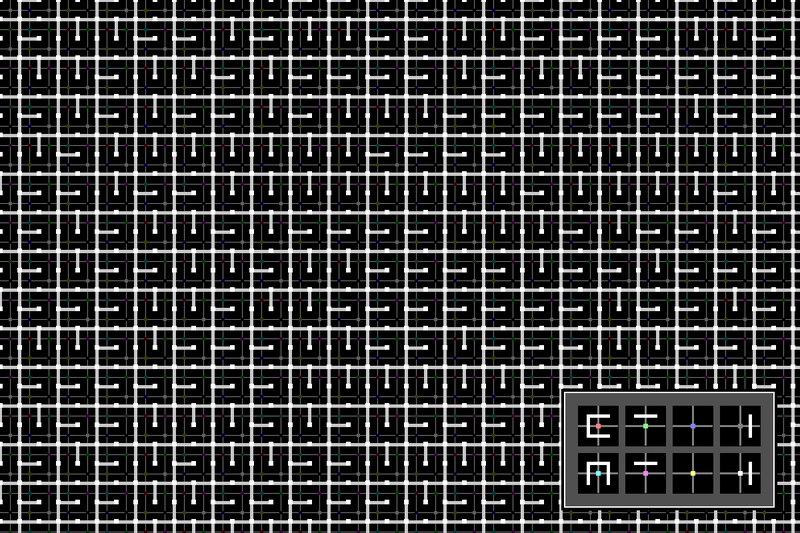 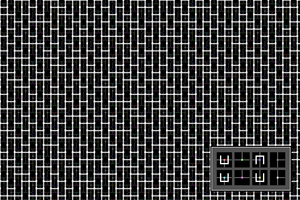 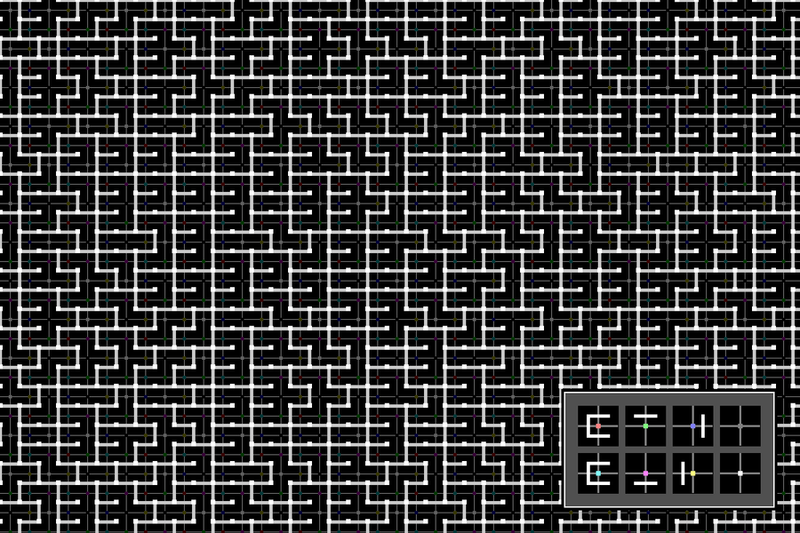 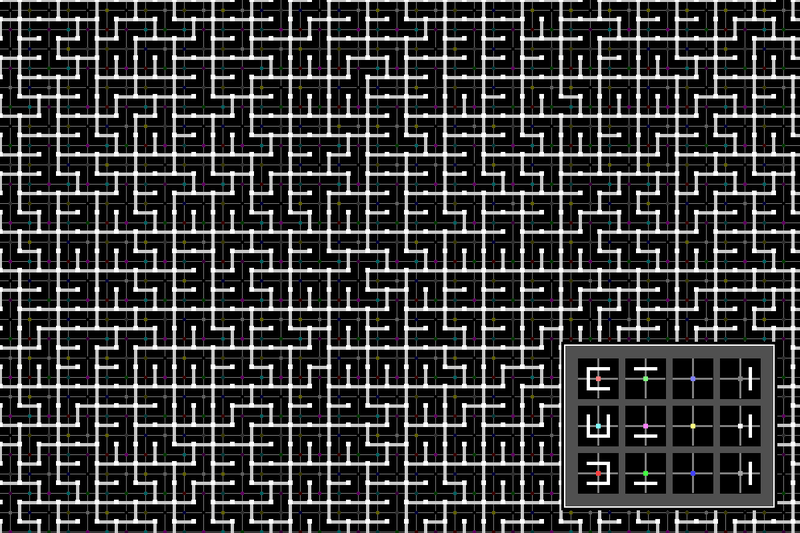 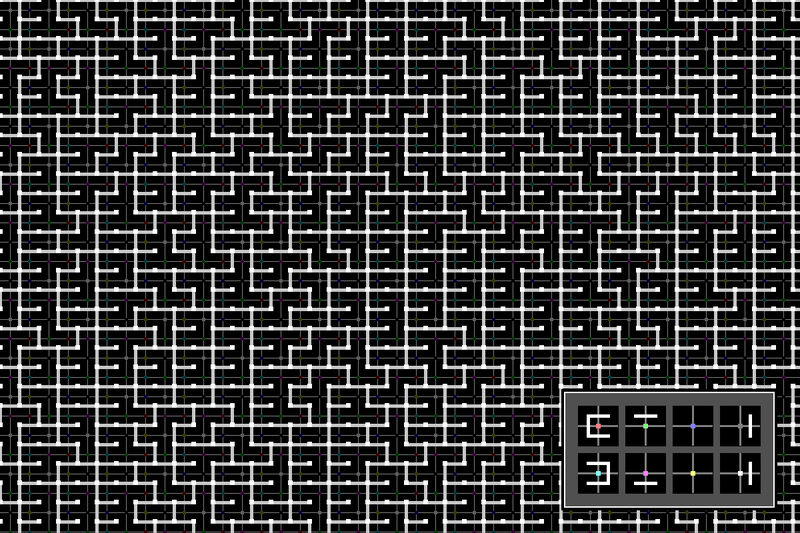 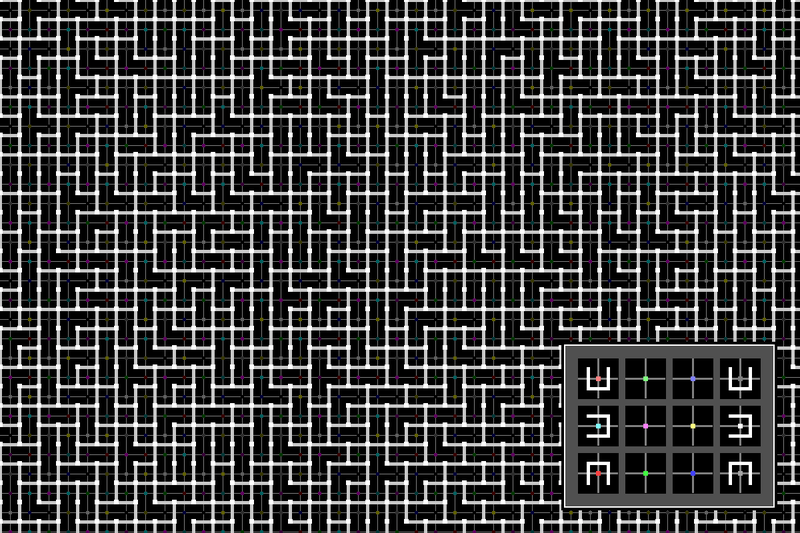 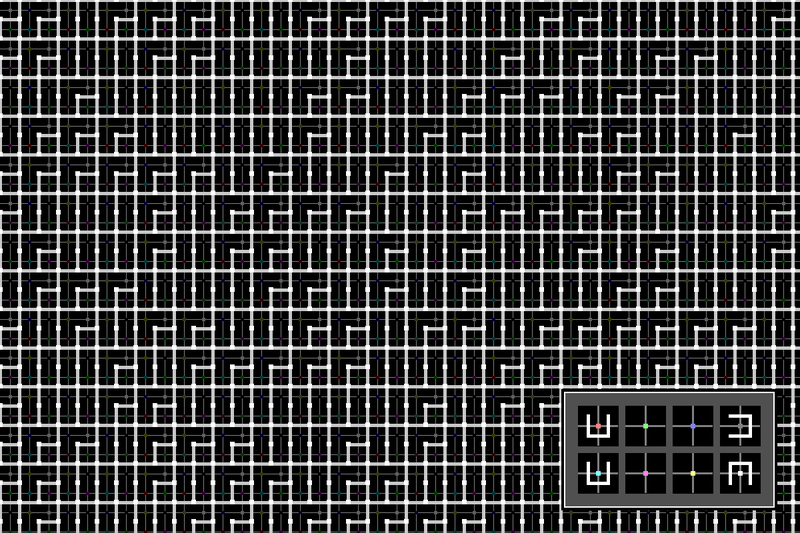 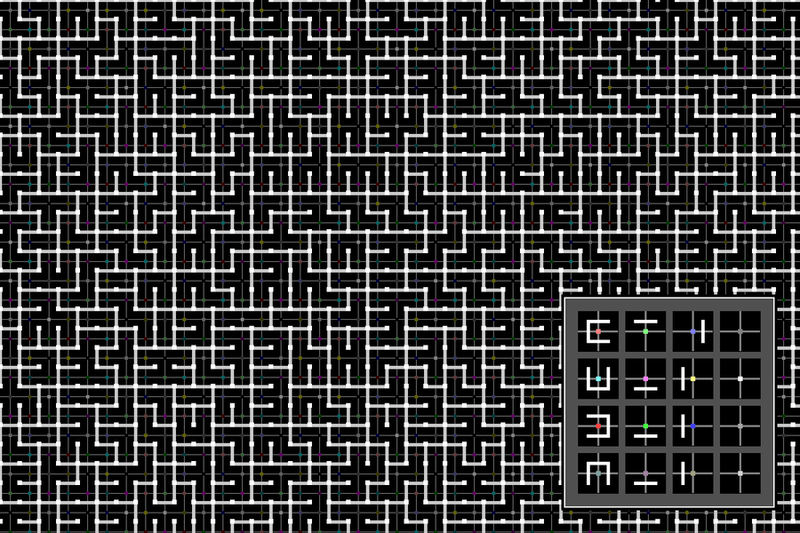 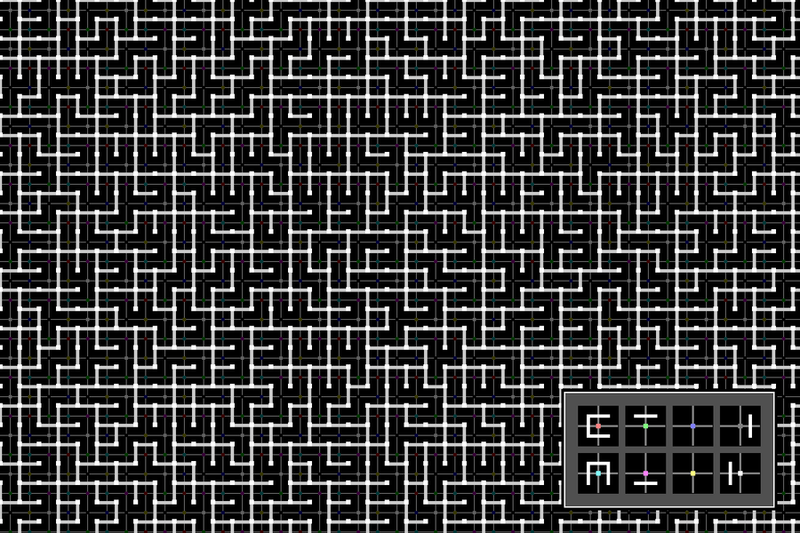 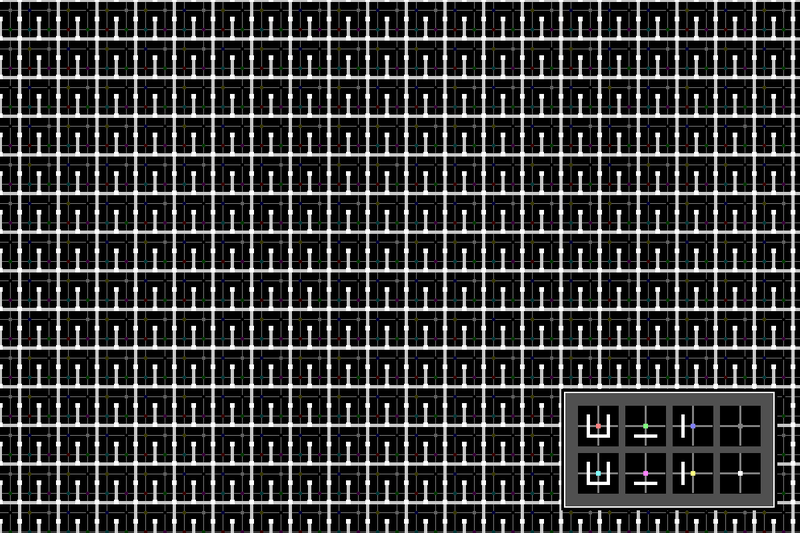 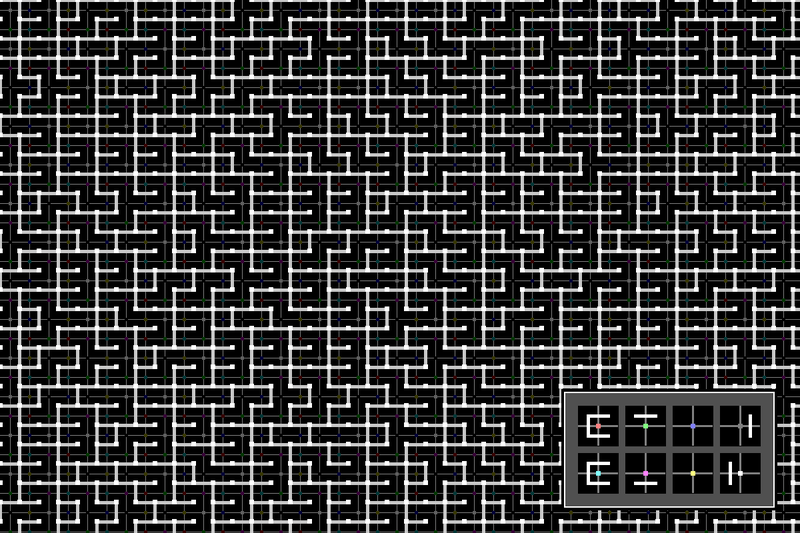 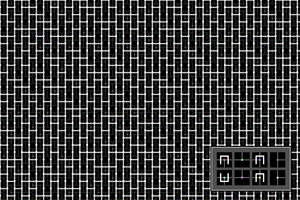 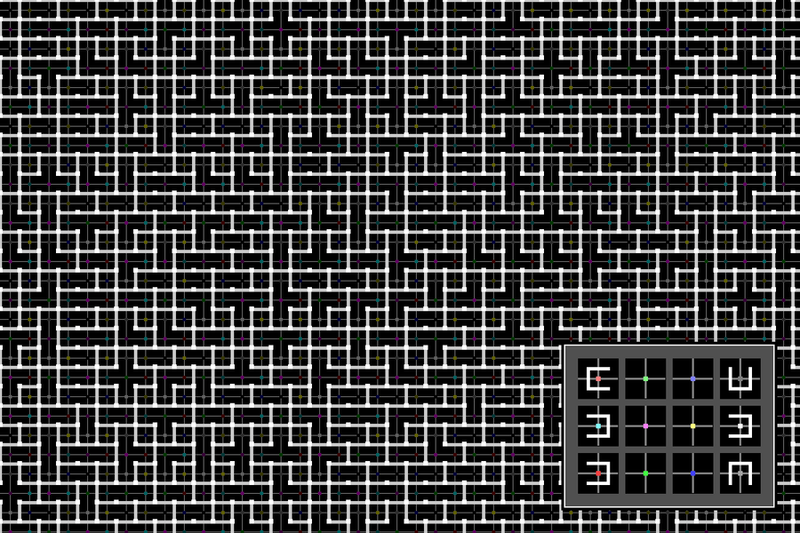 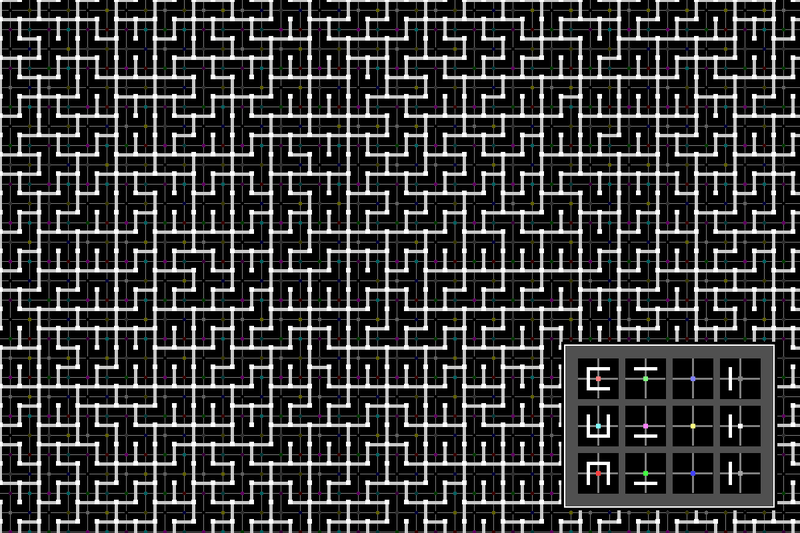 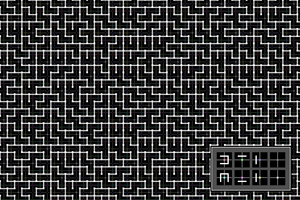 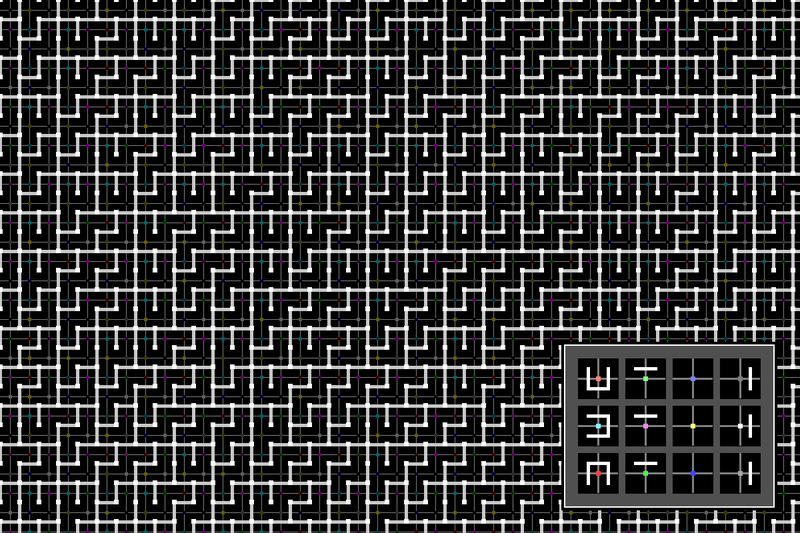 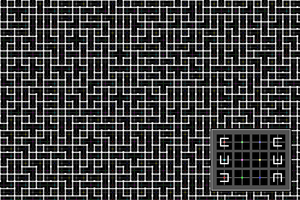 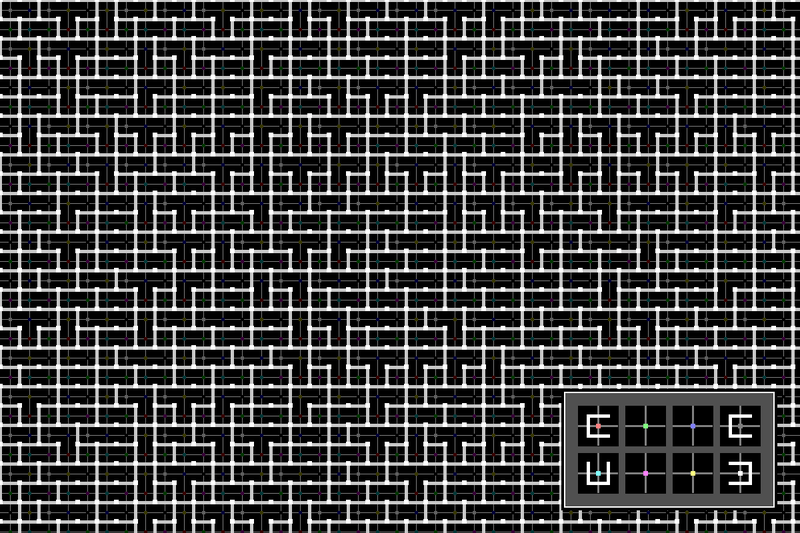 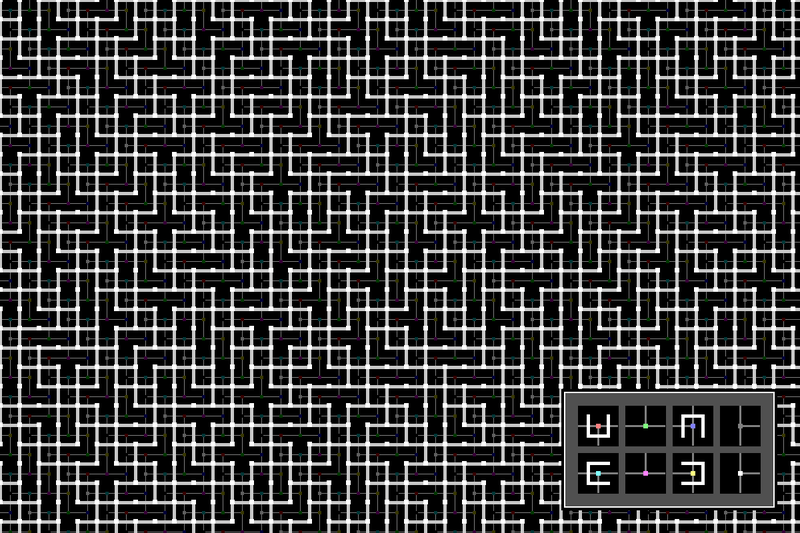 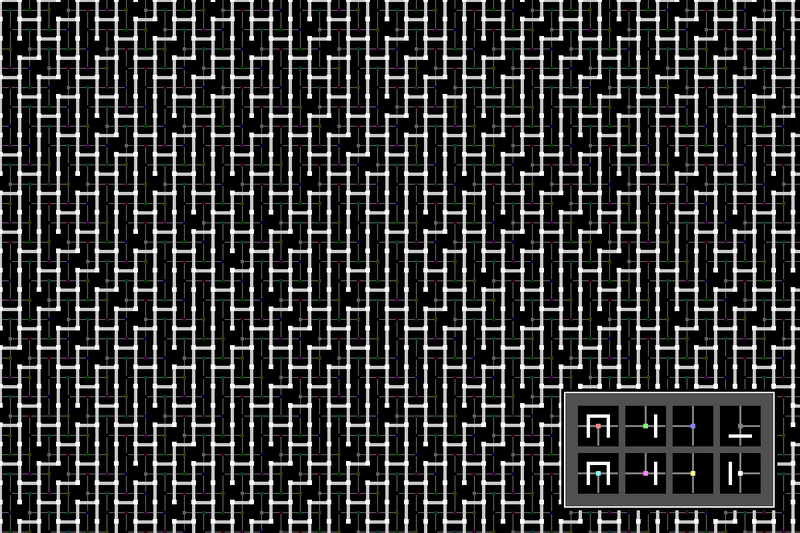 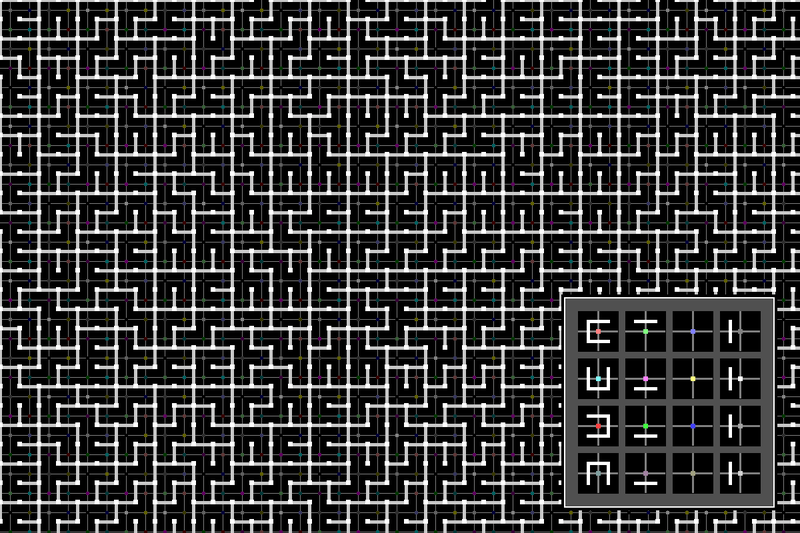 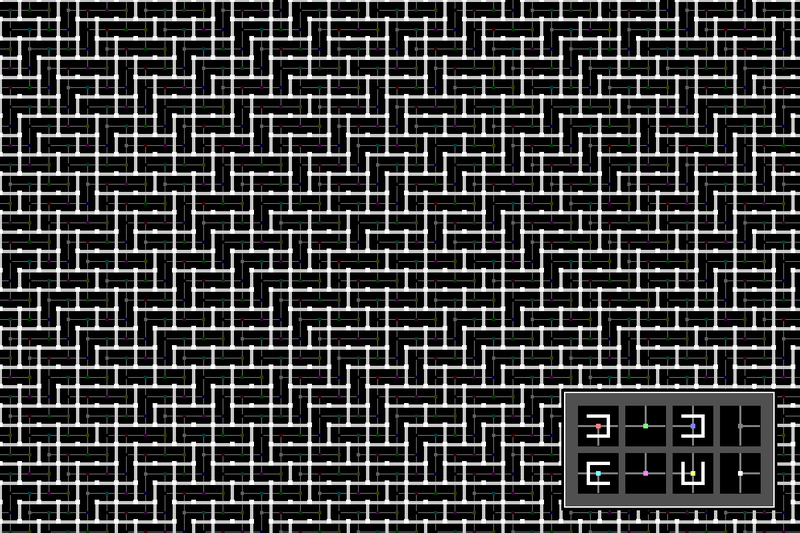 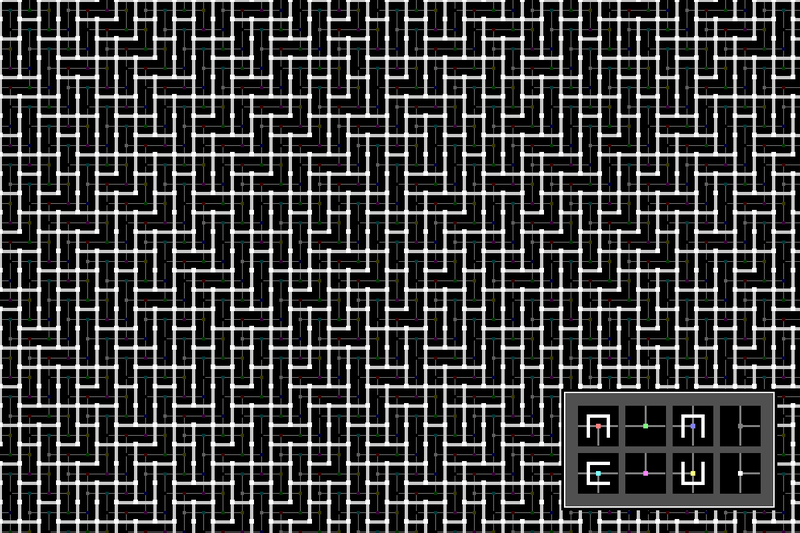 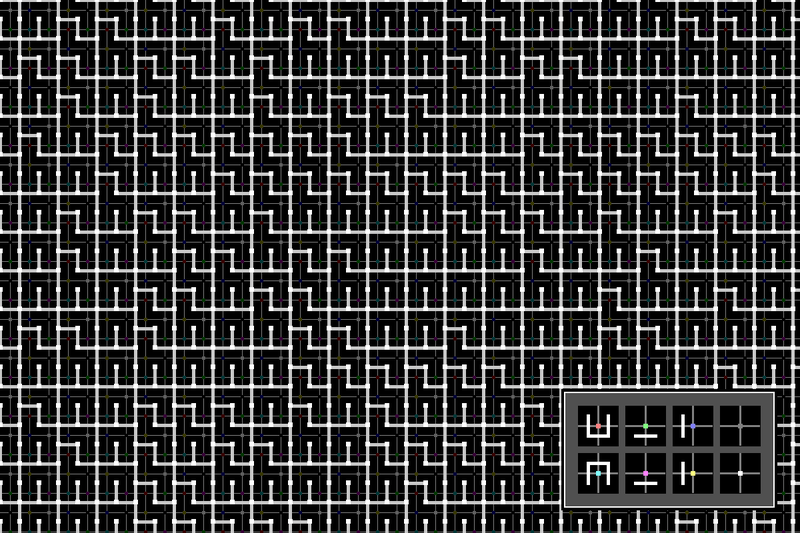 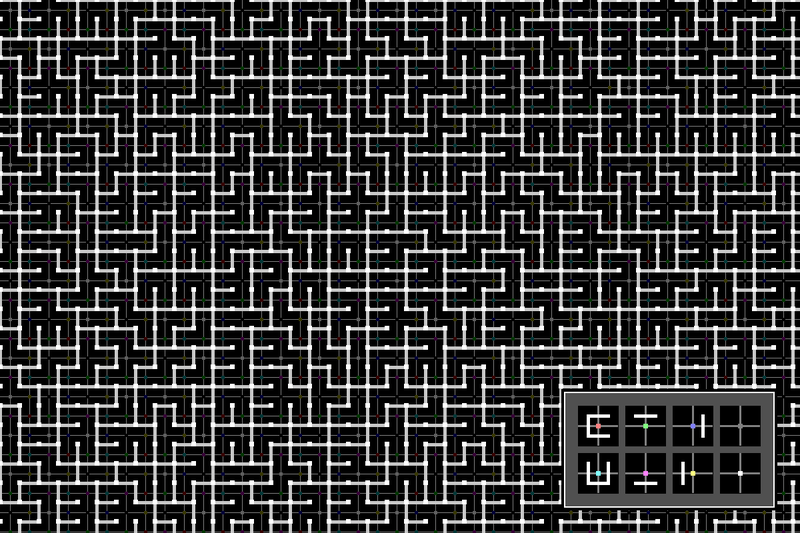 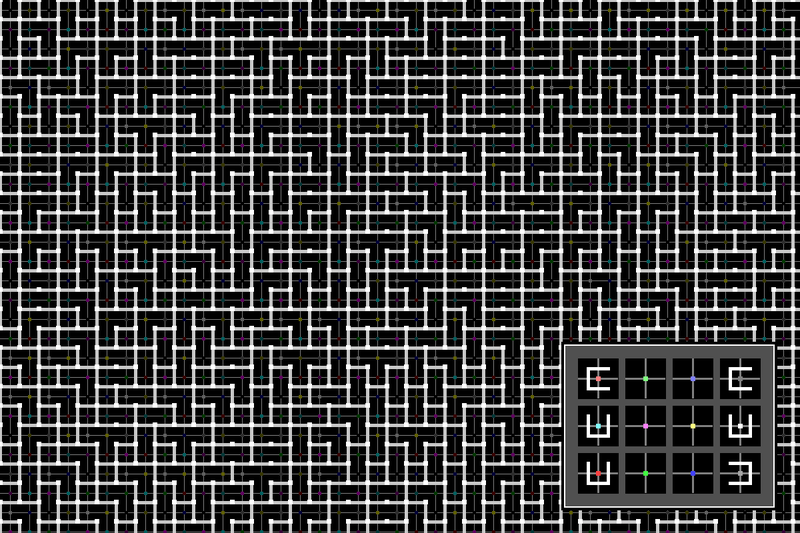 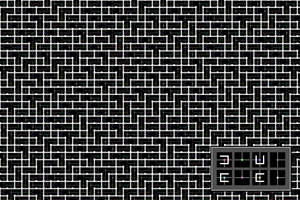 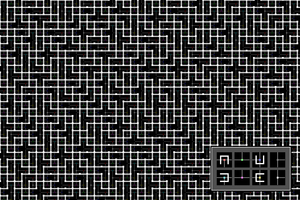 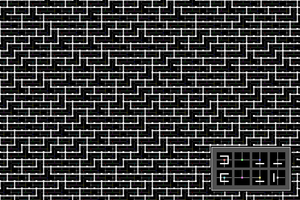 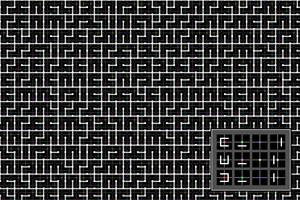 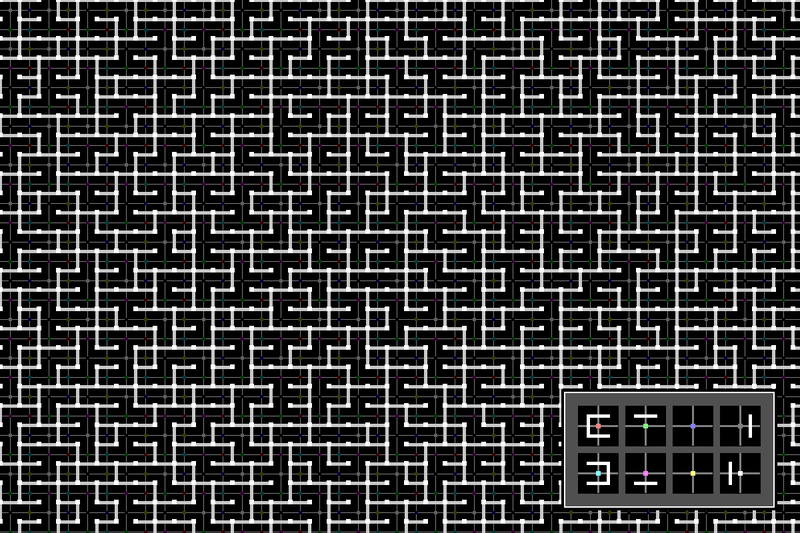 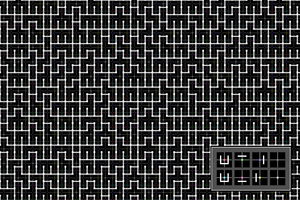 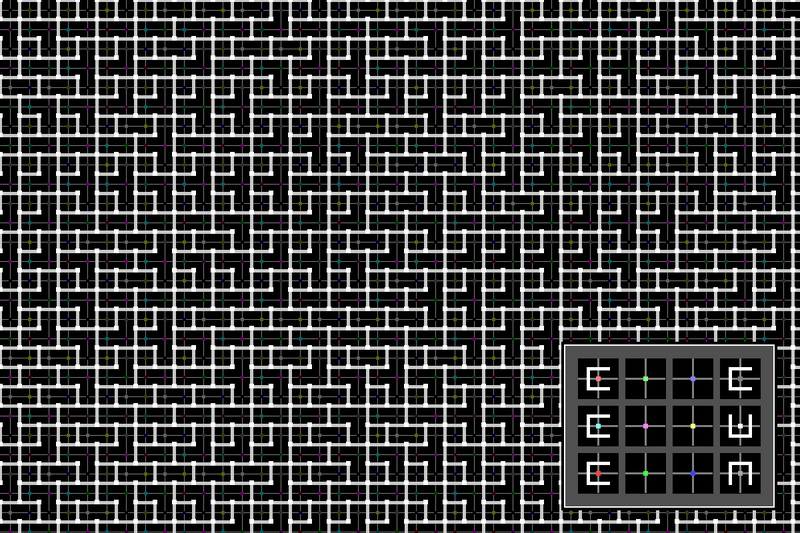 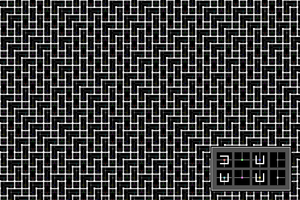 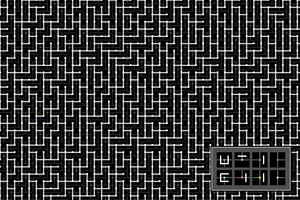 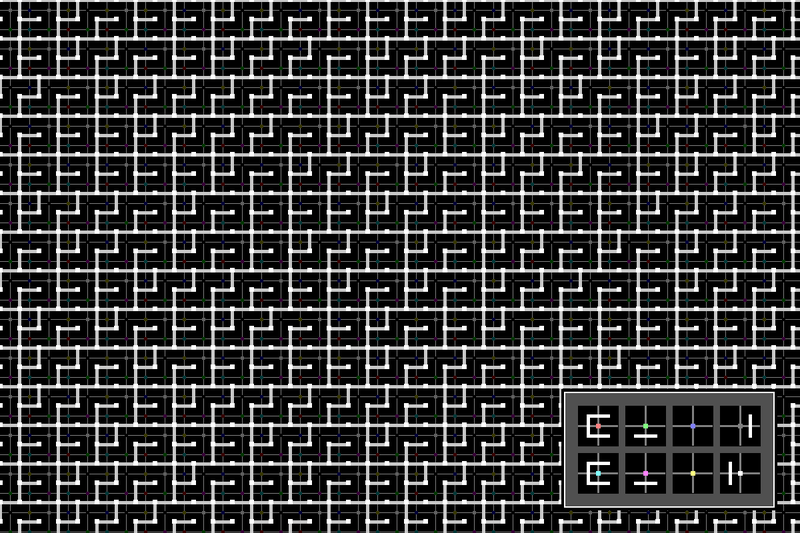 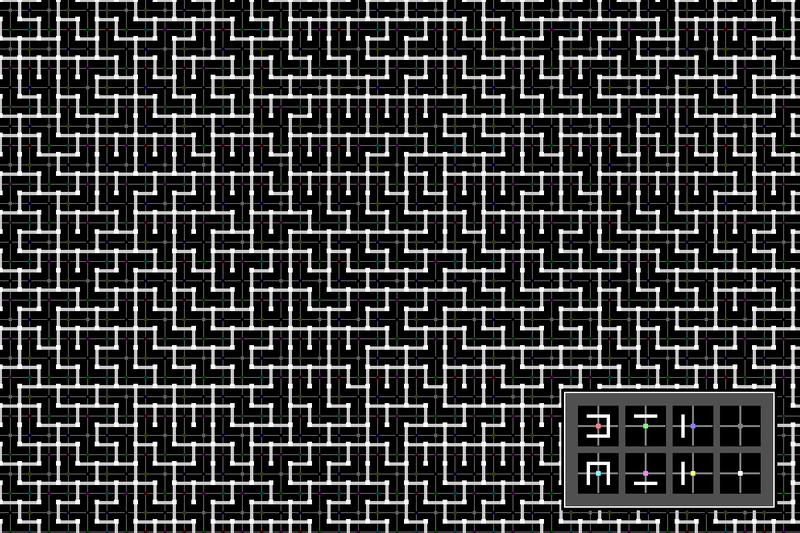 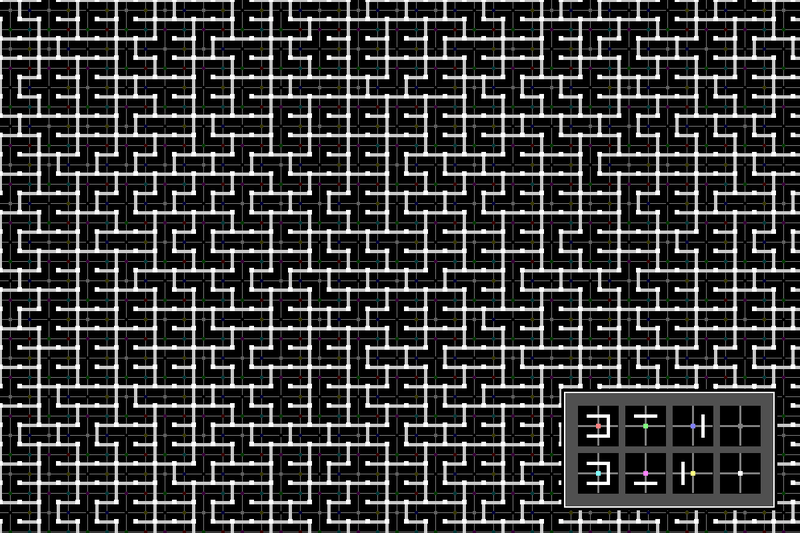 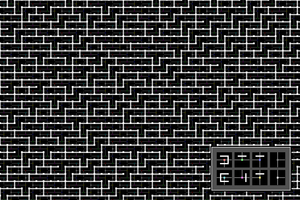 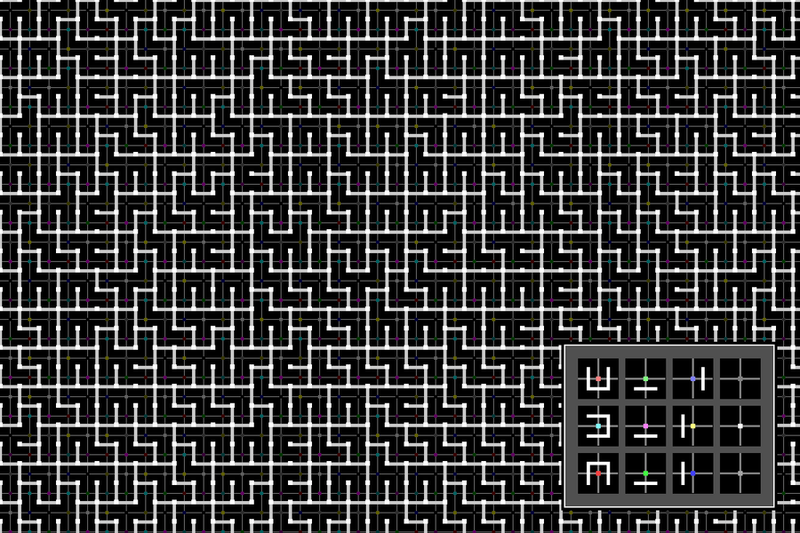 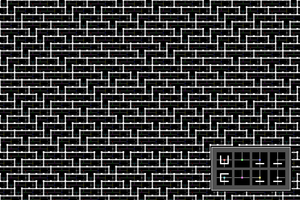 Note that this is essentially the same amount of tile content required to author a herringbone Wang tile set, which can have much, much more complicated connectivities. 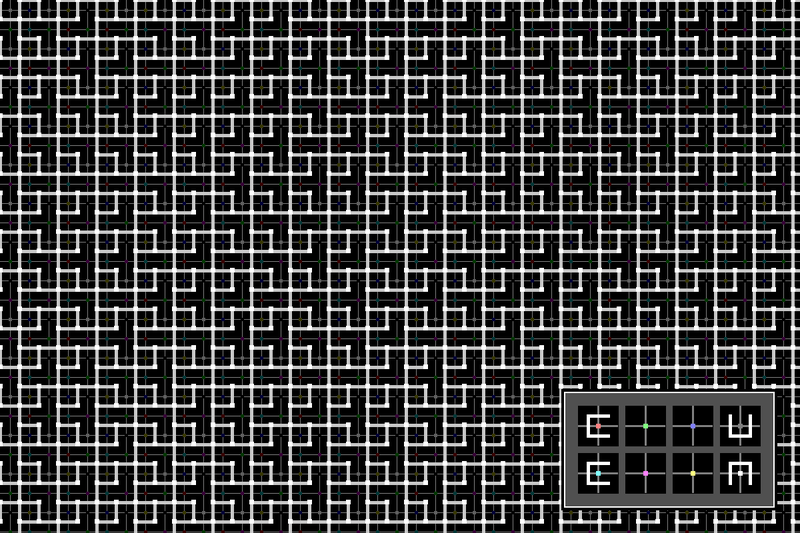 In all of the variations in this section, there are unbroken horizontal or vertical lines of connectivity spaced either every 1 or every 2 columns or rows. There are many very different variations with this property. In each of the following tilesets , the loops form a Tetris piece (made of four 1x1 pseudo-tiles) which is intermixed with two other shapes (one made of two or three pseudo-tiles, the other of five or six). 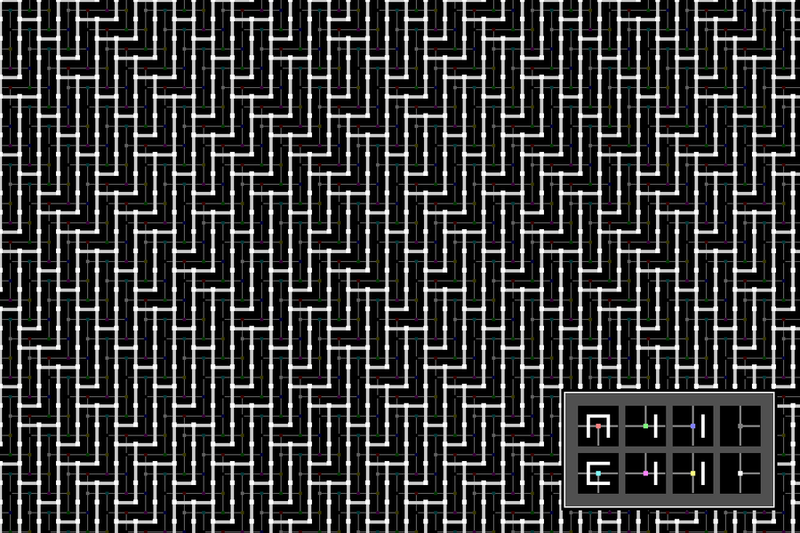 As above, but the extra shapes are made of 1 and 7 pseudo-tiles. 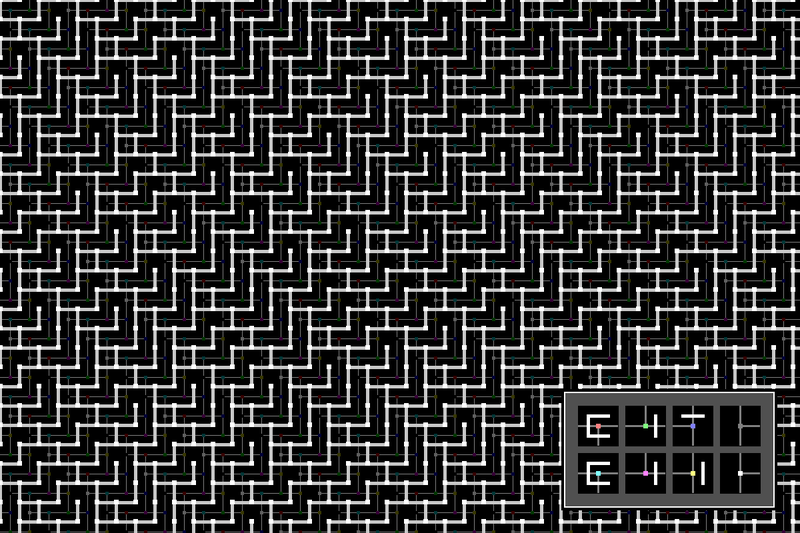 The connectivity loops for the following tilings each prominently include two or more Tetris pieces, along with two smaller and two larger shapes. 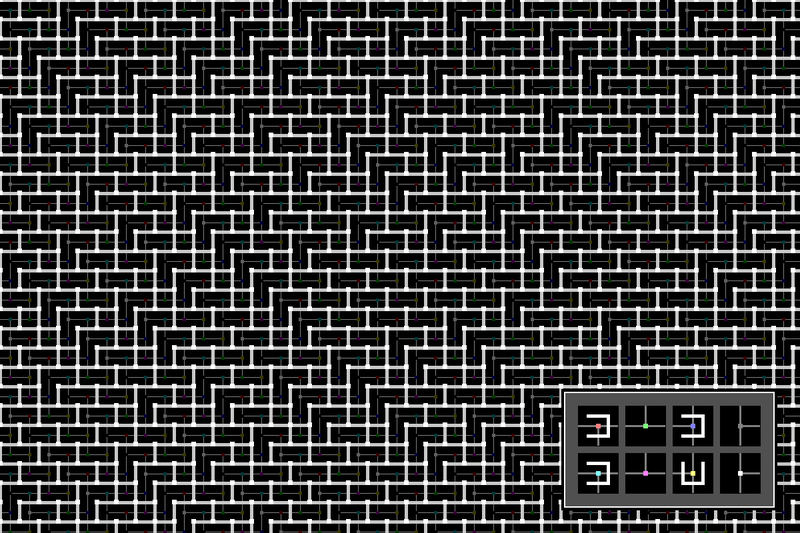 The "infinite lines" section includes tilings which have infinite lines on either the horizontal or vertical axis. This section includes tilings which have similar features, but are broken up occasionally. 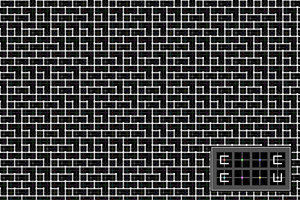 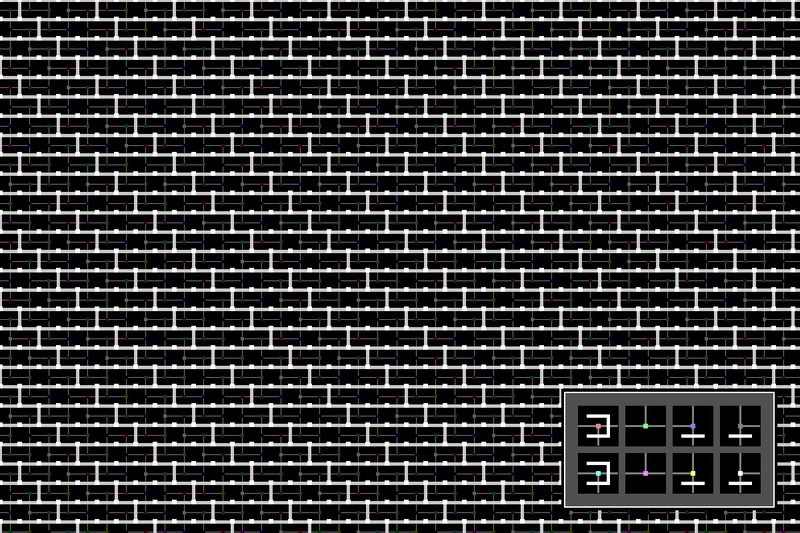 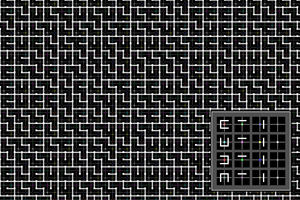 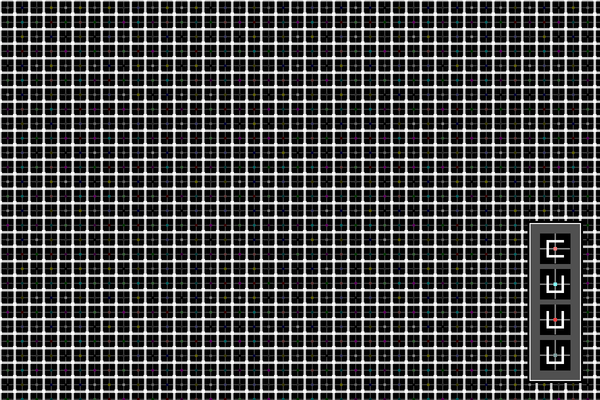 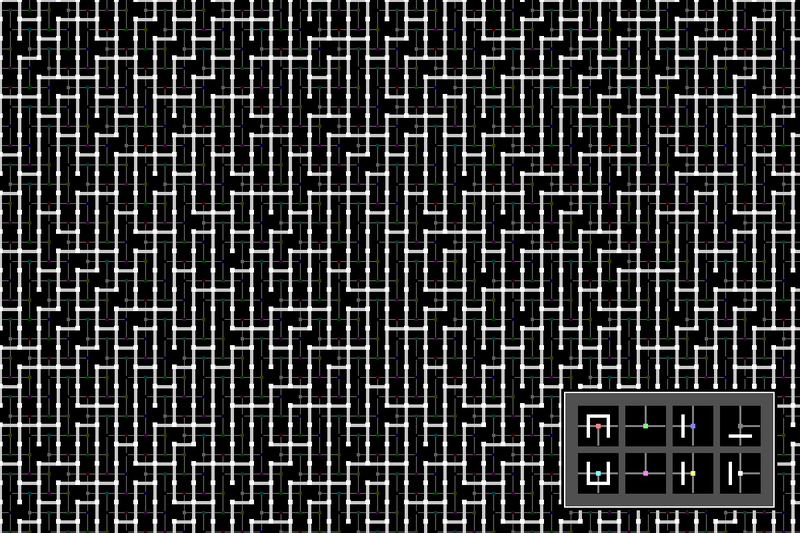 These tilesets show a strong bias towards either the horizontal or the vertical. 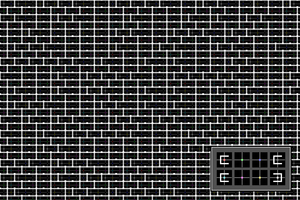 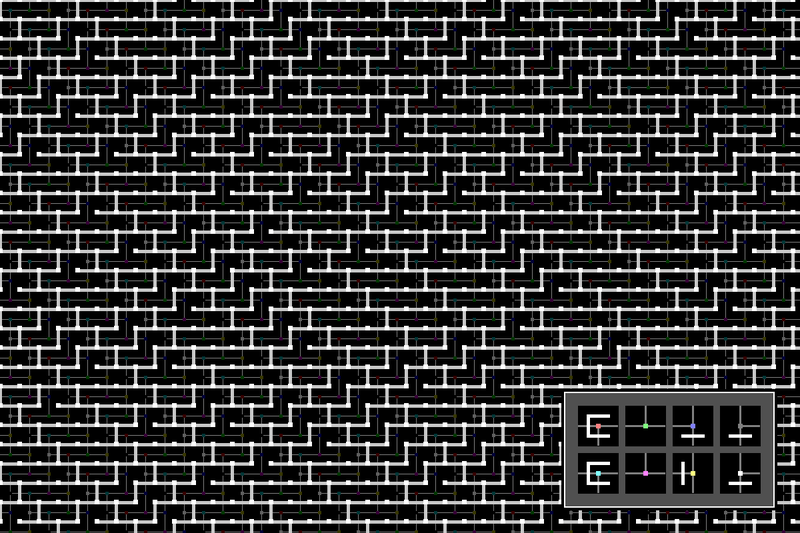 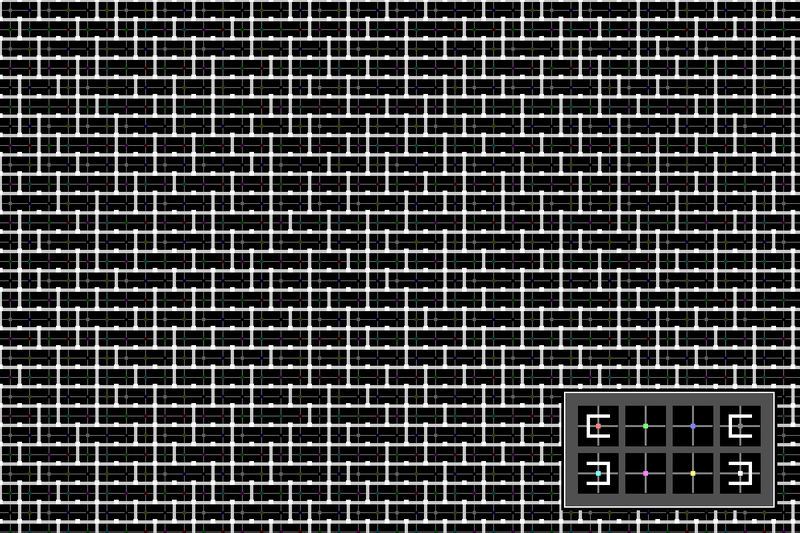 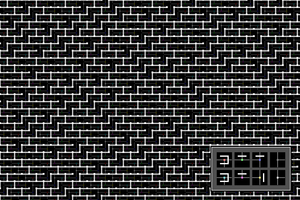 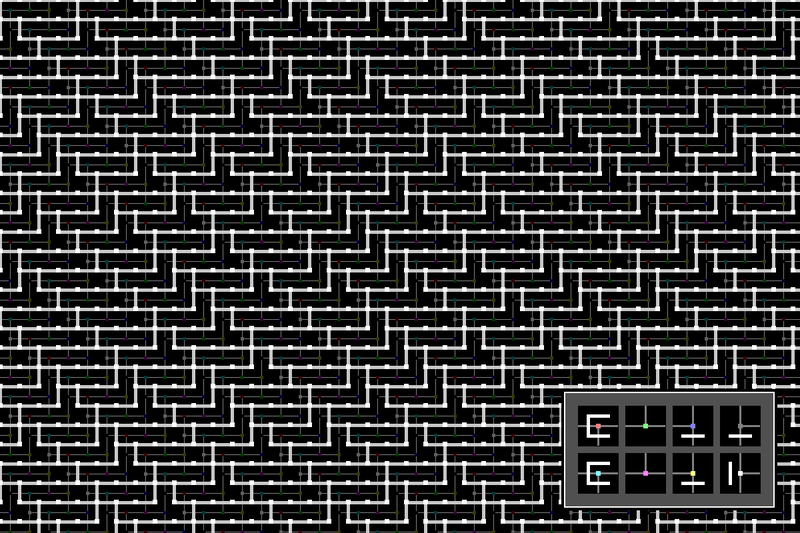 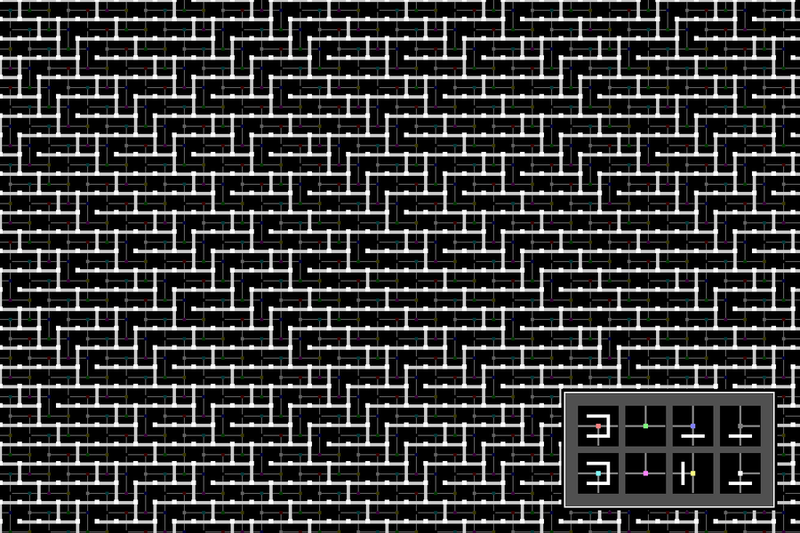 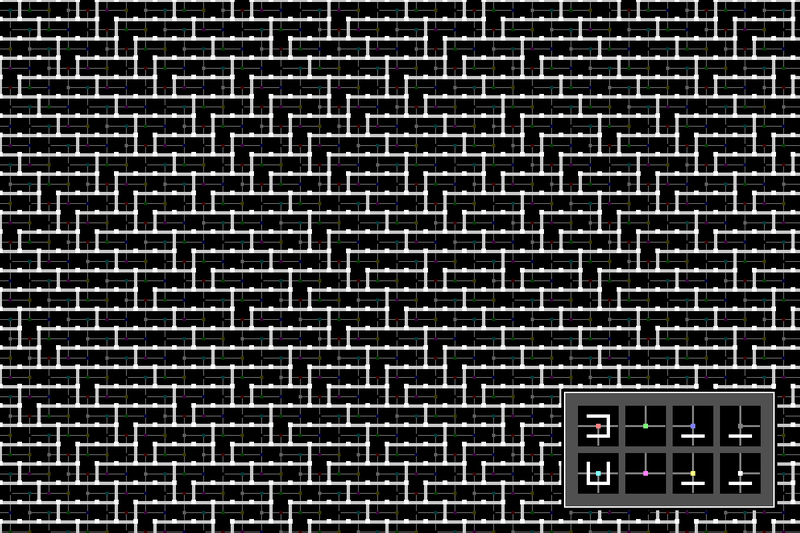 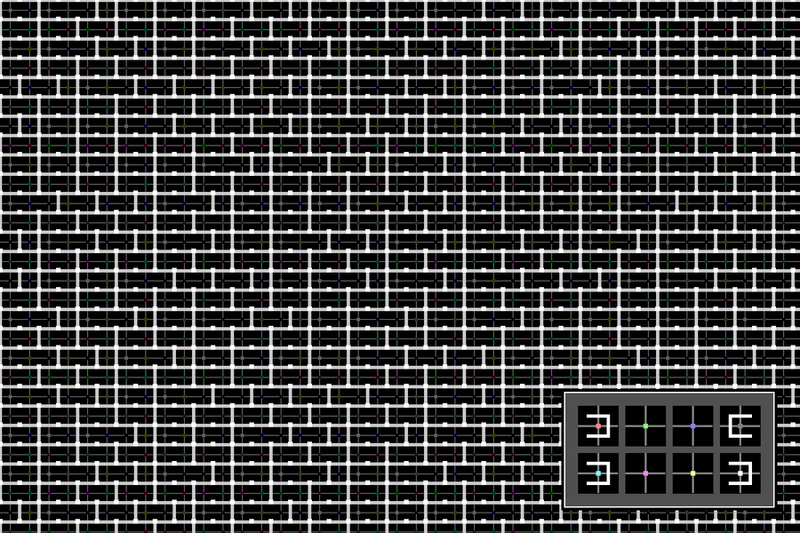 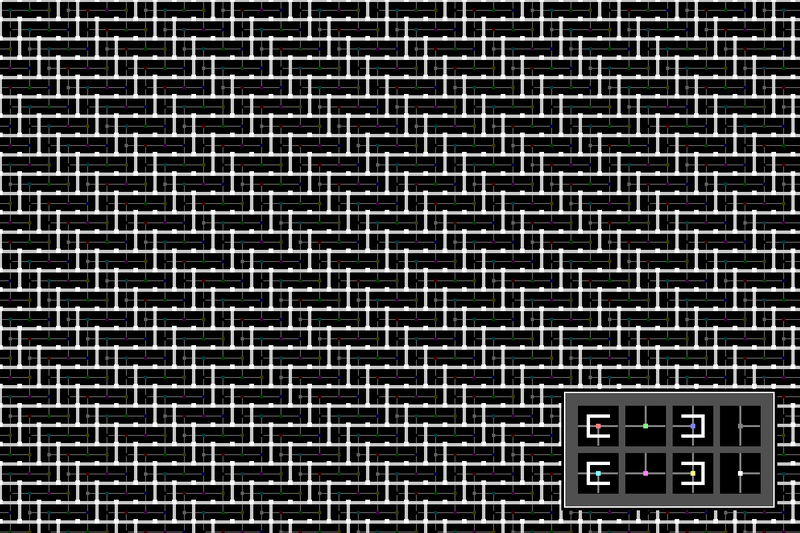 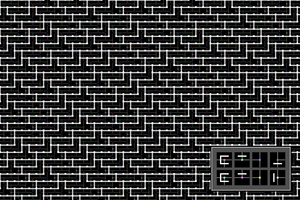 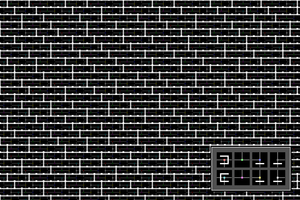 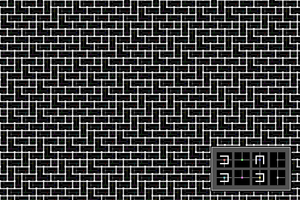 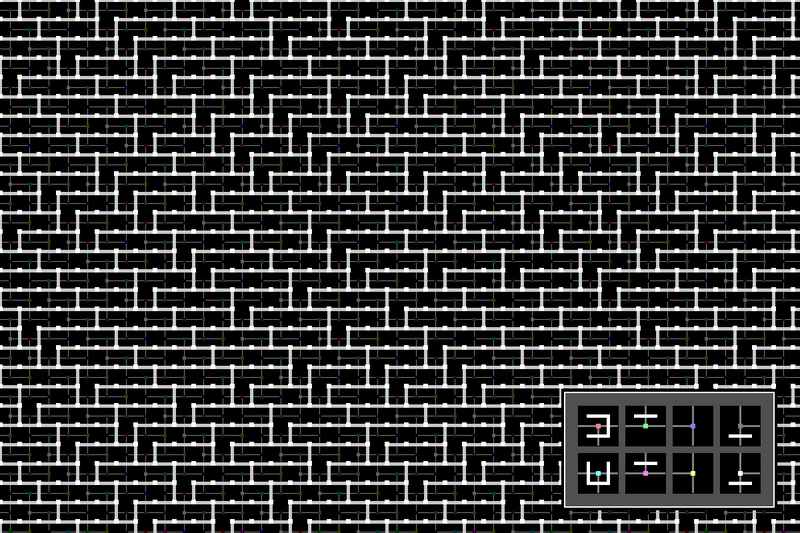 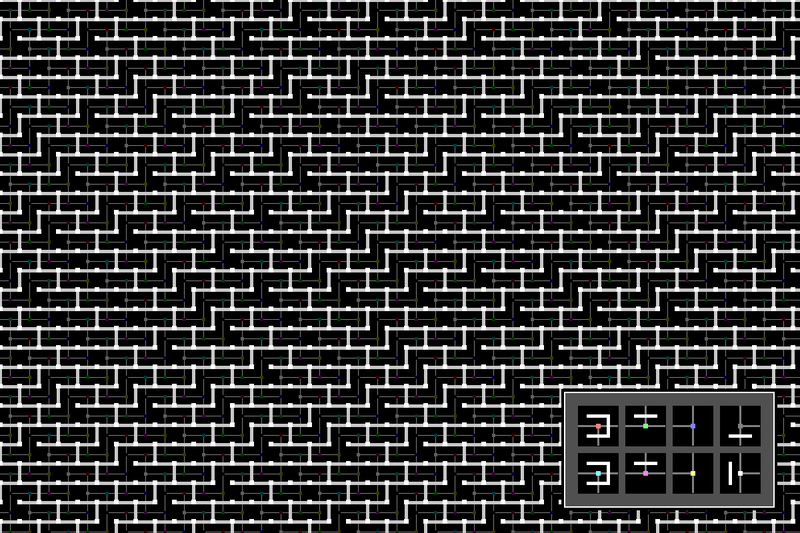 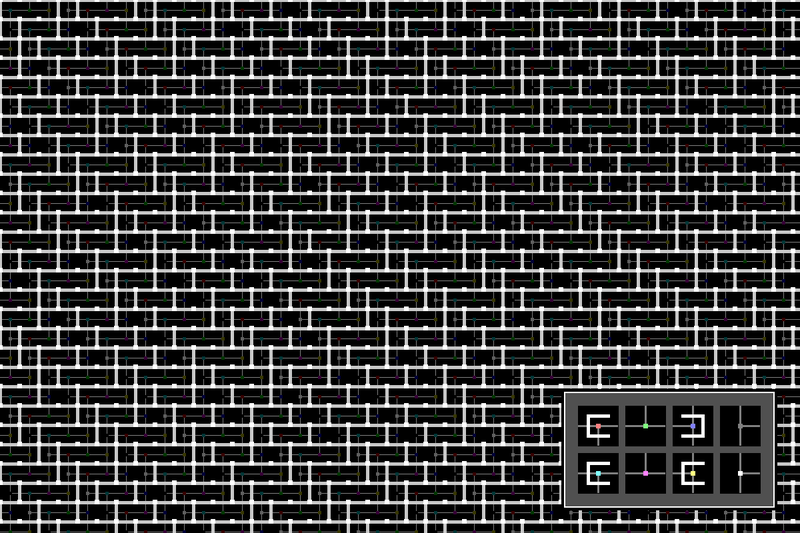 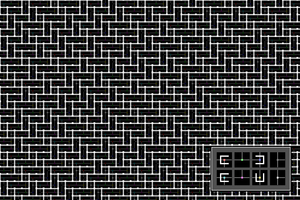 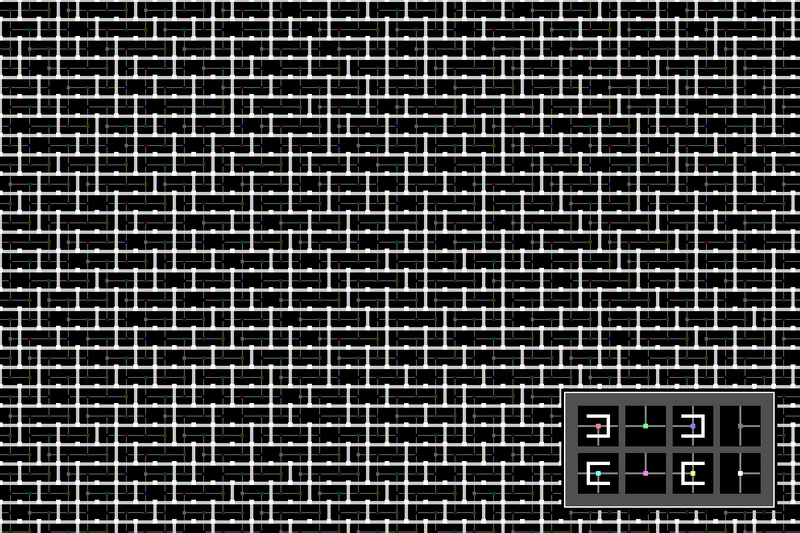 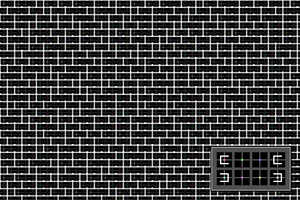 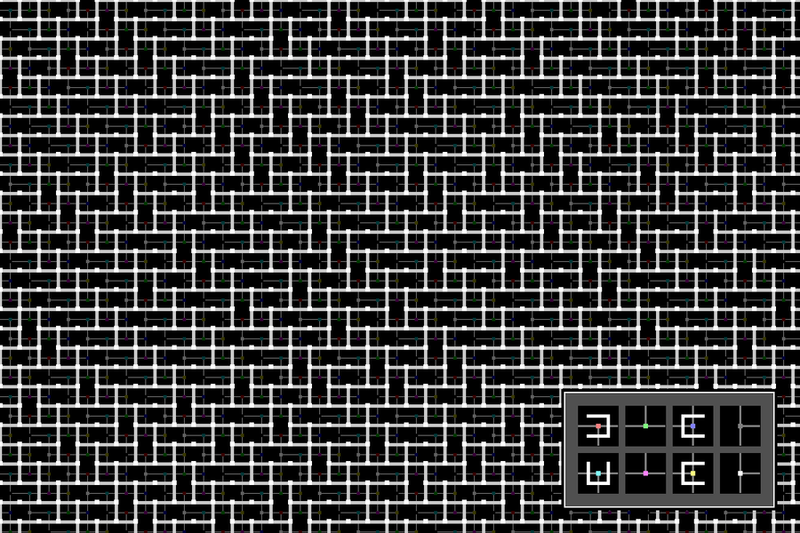 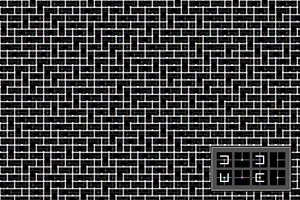 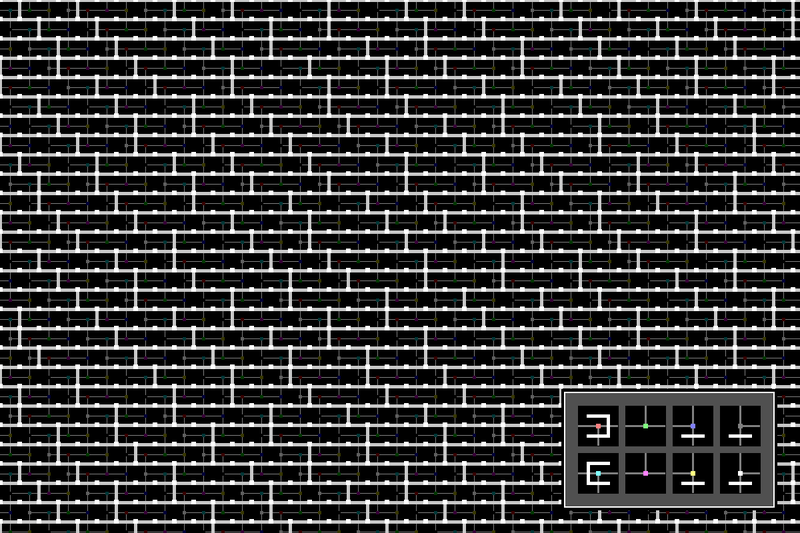 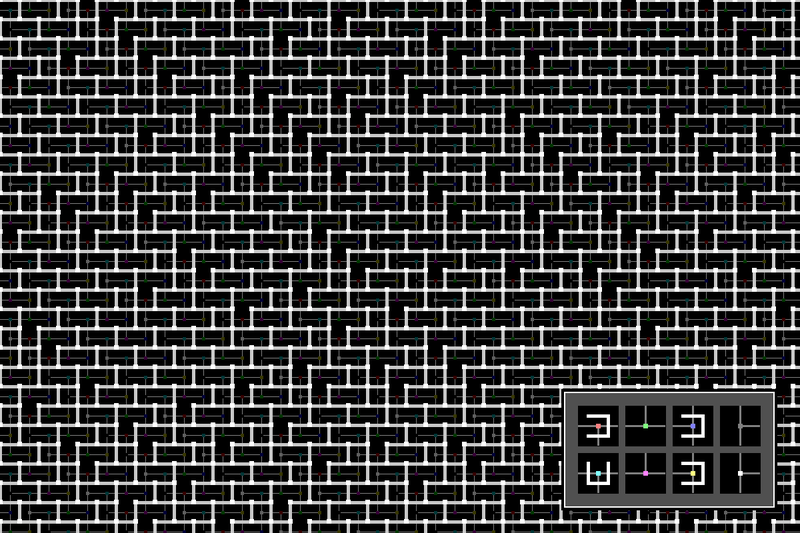 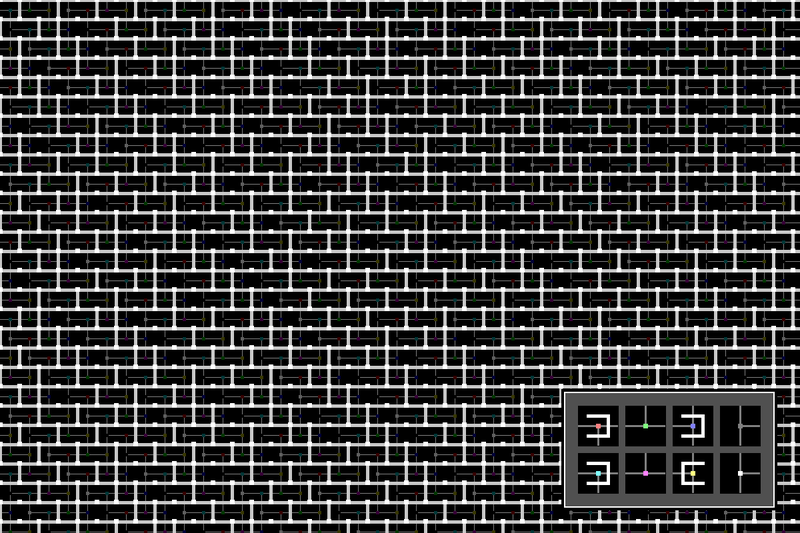 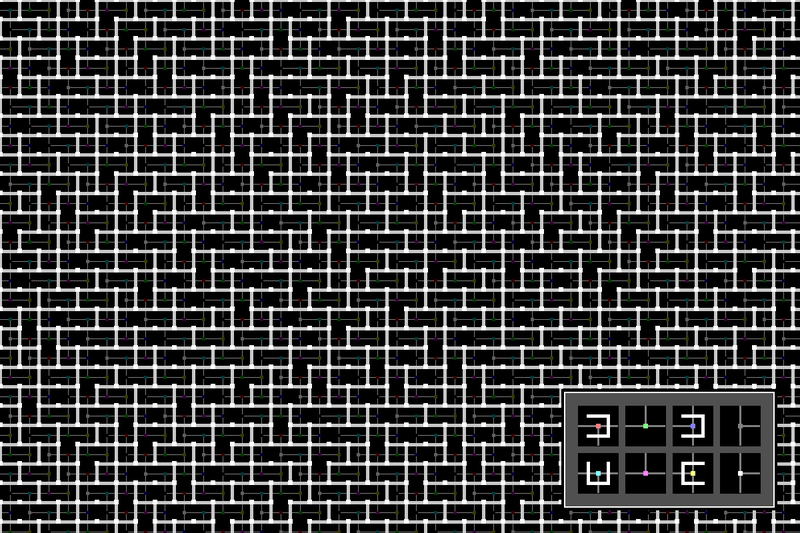 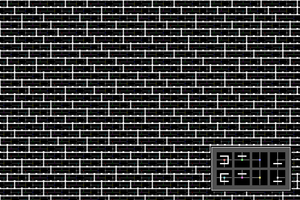 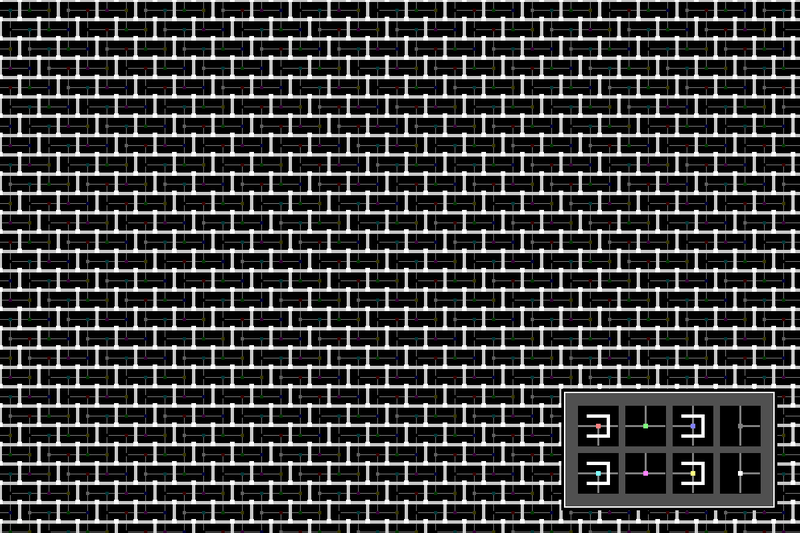 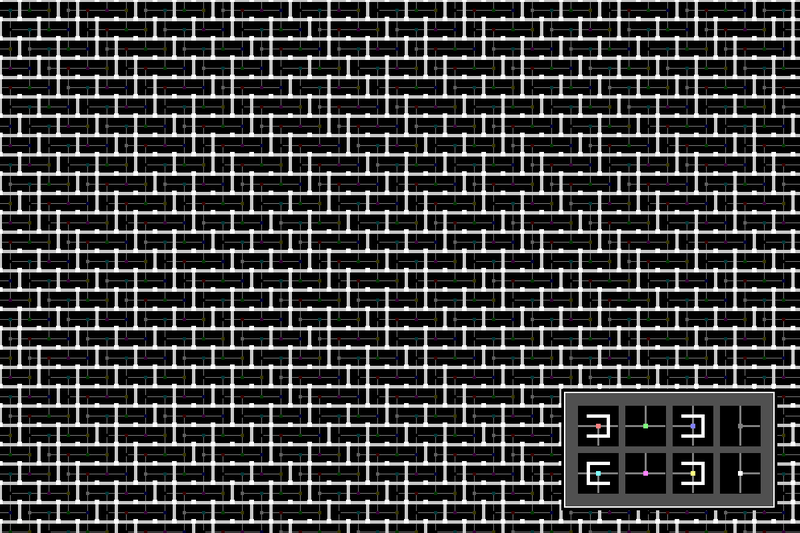 The following tilesets show a strong bias towards a brick pattern or a herringbone pattern. 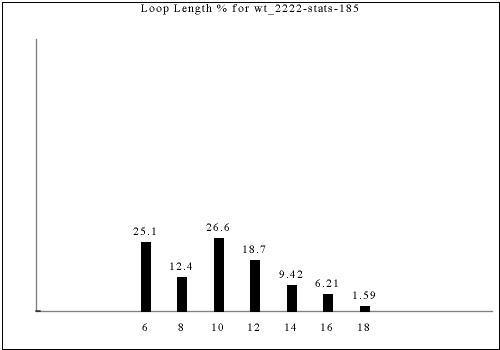 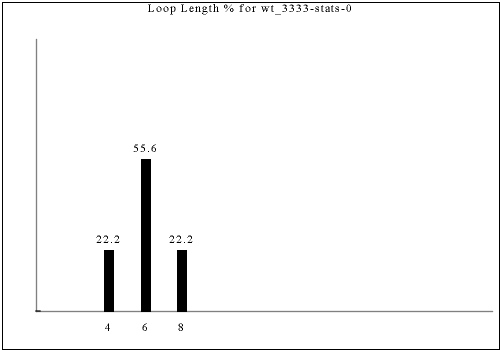 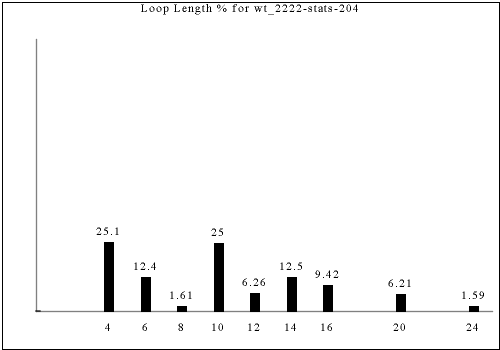 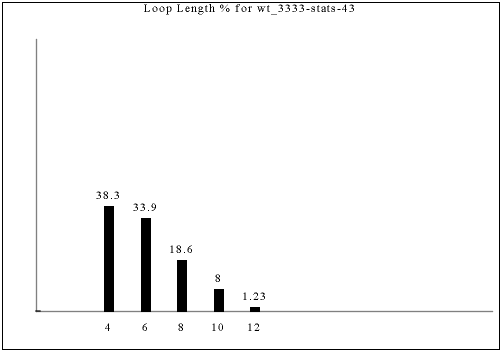 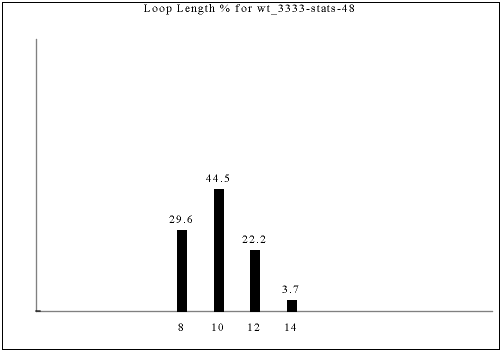 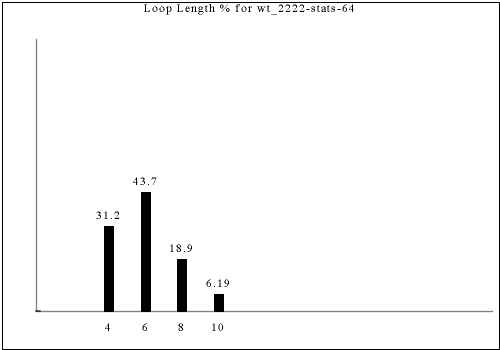 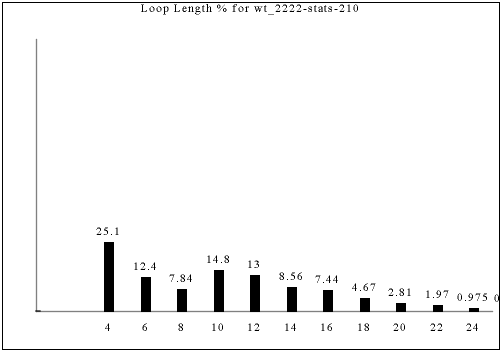 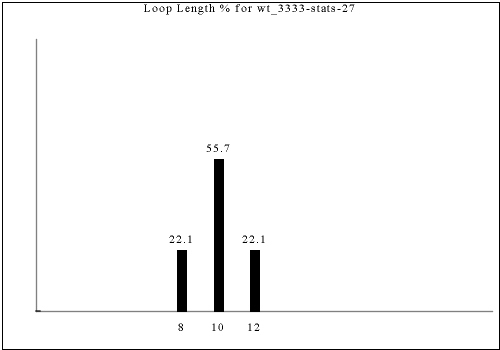 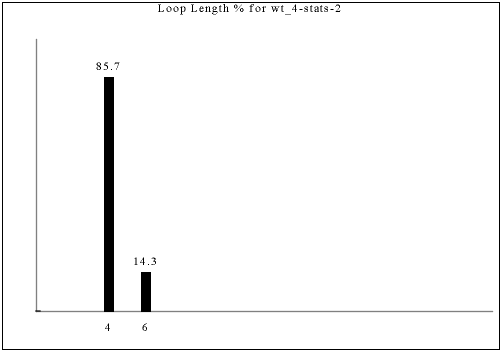 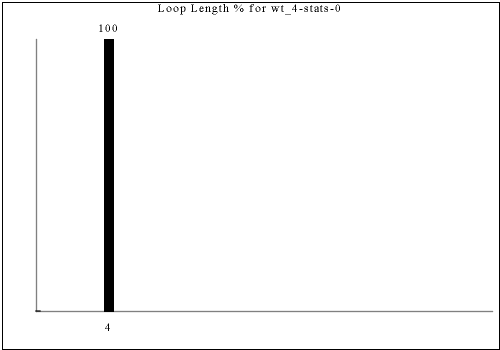 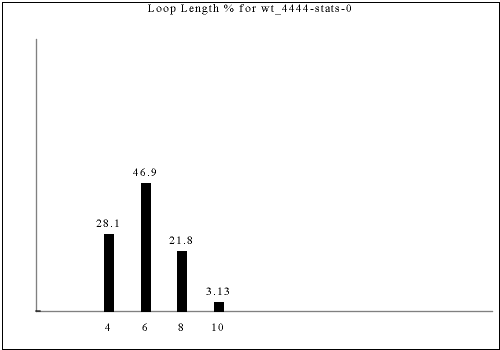 These connectivity graphs show a strong diagonal bias, and feature a high frequency of 1x1 loops. These were left after all the other classificationsw ere made. 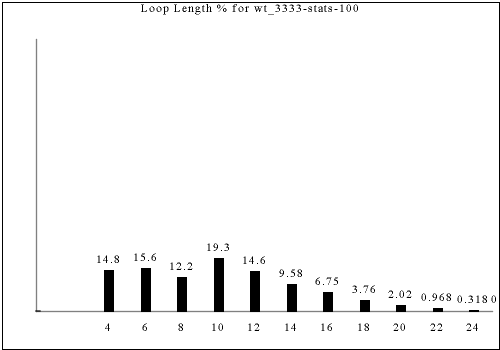 Each of the following variations uses between 3-5 relatively smiple shapes. The various tilesets found here have either one, two, or three directions of dead-ends. 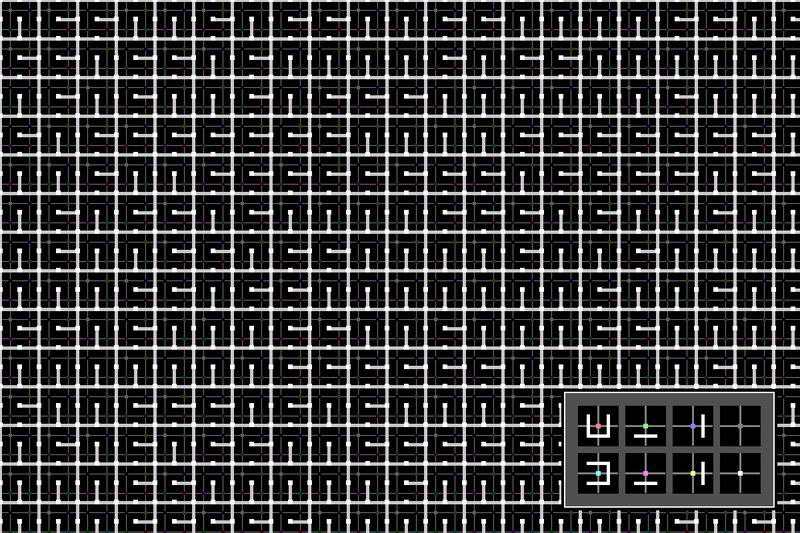 No tileset has dead-ends oriented in all four directions. 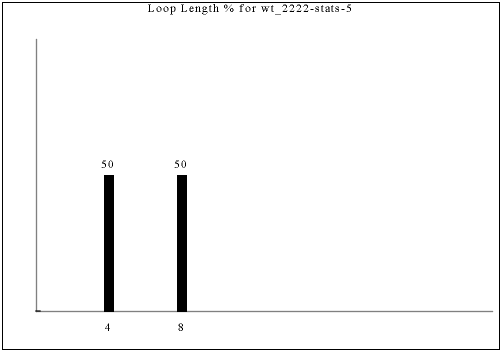 This creates a directional bias that may be objectional in some contexts. 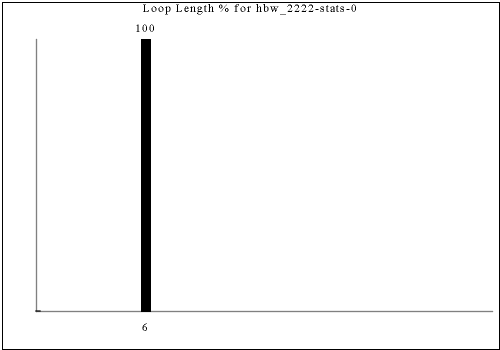 We distinguish first based on the frequency with which dead ends occur. 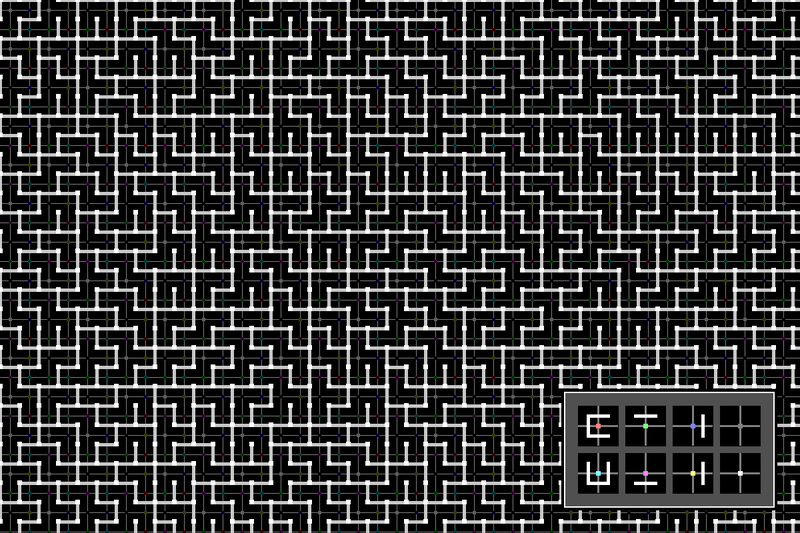 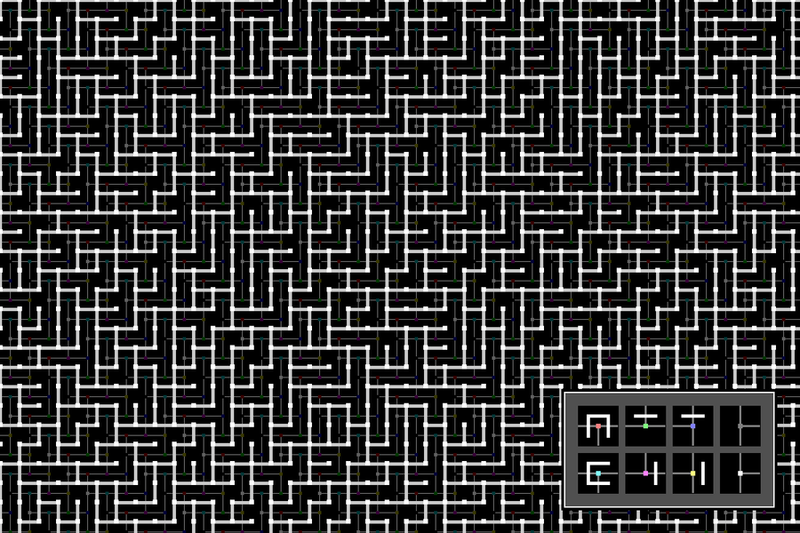 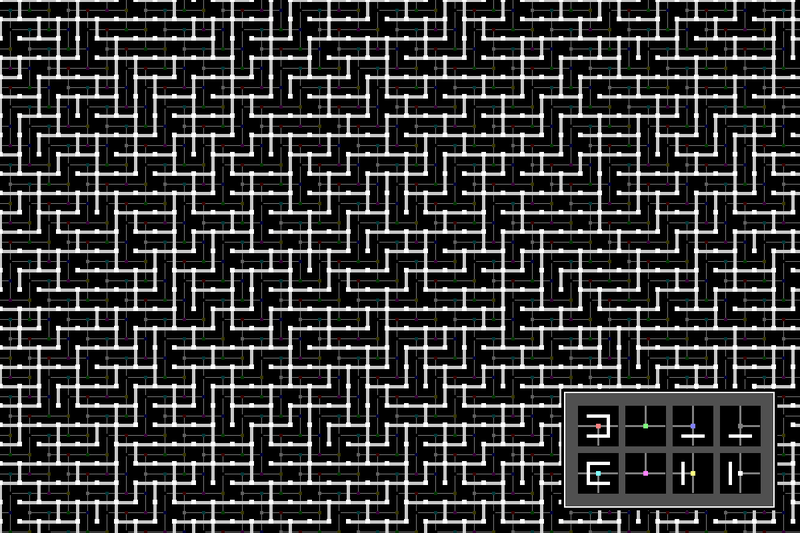 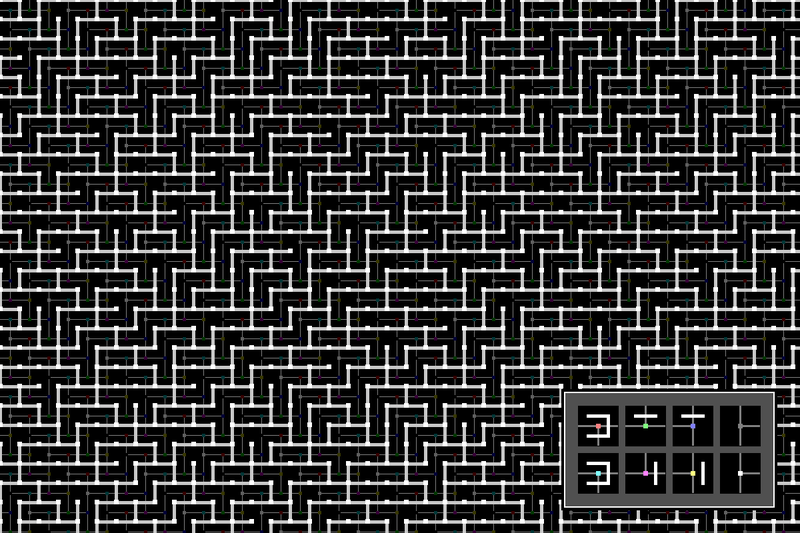 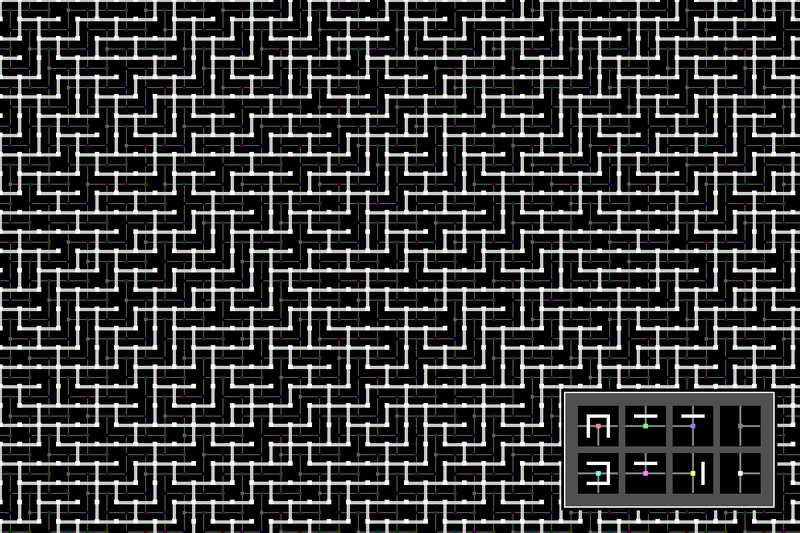 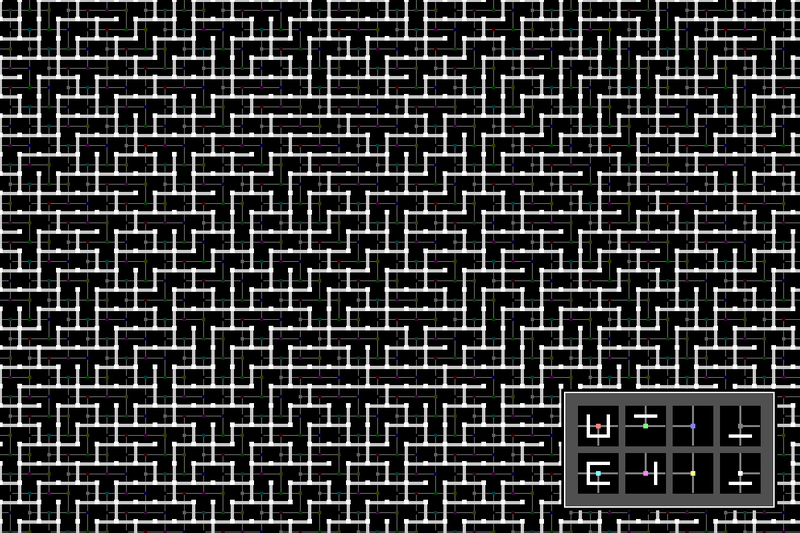 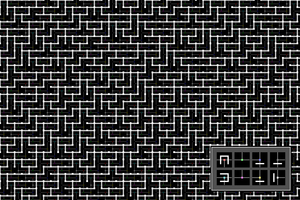 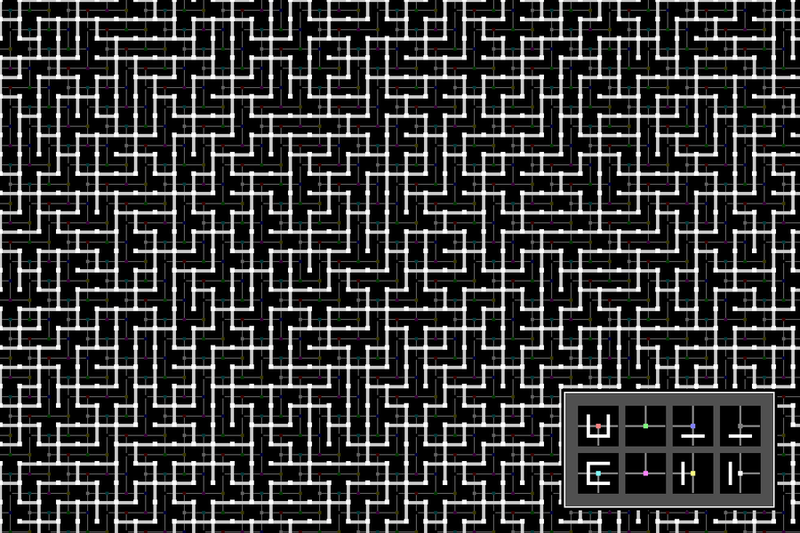 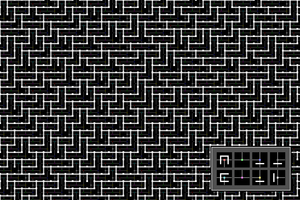 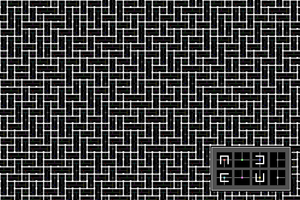 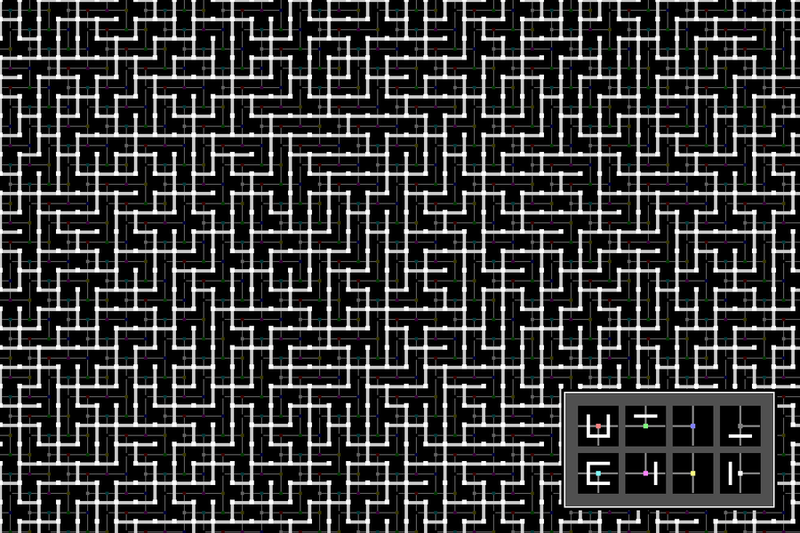 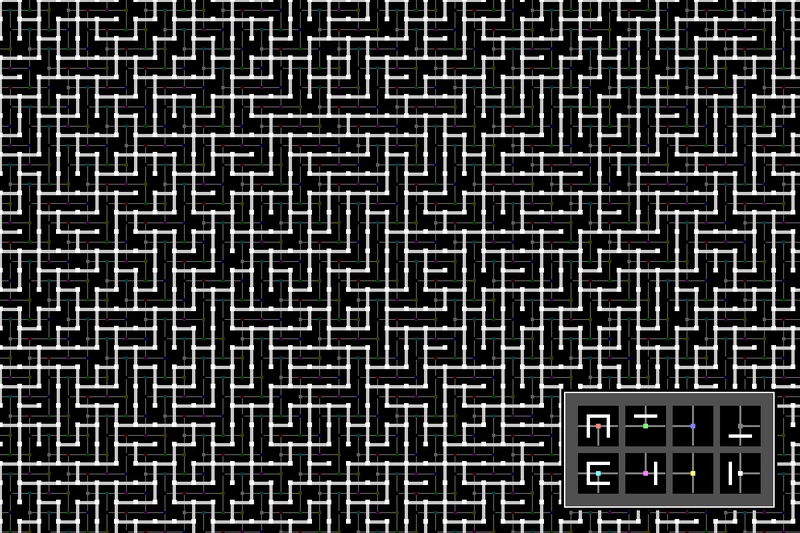 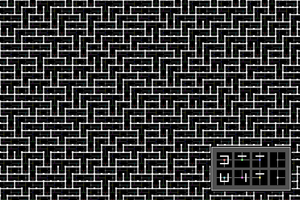 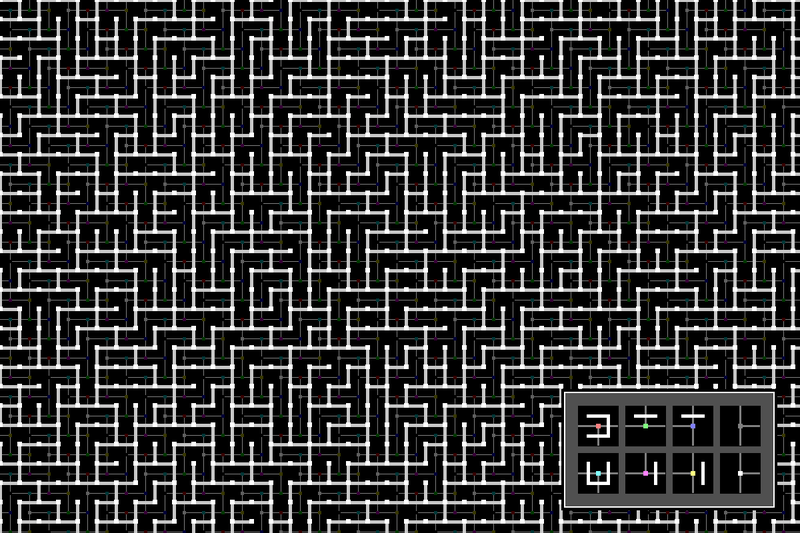 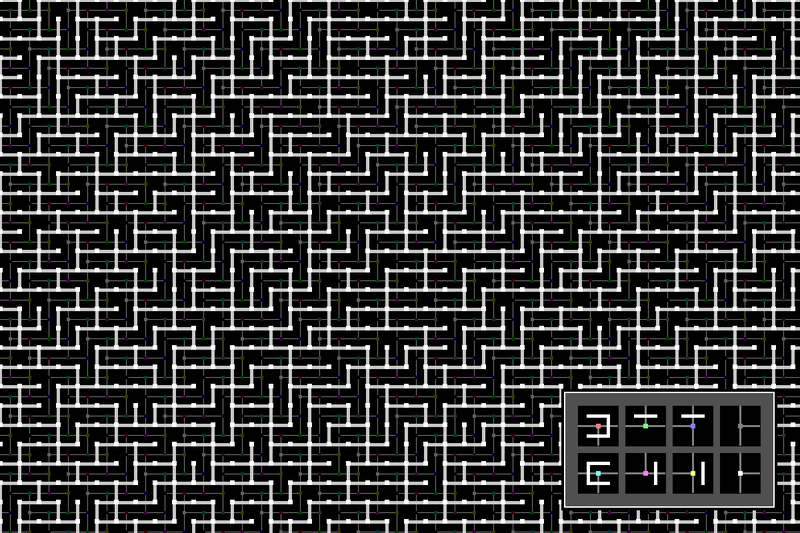 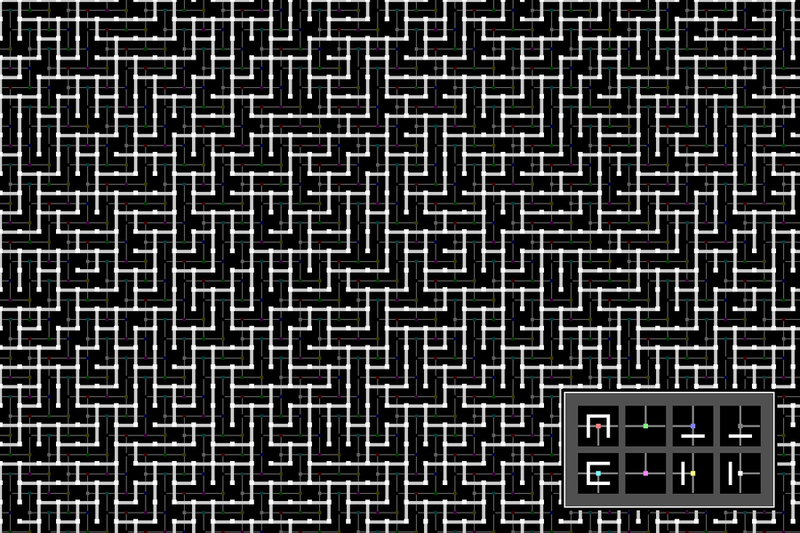 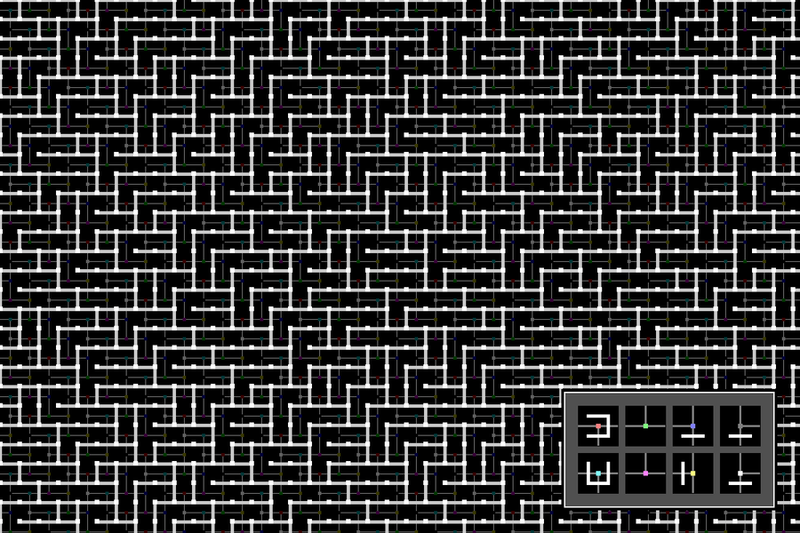 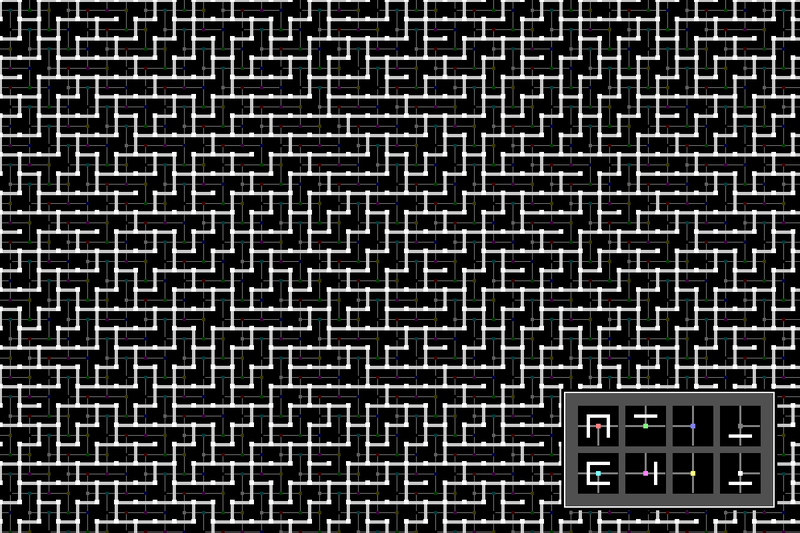 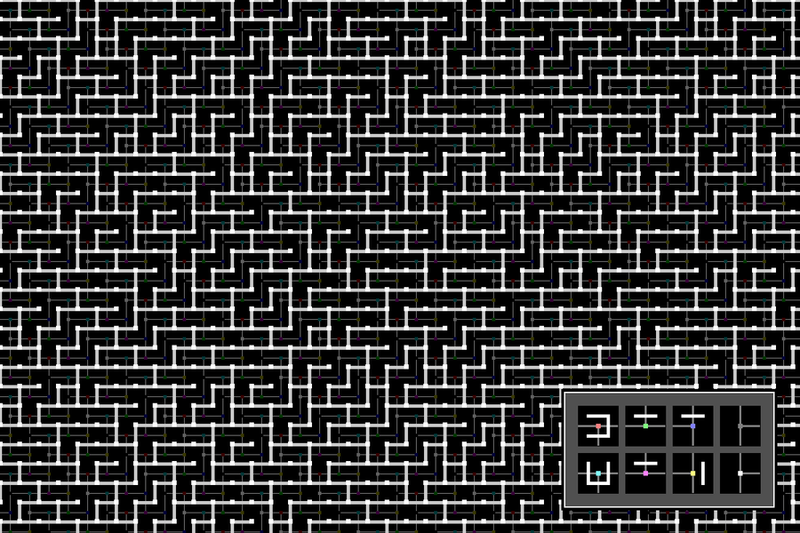 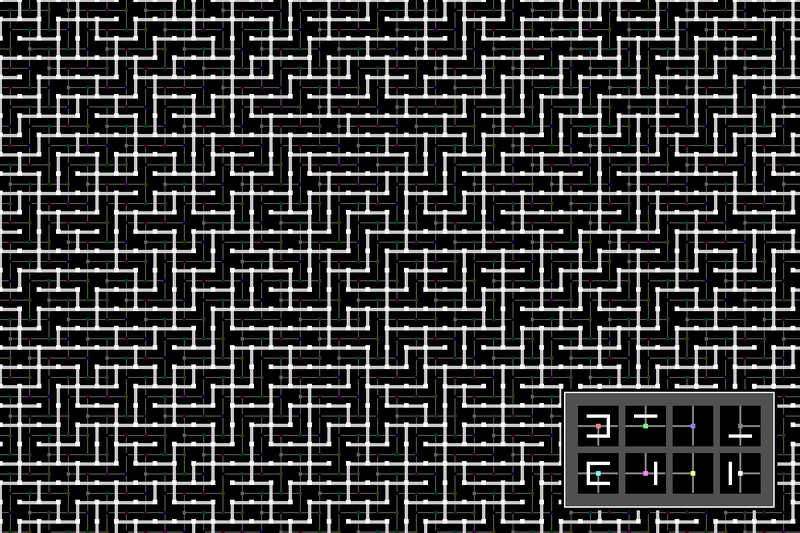 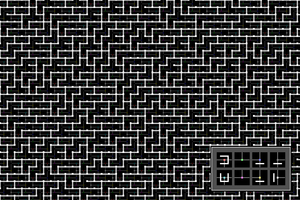 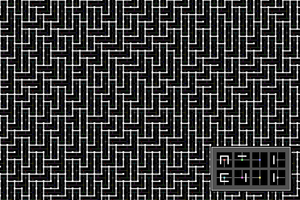 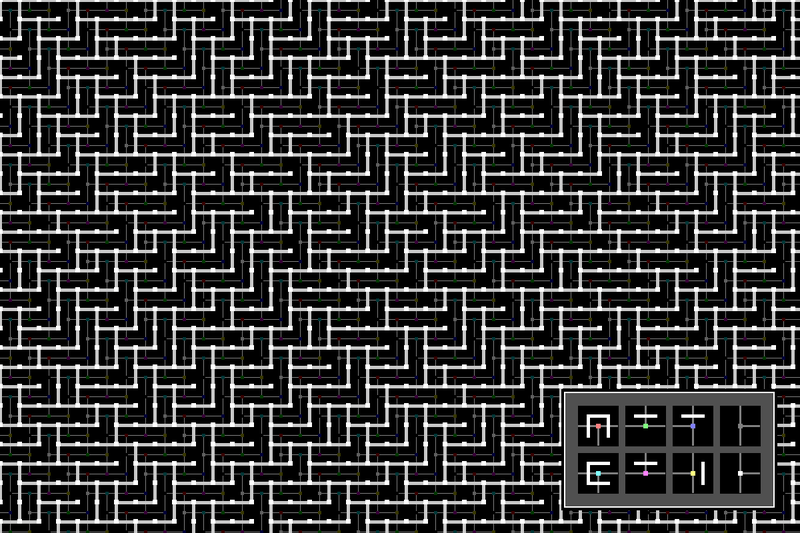 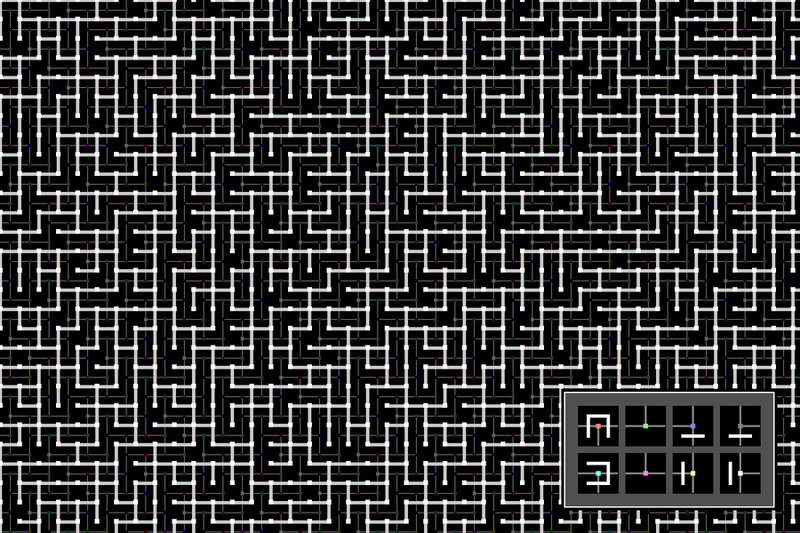 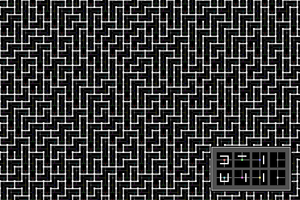 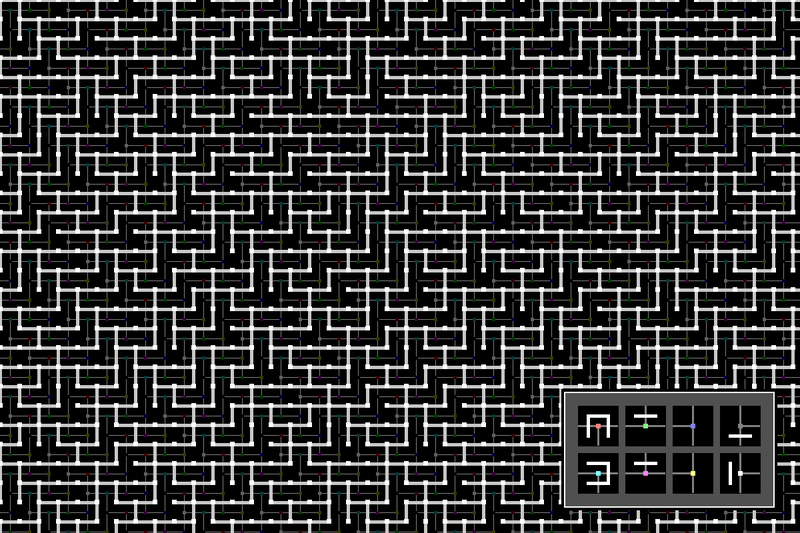 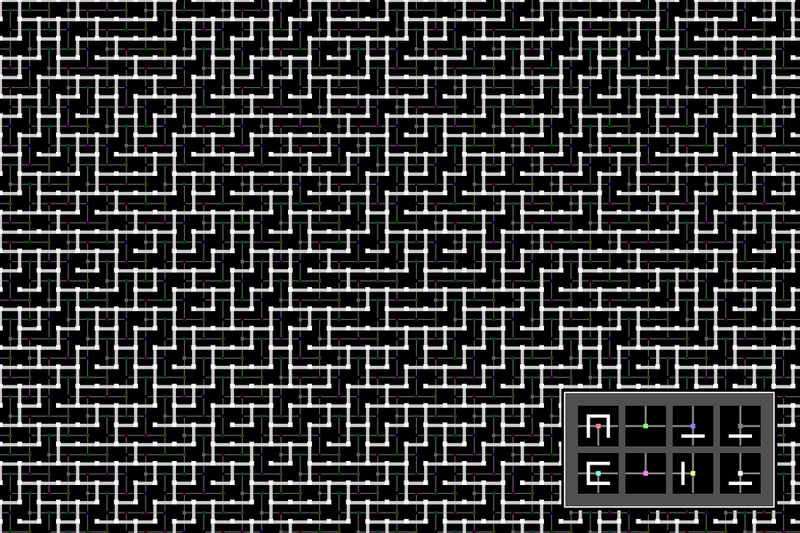 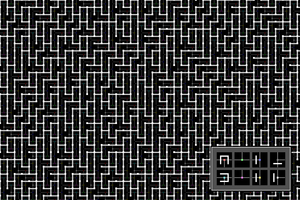 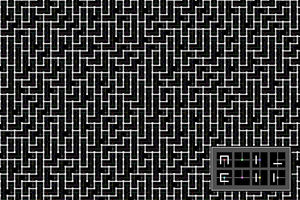 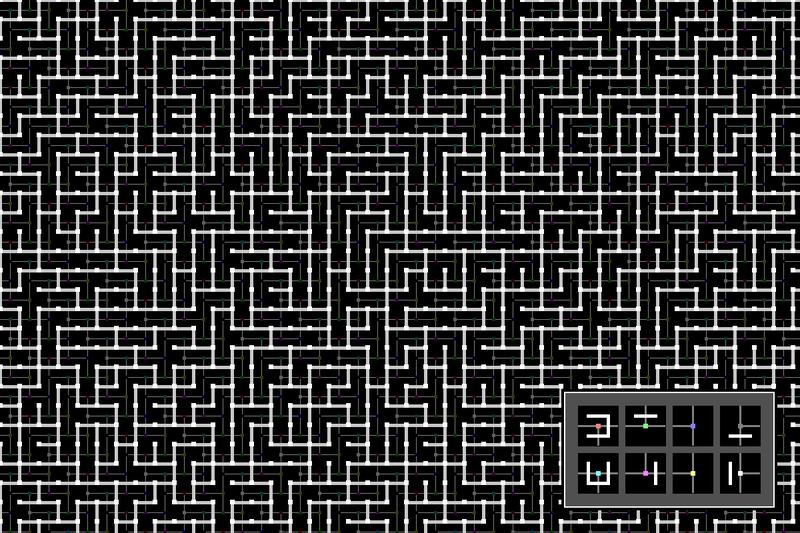 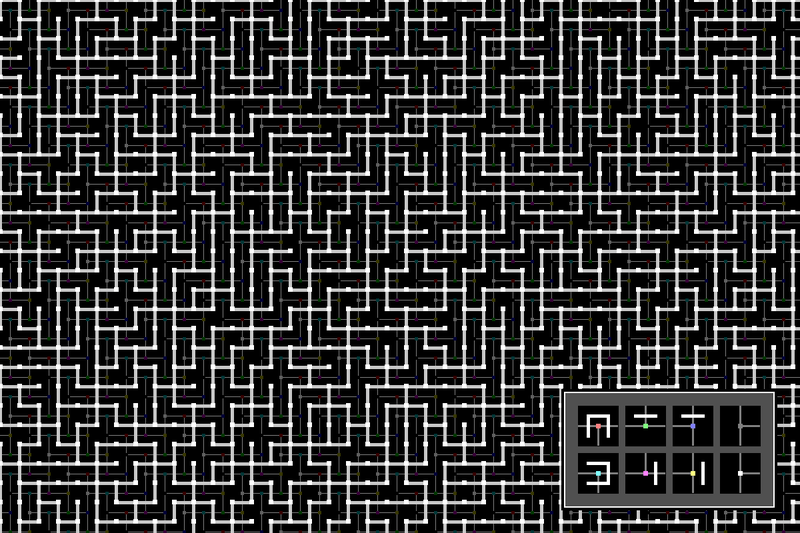 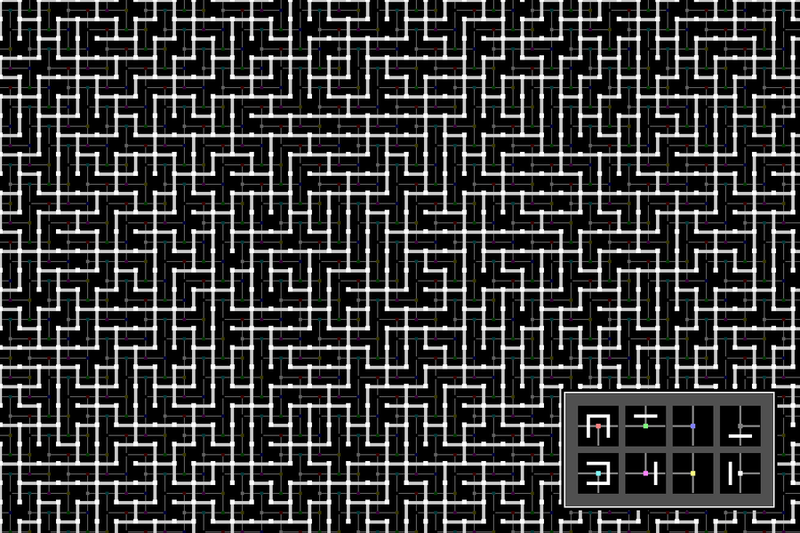 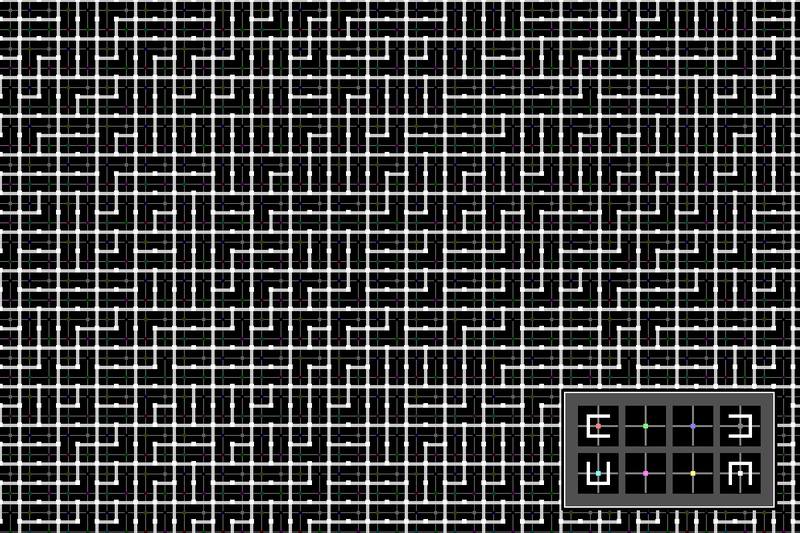 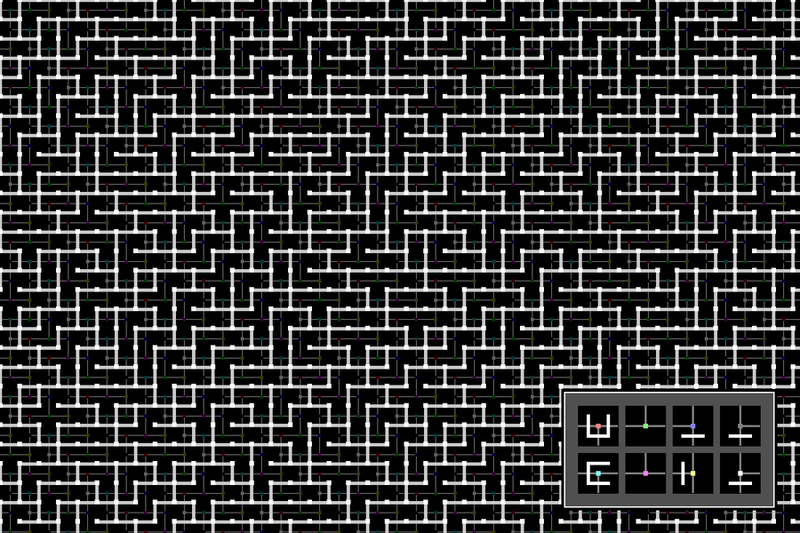 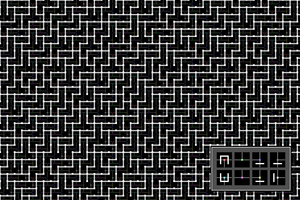 In this category of tilesets, there are herringbone tiles in which the dead-end occurs in one half of the tile, and the path to the dead-end comes from the other half of the tile and itself has only one entrance. 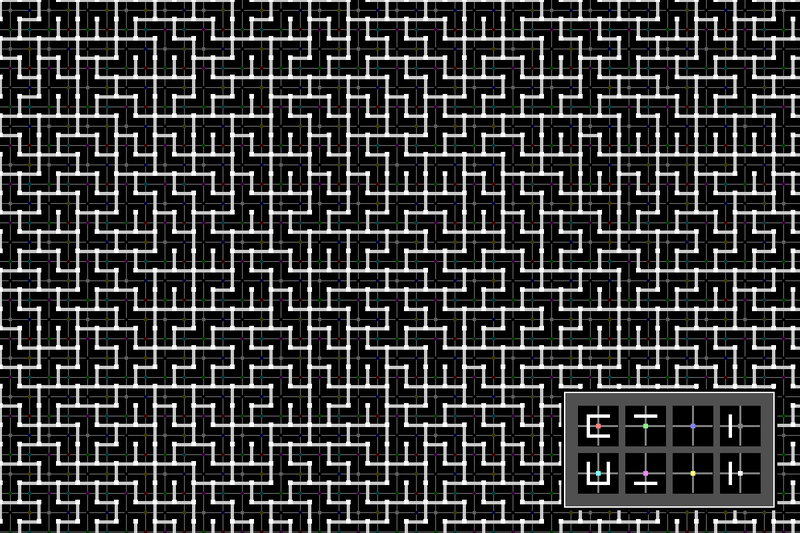 Other tilesets generate these two-long dead-ends, but the following tilesets are unique because the double dead-end occurs within a single herringbone tile, allowing the tile content to be fully tailored knowing it is a double dead-end; in other tile sets, only one of the two 1x1 tiles participating in a double dead-end--the one with the real dead-end--is known in advance to be a double-dead end.